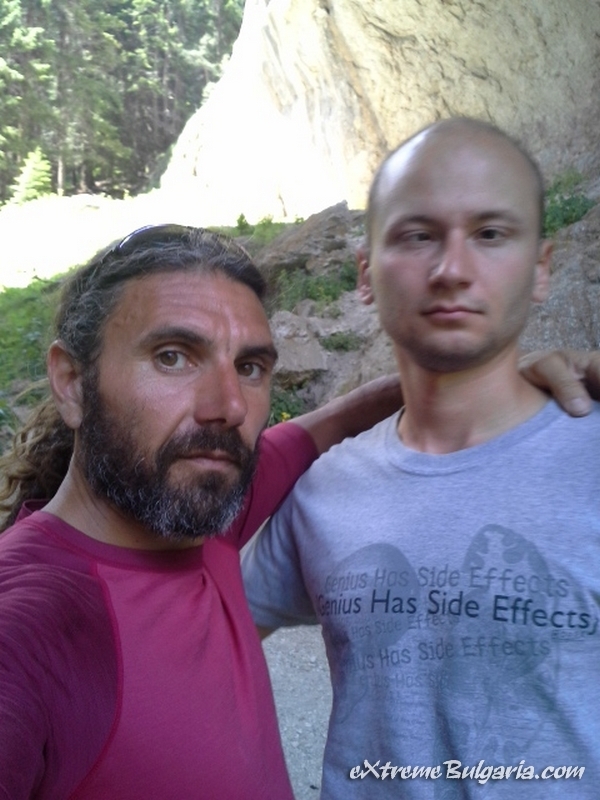 Why do it with us? 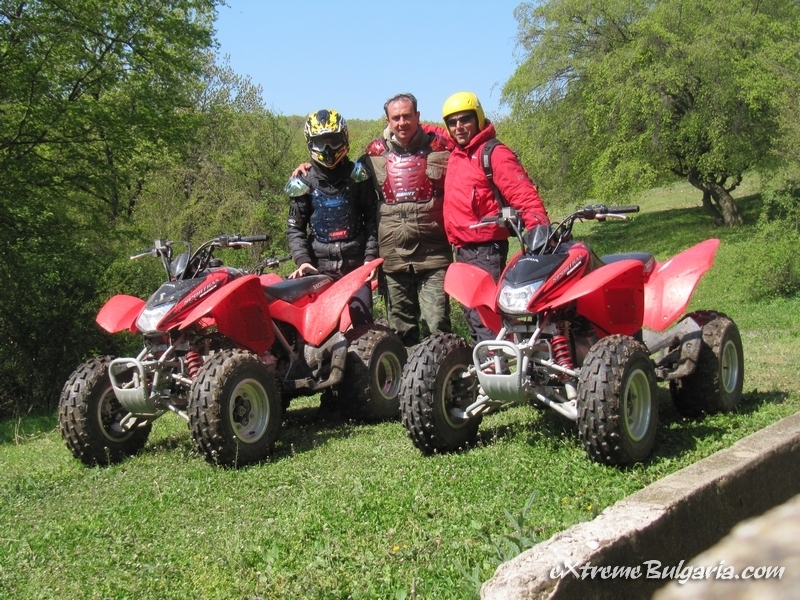 Customized adventures, according to your requirements! 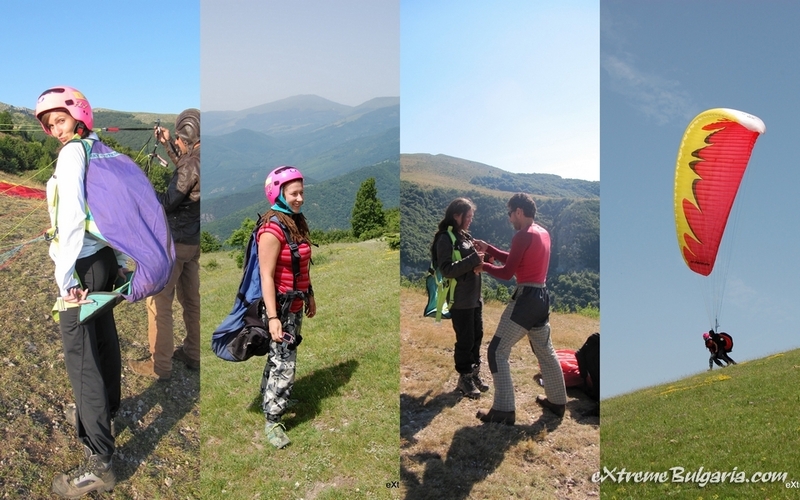 Every adventure is different but the mix of them is unique! 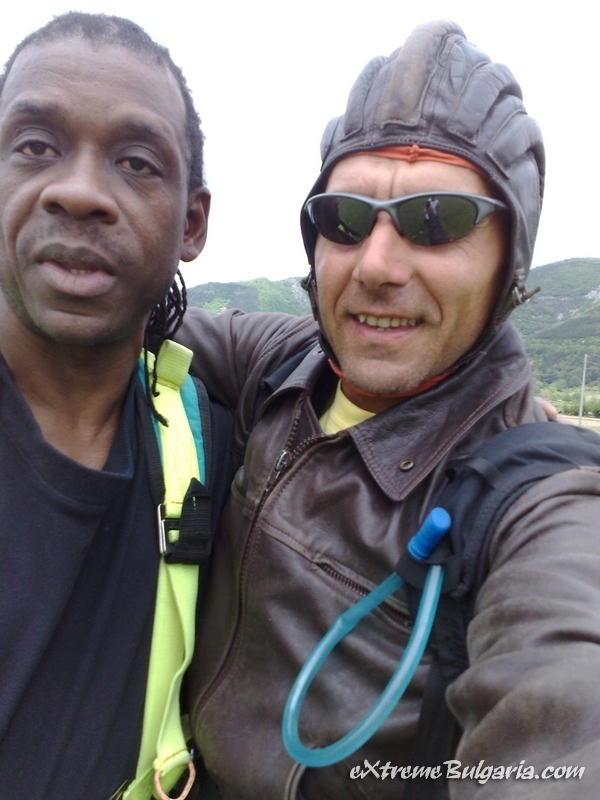 Outstanding devotion, the approach is always personal! 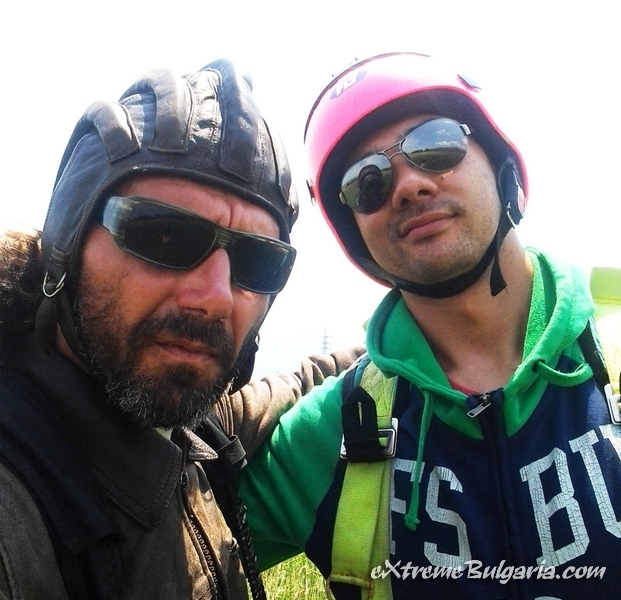 What is Extreme Bulgaria? 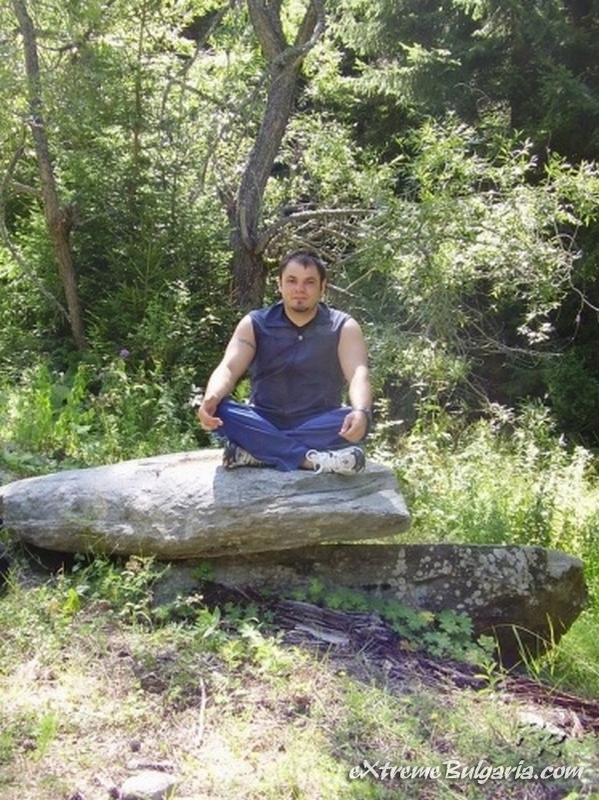 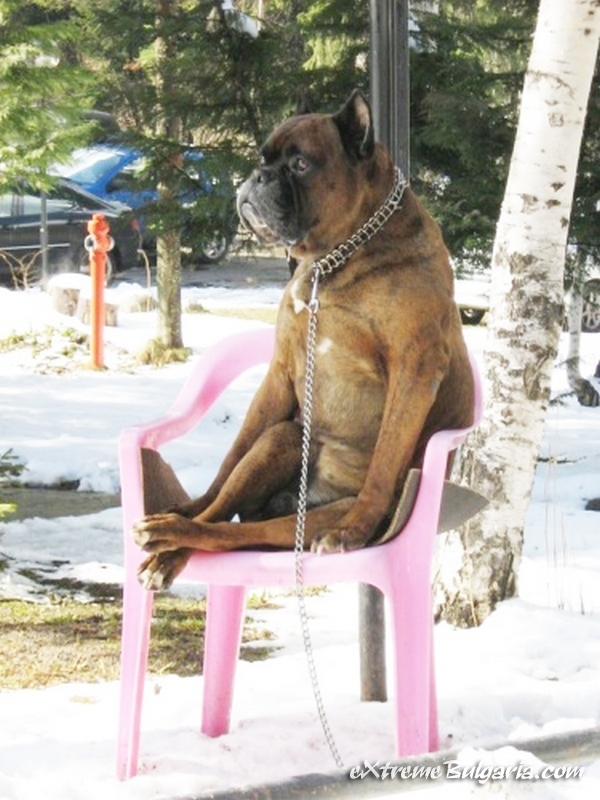 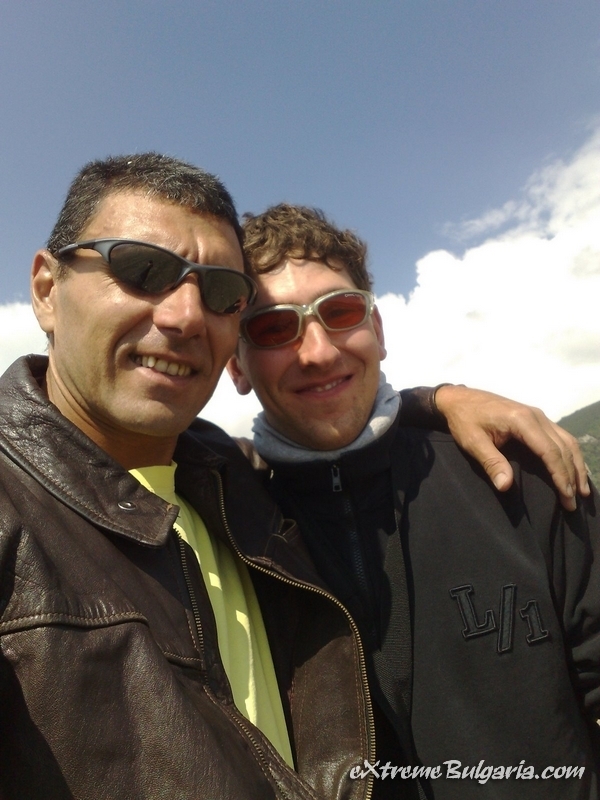 In order to answer that, we will first have to take a look at another question: Who is Atanas Koev? 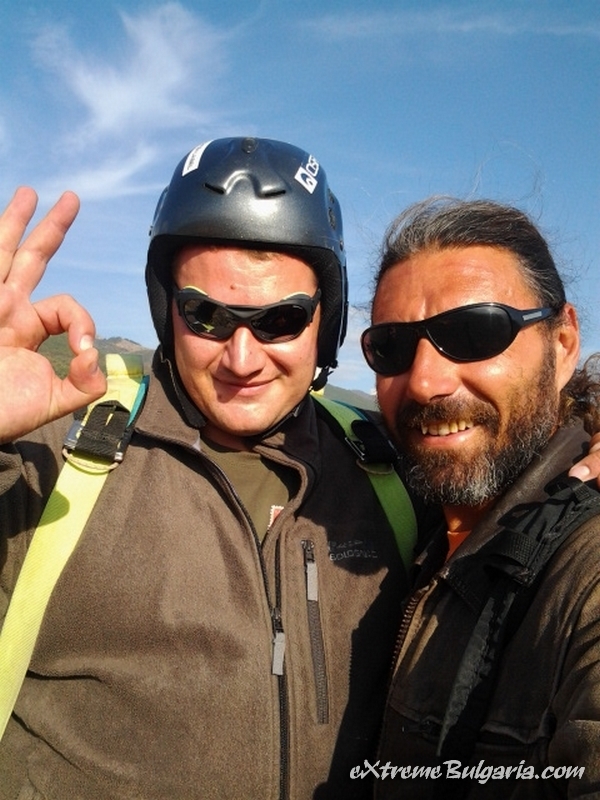 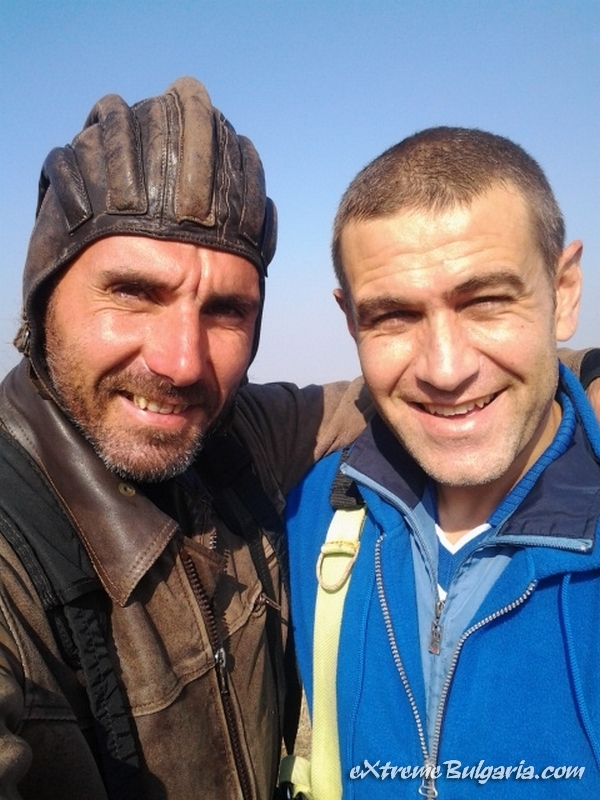 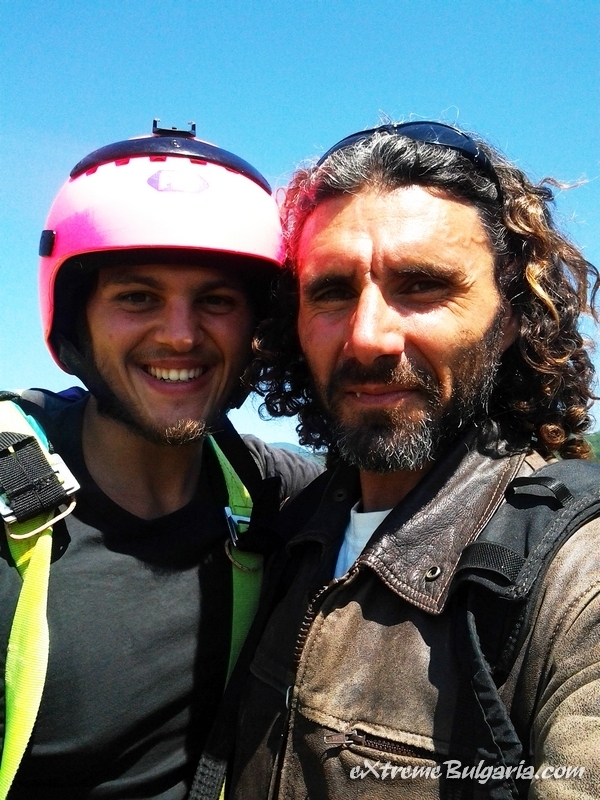 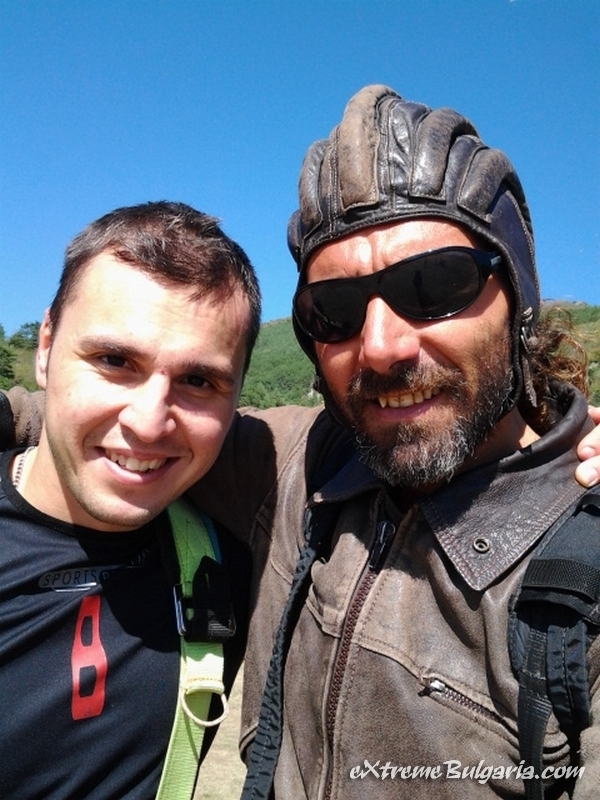 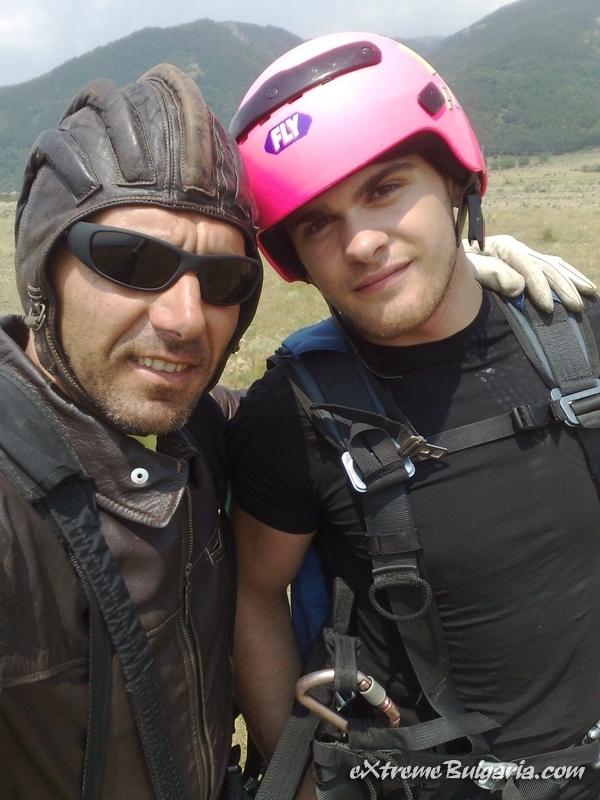 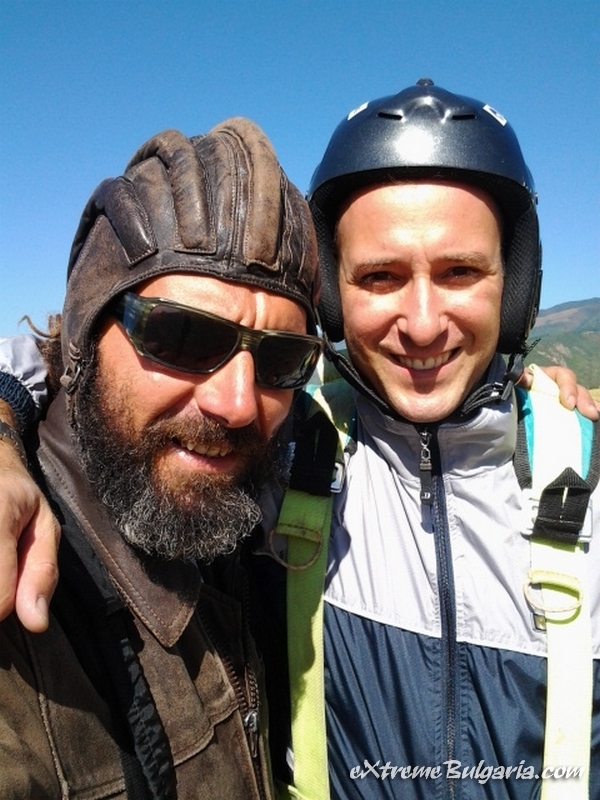 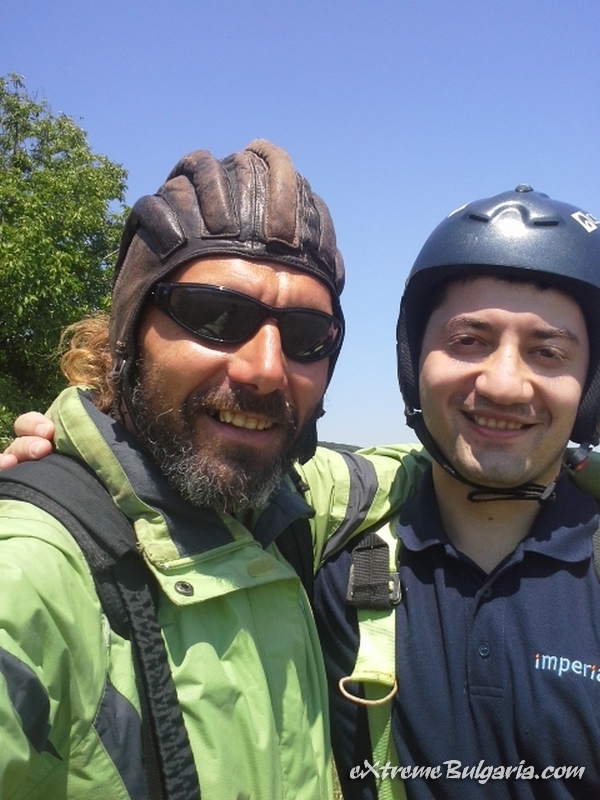 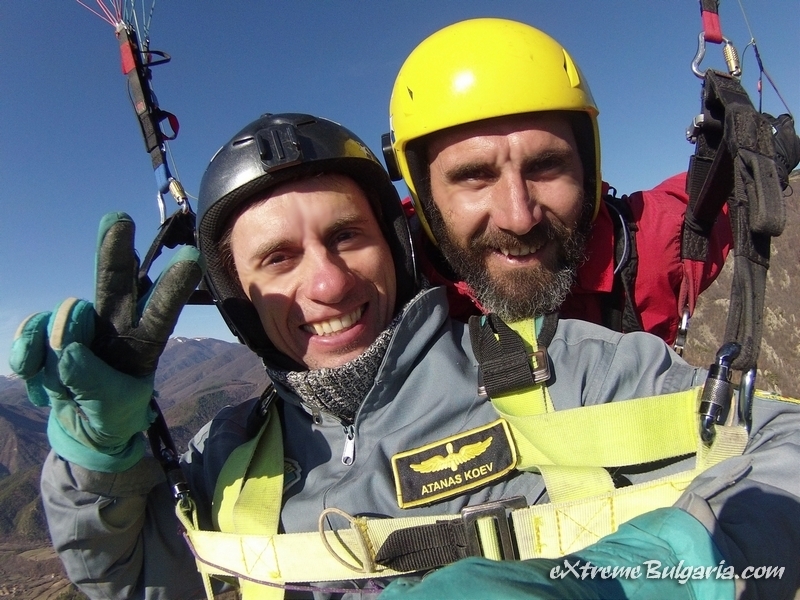 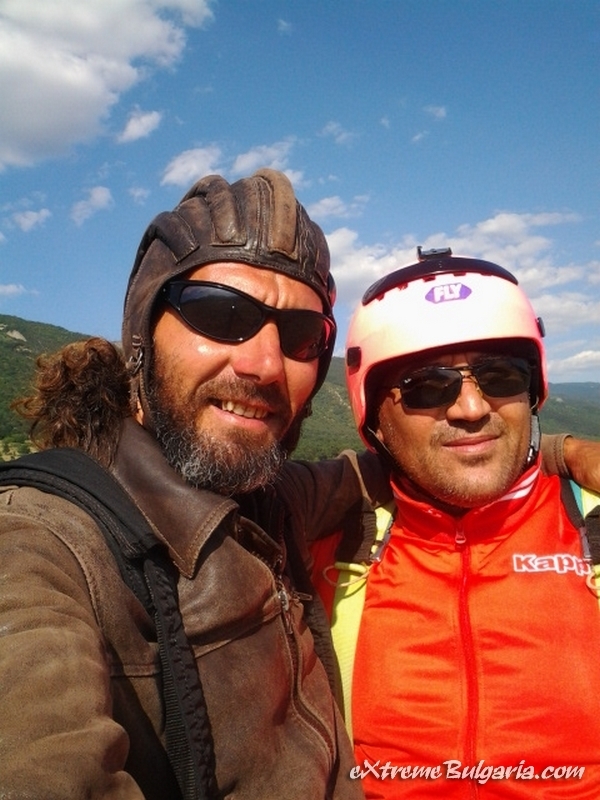 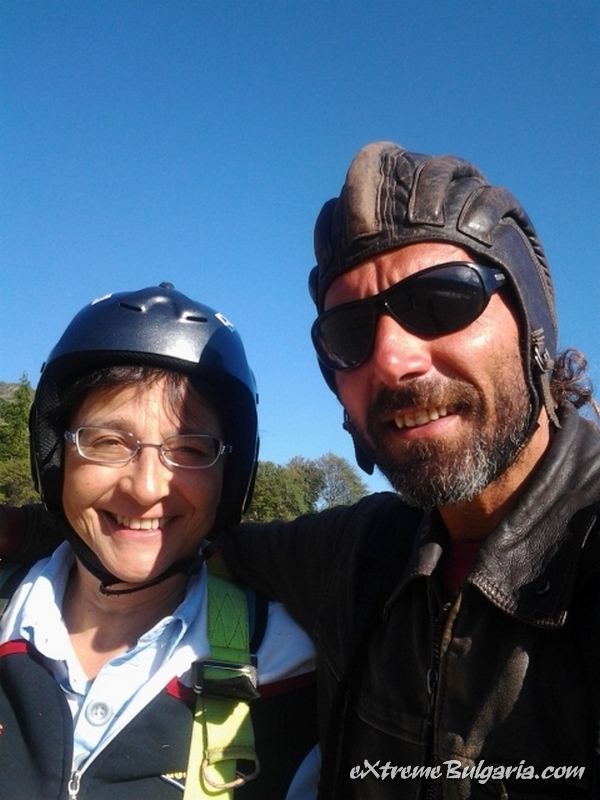 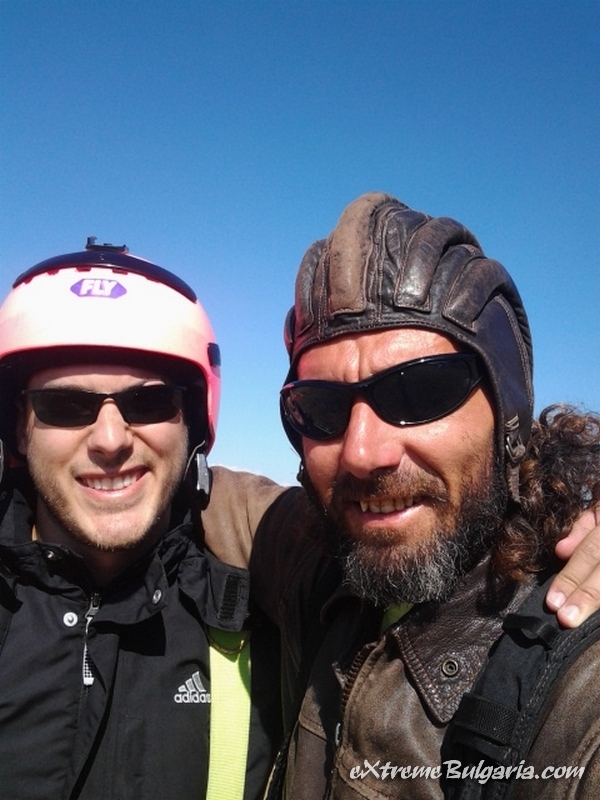 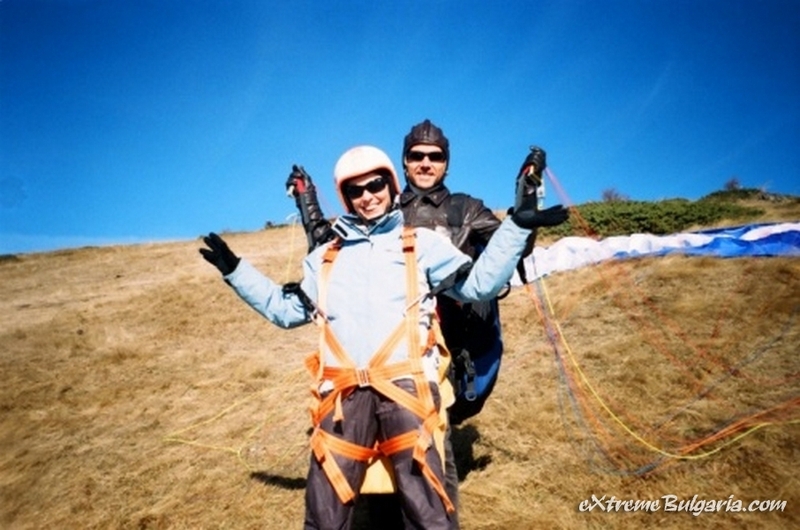 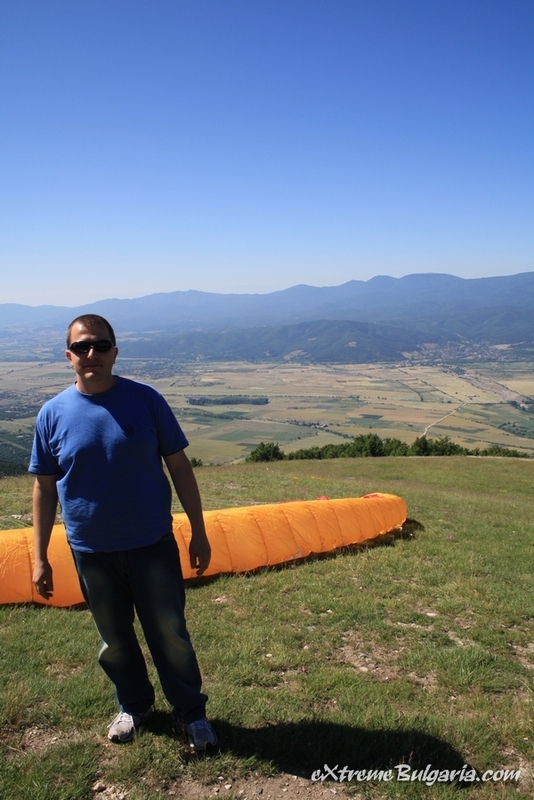 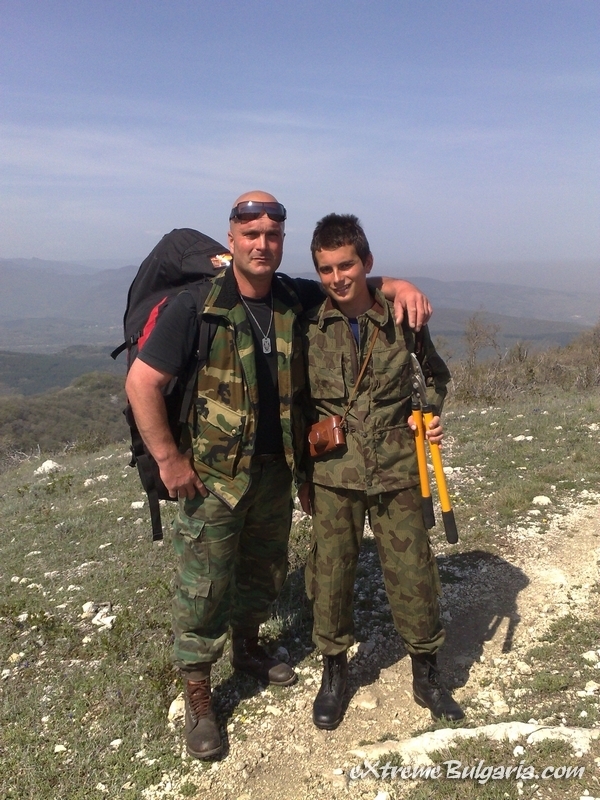 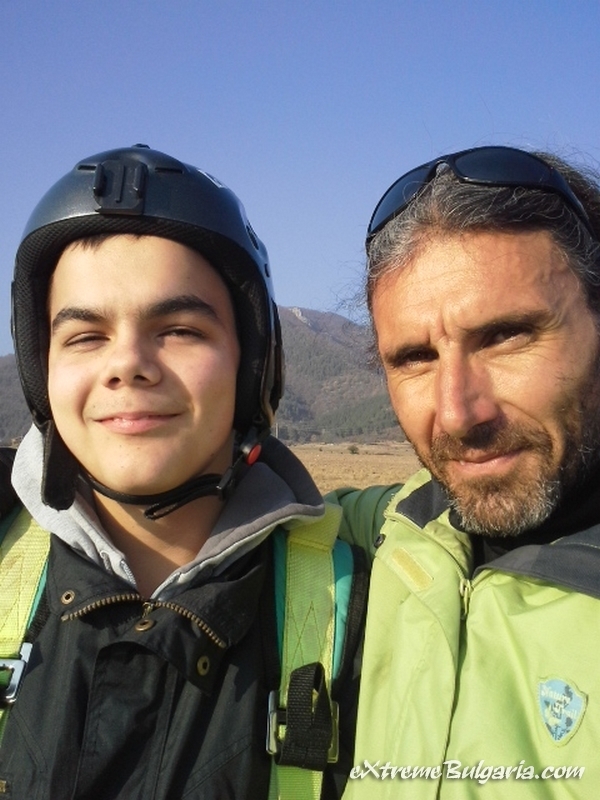 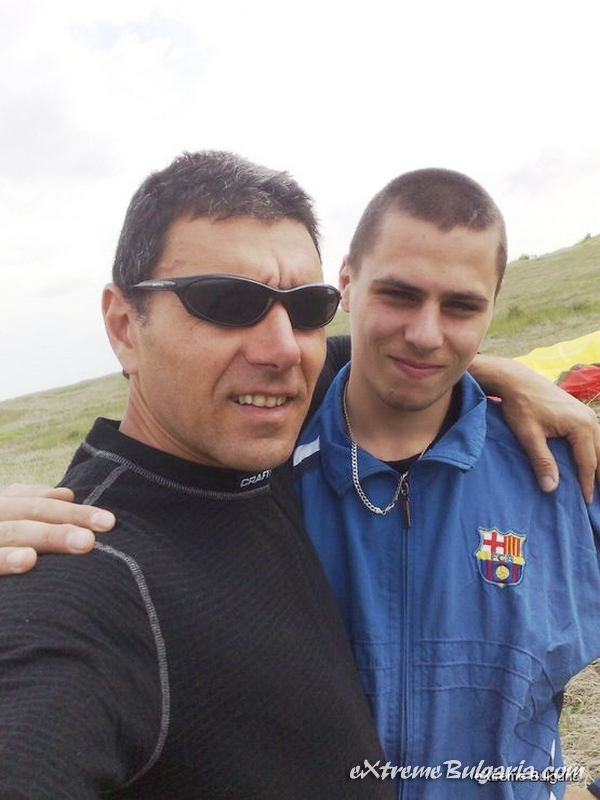 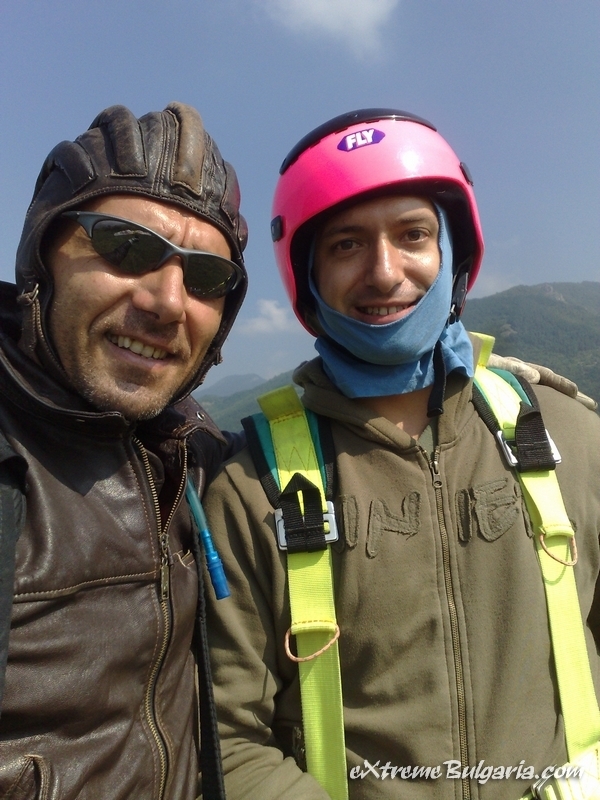 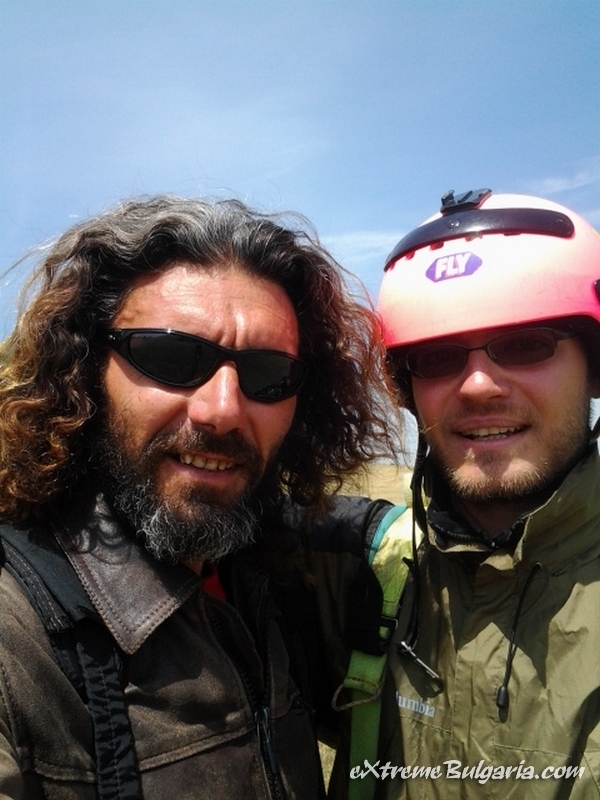 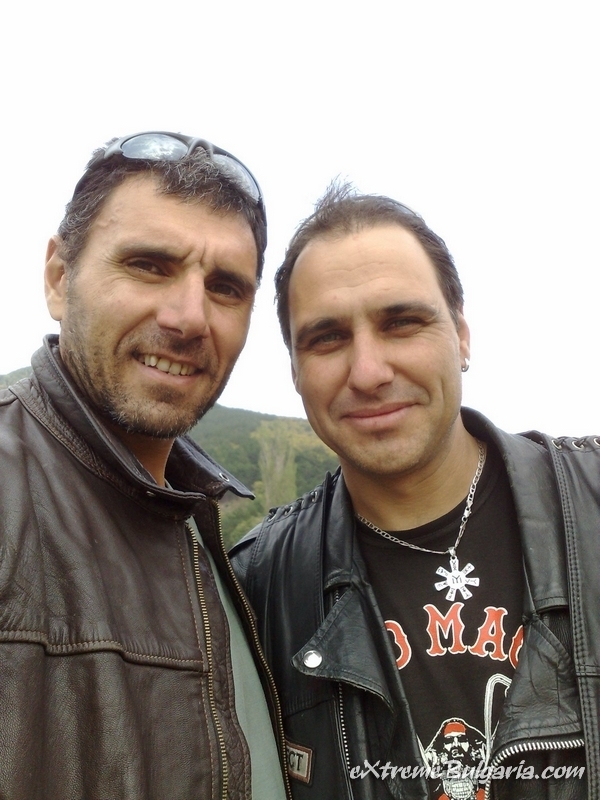 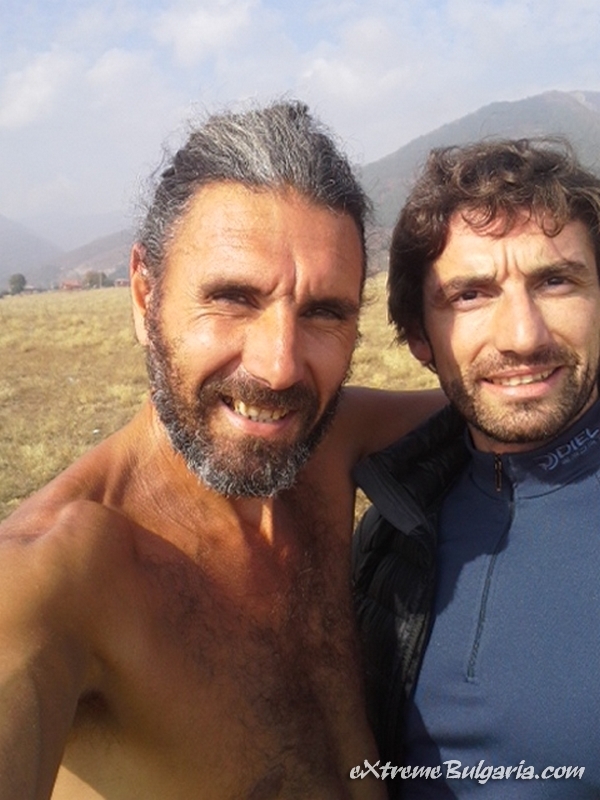 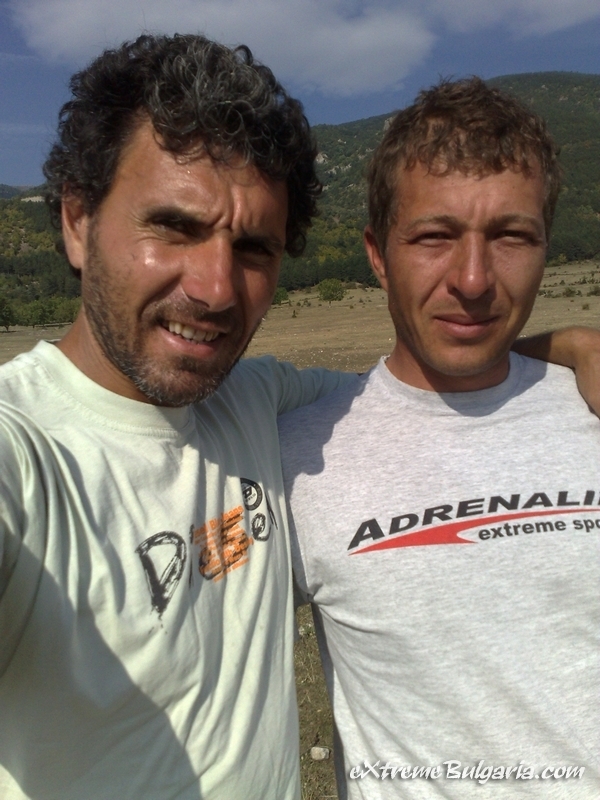 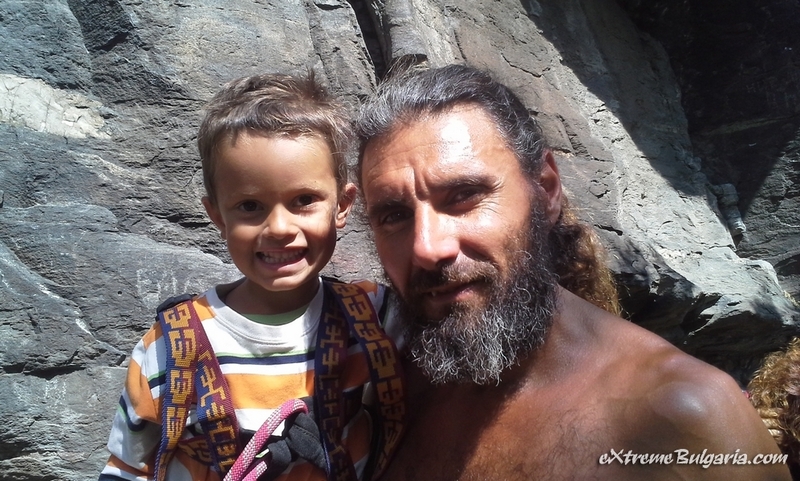 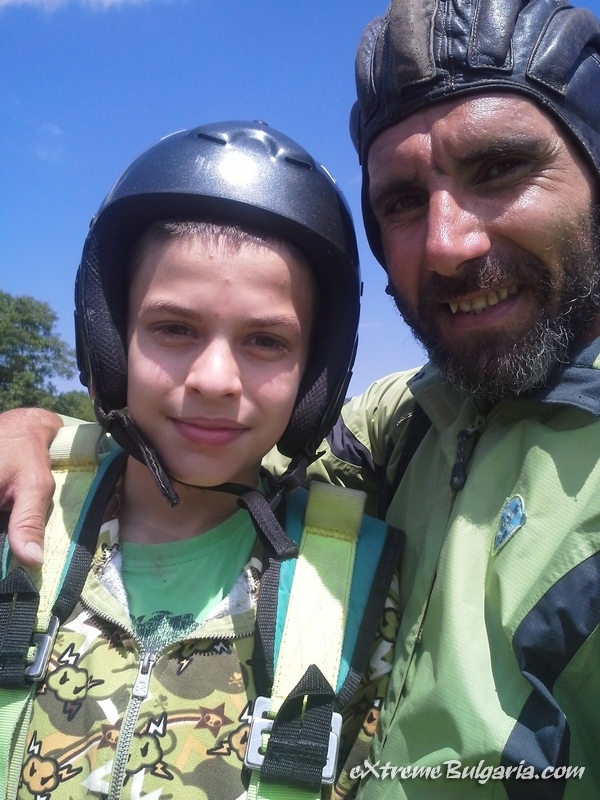 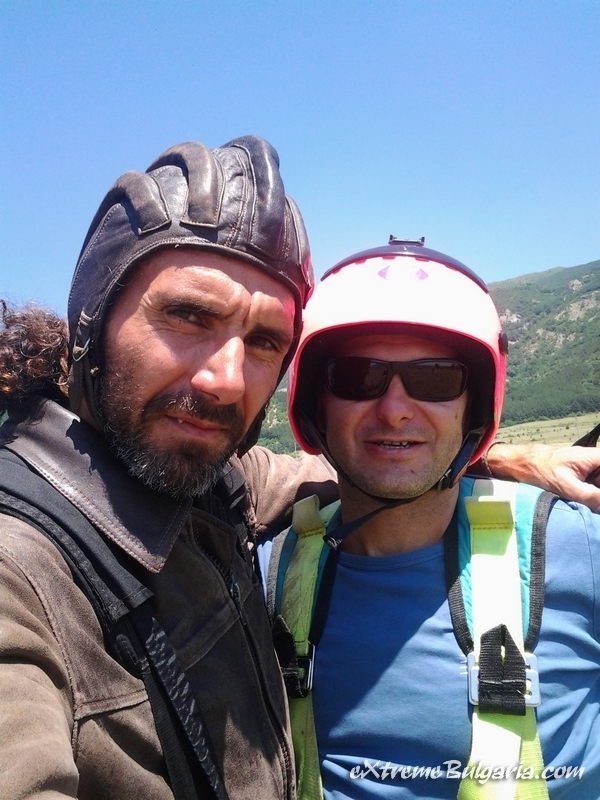 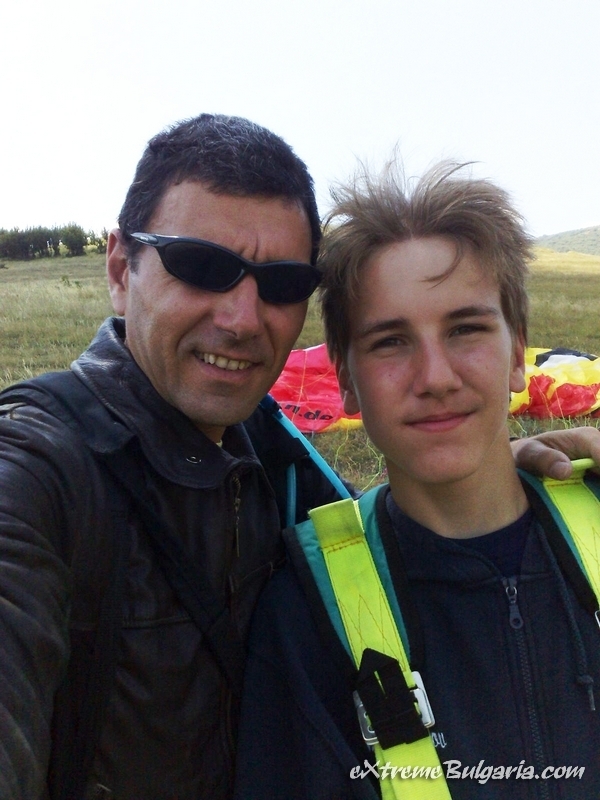 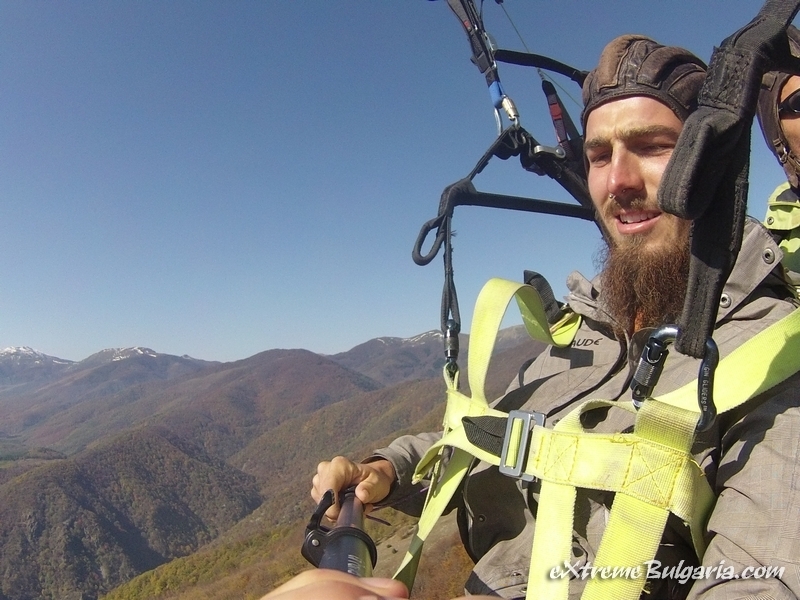 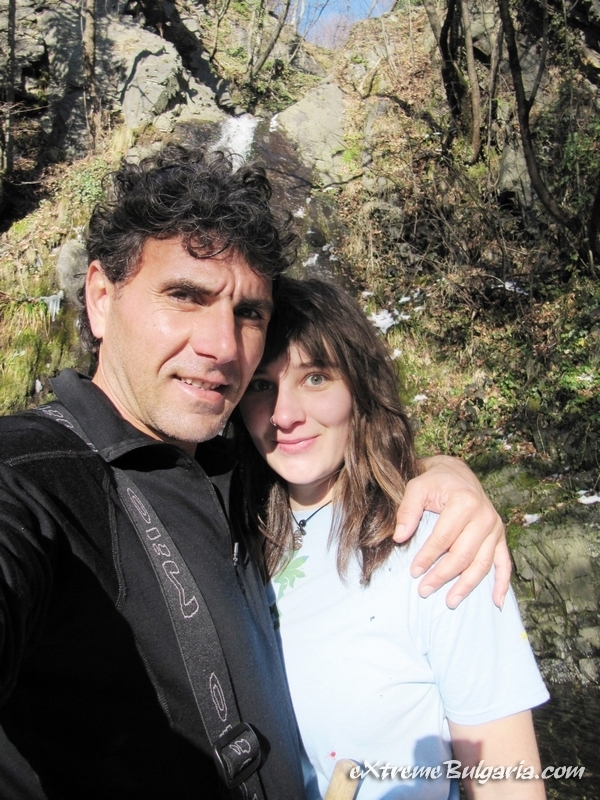 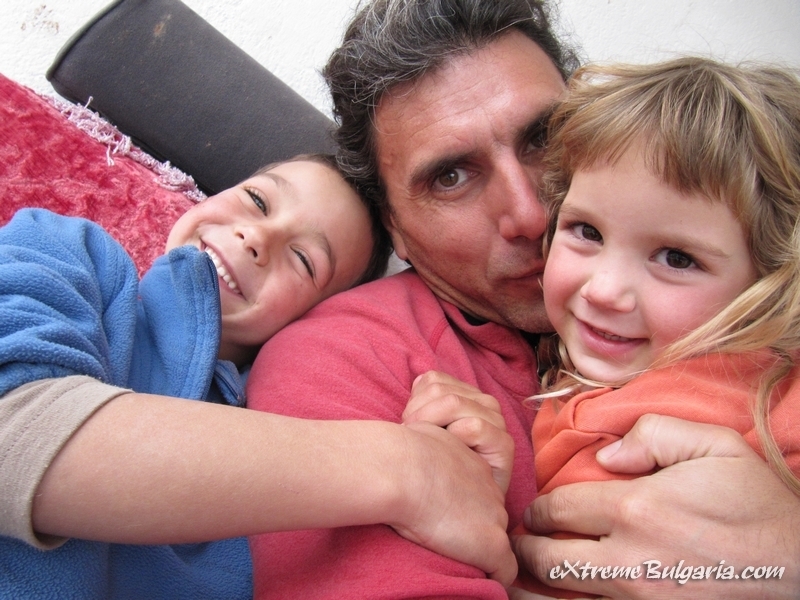 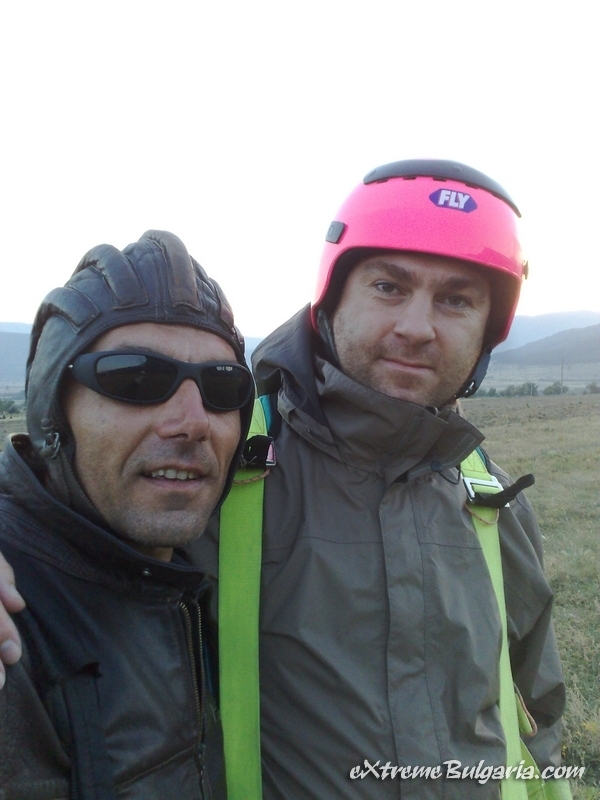 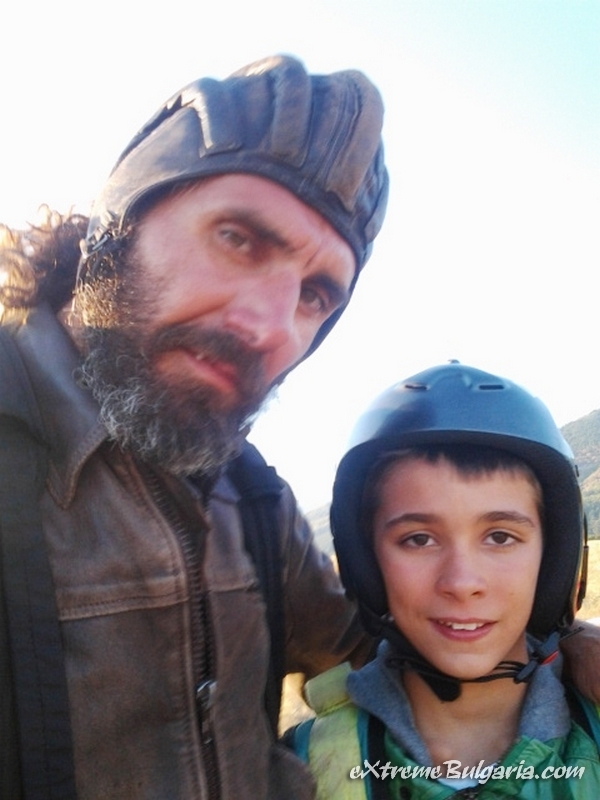 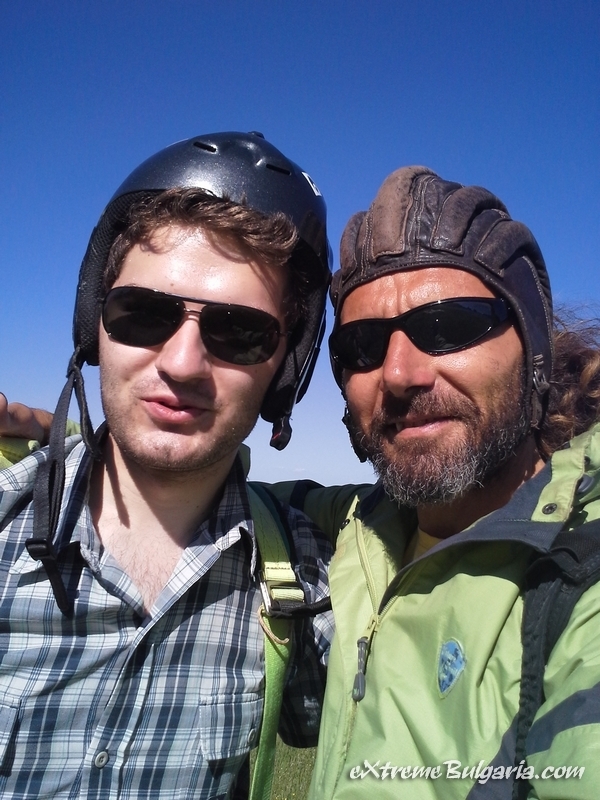 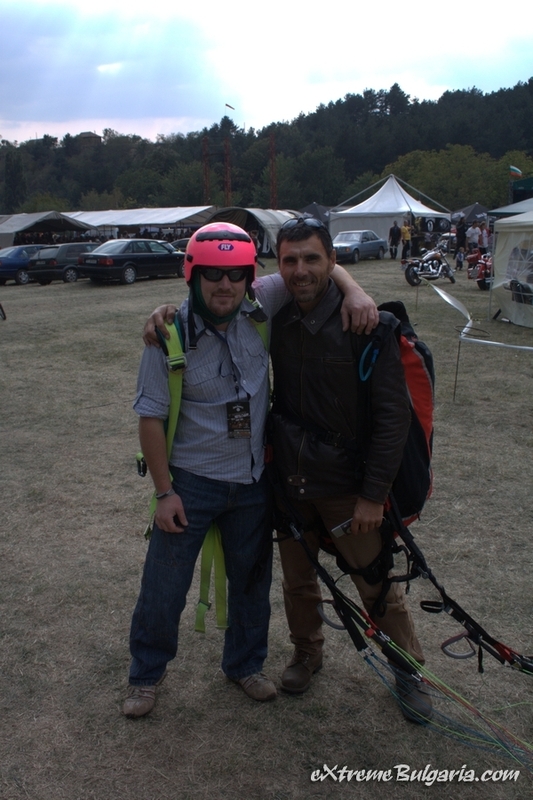 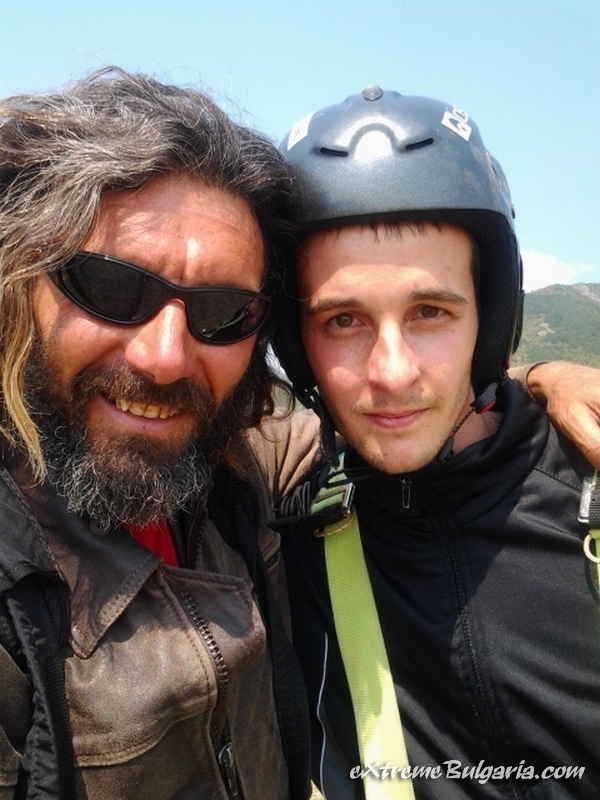 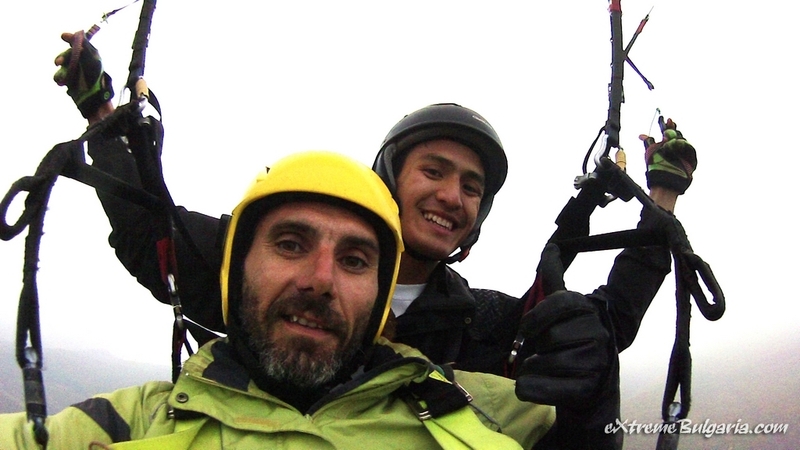 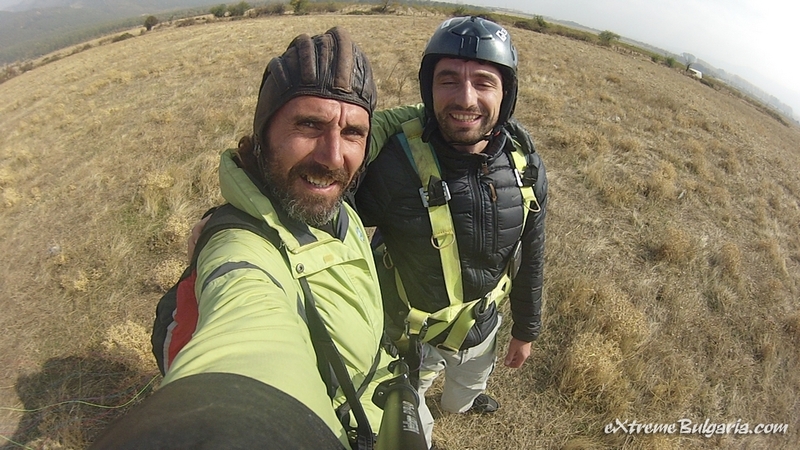 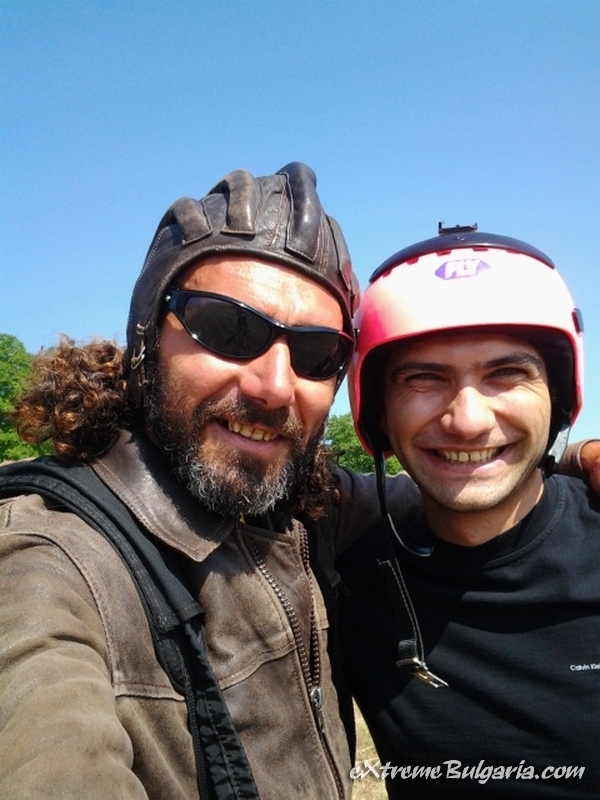 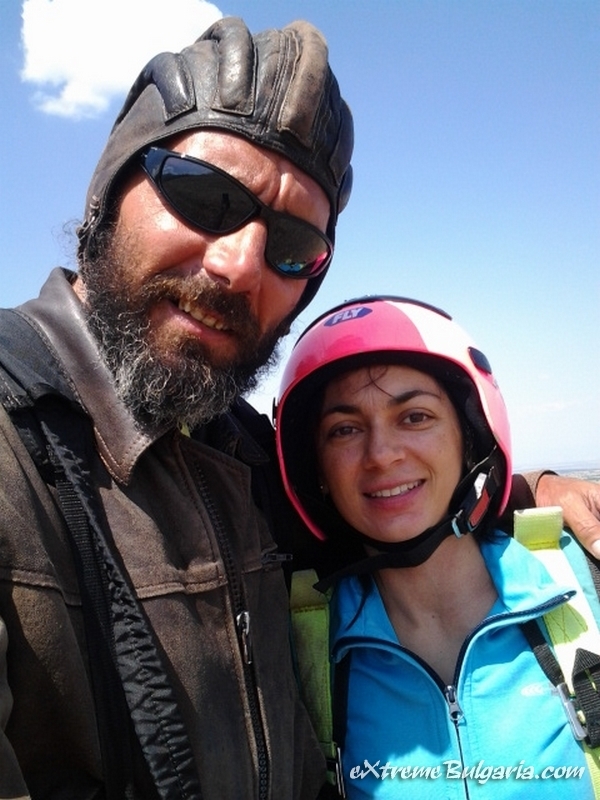 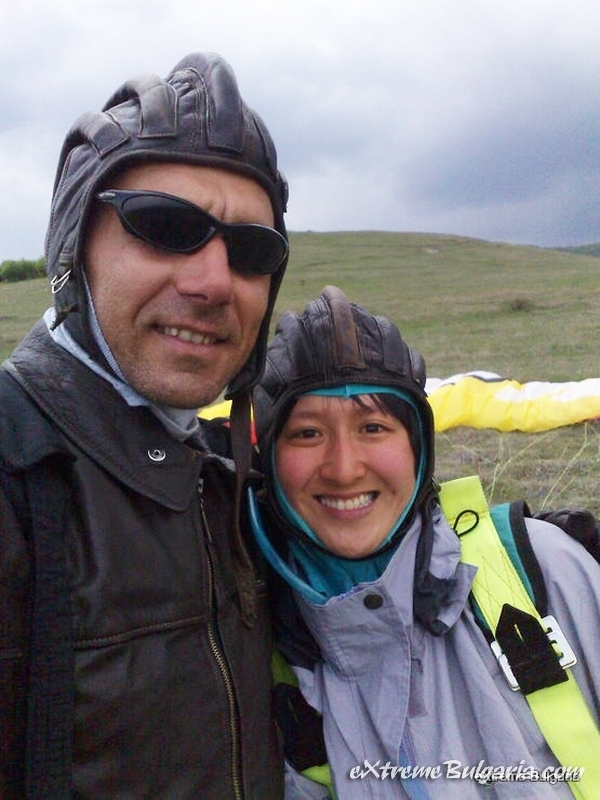 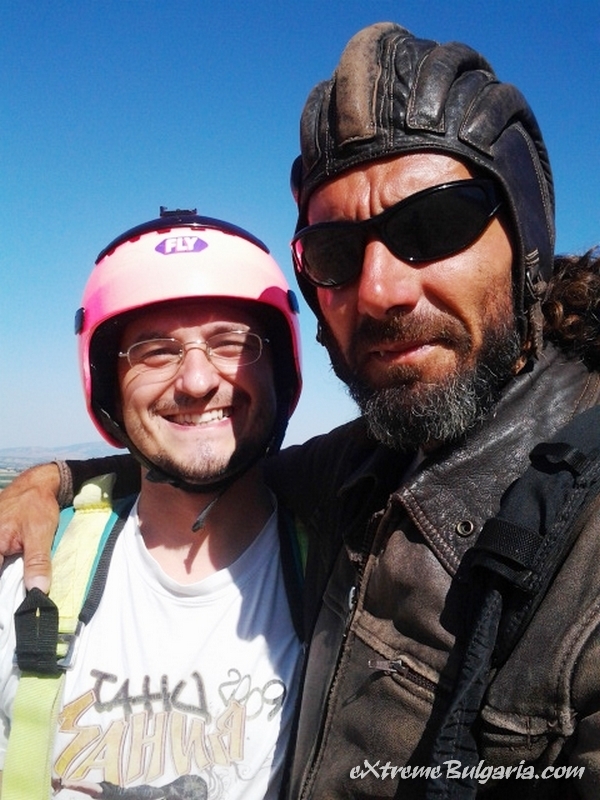 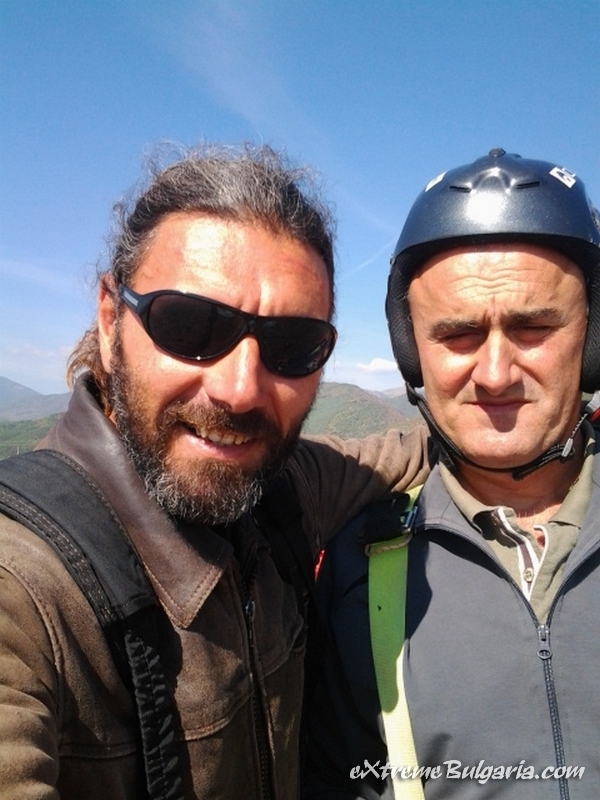 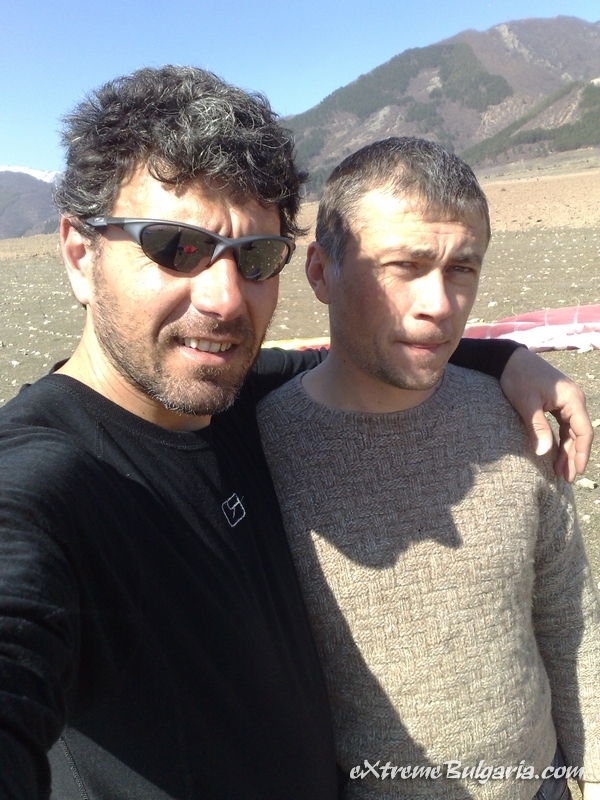 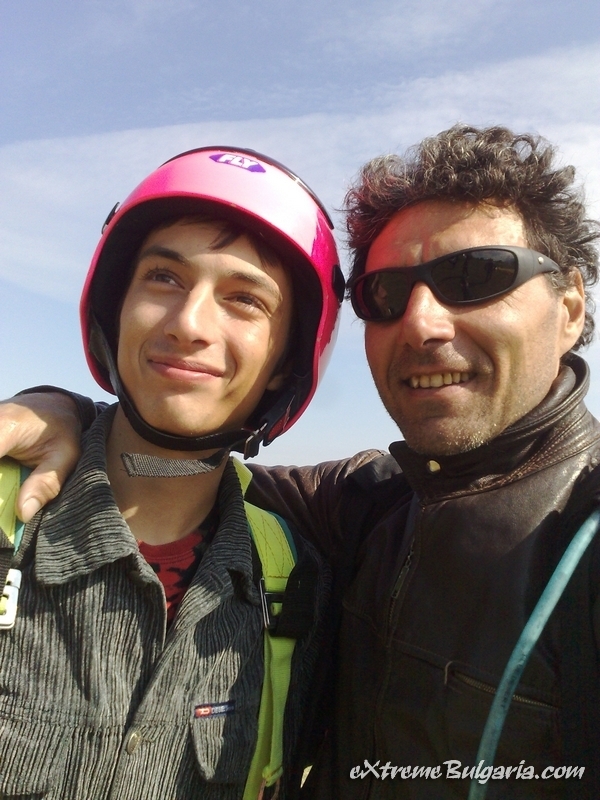 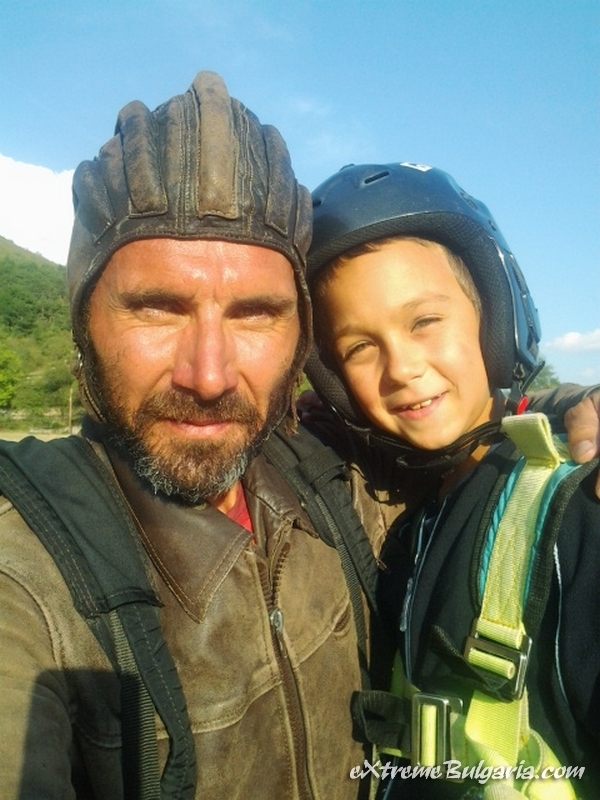 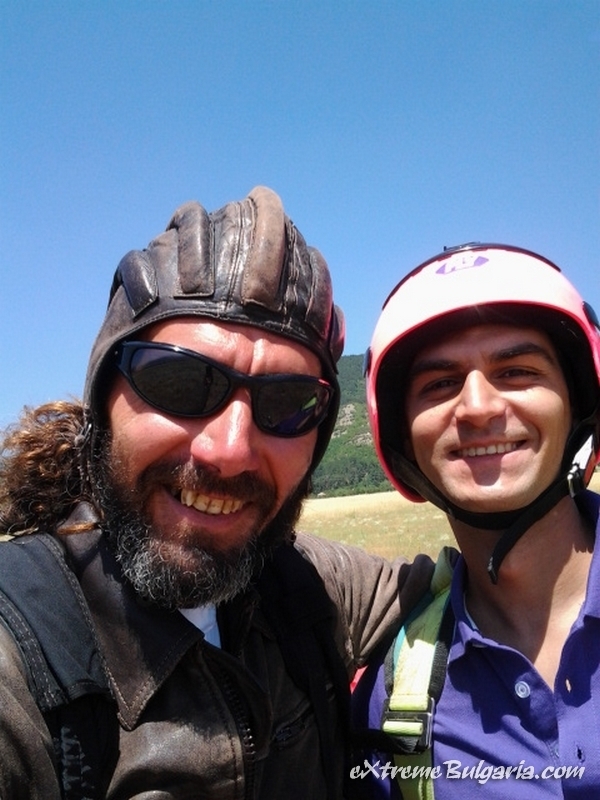 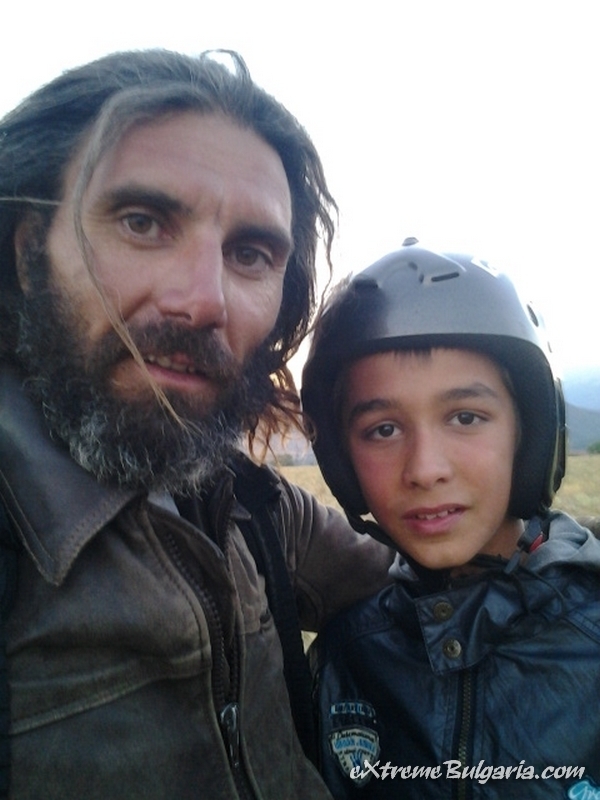 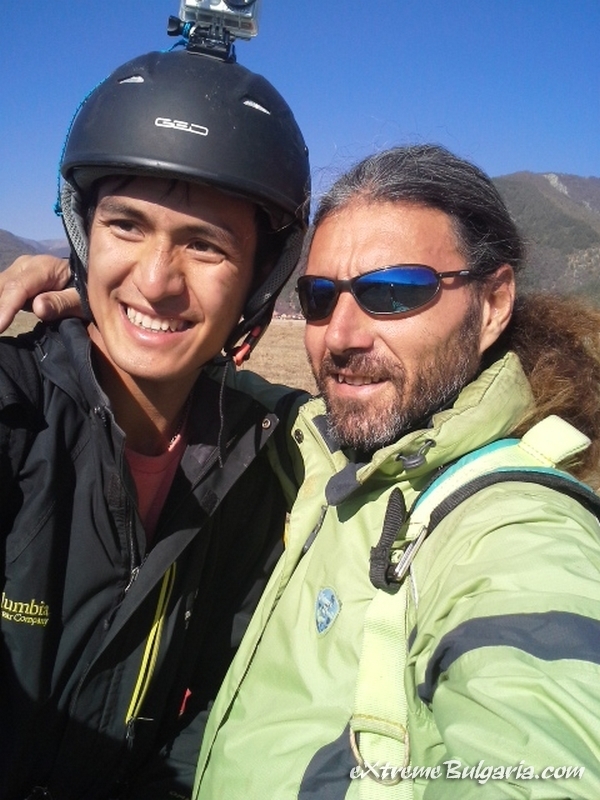 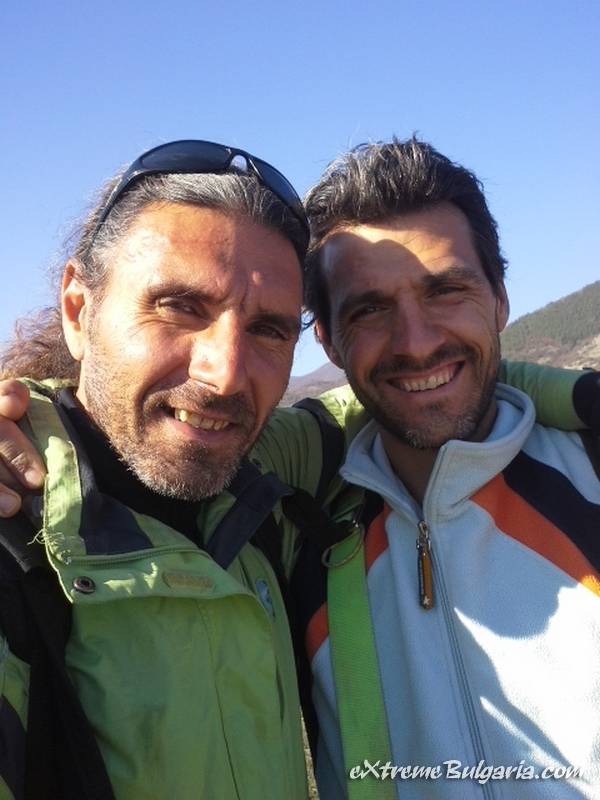 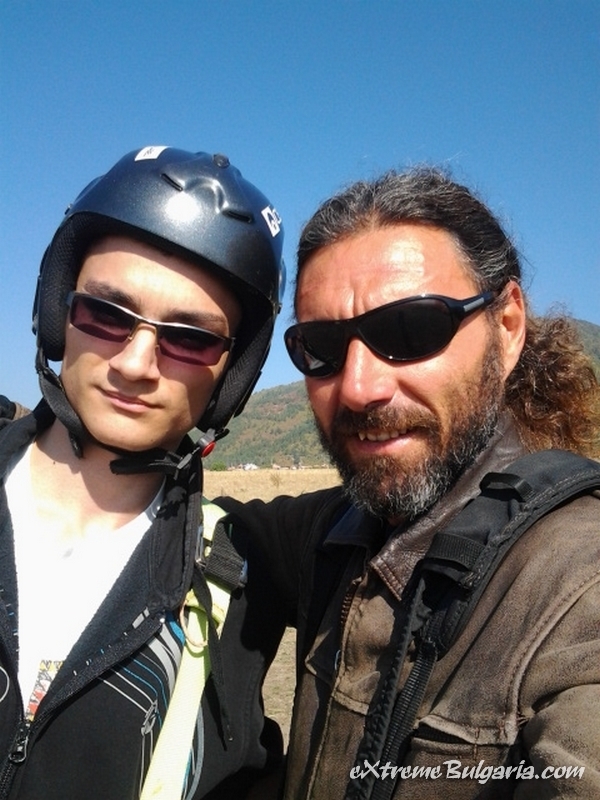 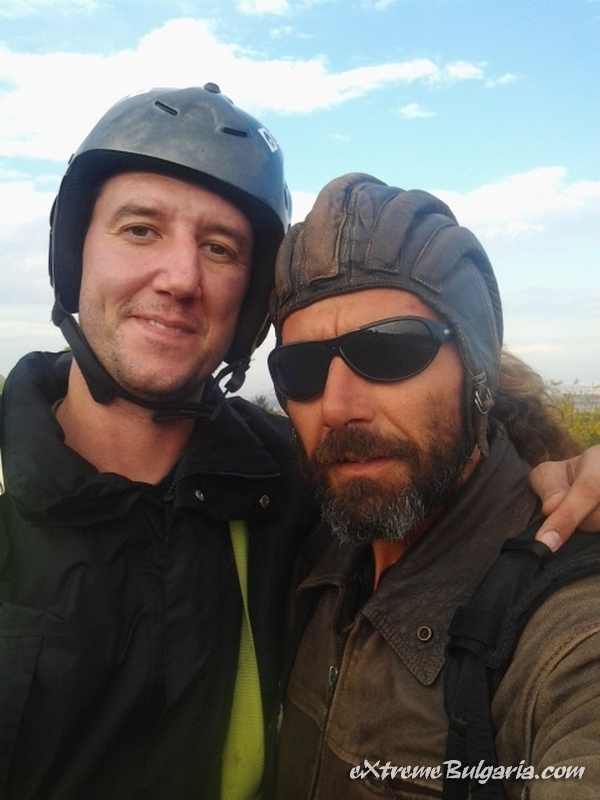 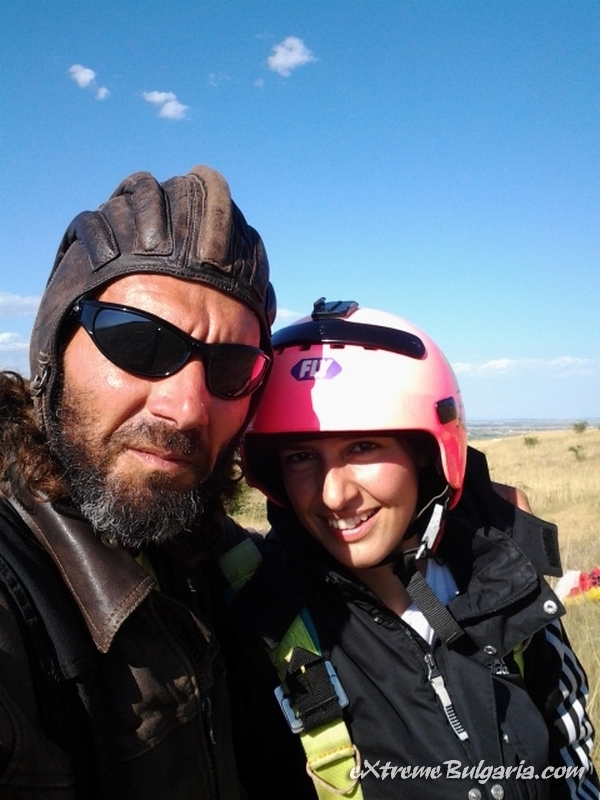 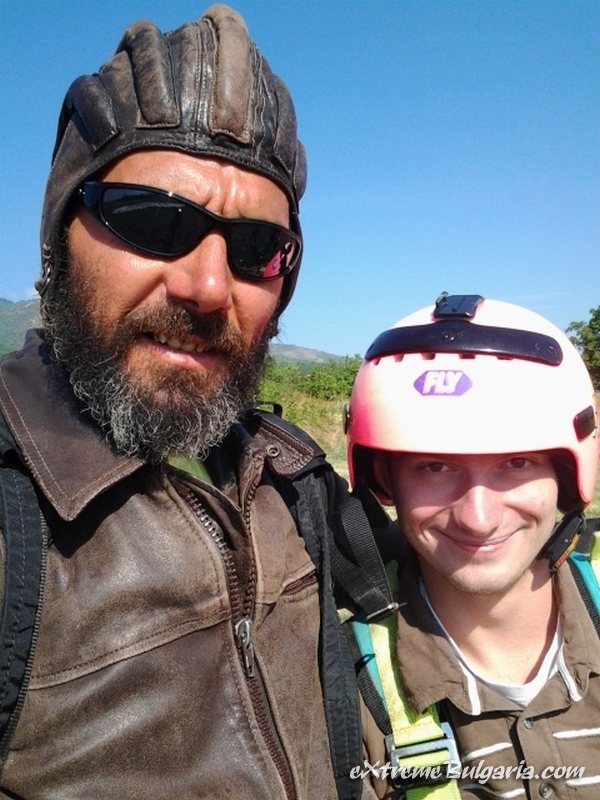 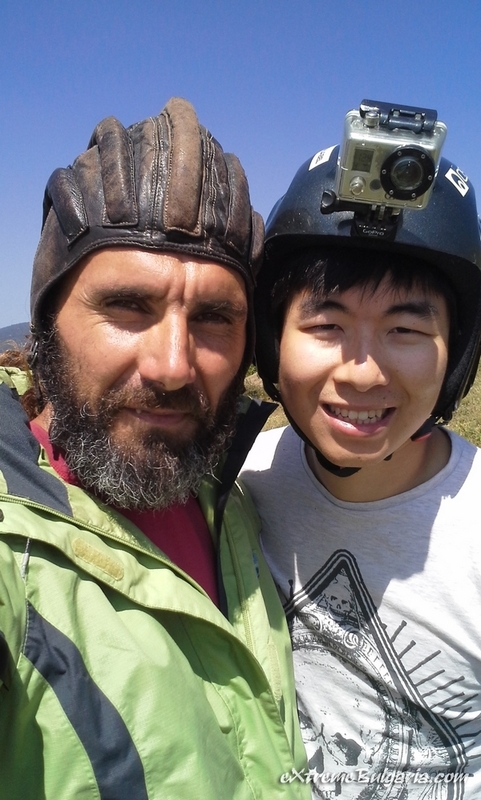 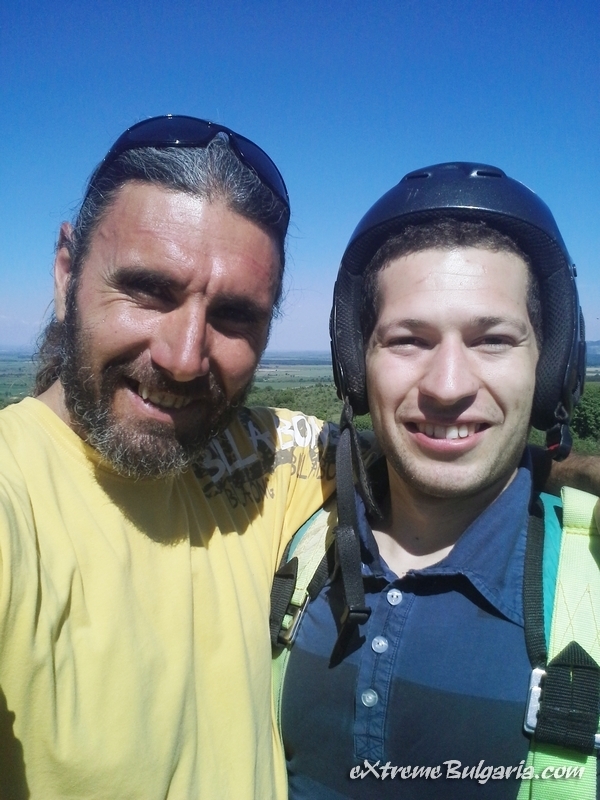 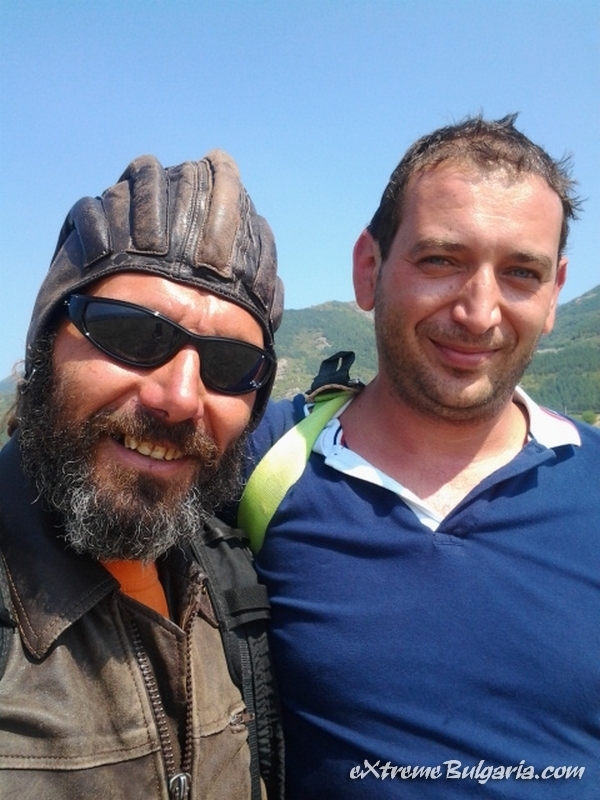 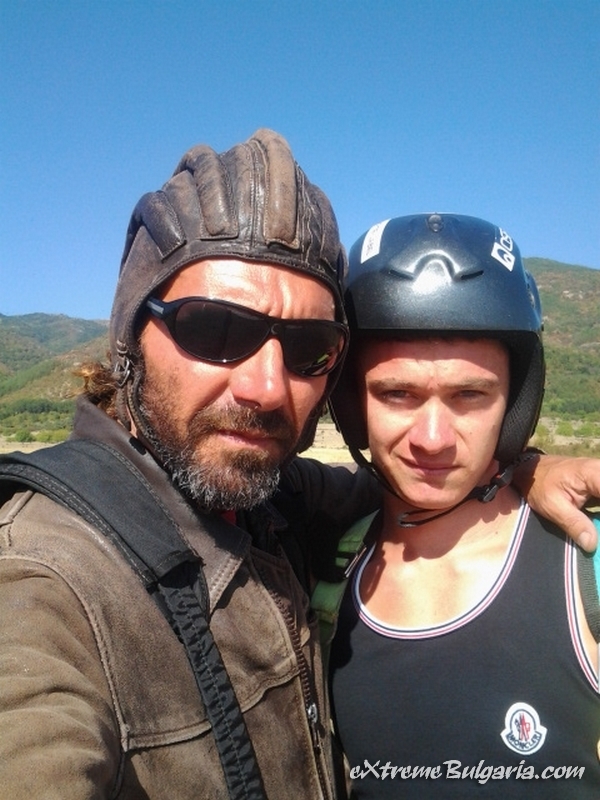 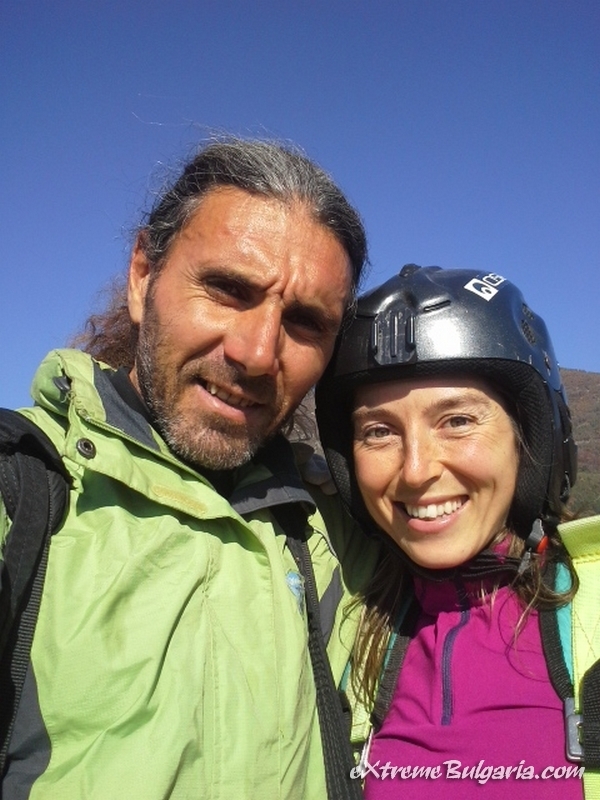 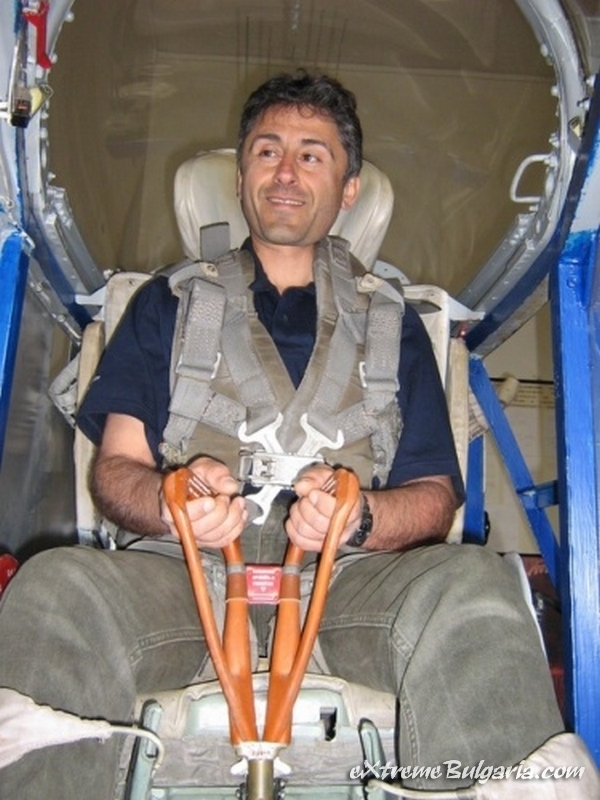 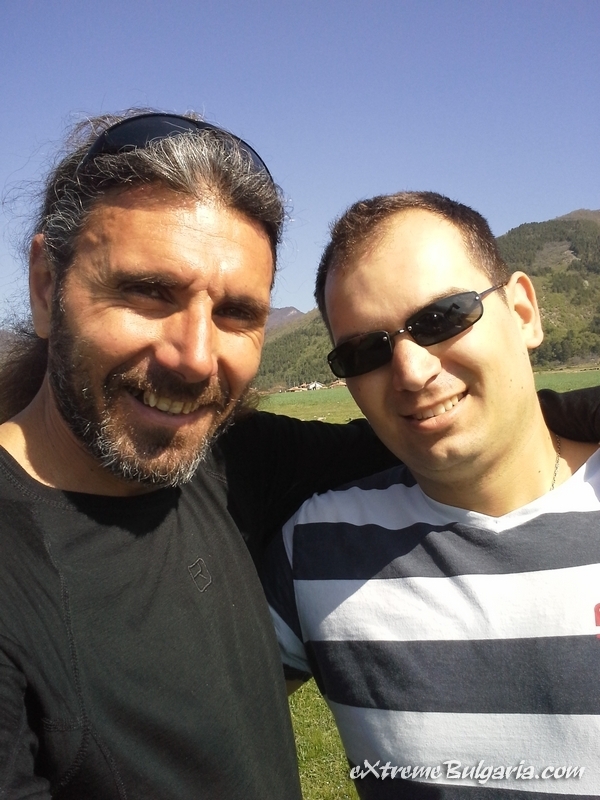 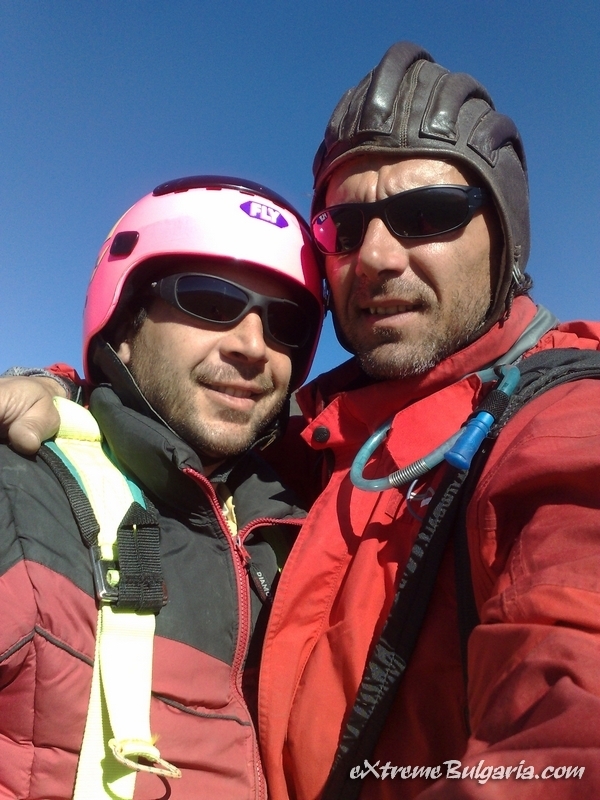 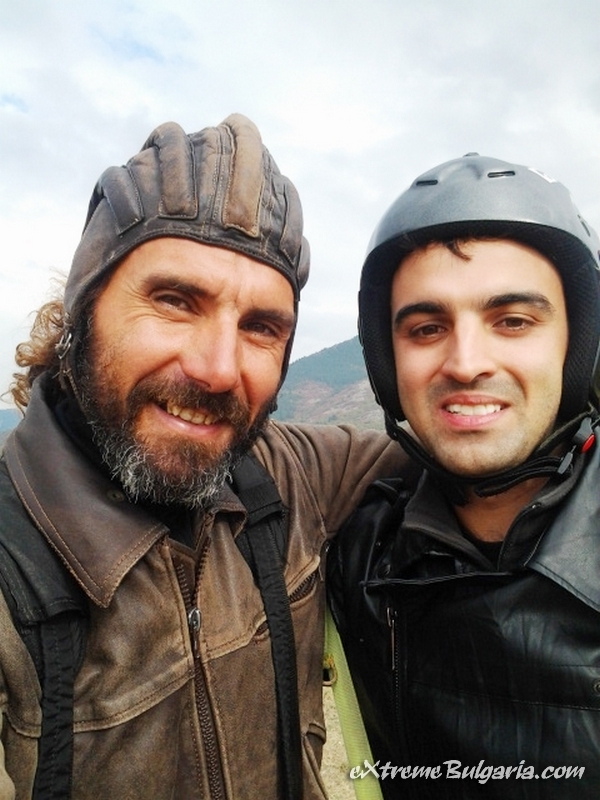 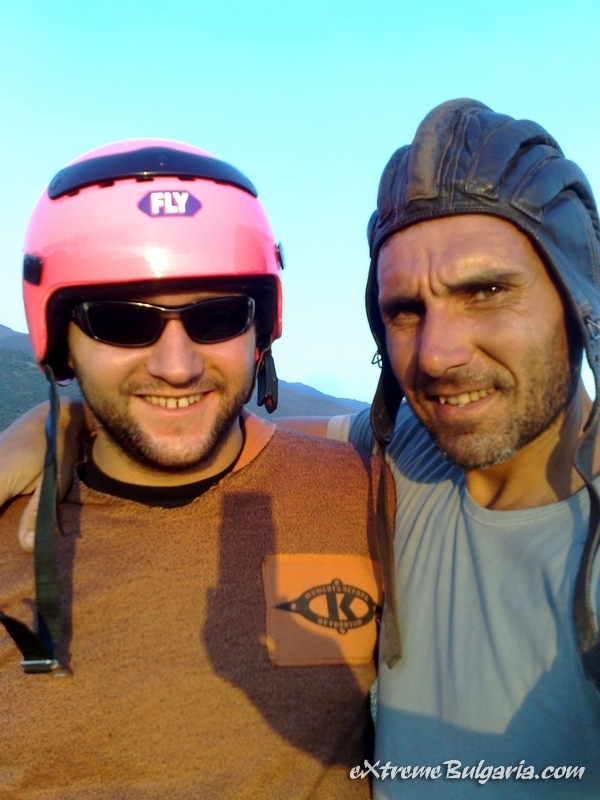 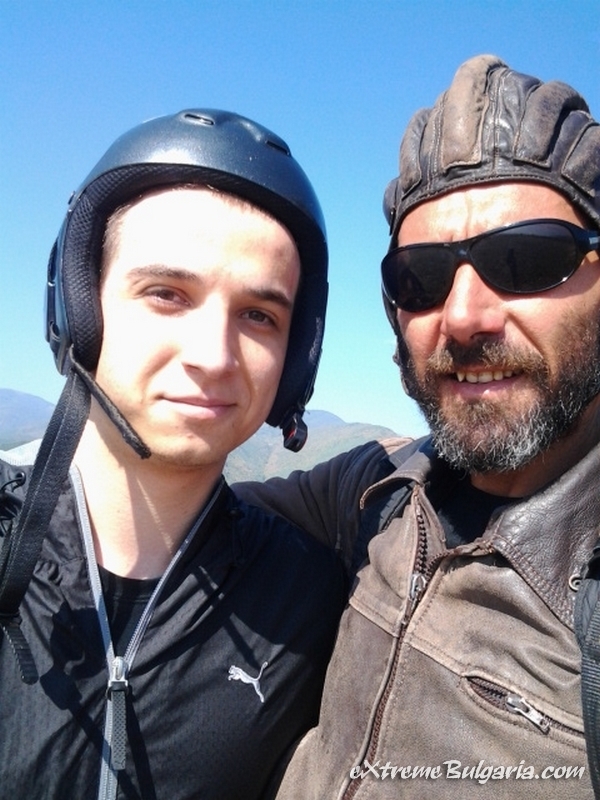 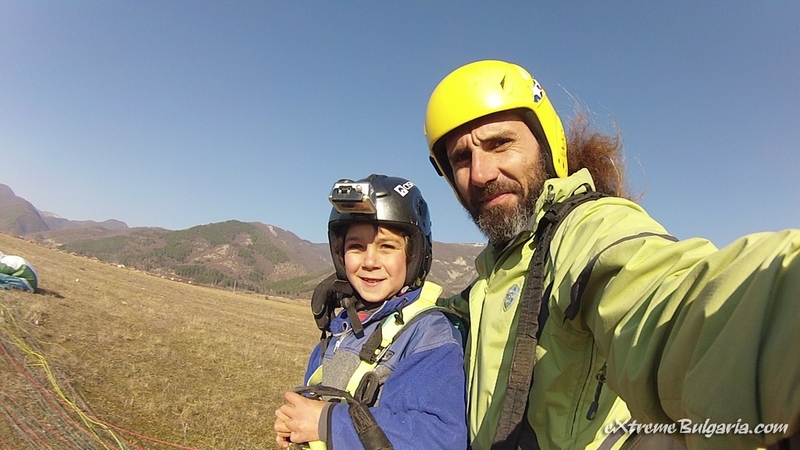 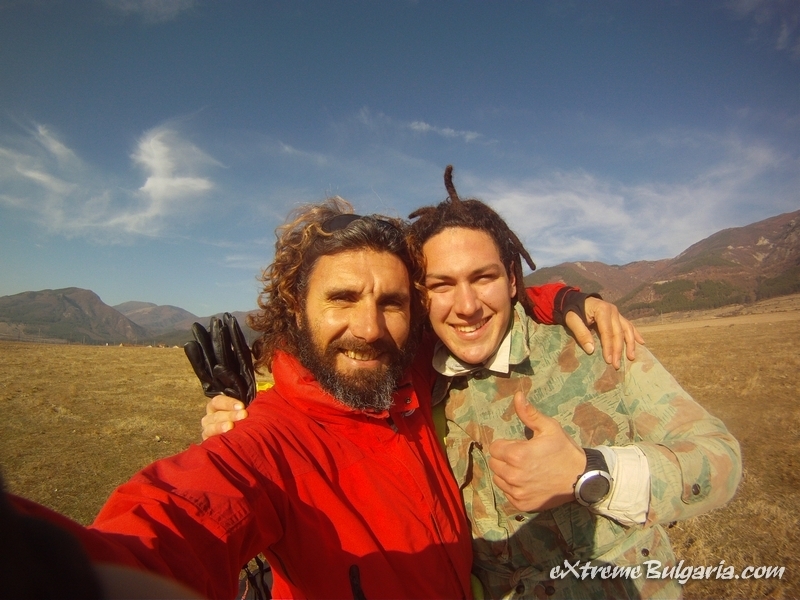 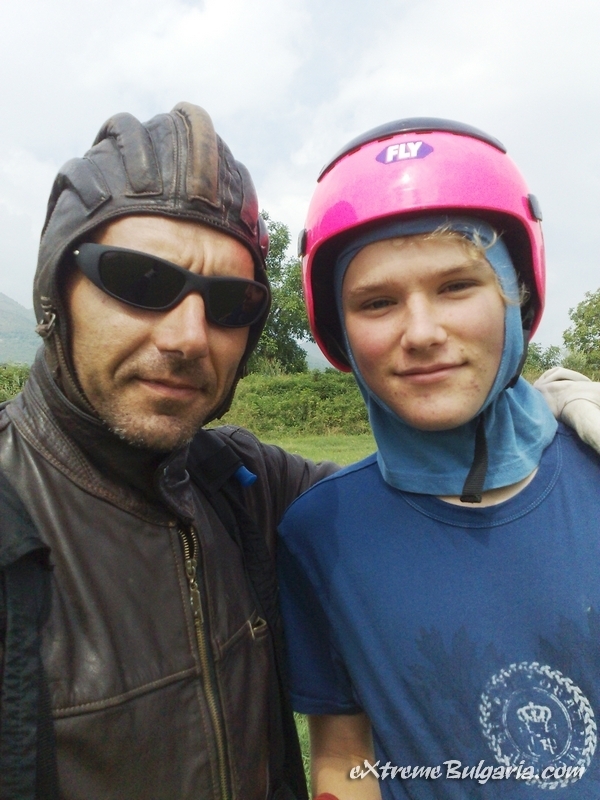 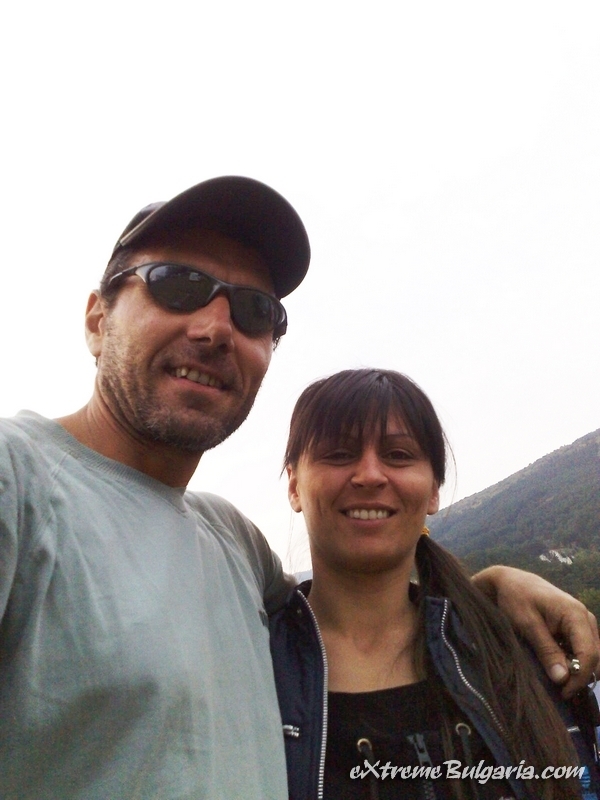 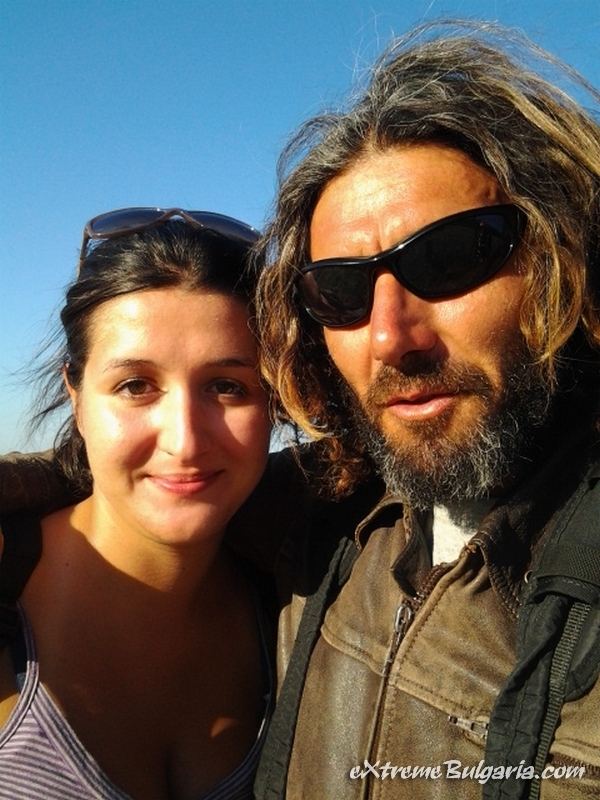 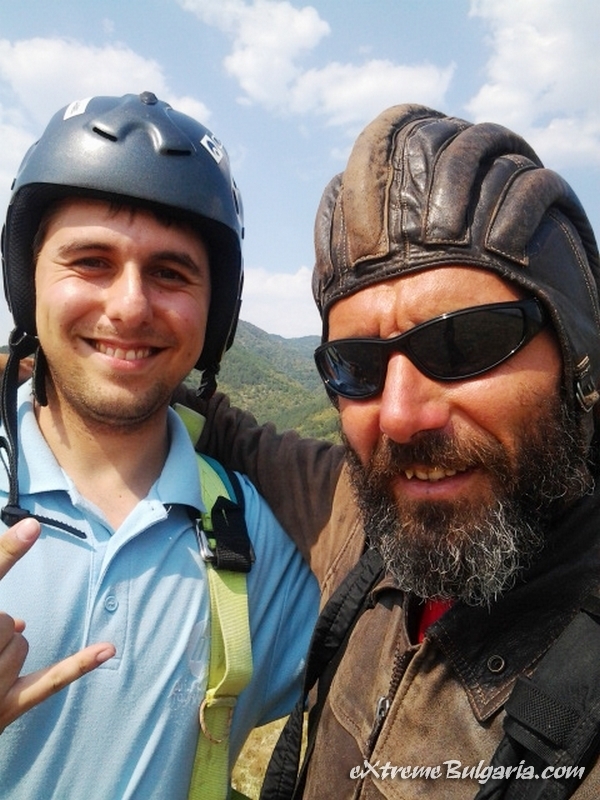 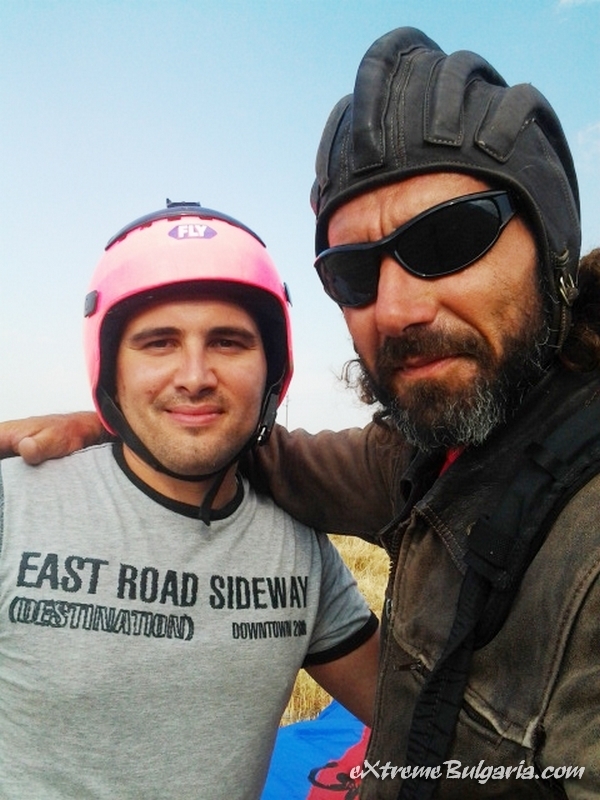 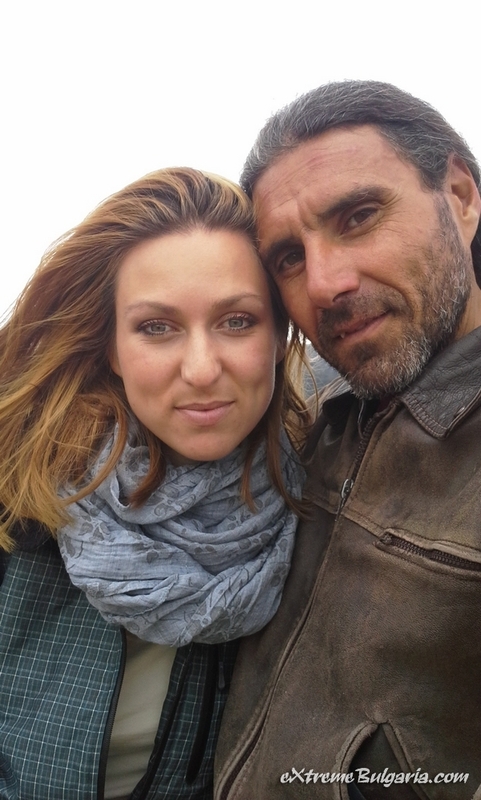 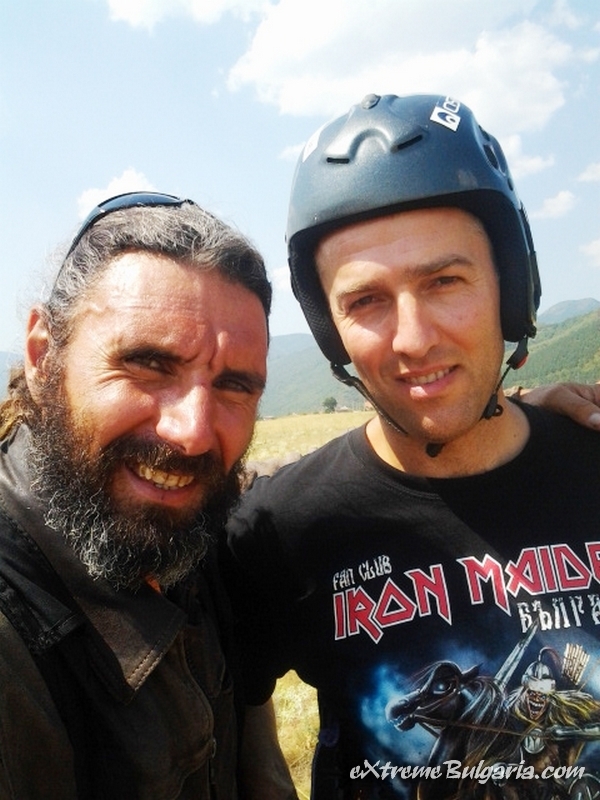 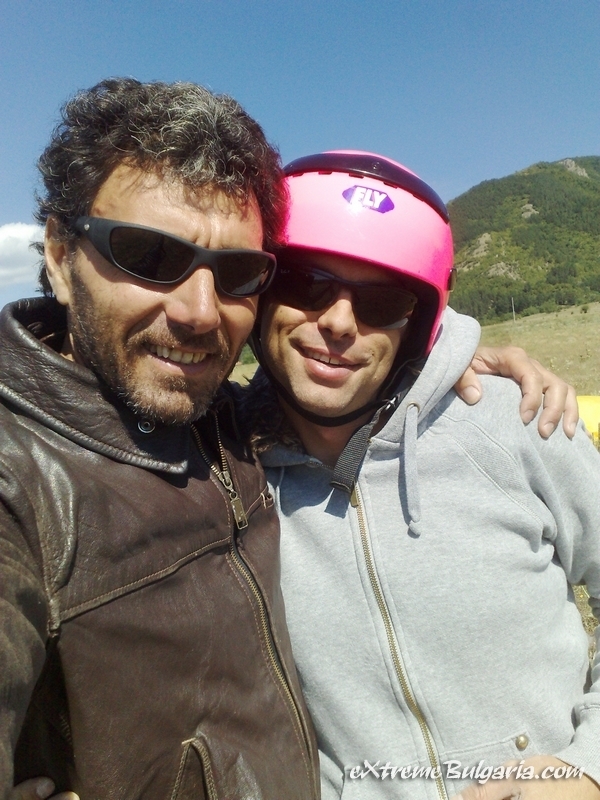 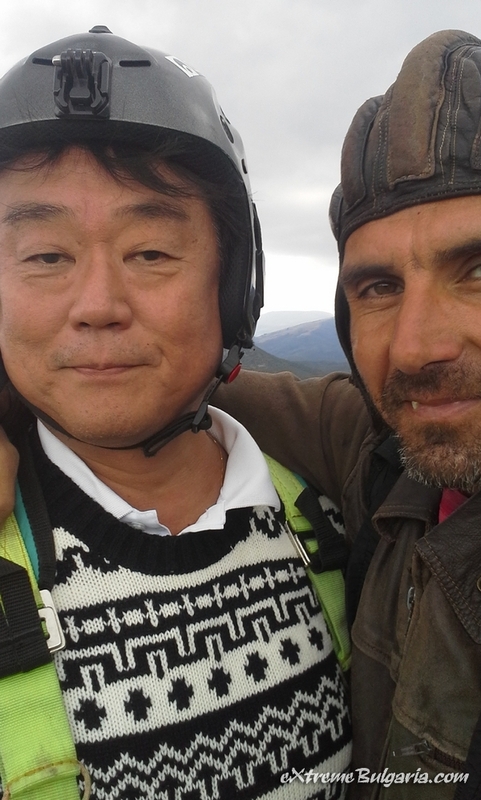 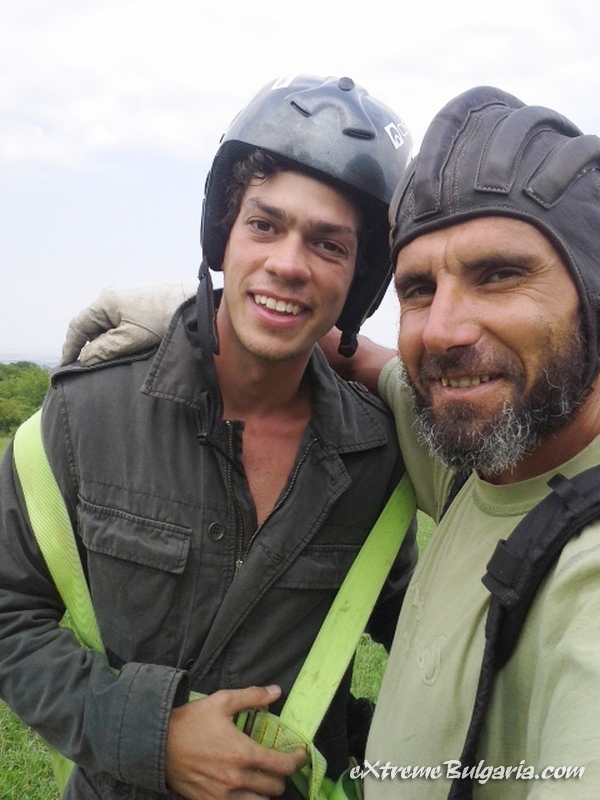 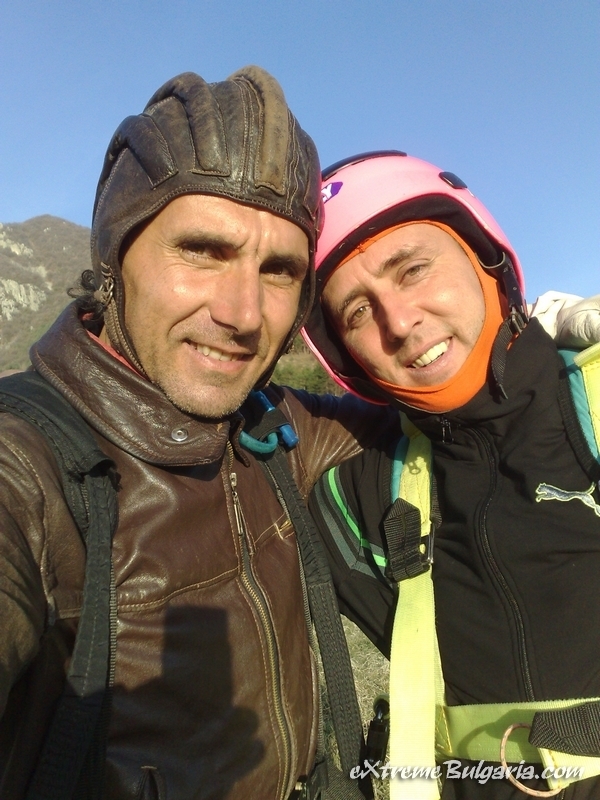 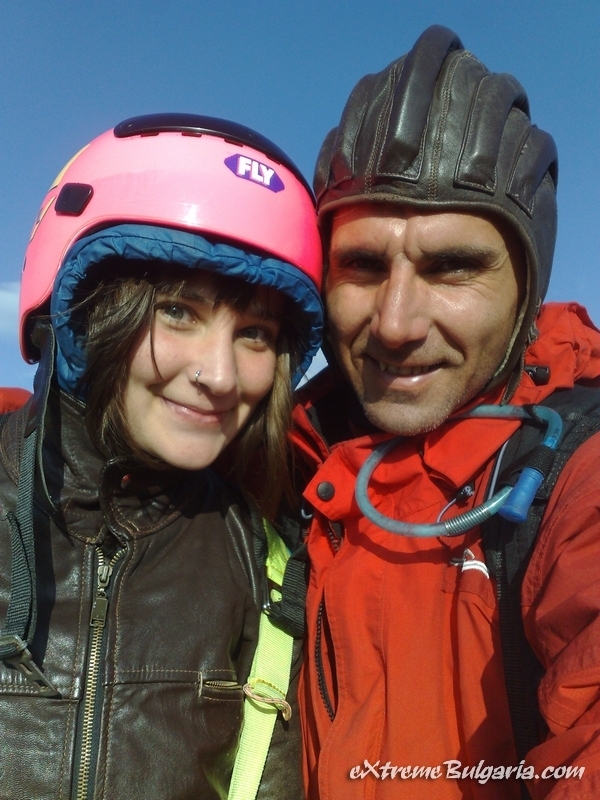 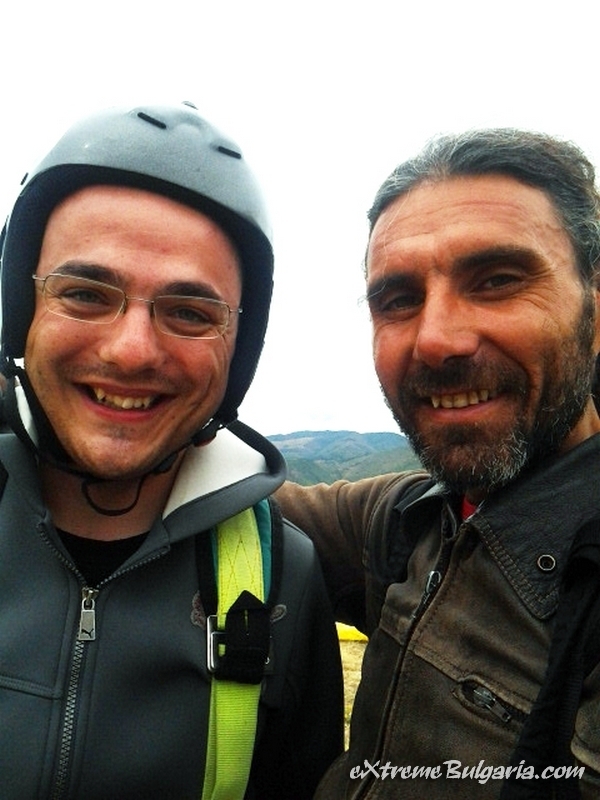 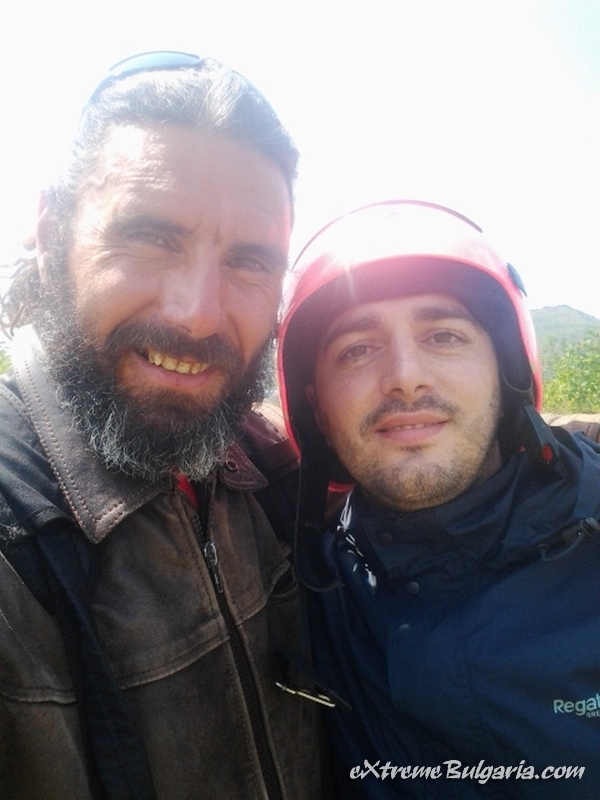 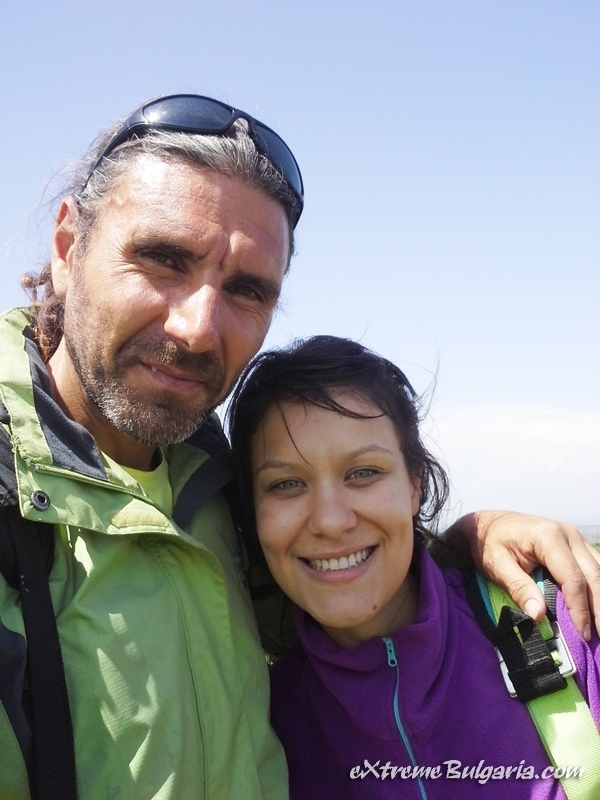 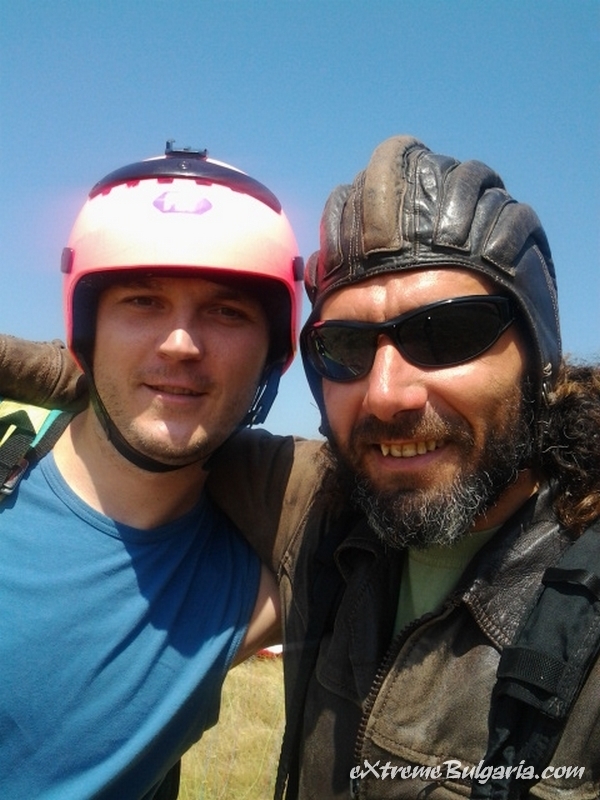 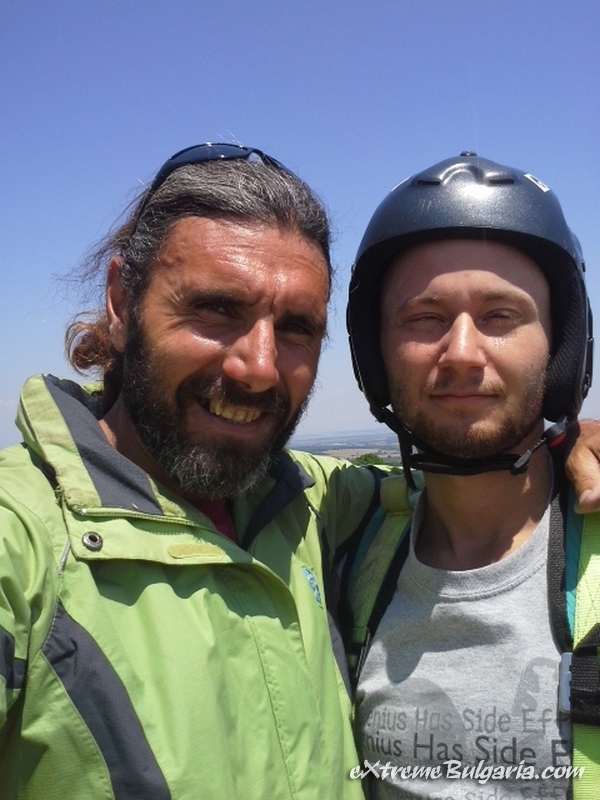 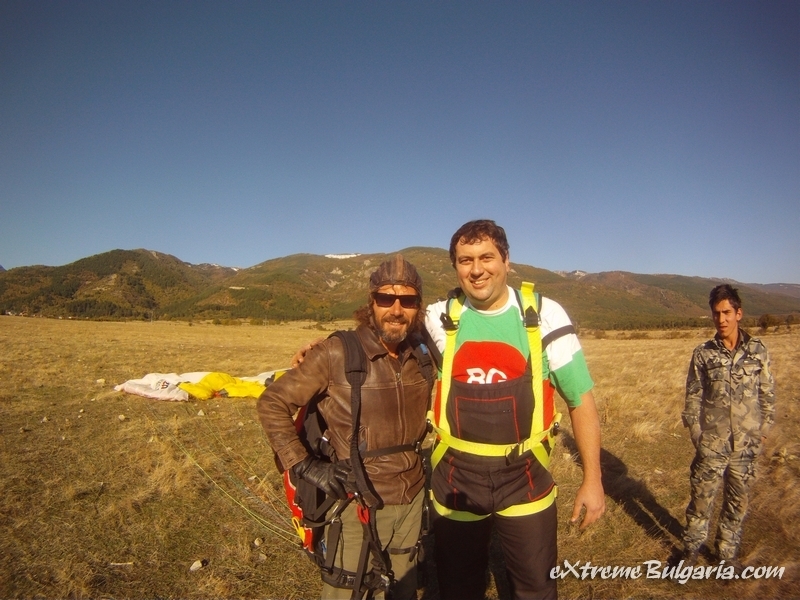 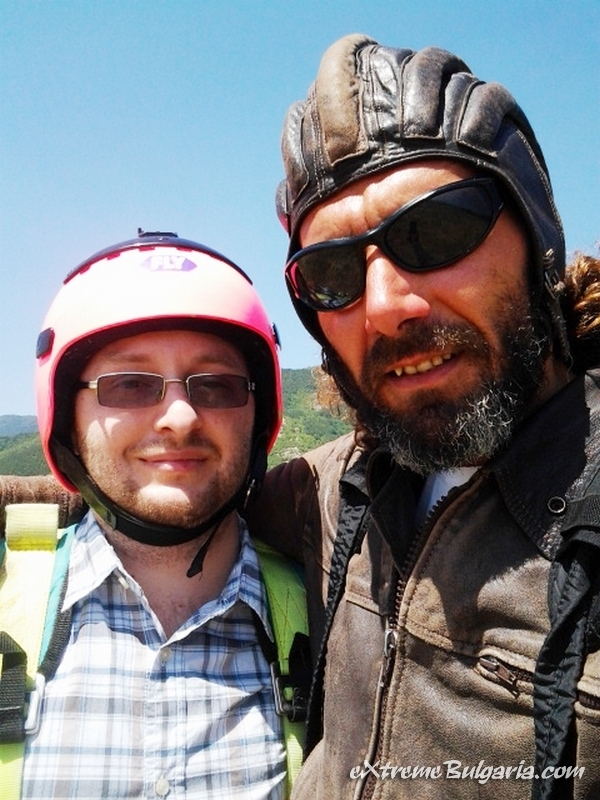 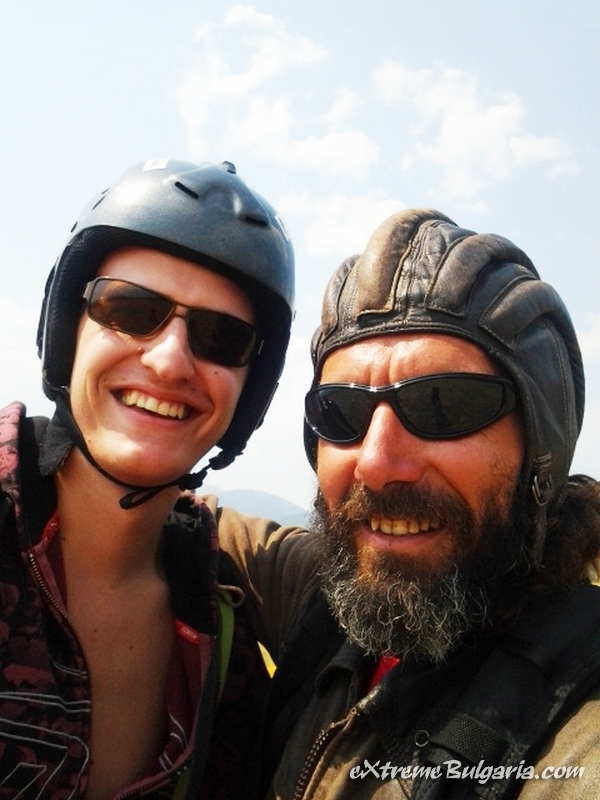 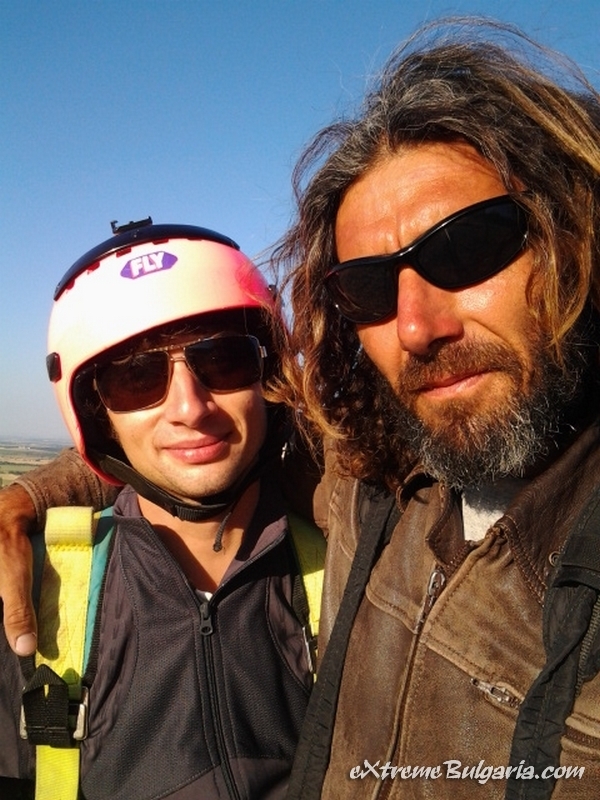 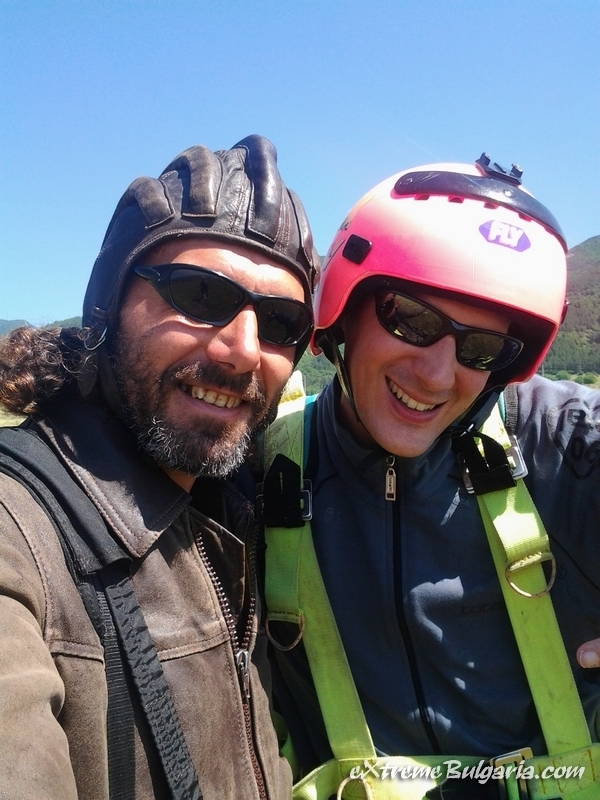 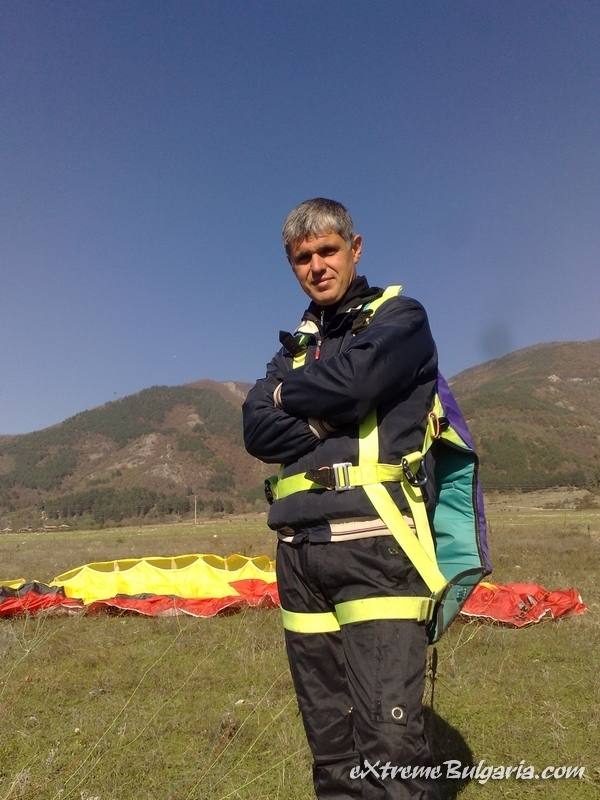 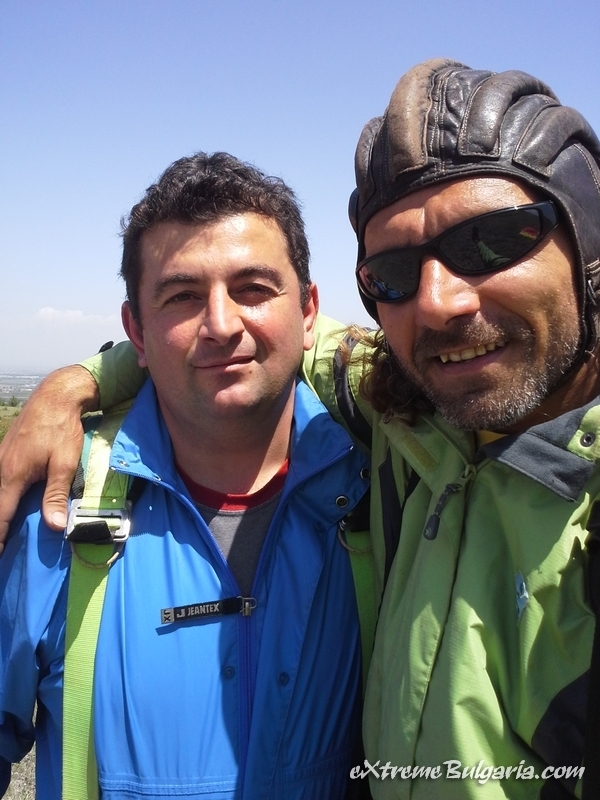 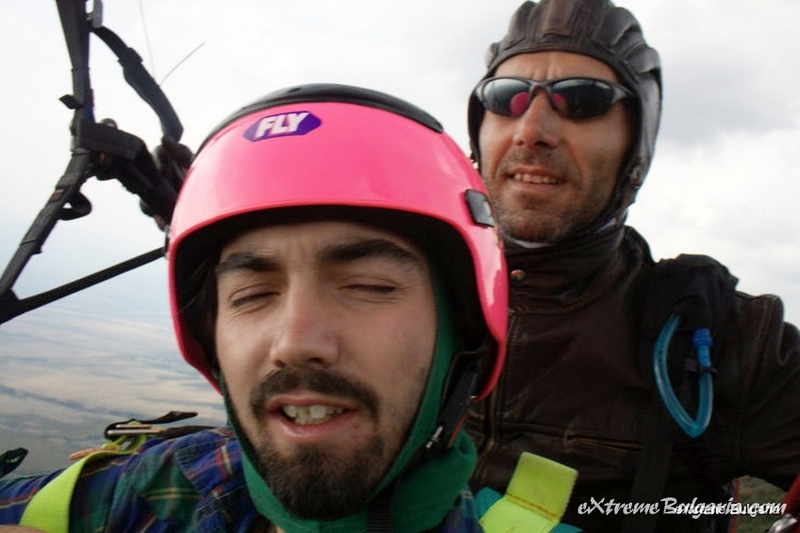 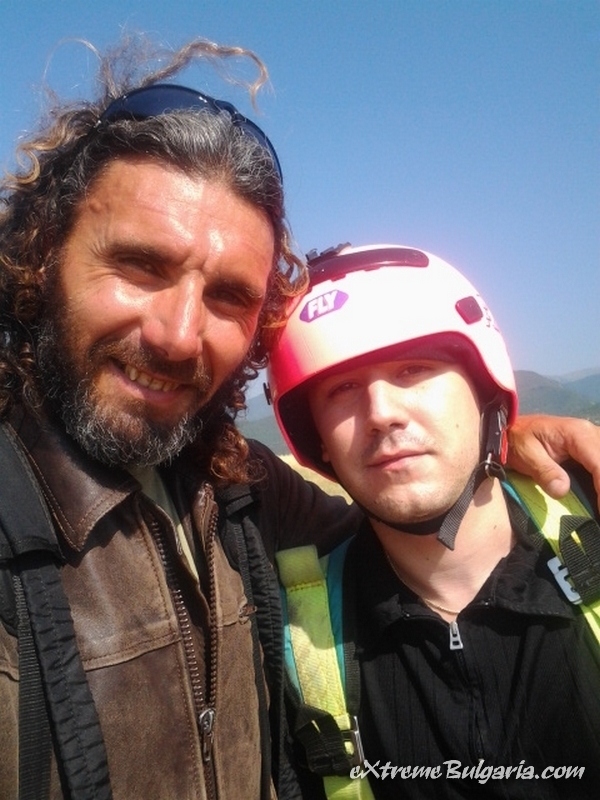 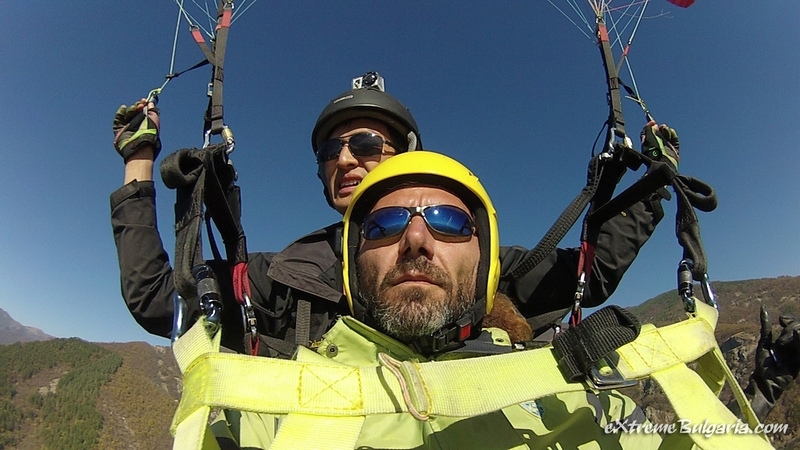 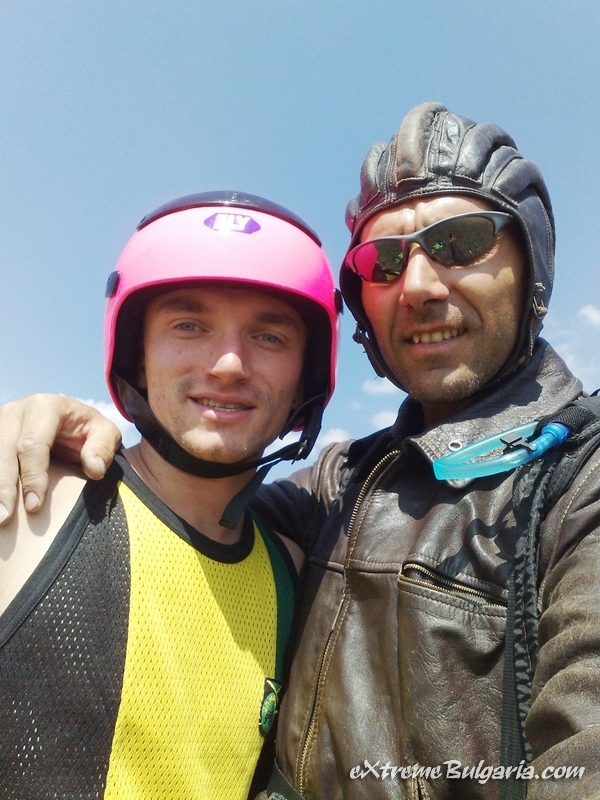 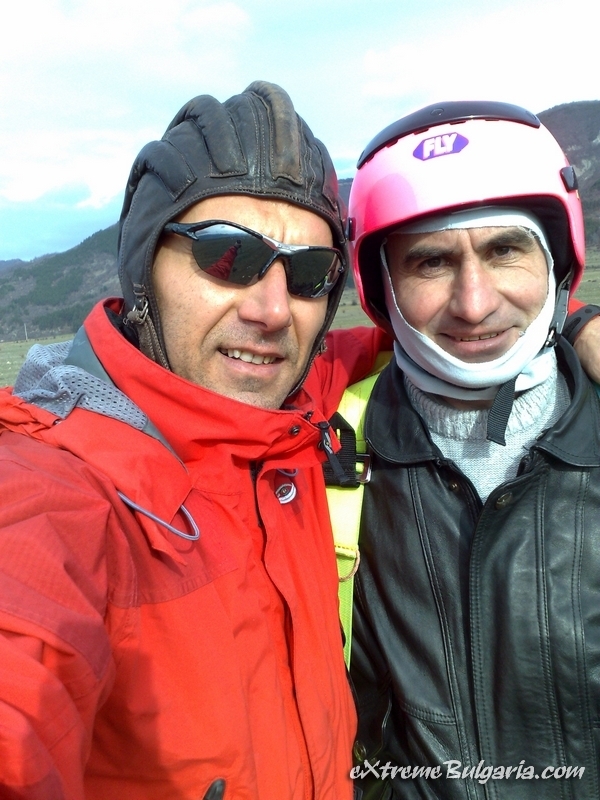 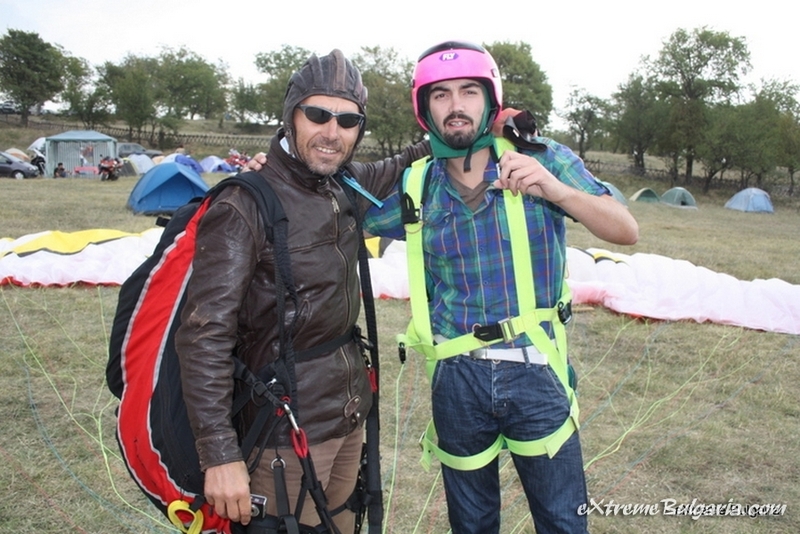 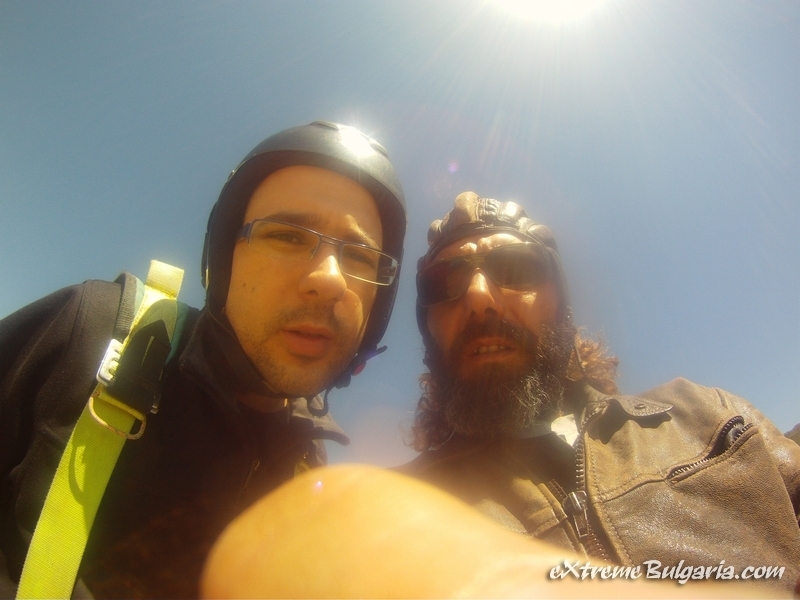 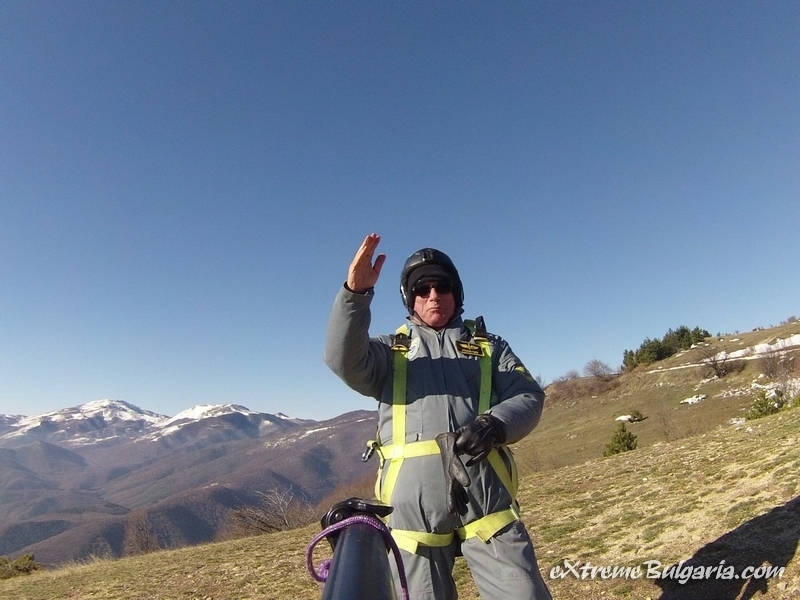 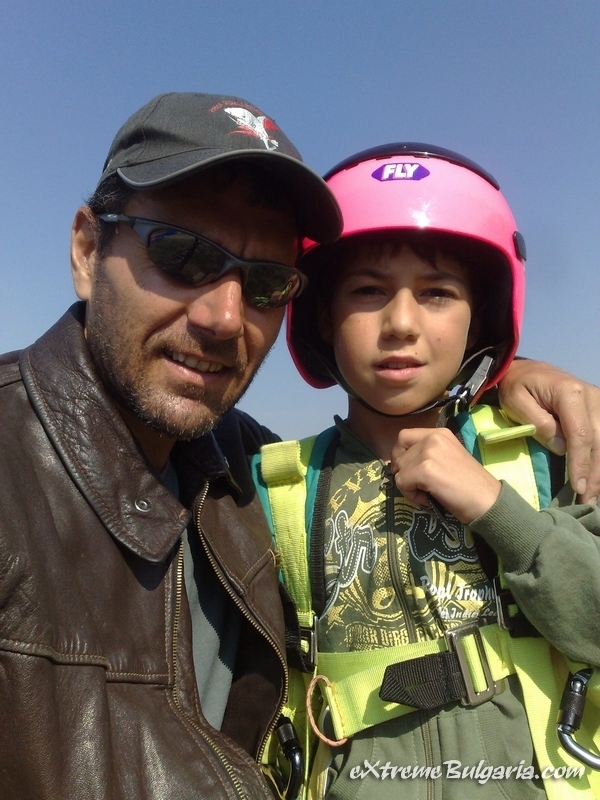 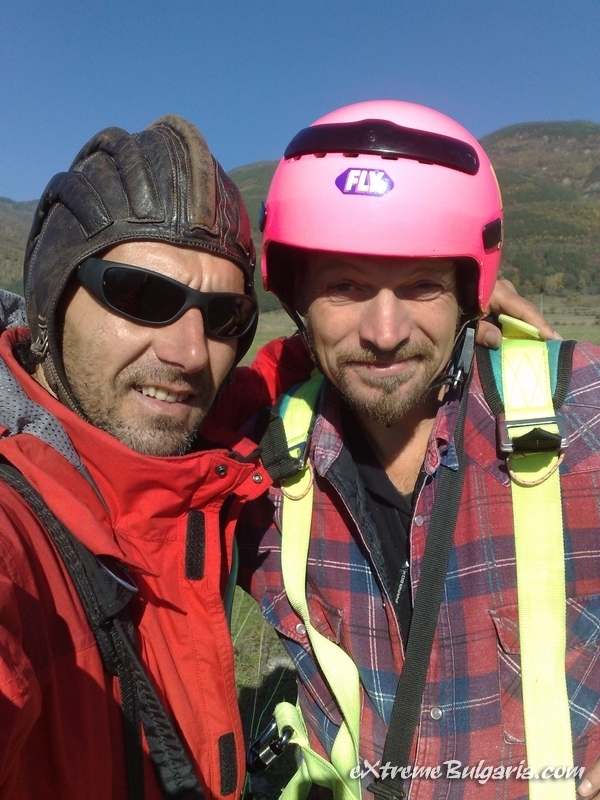 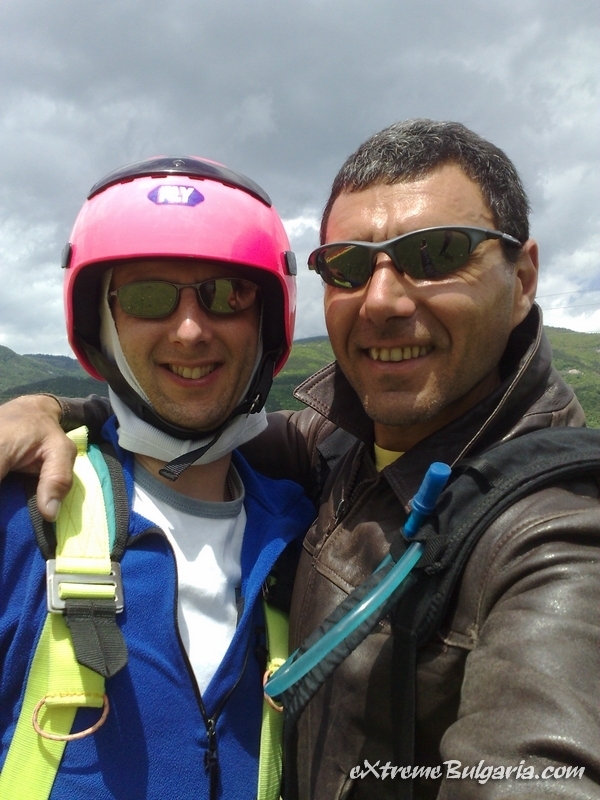 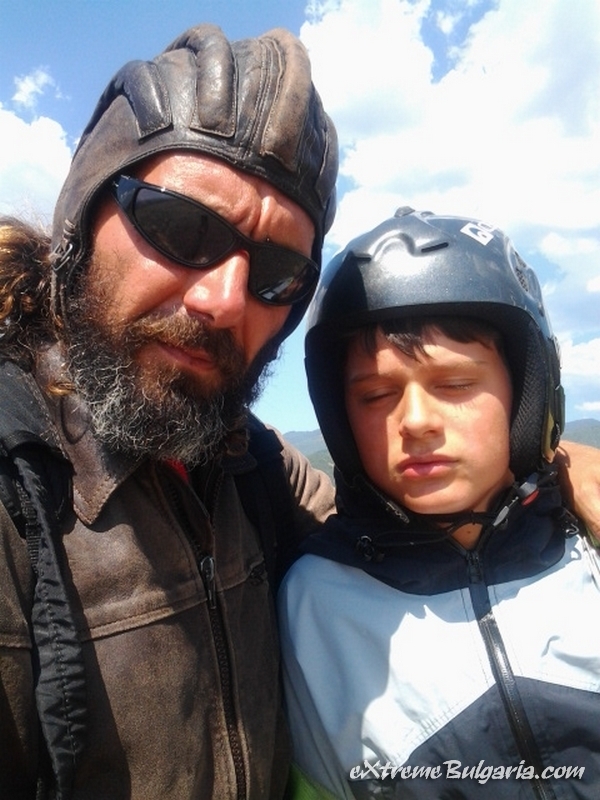 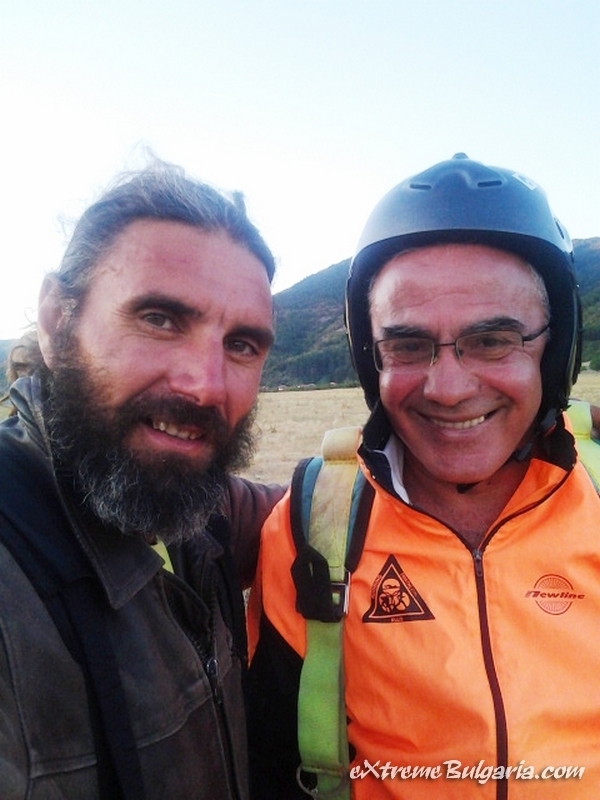 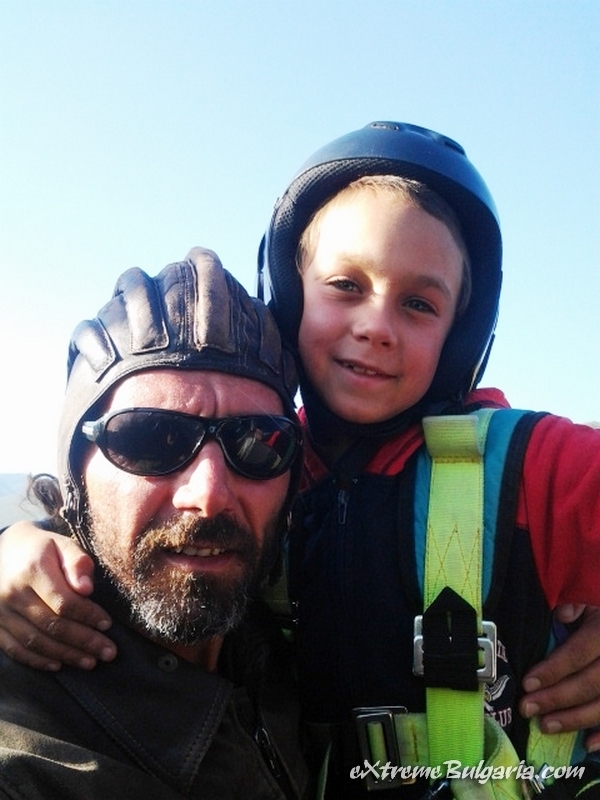 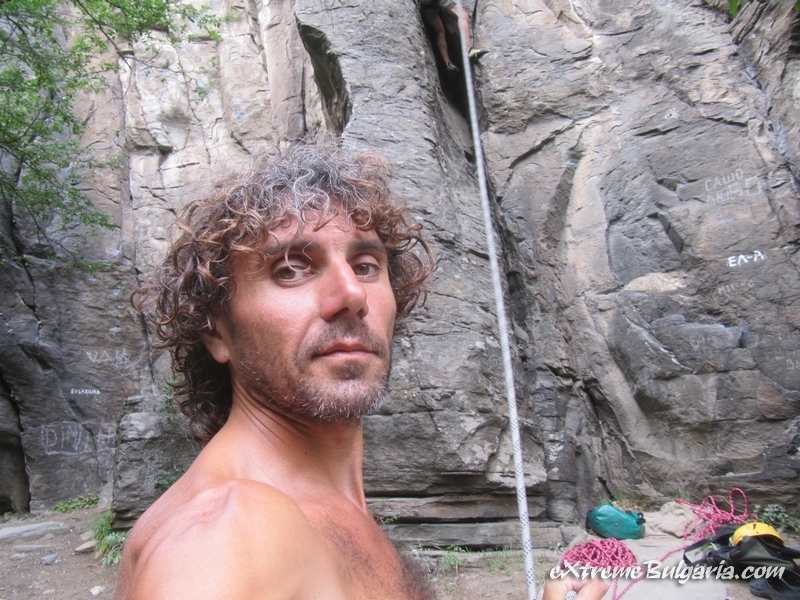 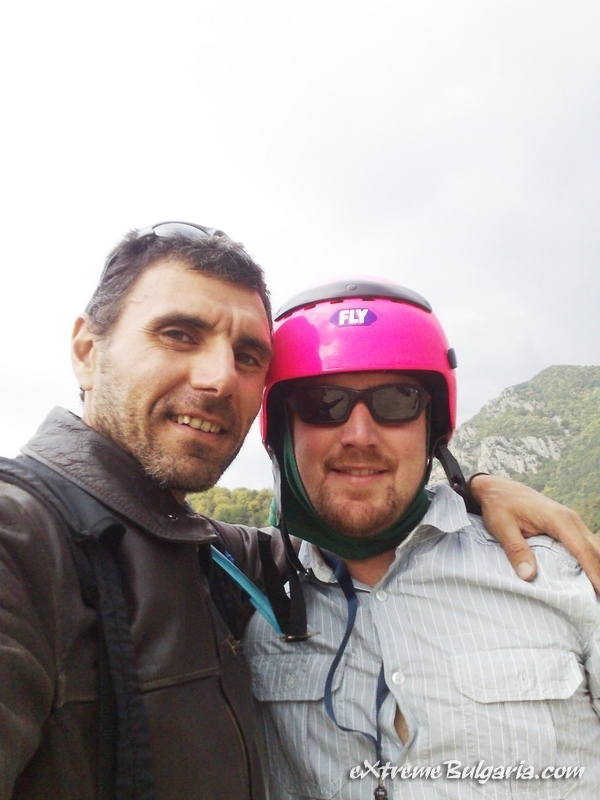 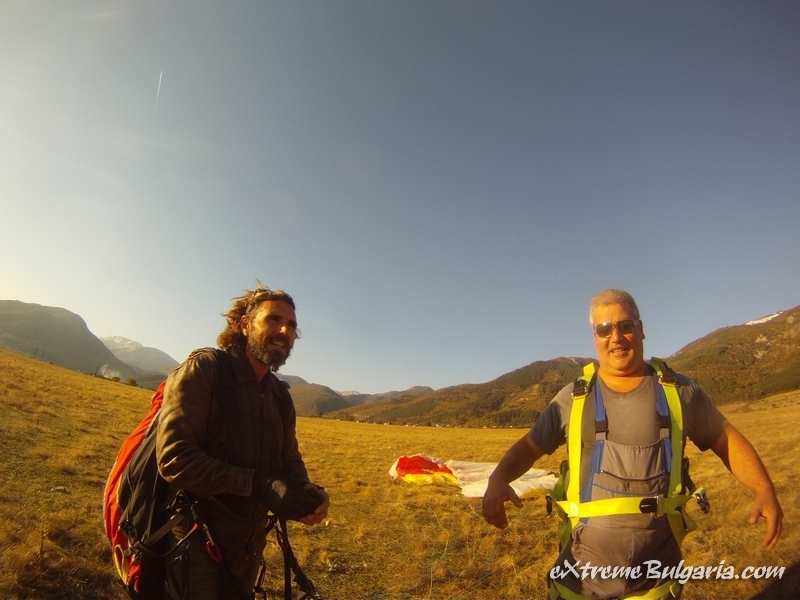 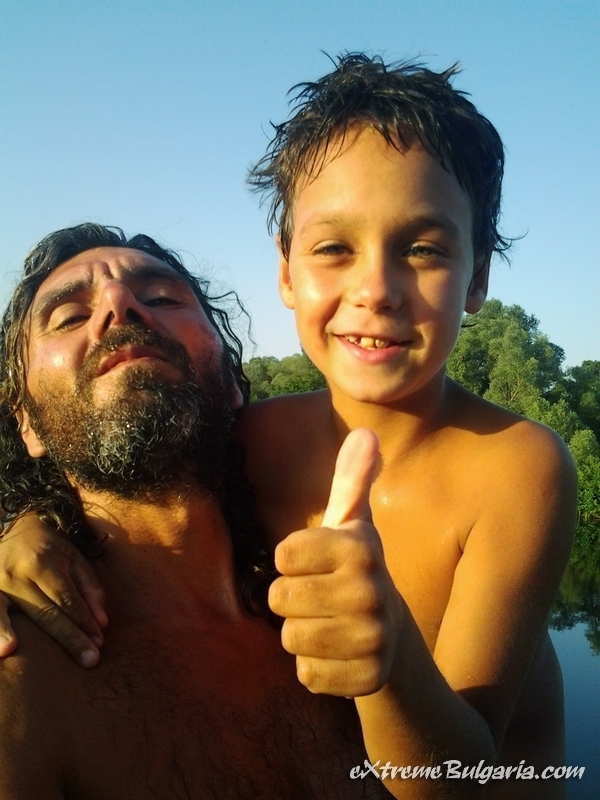 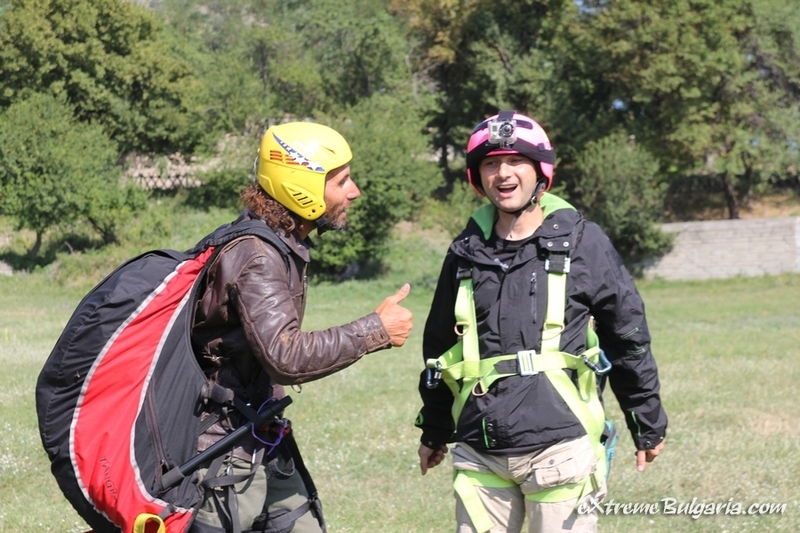 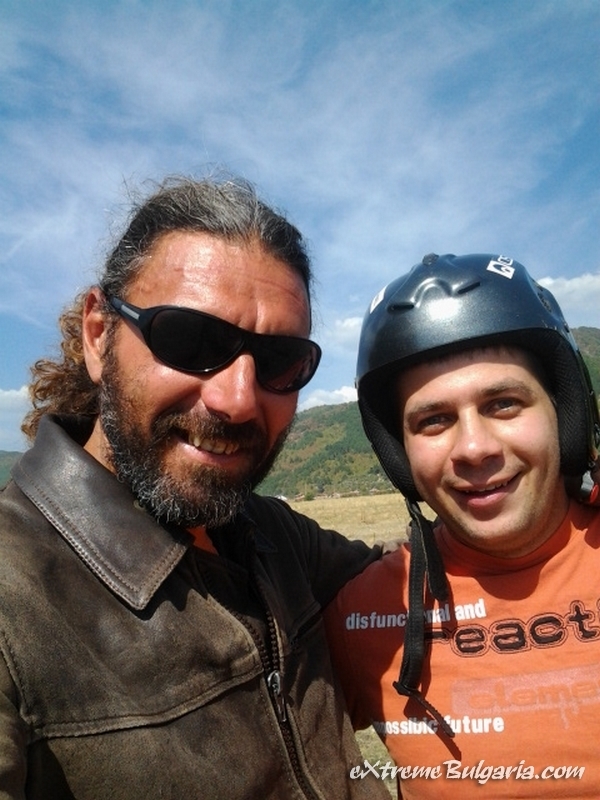 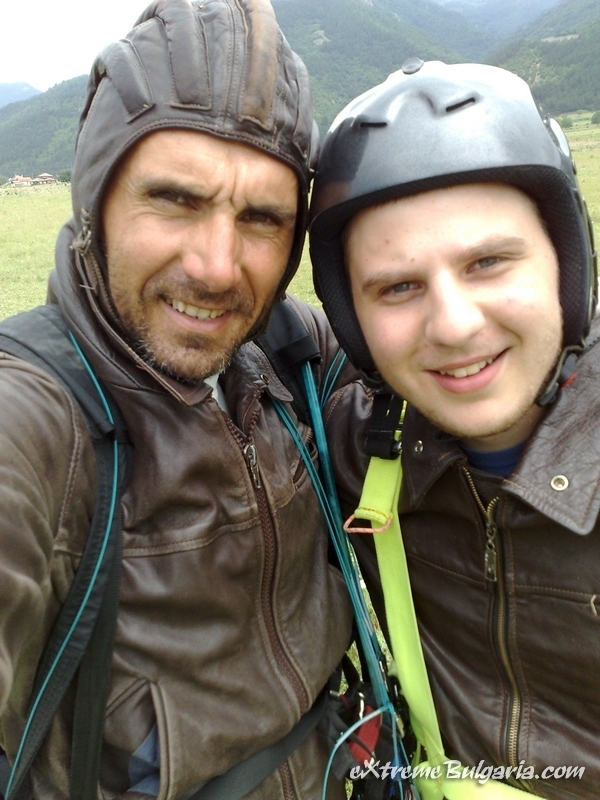 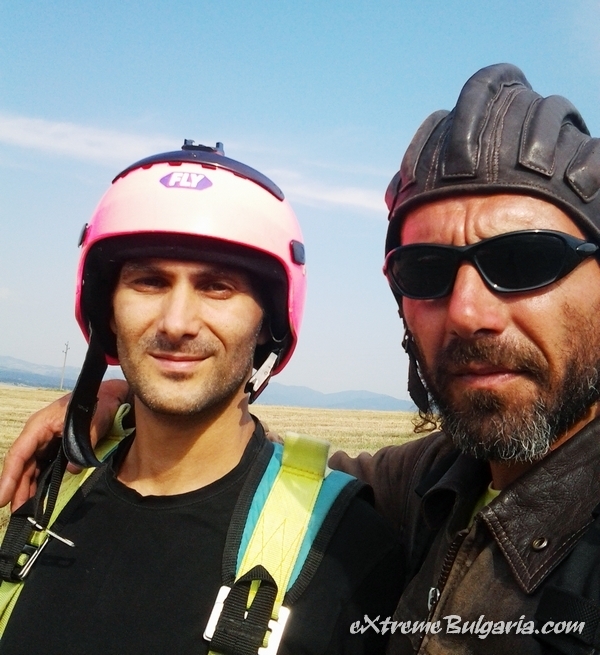 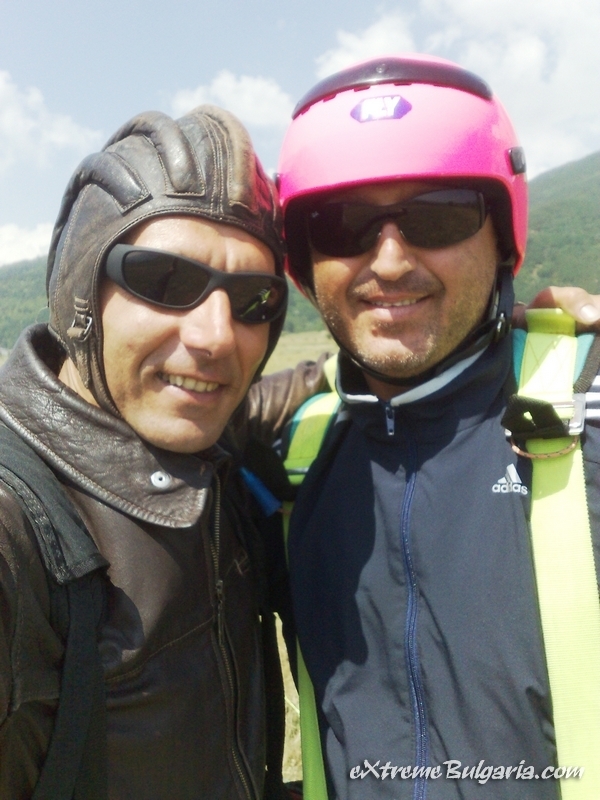 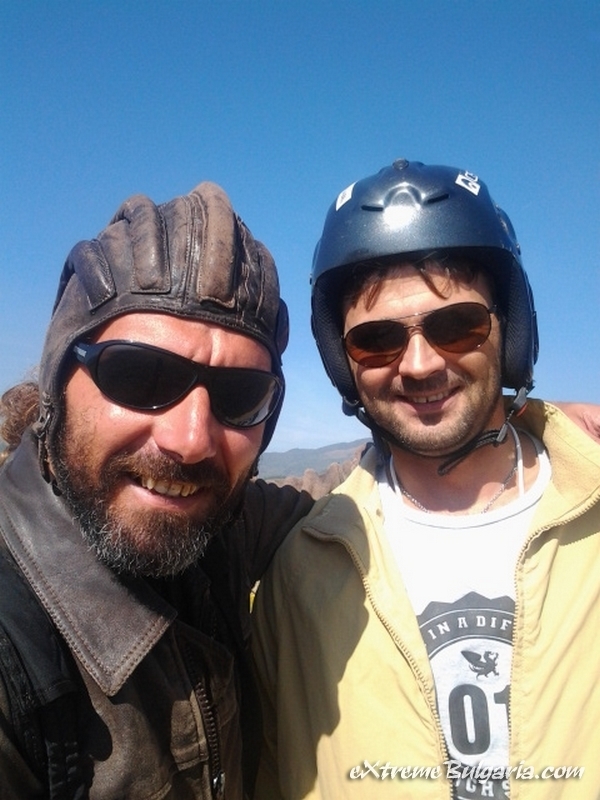 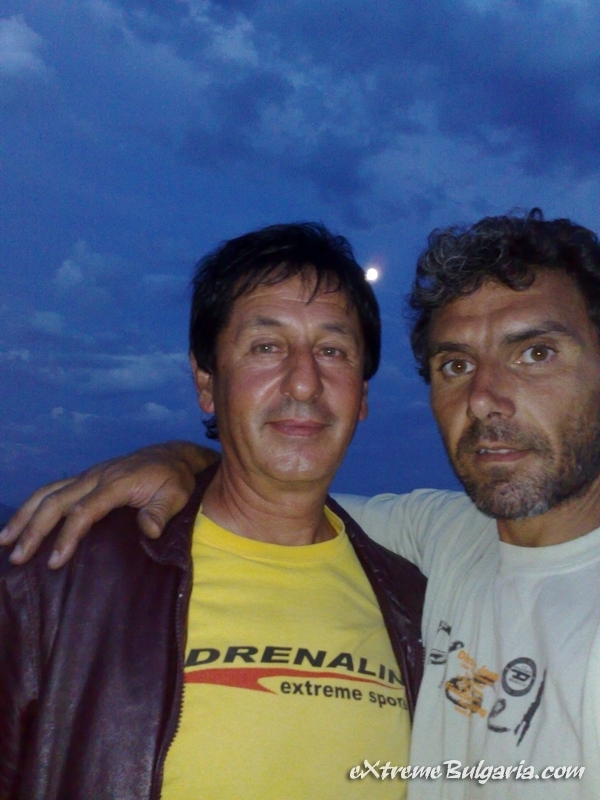 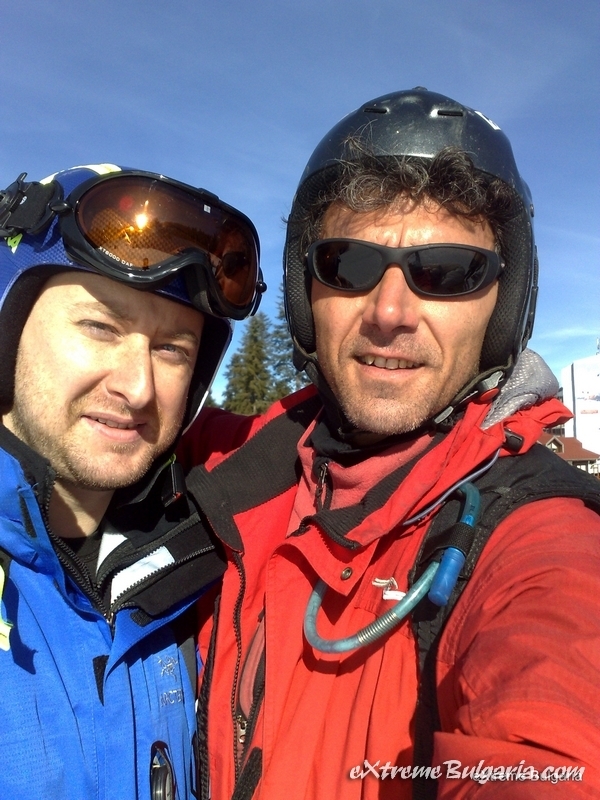 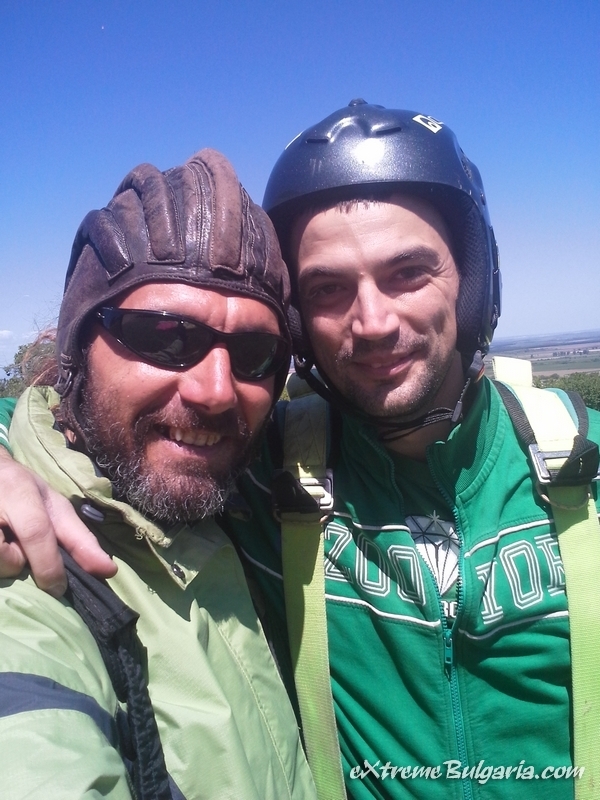 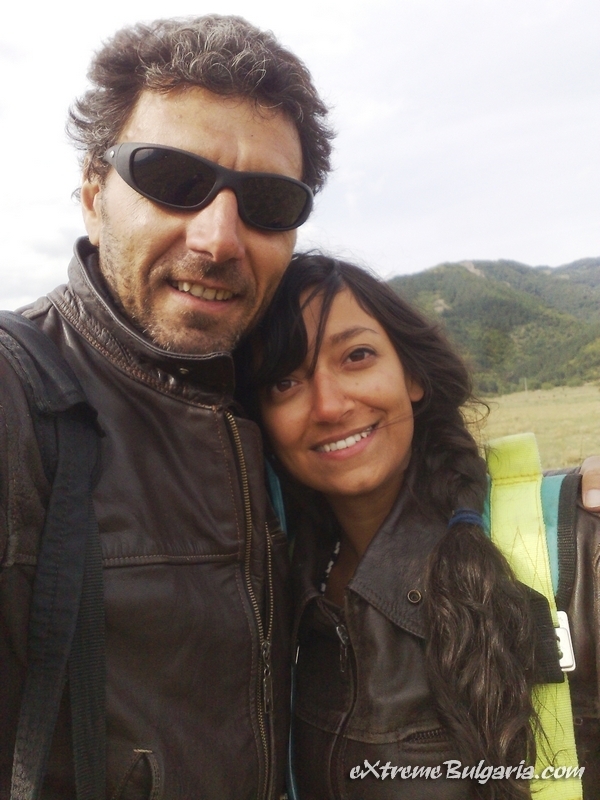 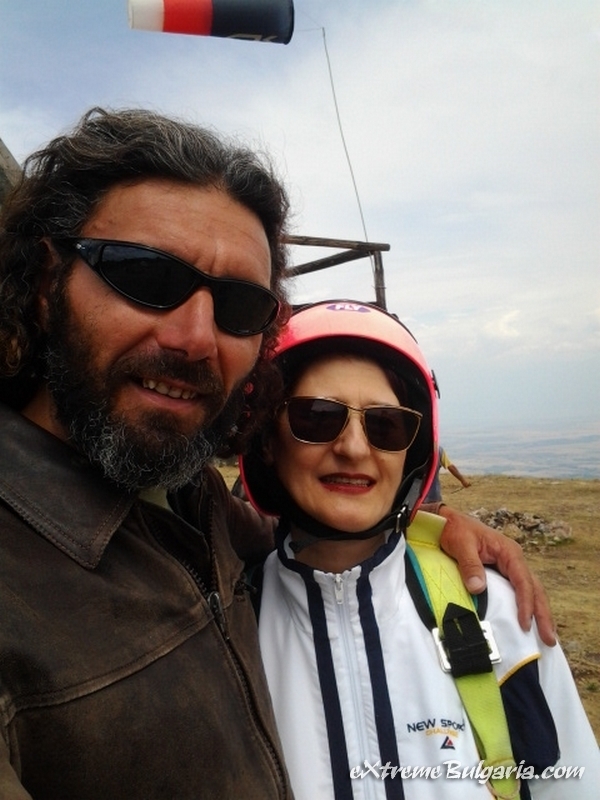 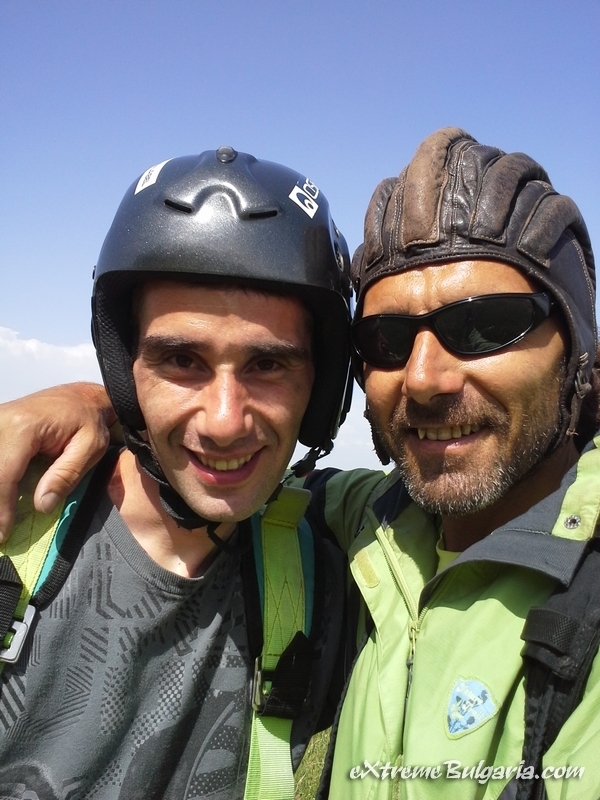 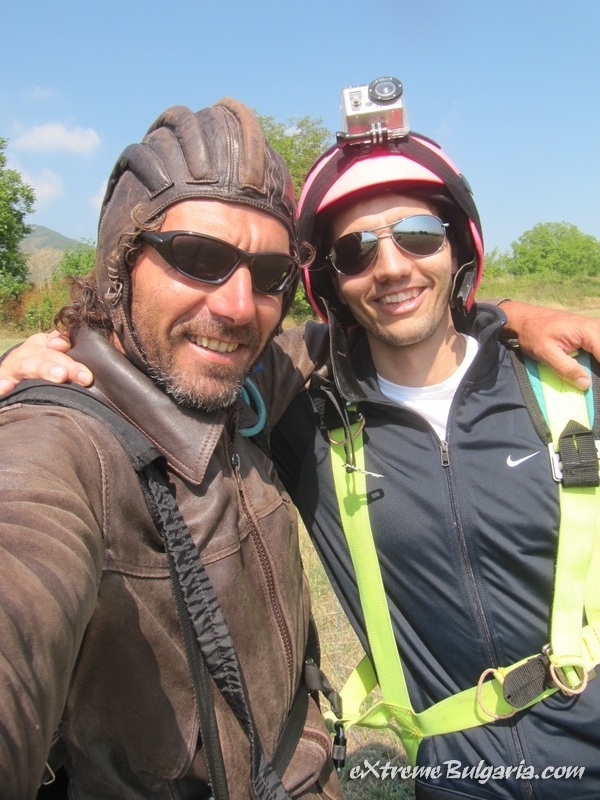 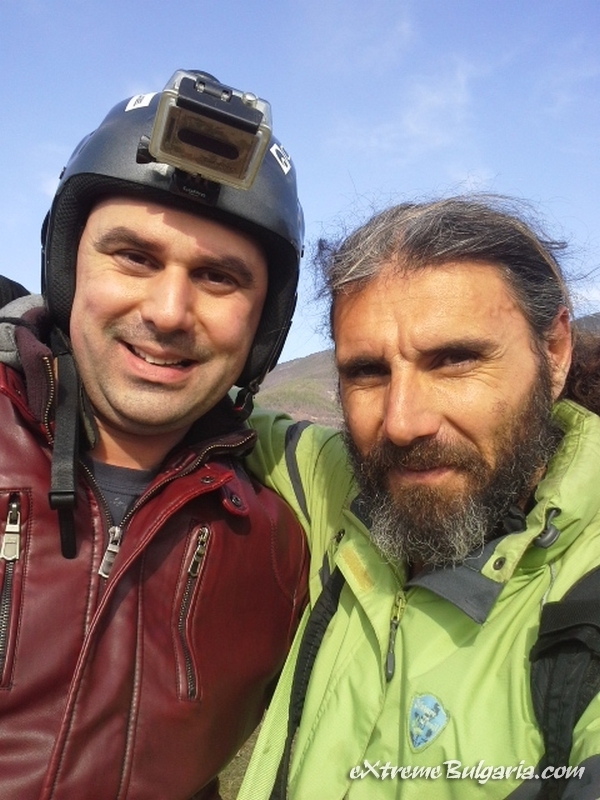 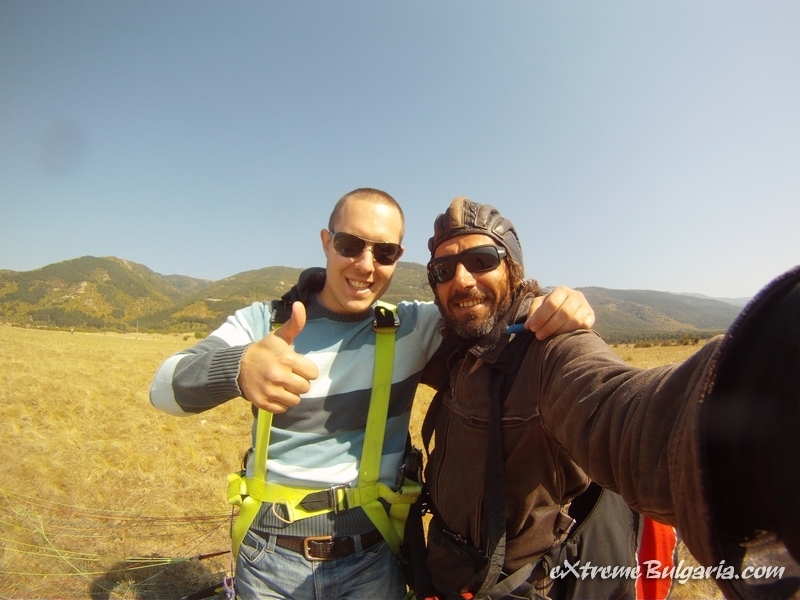 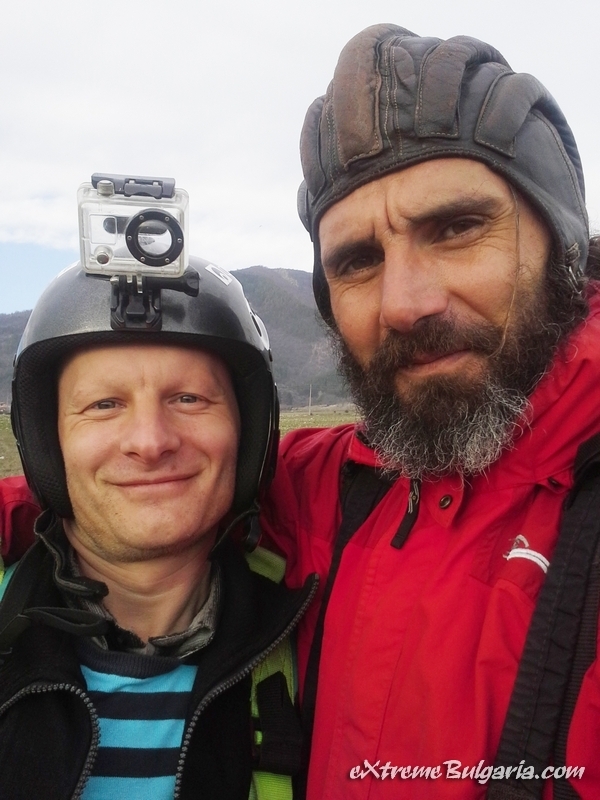 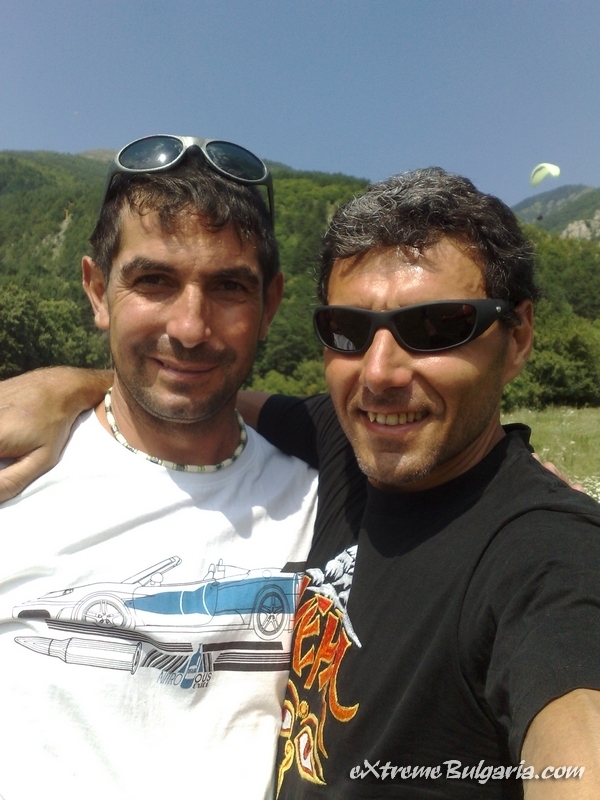 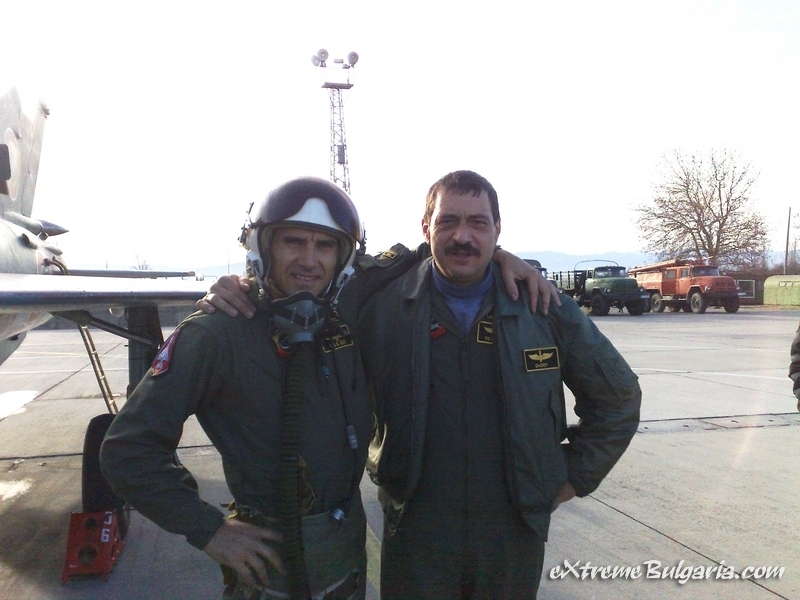 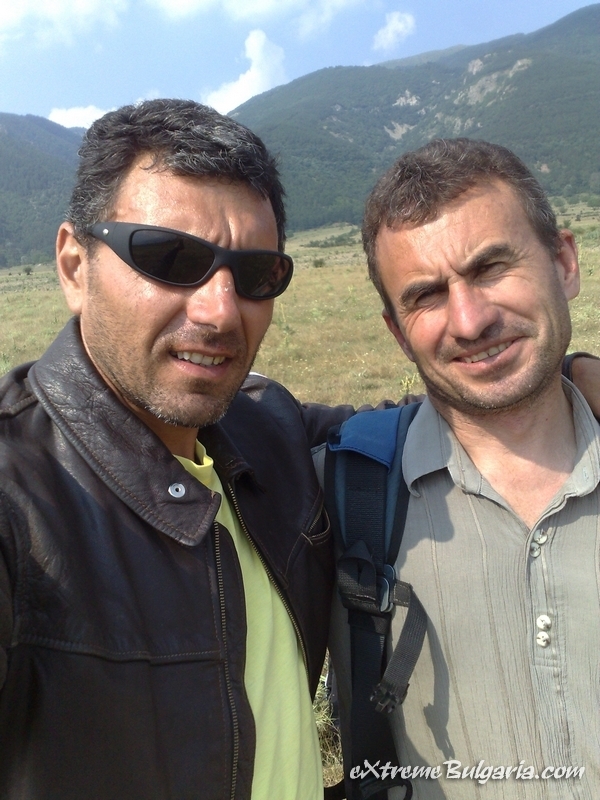 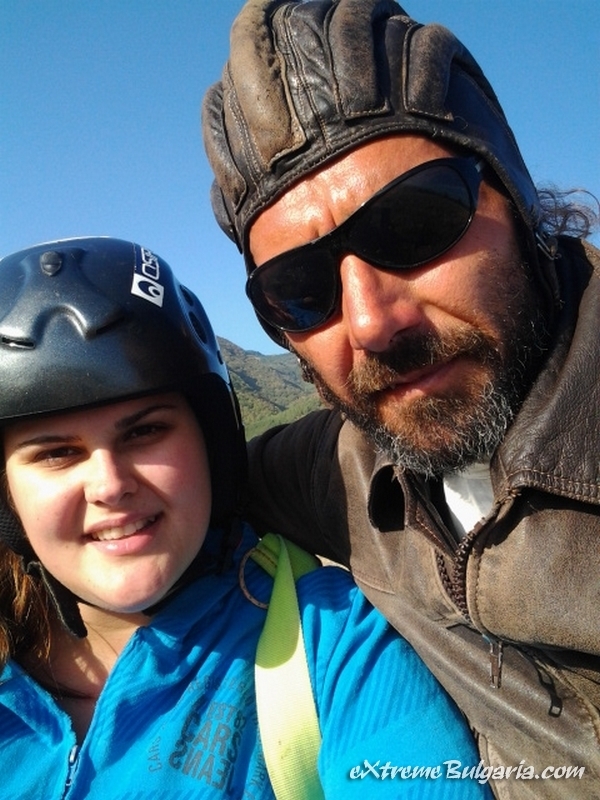 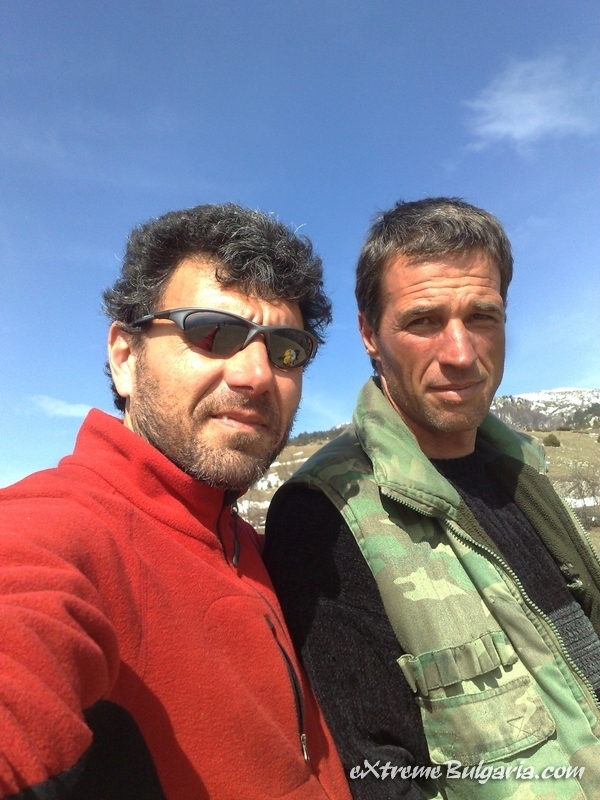 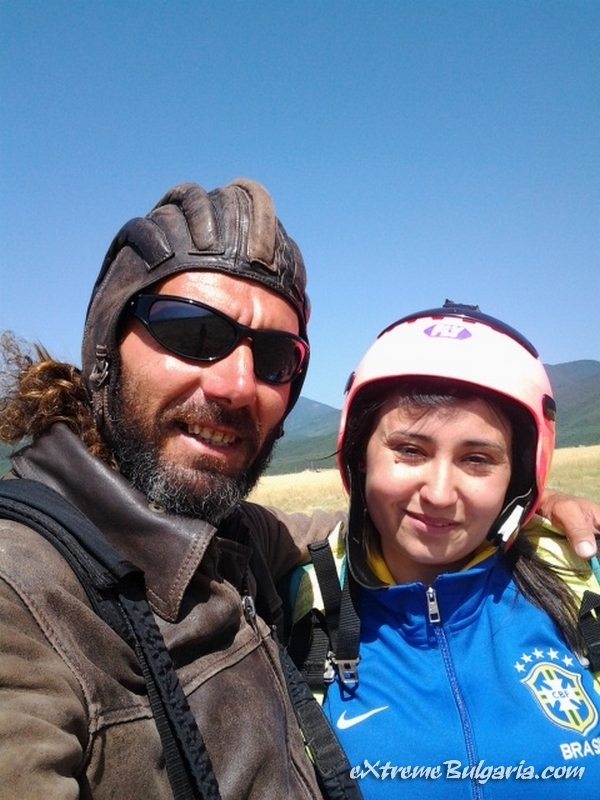 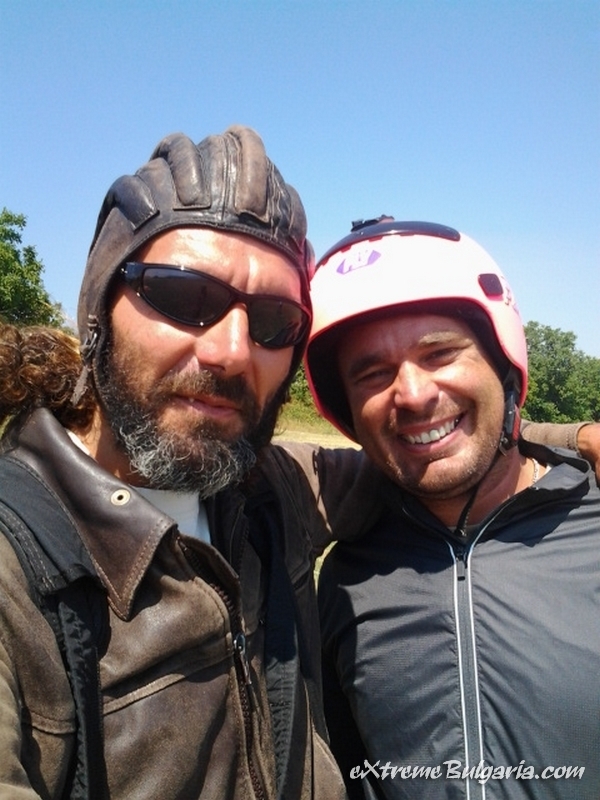 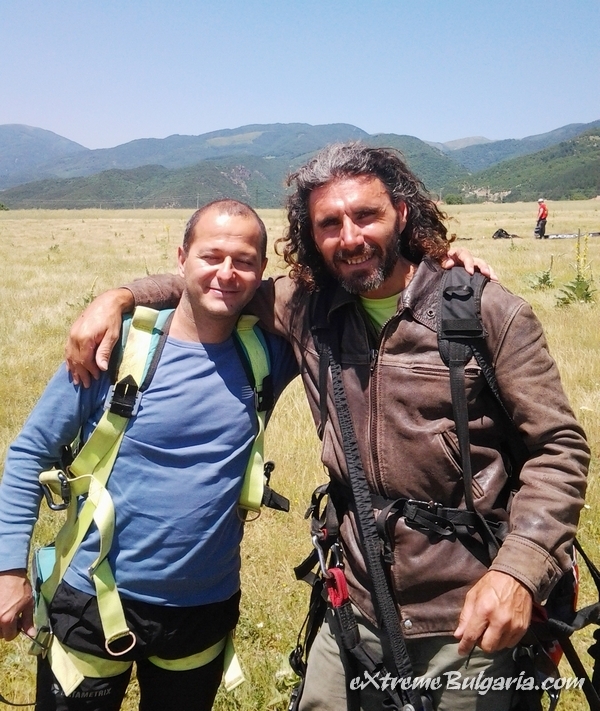 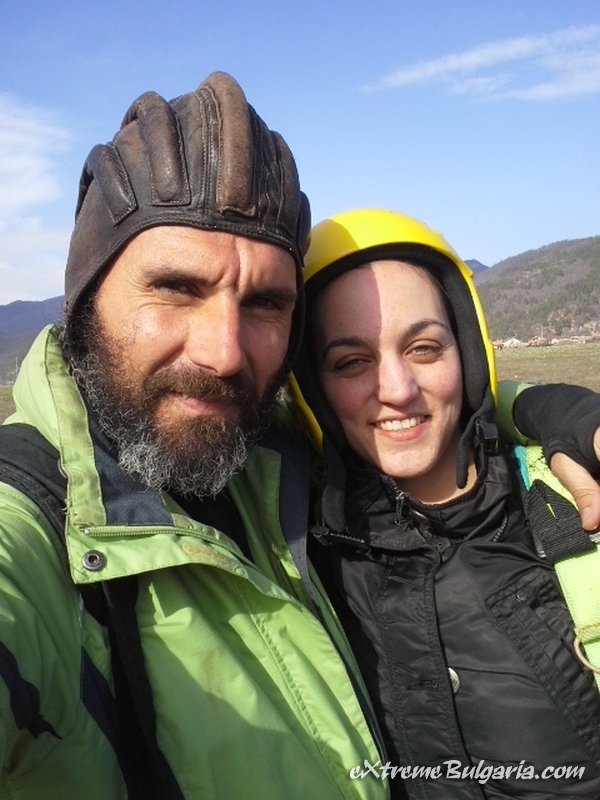 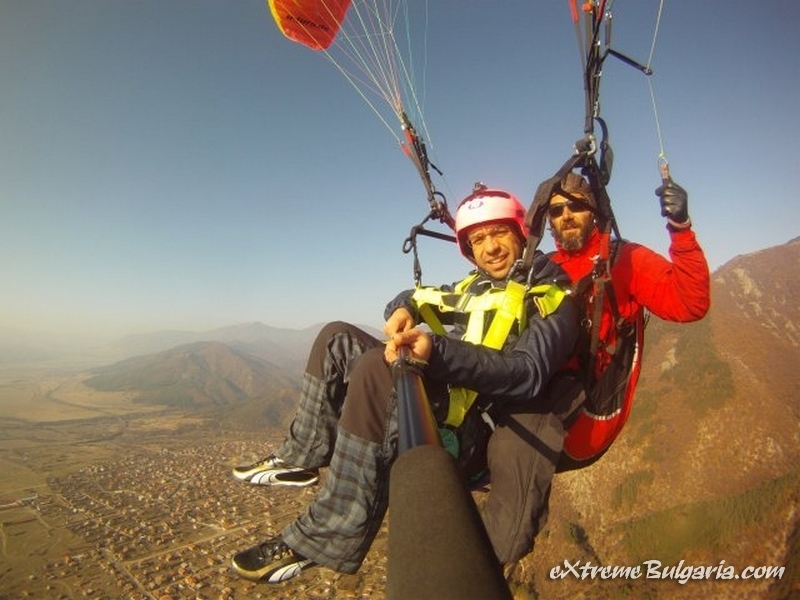 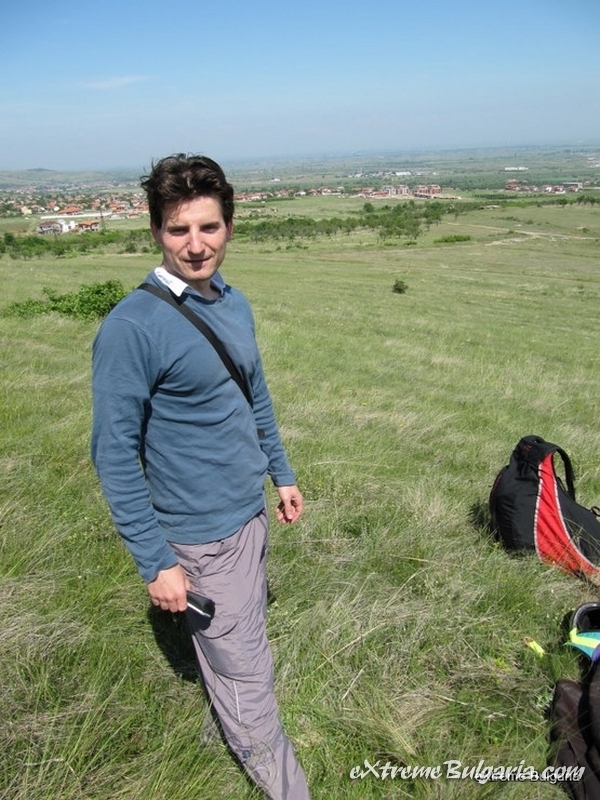 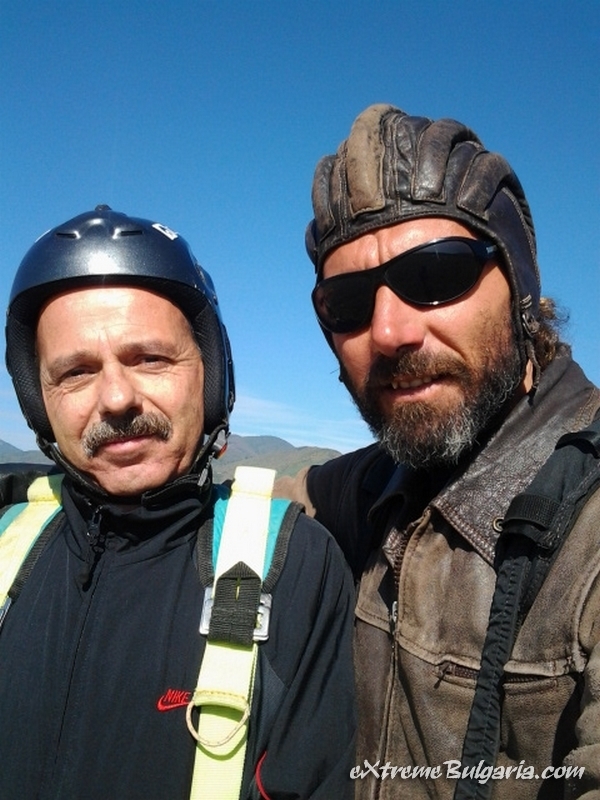 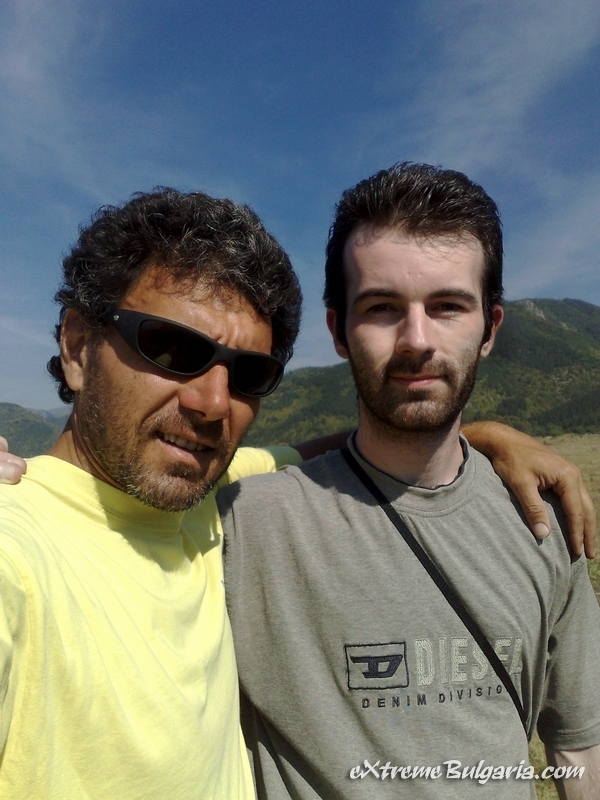 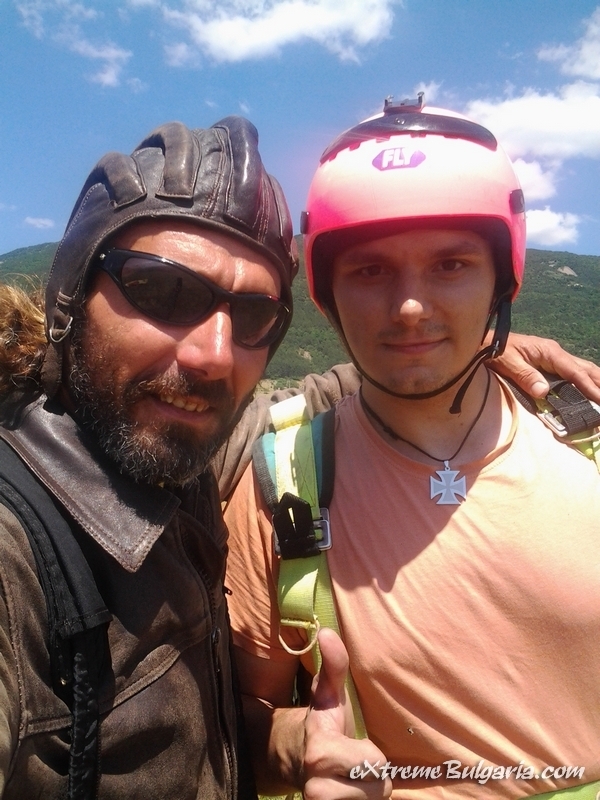 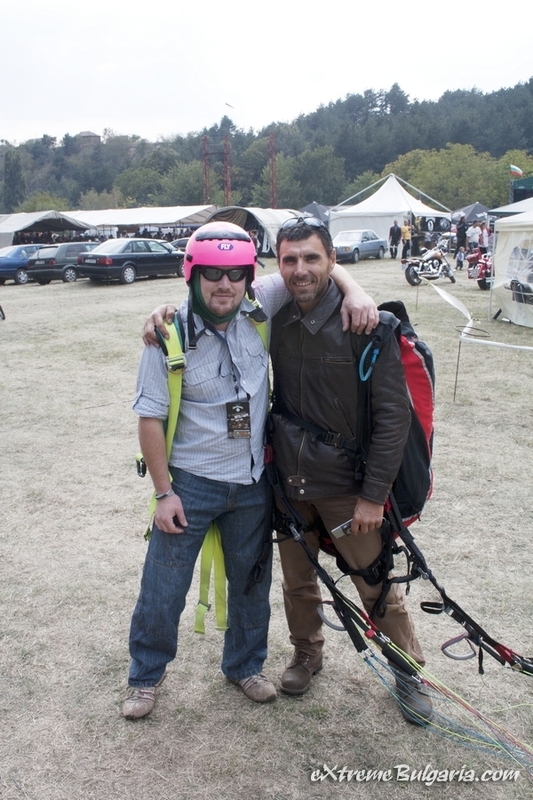 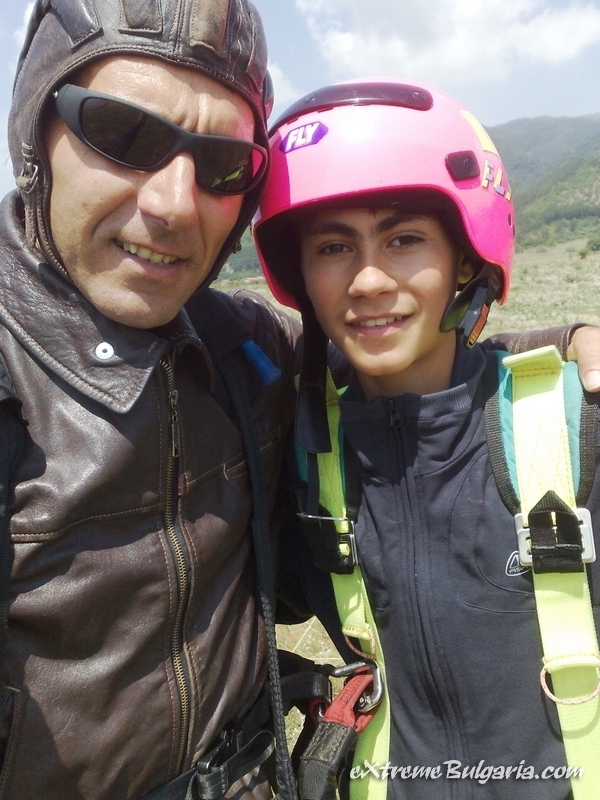 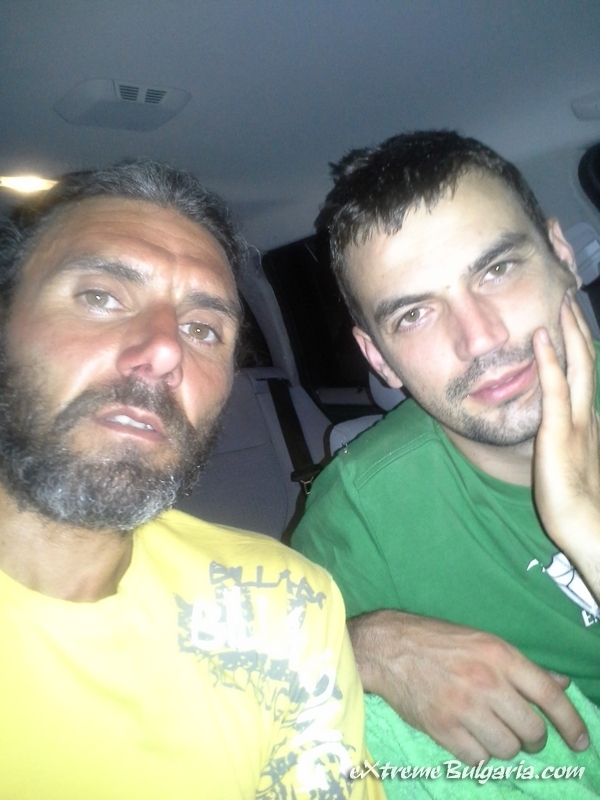 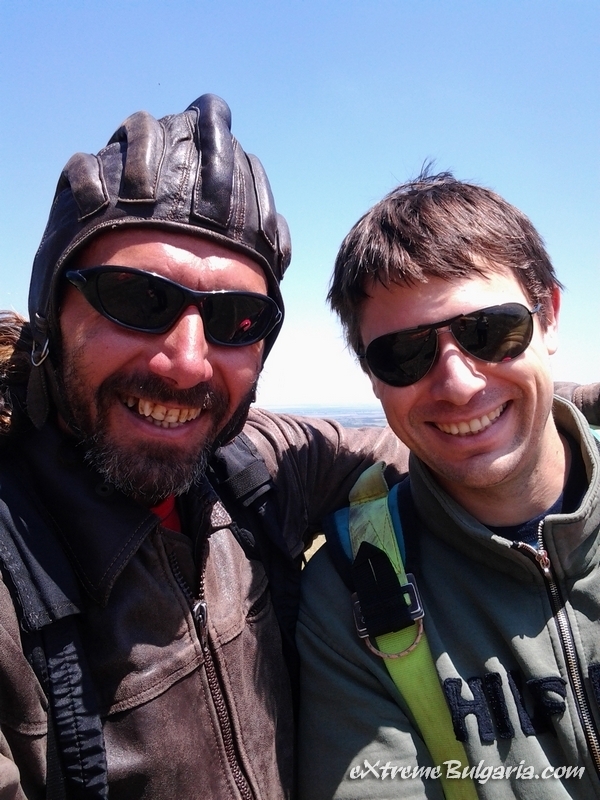 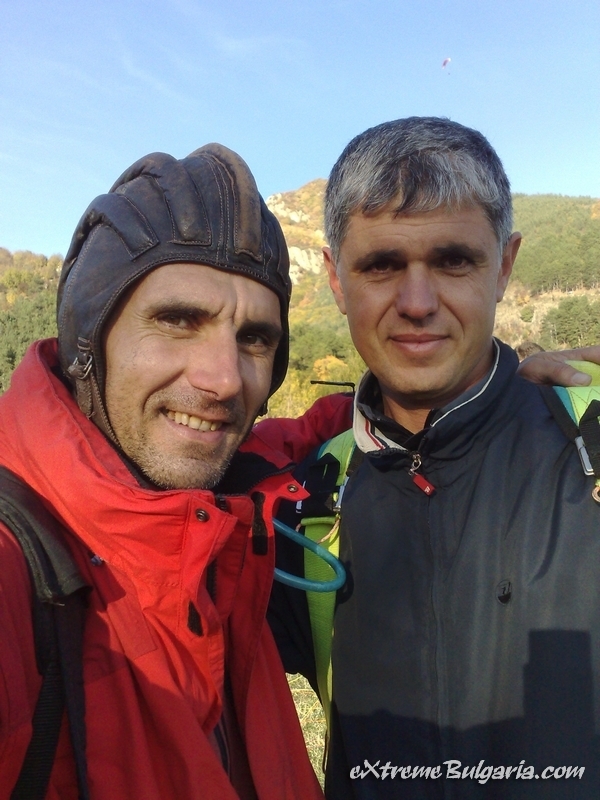 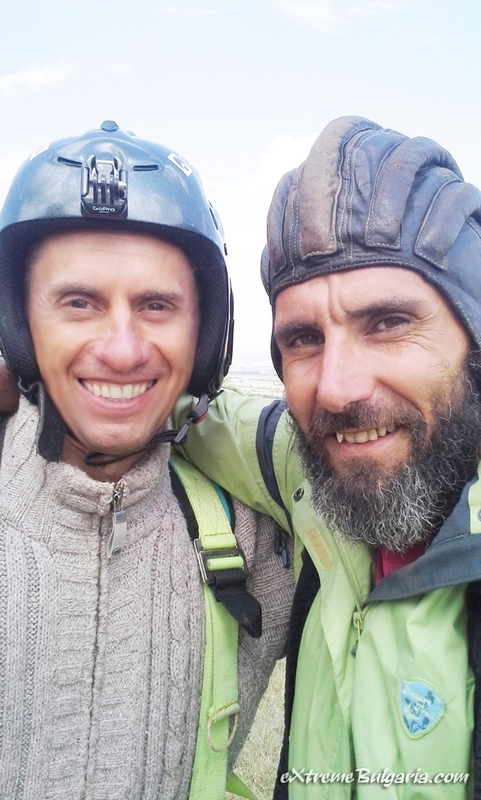 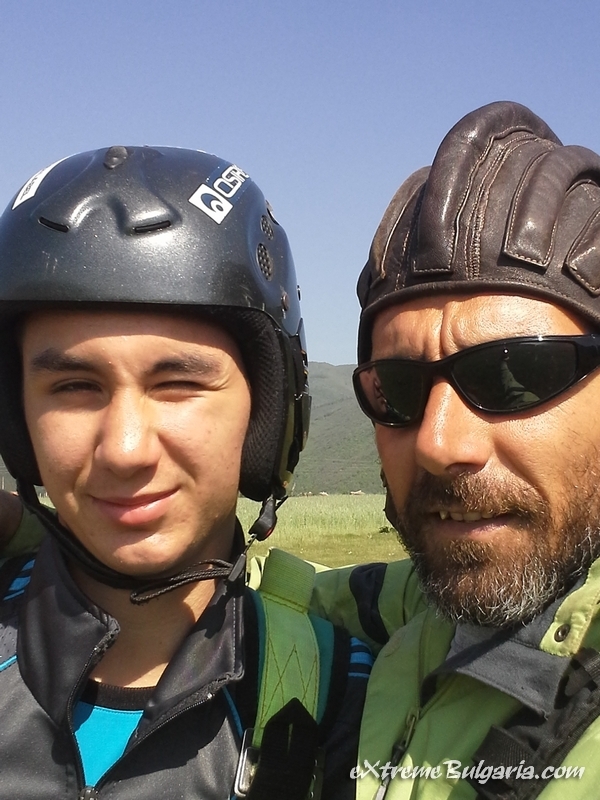 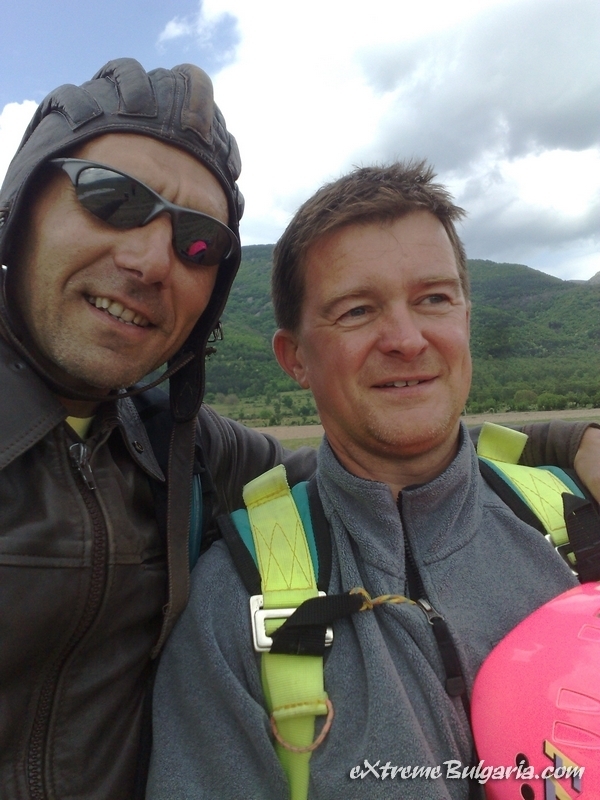 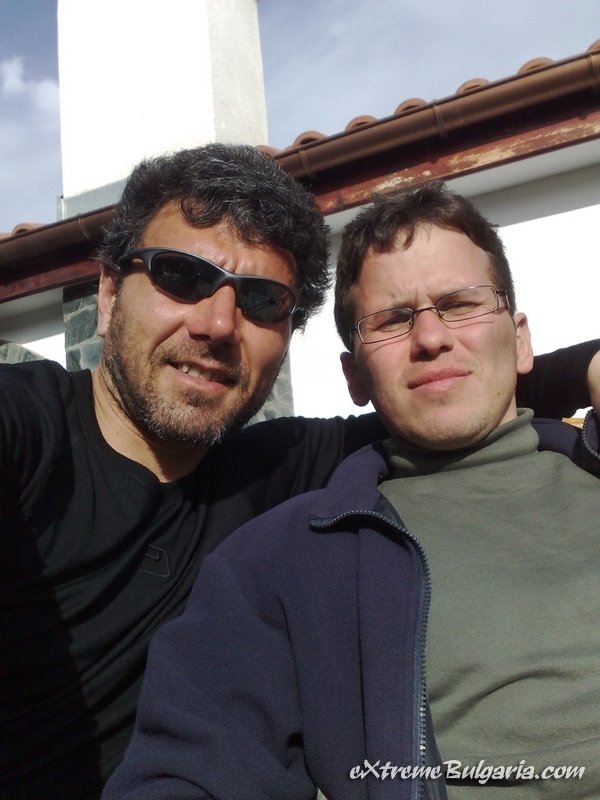 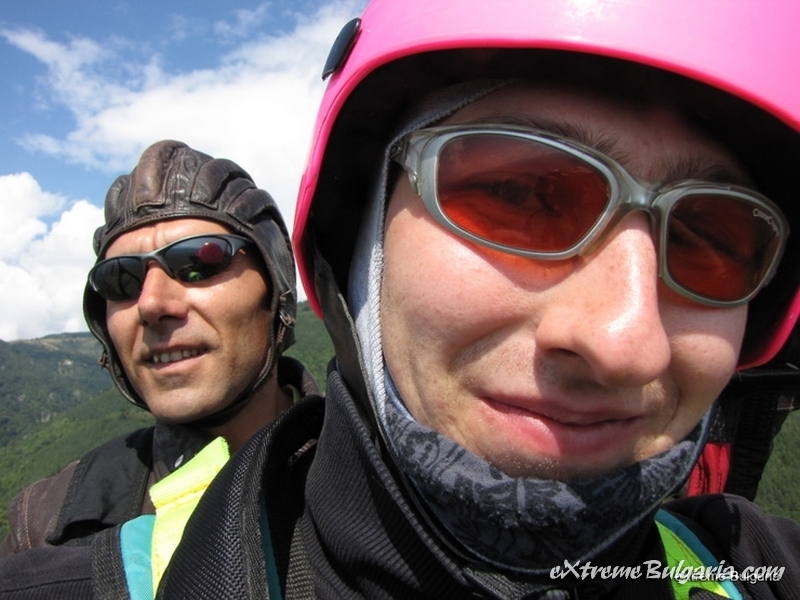 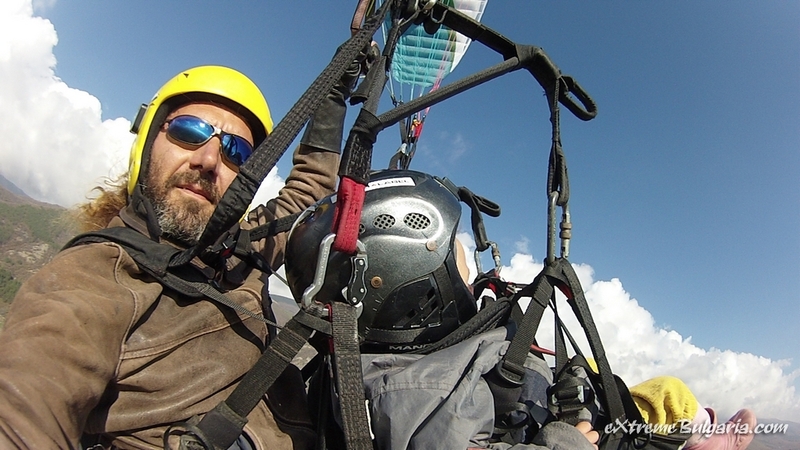 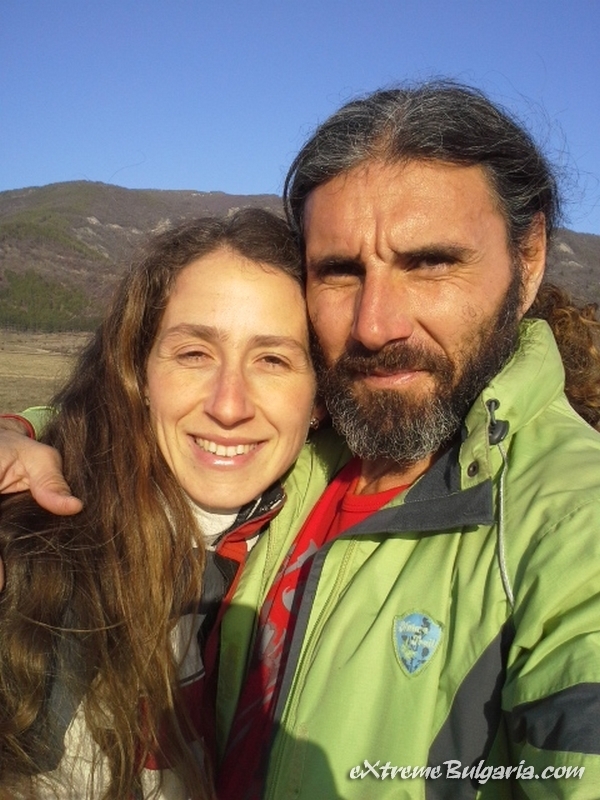 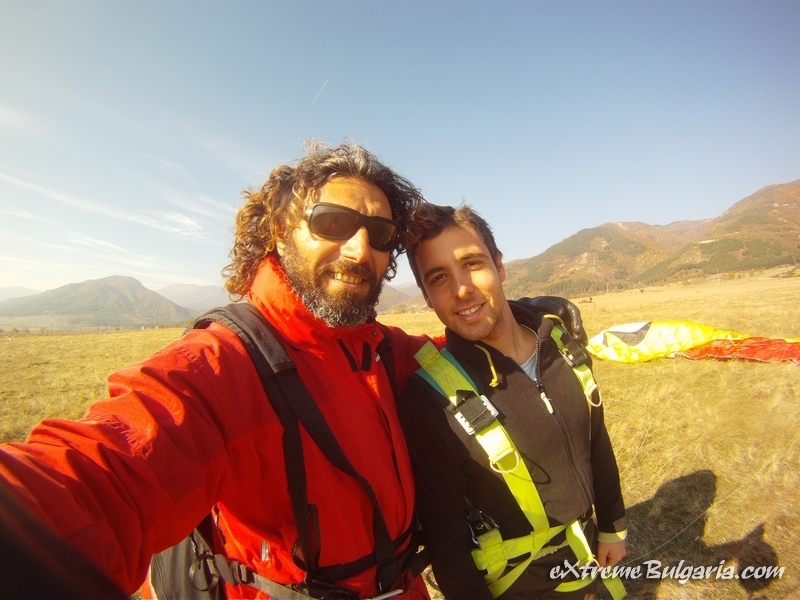 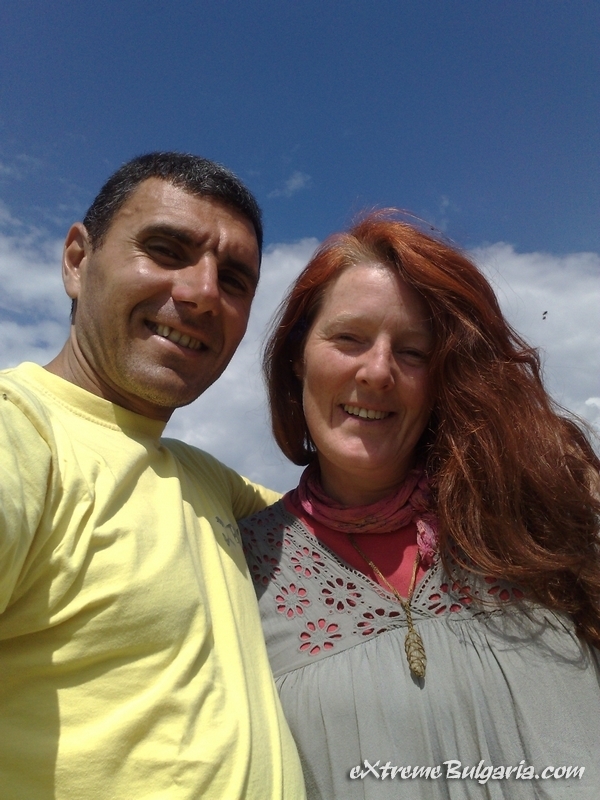 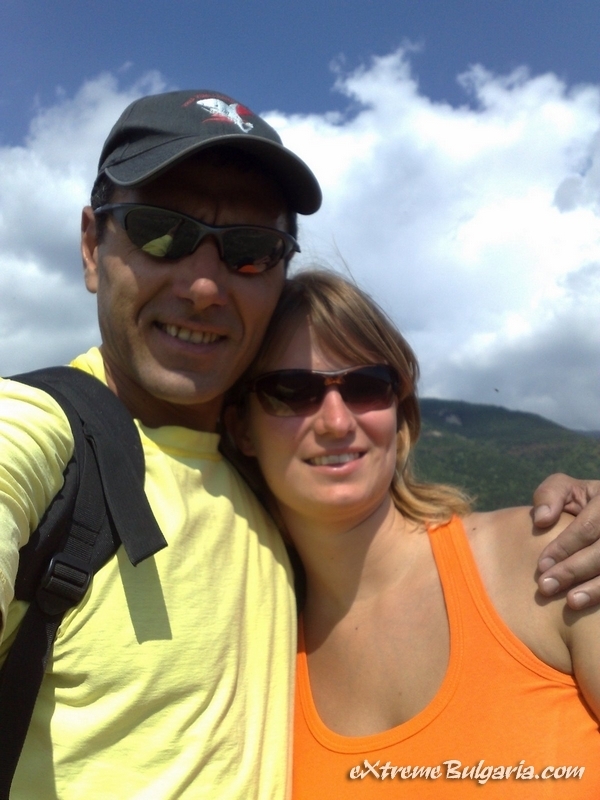 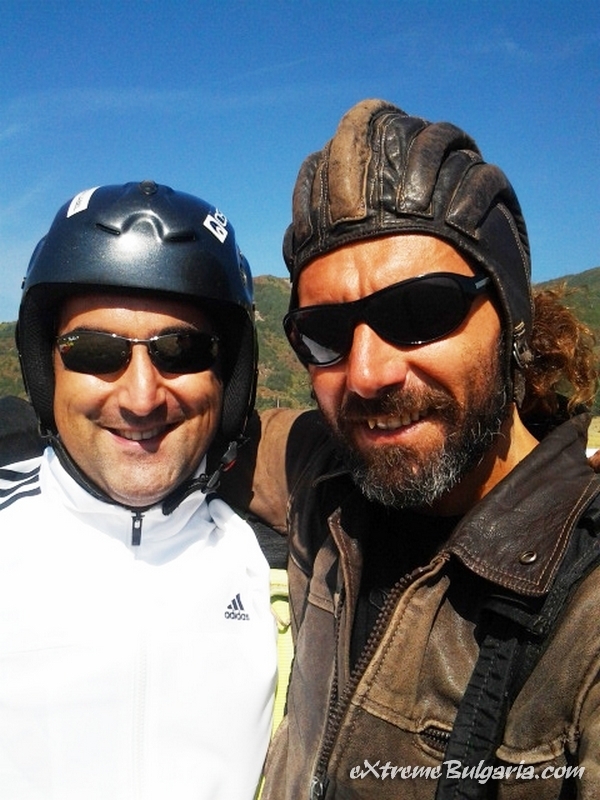 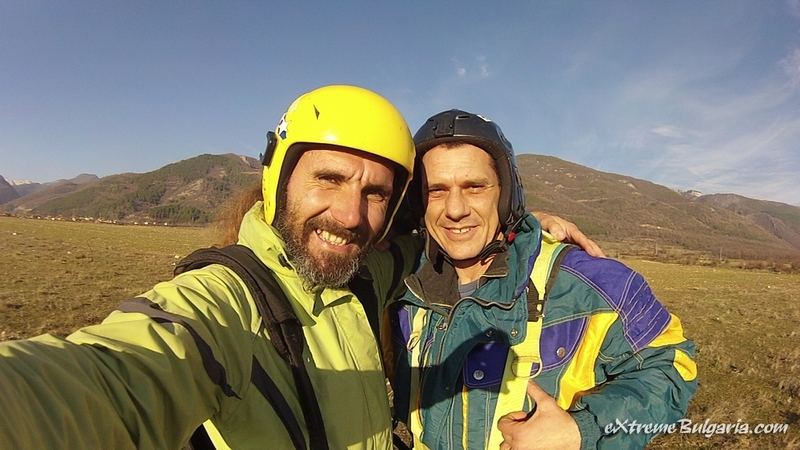 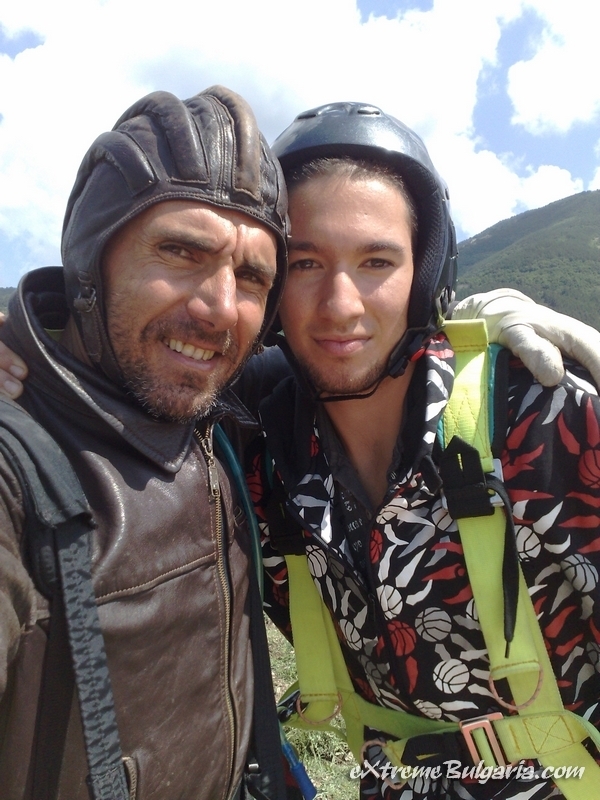 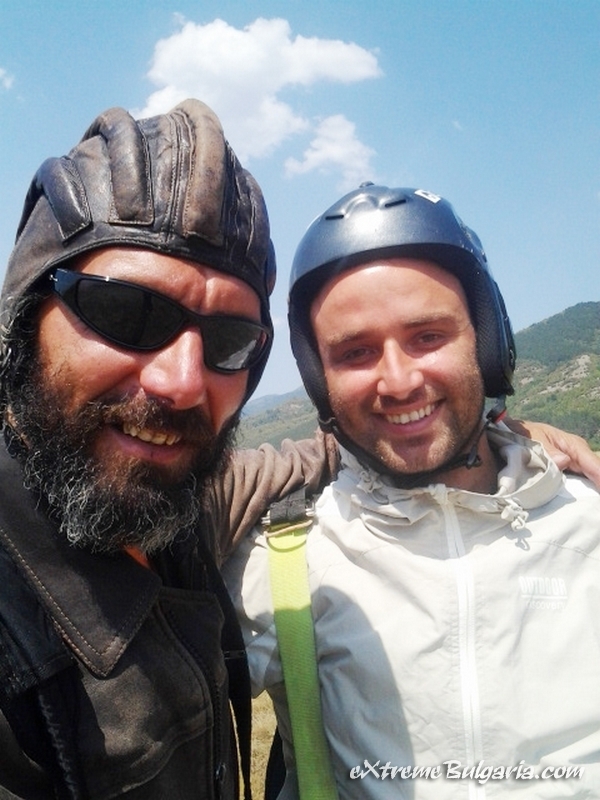 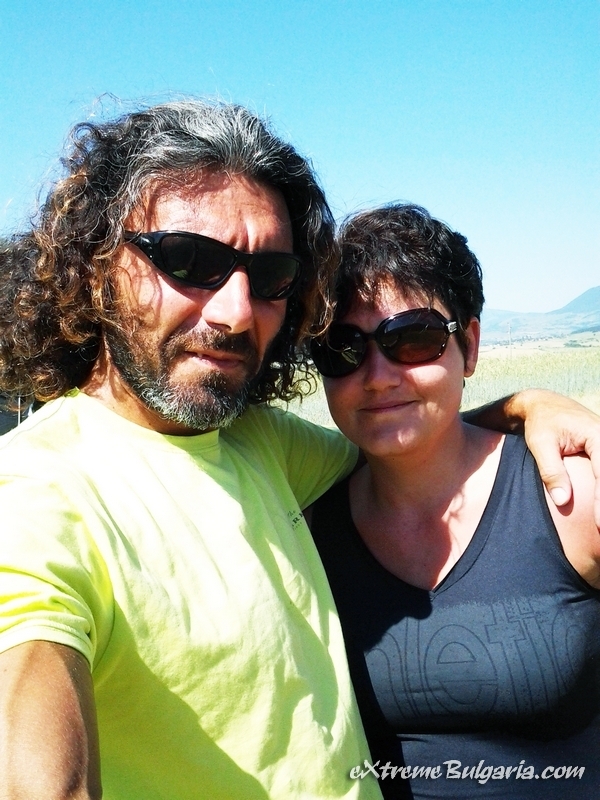 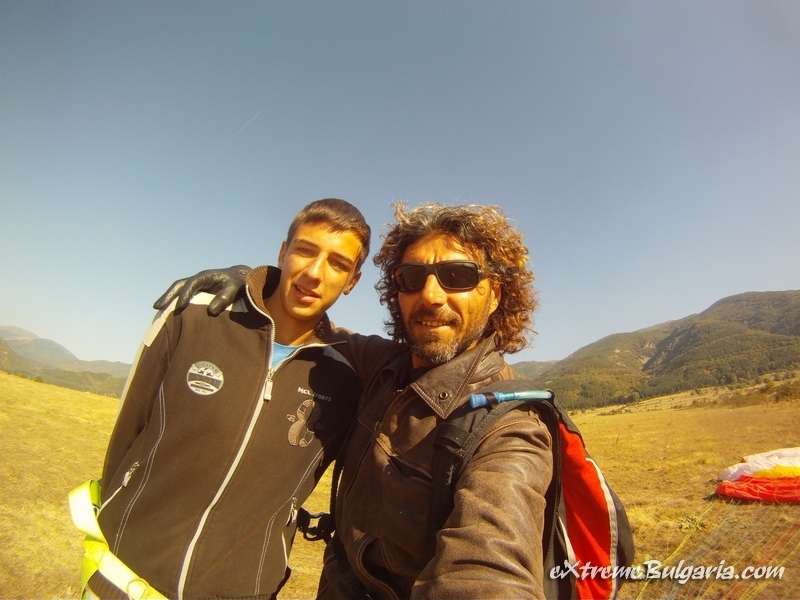 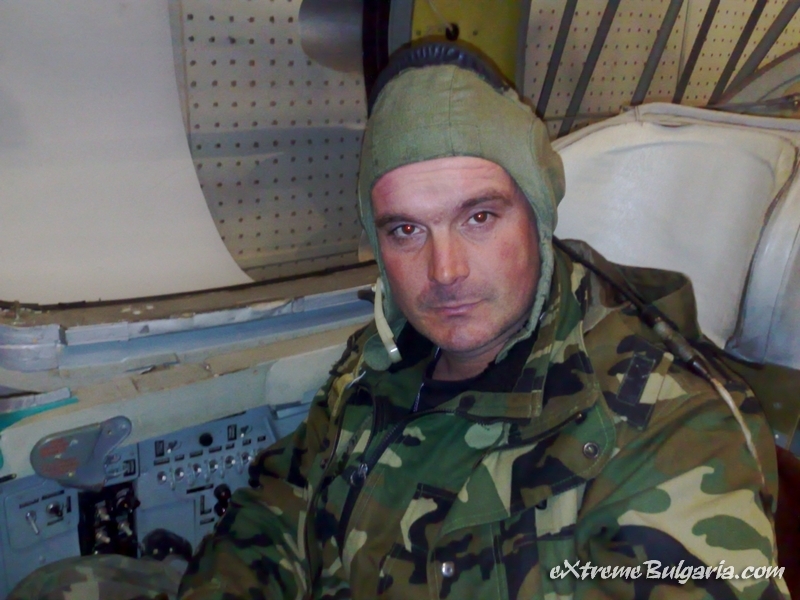 Atanas Koev is a jet fighter and paraglider pilot, an experienced climber and hiker, a skilled kayaker, skydiver, ATV instructor, travel guide, speleologist and off-road navigator. 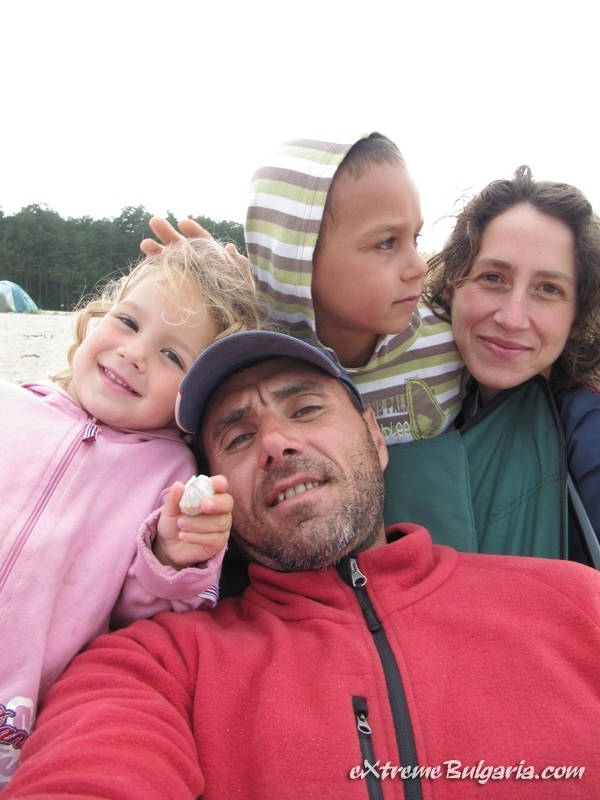 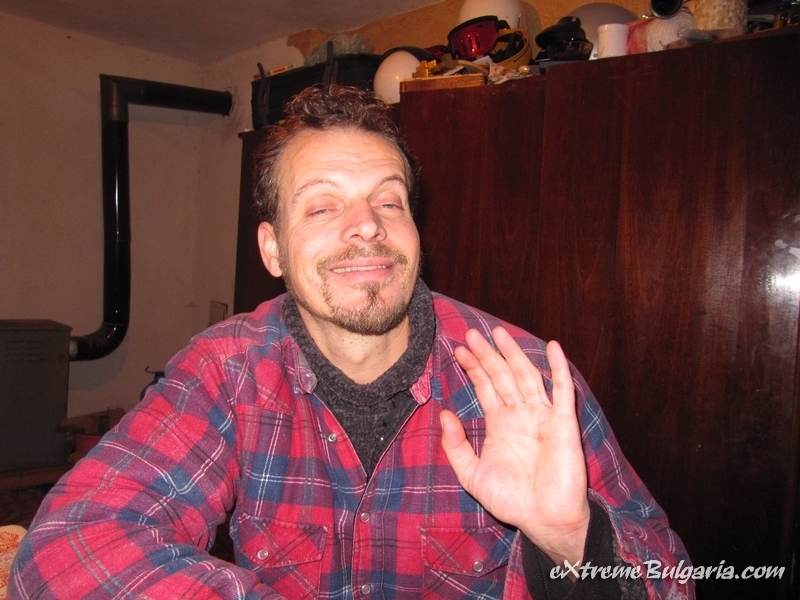 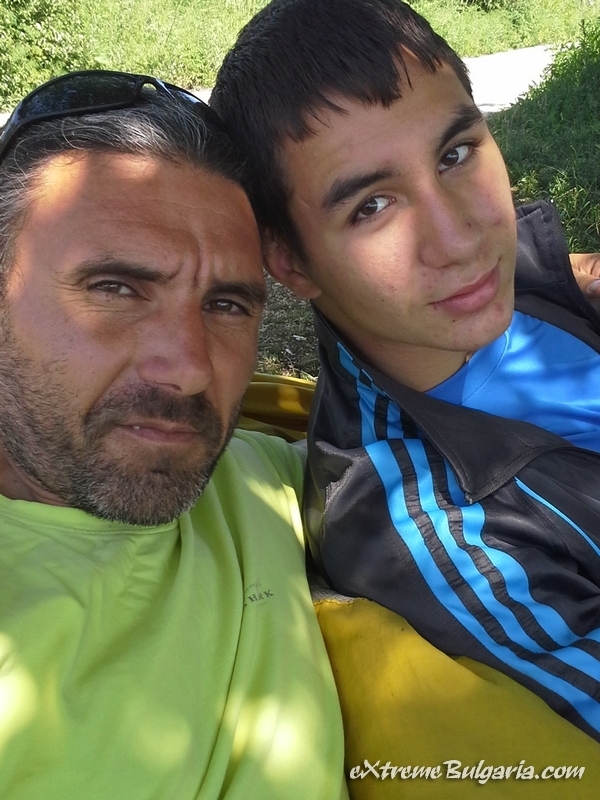 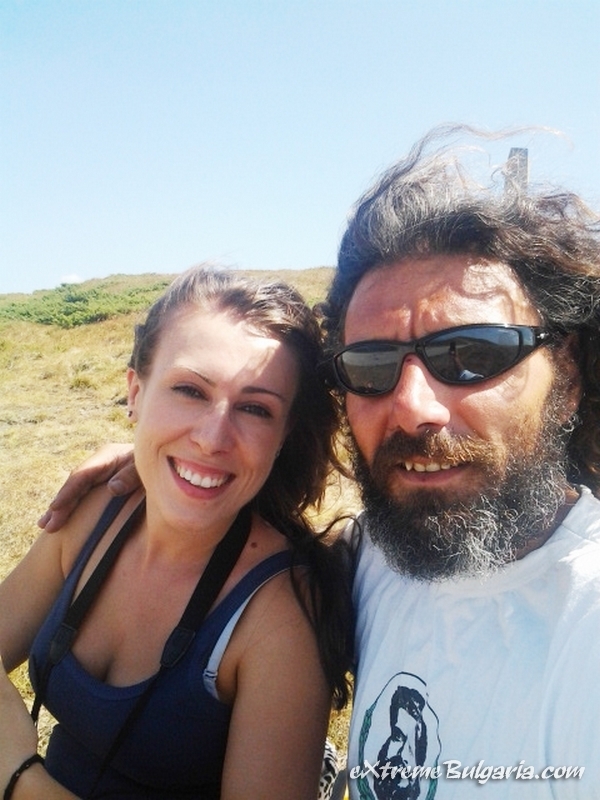 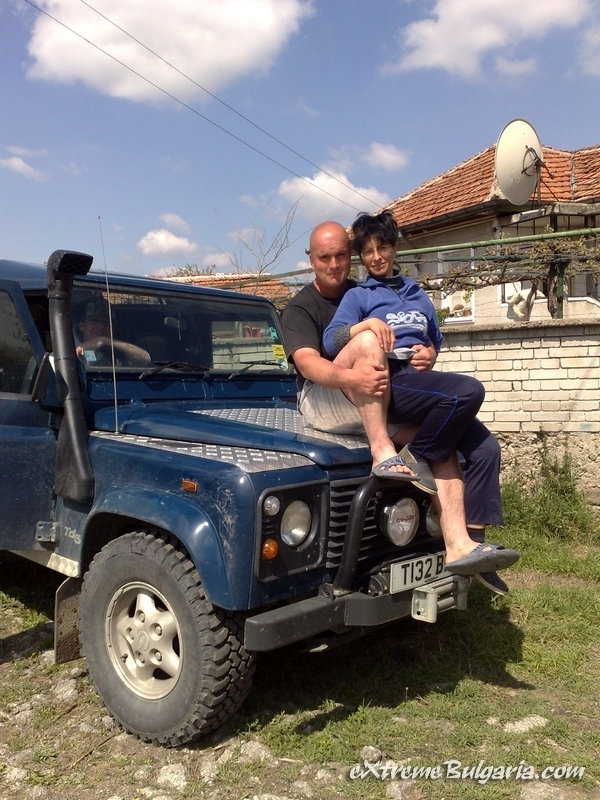 He is also a happy peace-loving person who can’t get enough of the beauty of the Bulgarian countryside and father of three lovely children whose lives must be full of exciting adventures and fun. 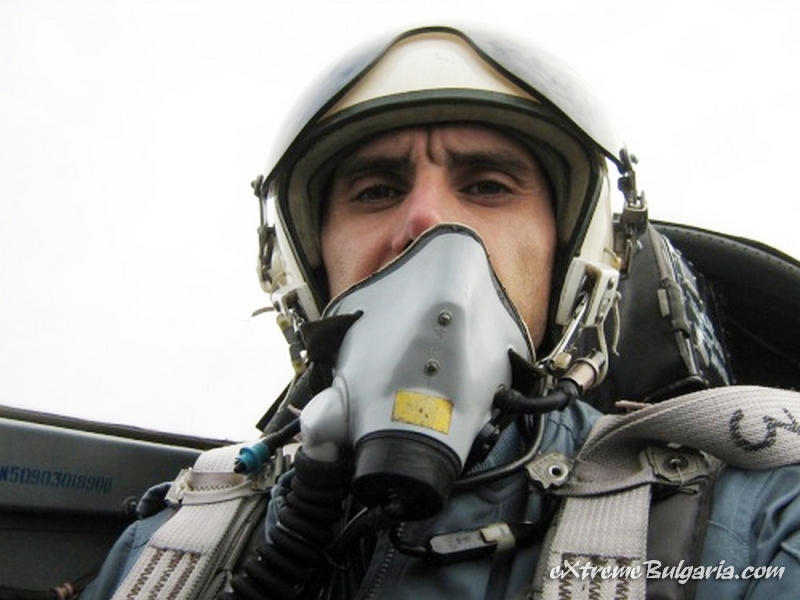 But above all he is a man who has managed to turn his dream into reality. 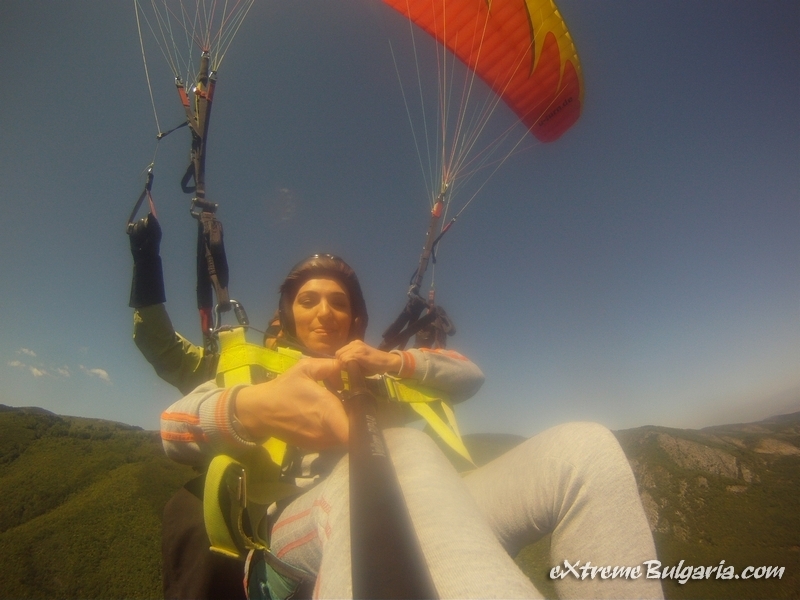 That dream is called Extreme Bulgaria. 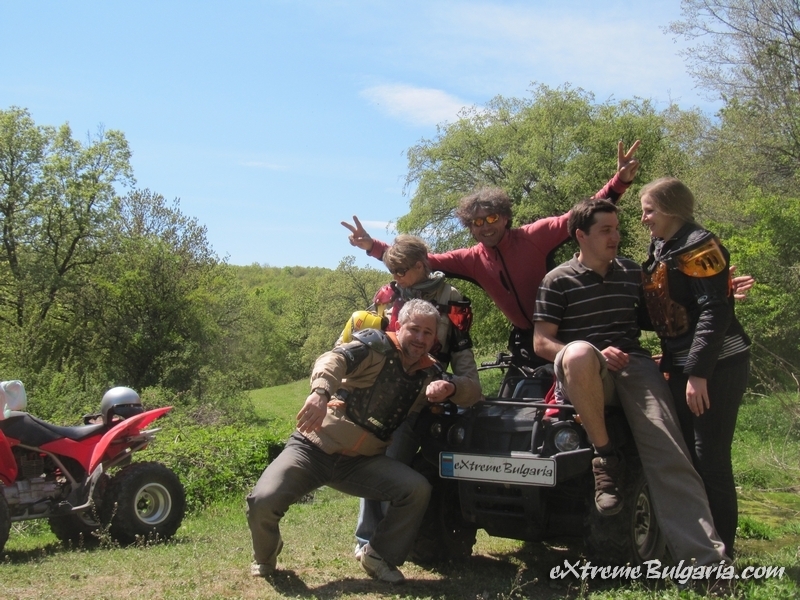 If you haven't time for the X-Week experience we suggest you join us for our X-Day! 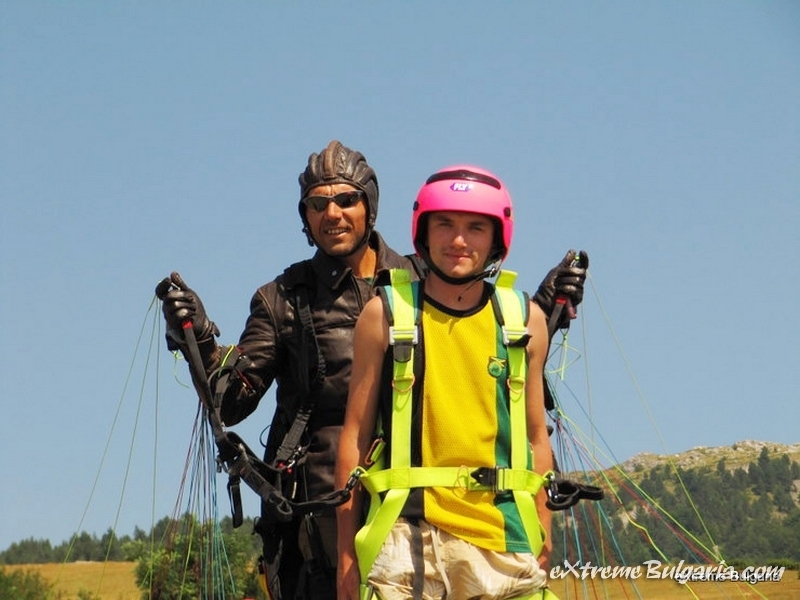 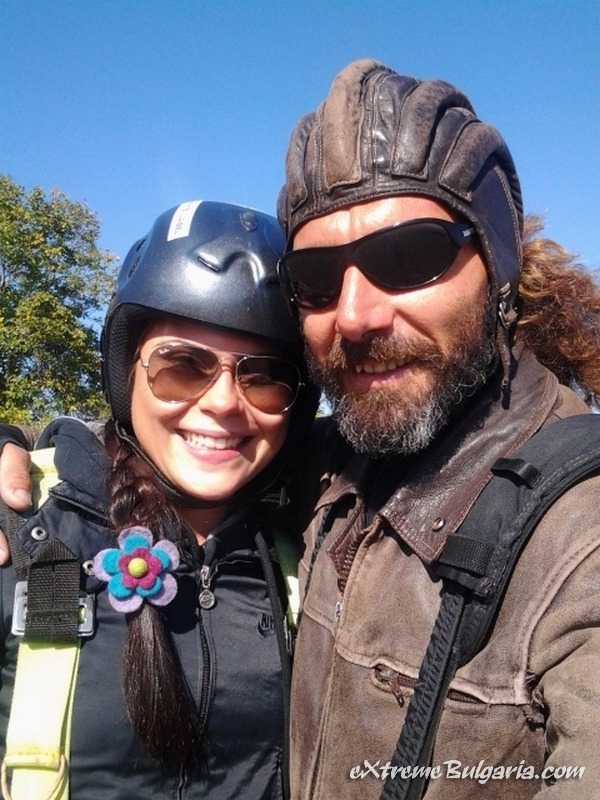 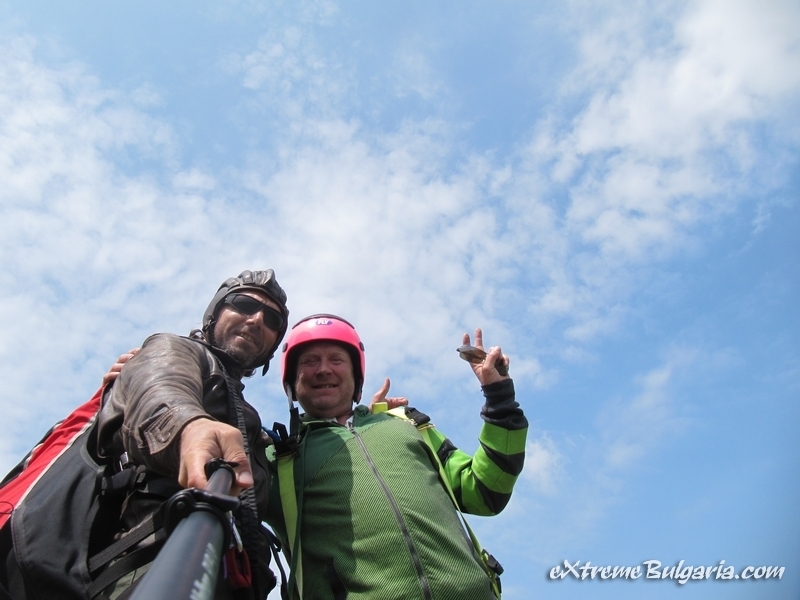 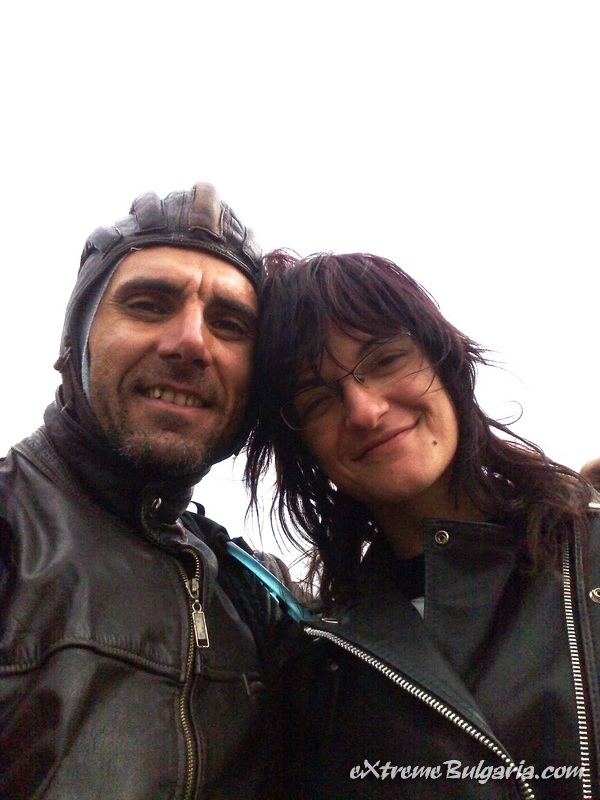 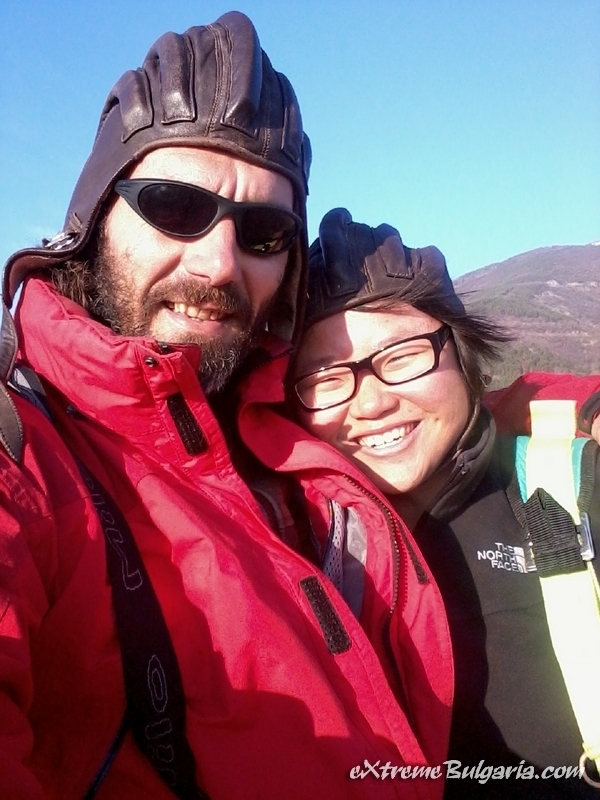 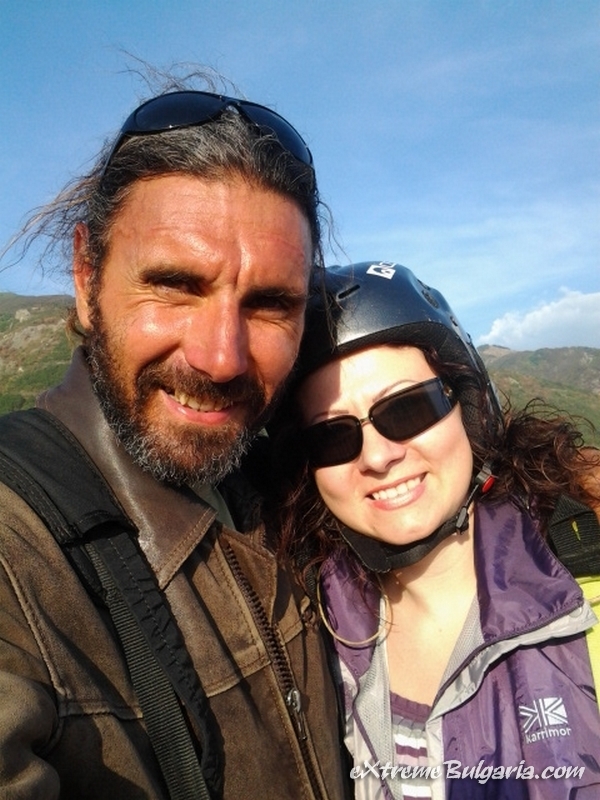 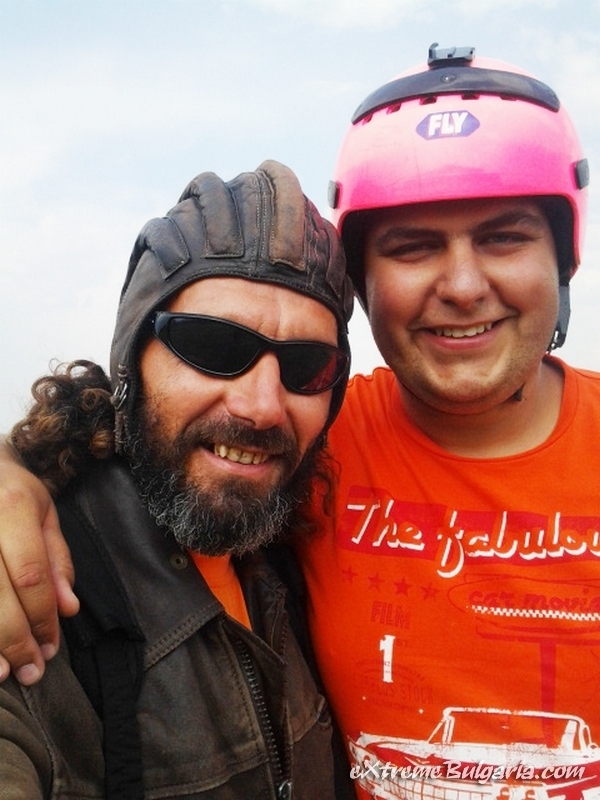 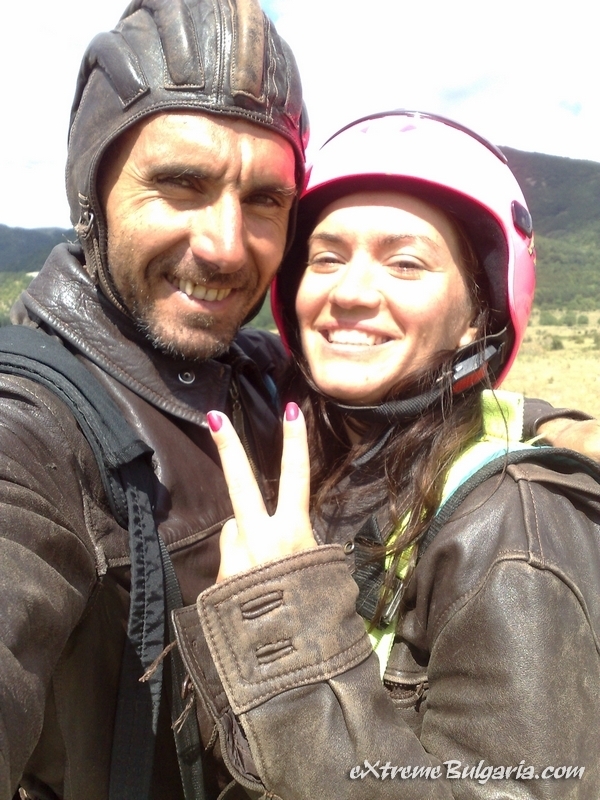 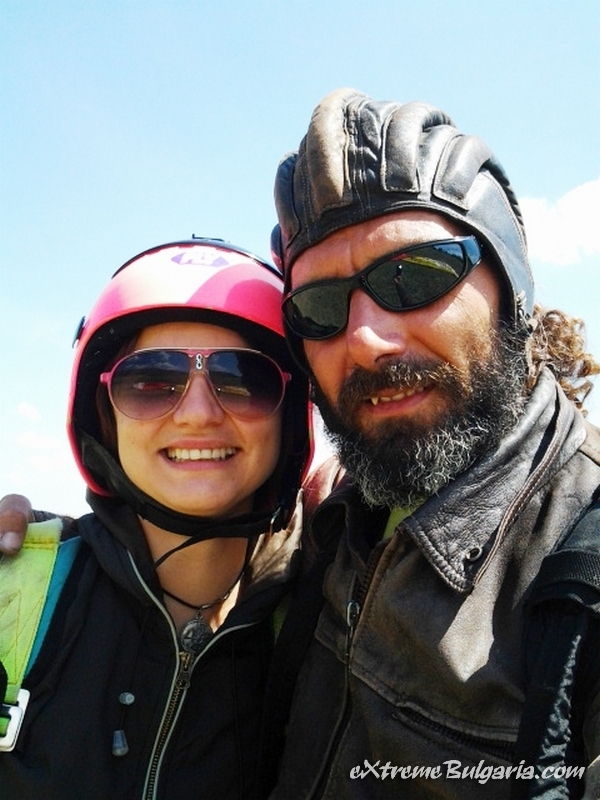 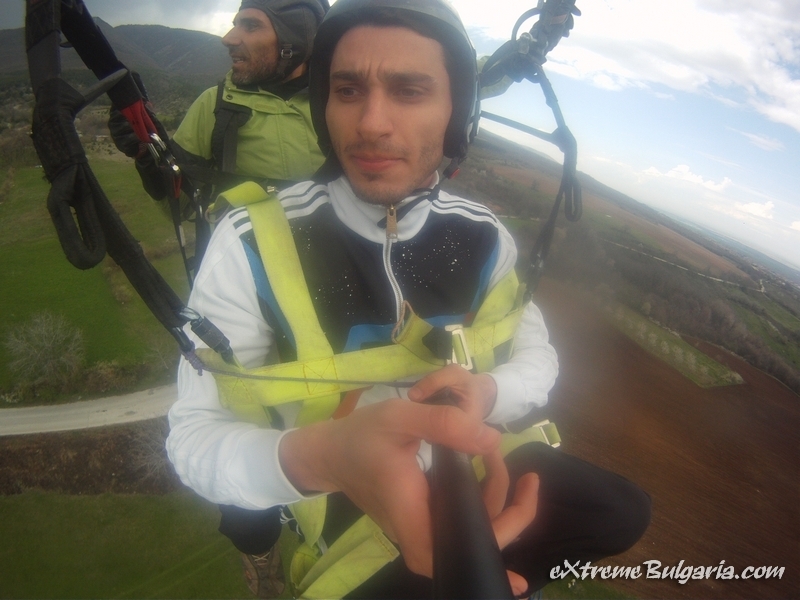 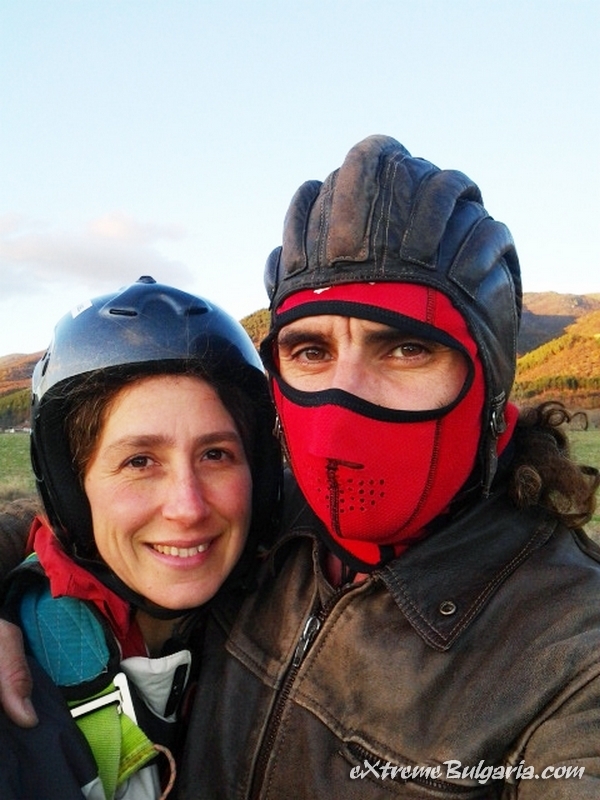 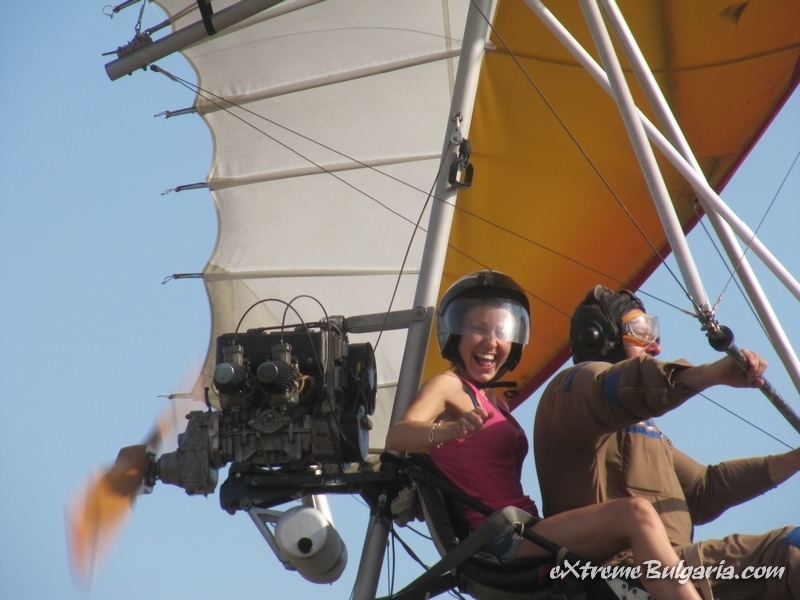 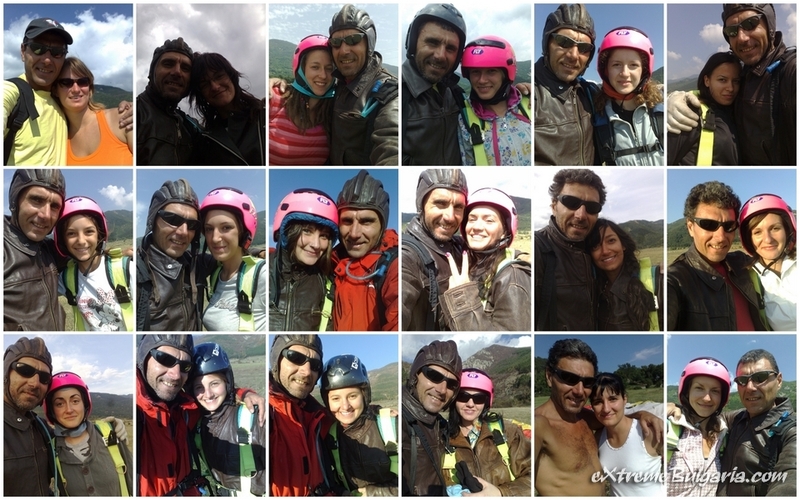 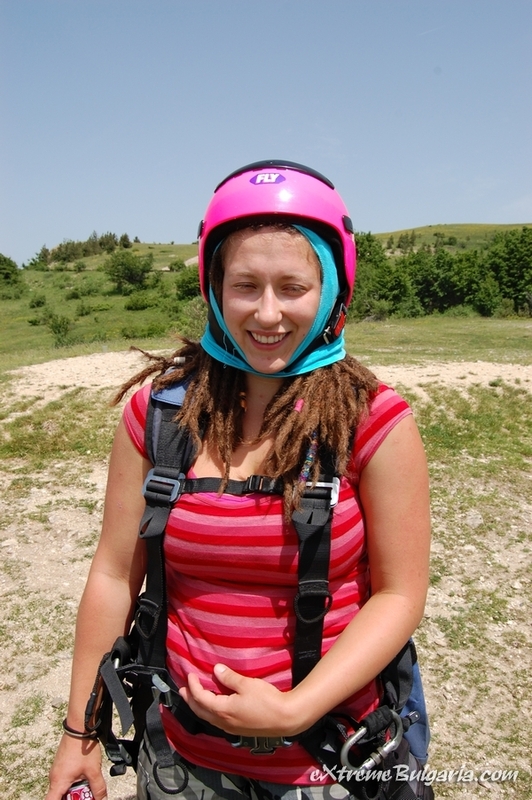 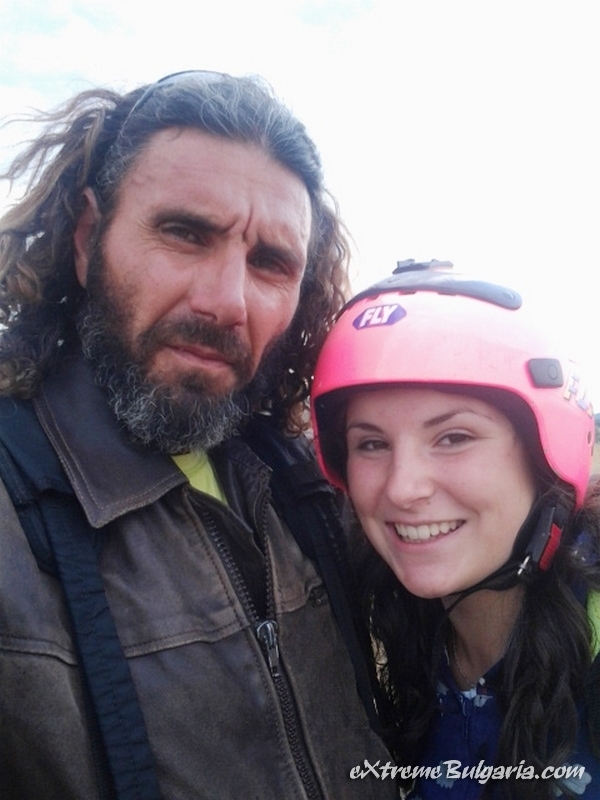 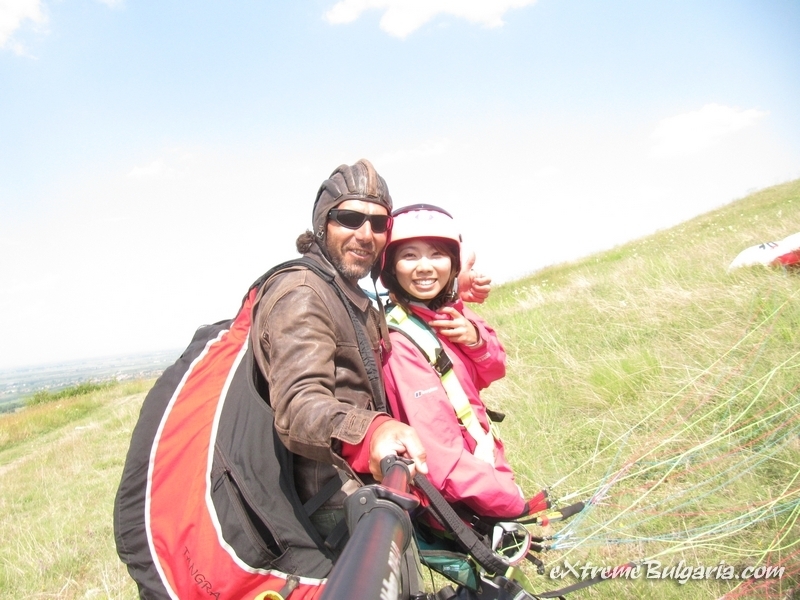 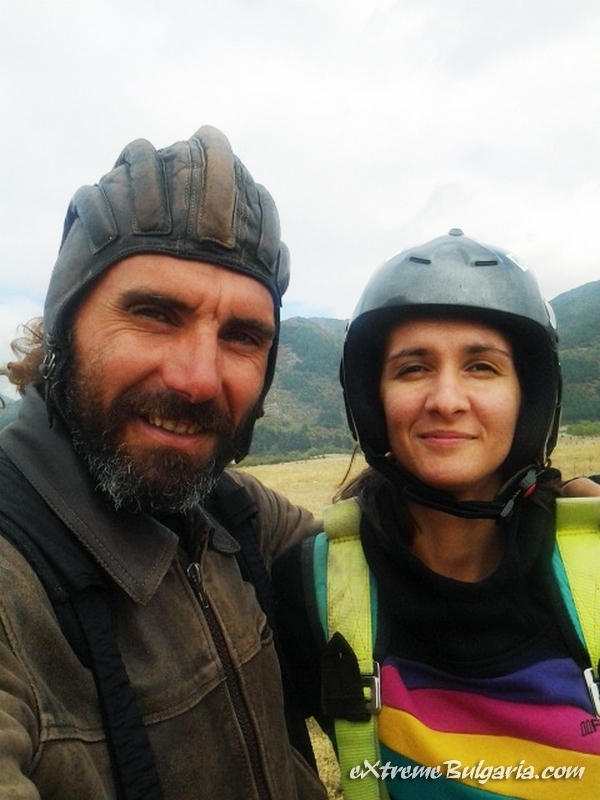 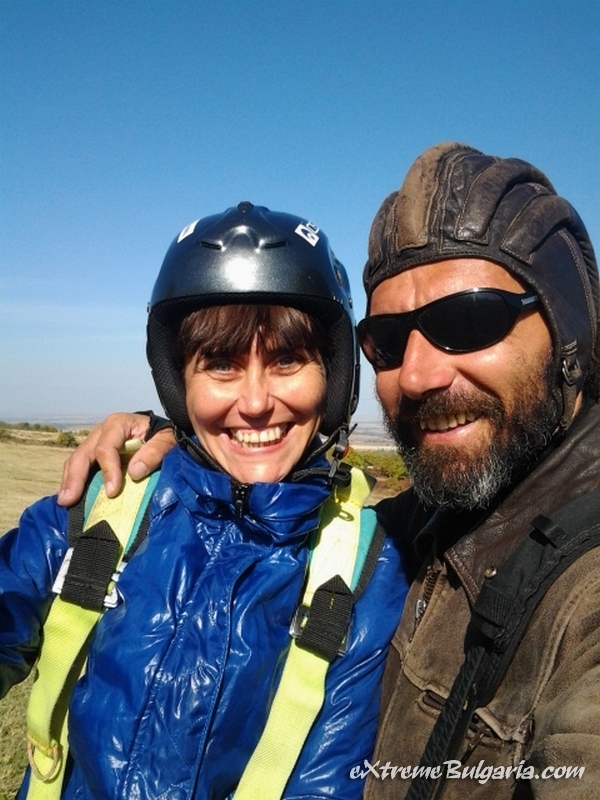 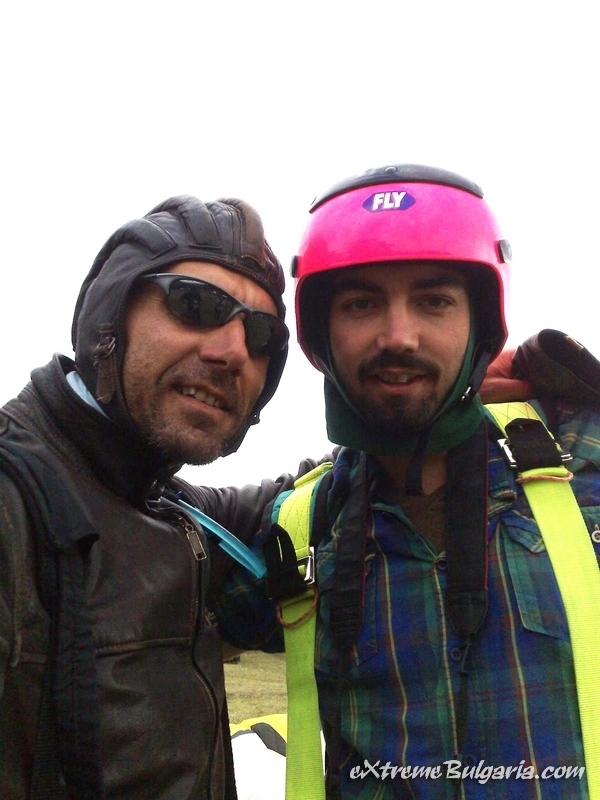 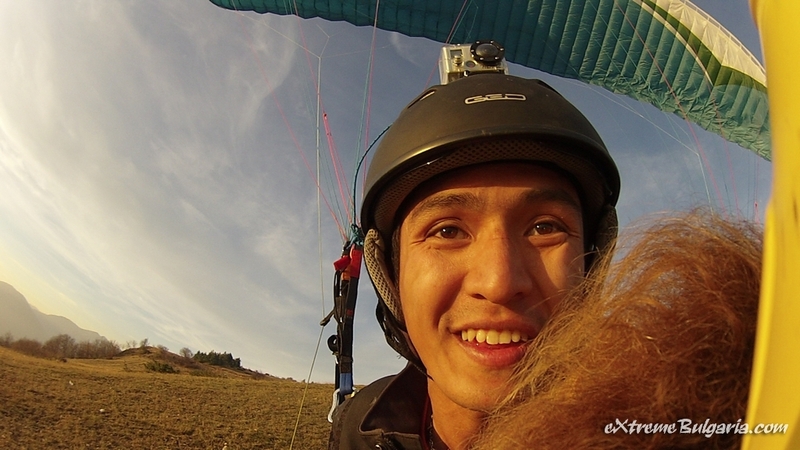 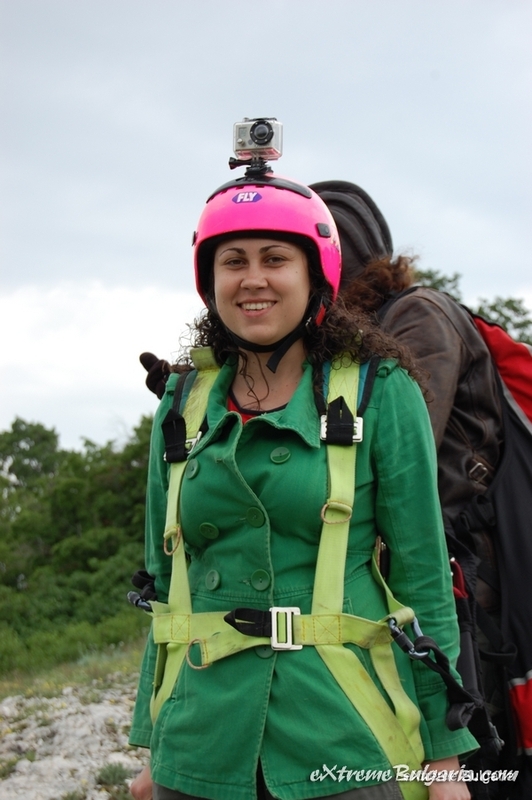 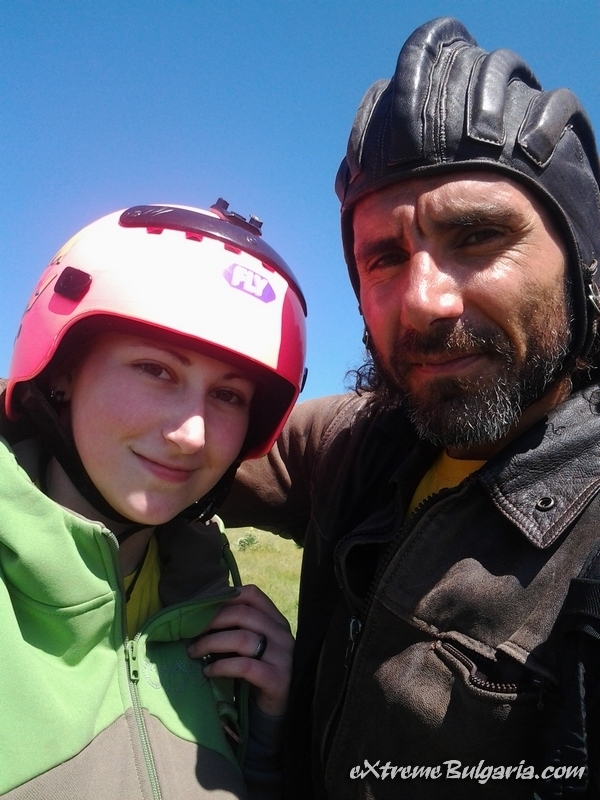 Tandem glide, bungee jumps and wild bike riding in one day! 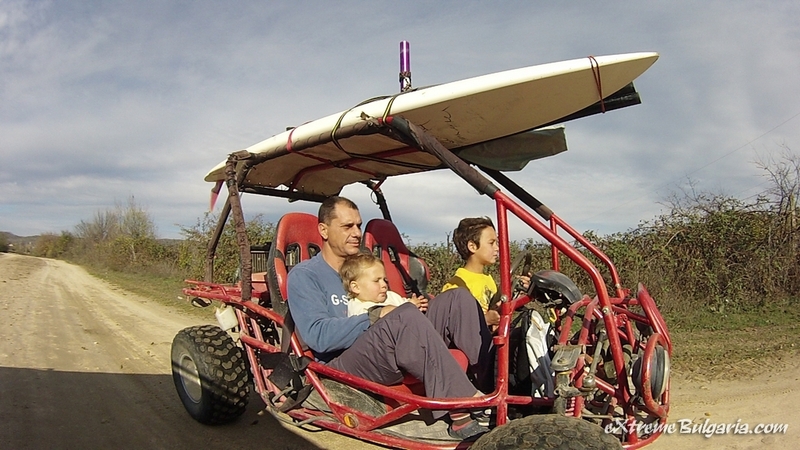 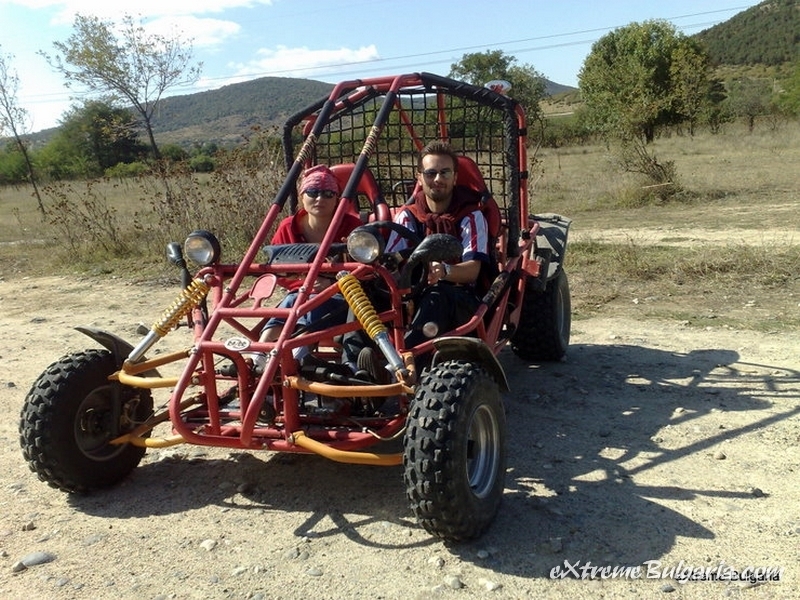 Or motorised Hang-gliding, clay pigeon shooting and off-road buggy/ATV trips! 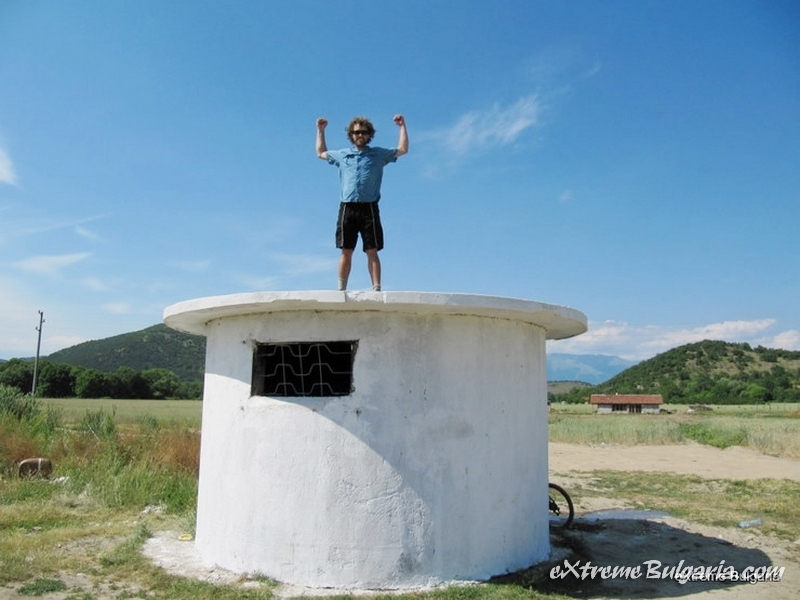 I'm on the pIanet Earth, Eastern Europe, Bulgaria- the small Eden of the Balkans, with 36 absolutely different Mountains, lots of hot mineral water springs and hundreds herbals... 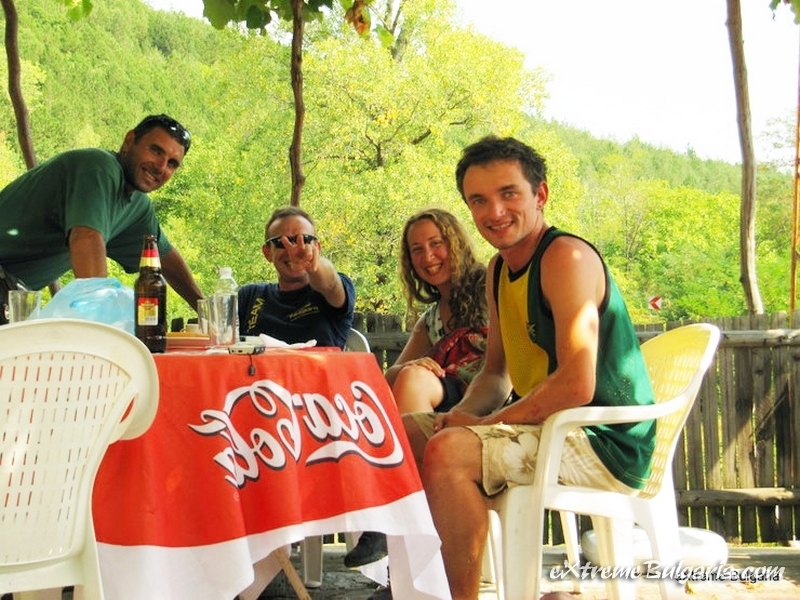 The food here still has a taste:) Welcome to Ivan Vazovo village like hundreds all over the world! 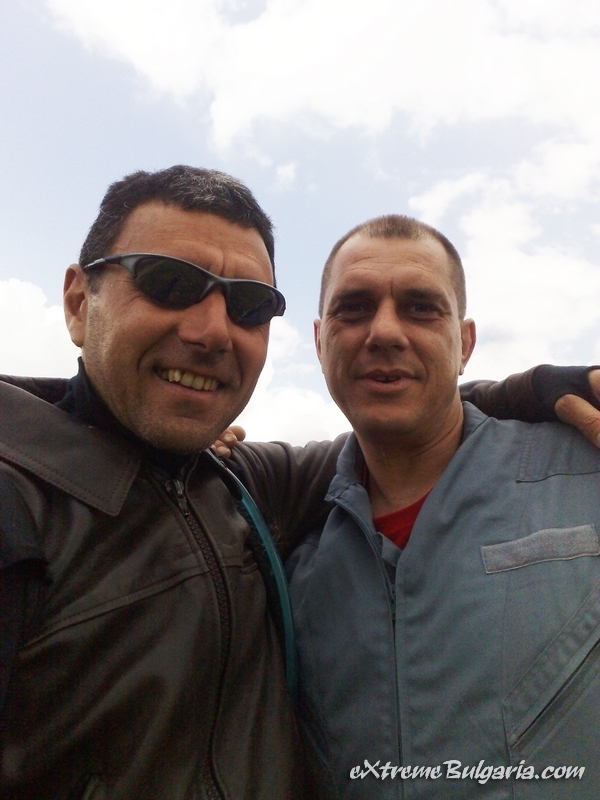 A new offer for the old friends! 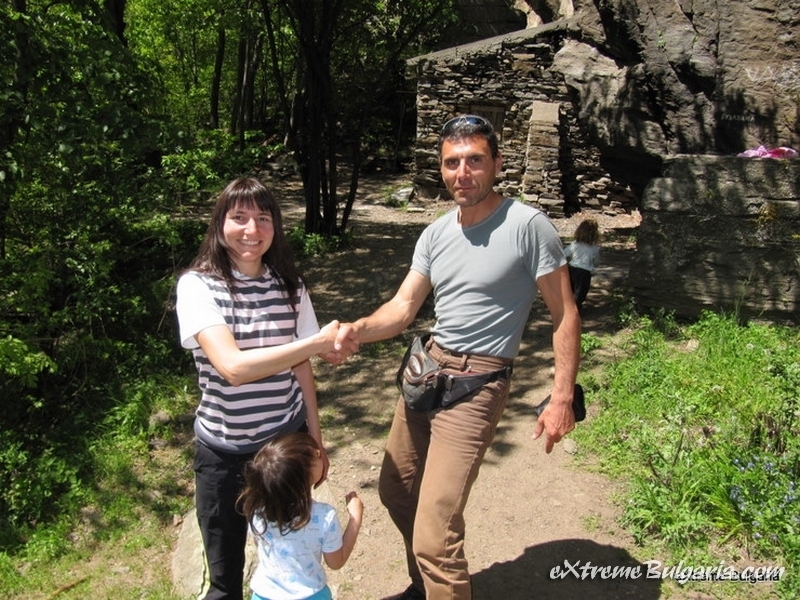 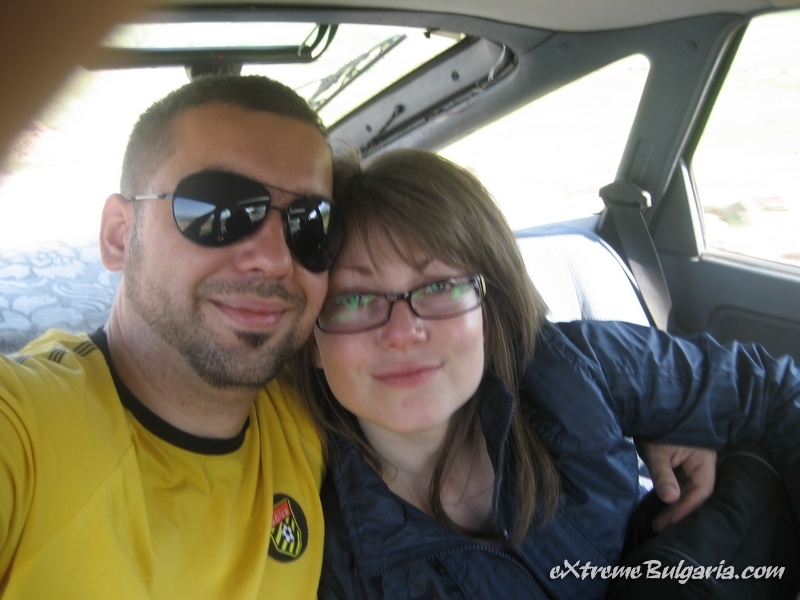 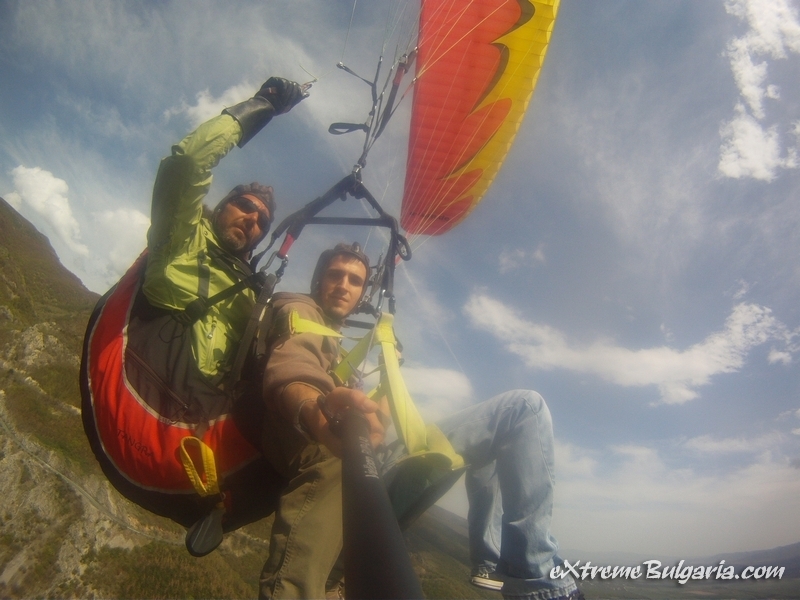 The newest offer of eXtreme Bulgaria club is for our old friends from all over the world! 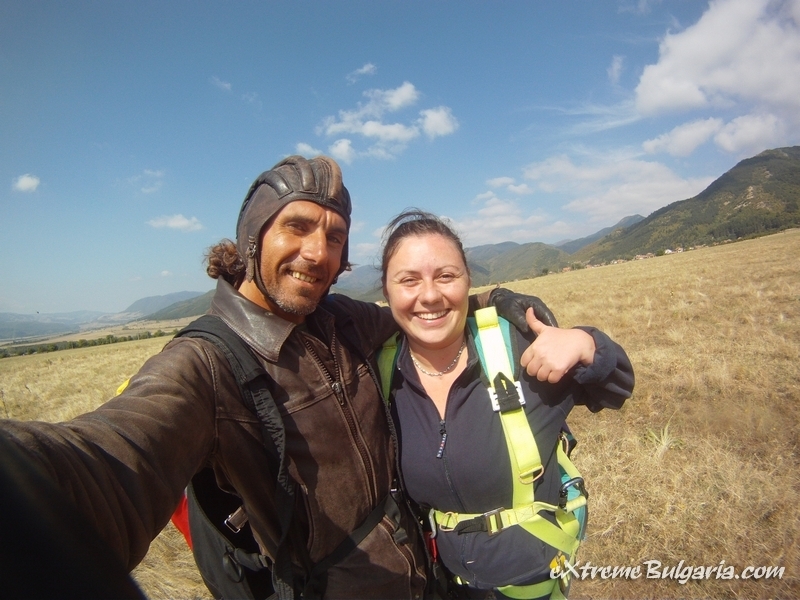 We know that many of you are far-far away from Bulgaria but you have a reason to turn back at soon as possible to have new adventures with us! 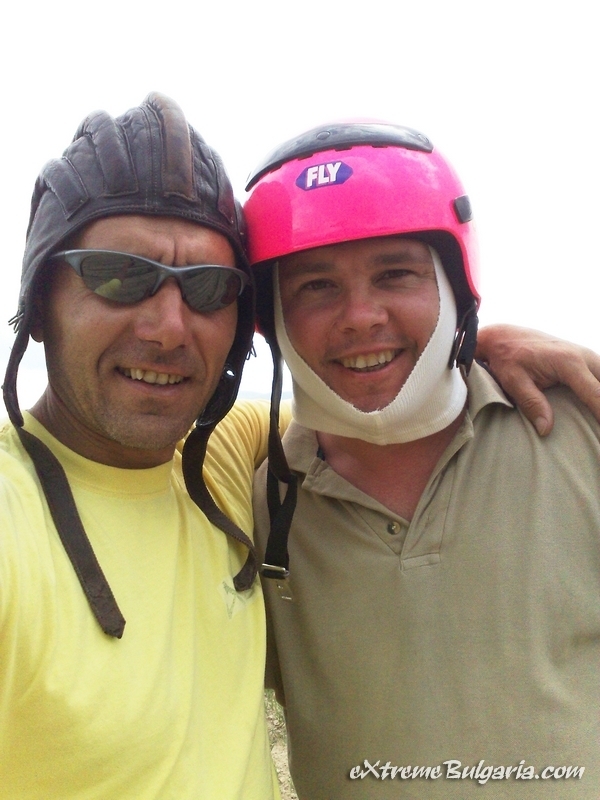 Come to use your free flight with plane. 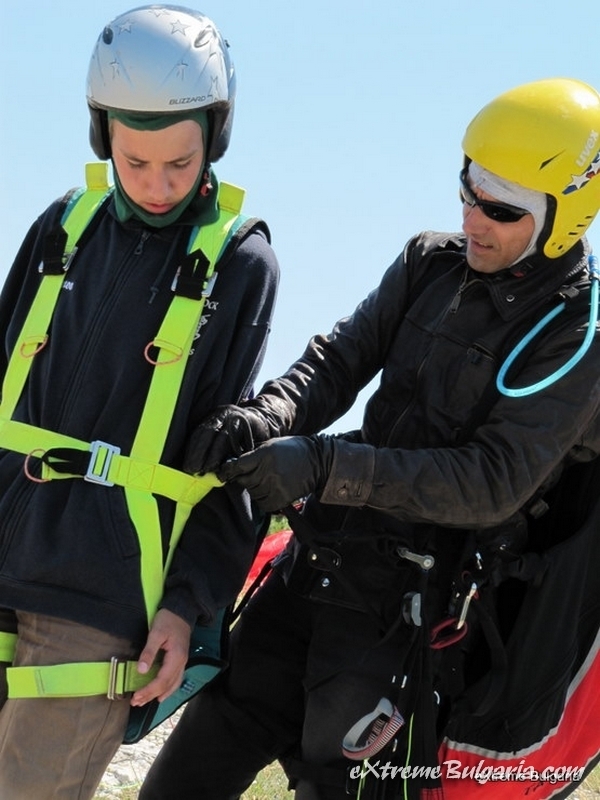 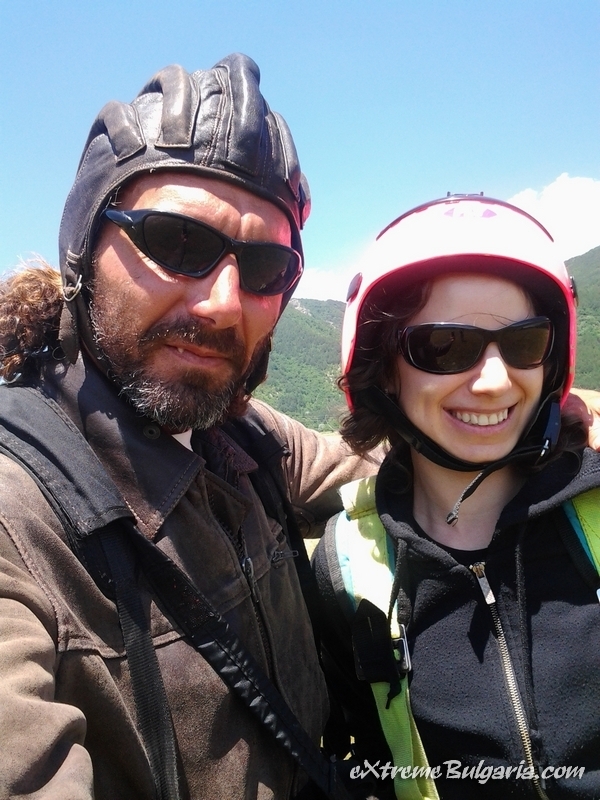 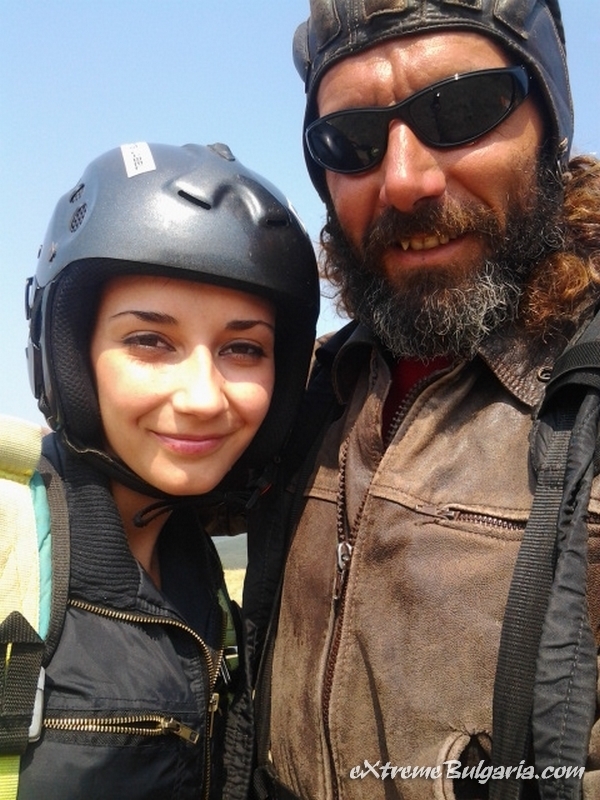 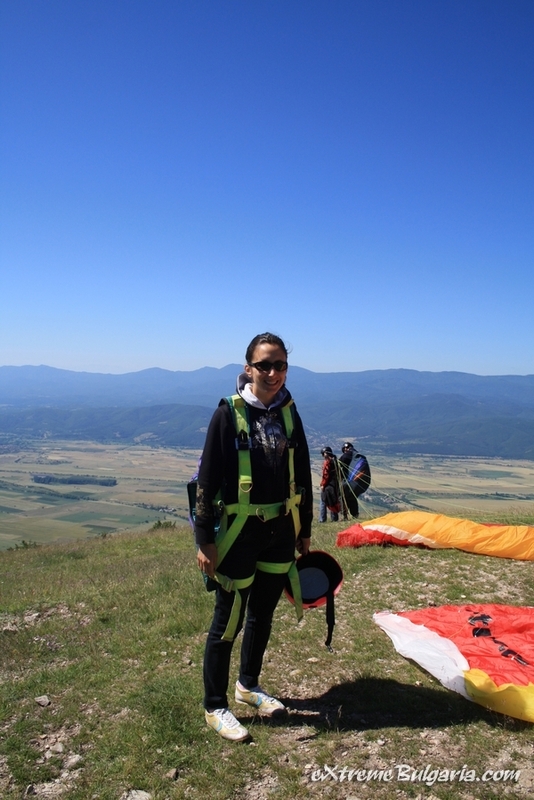 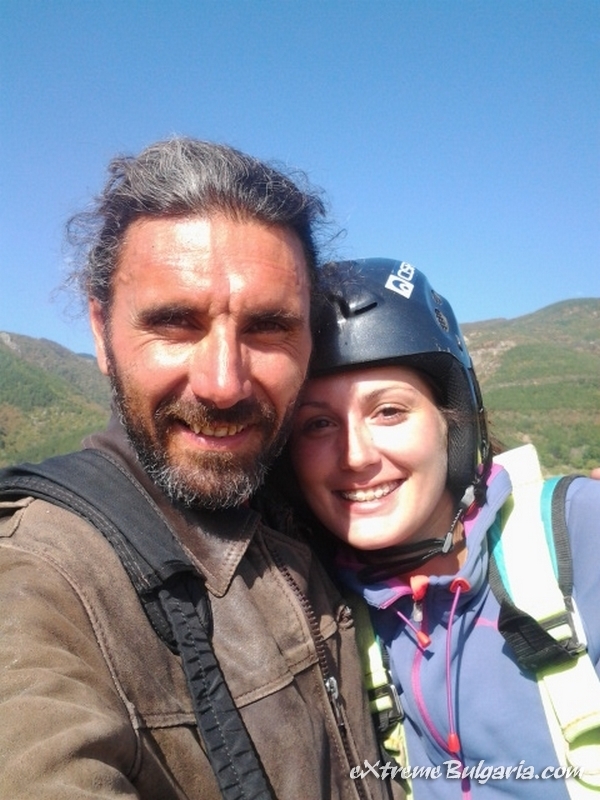 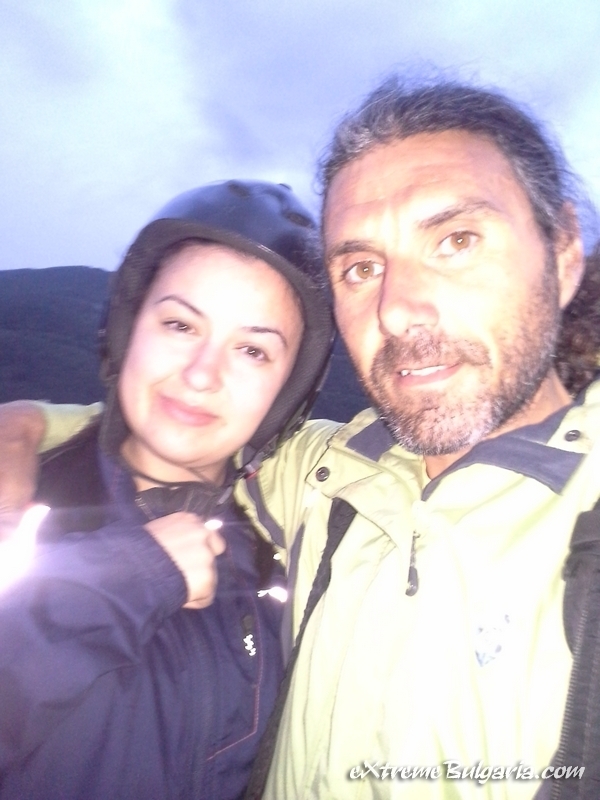 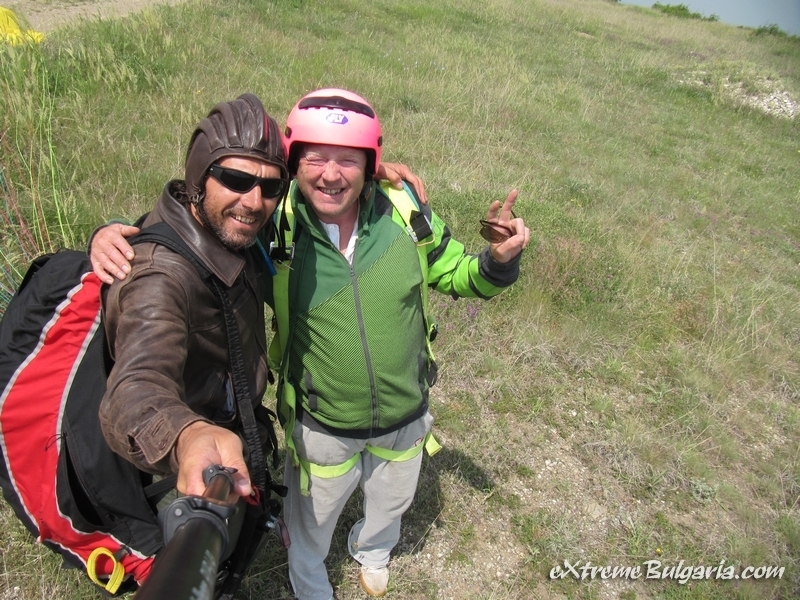 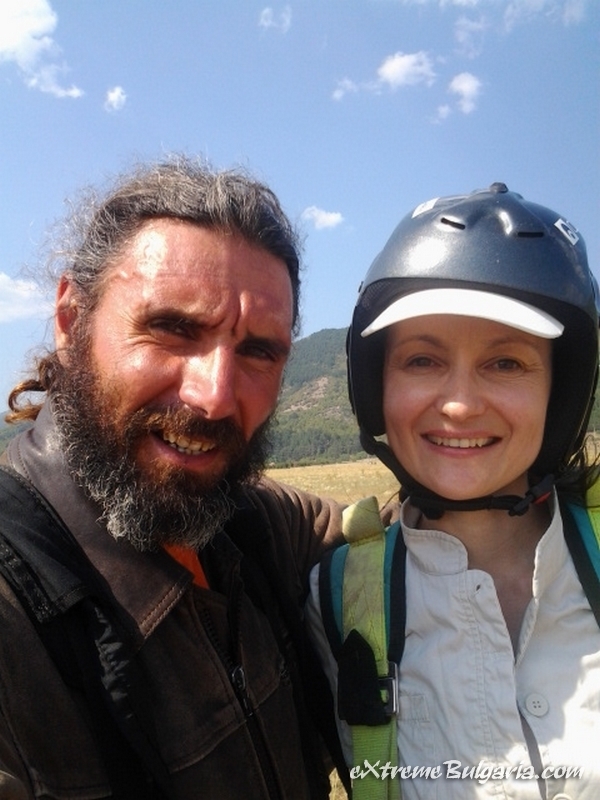 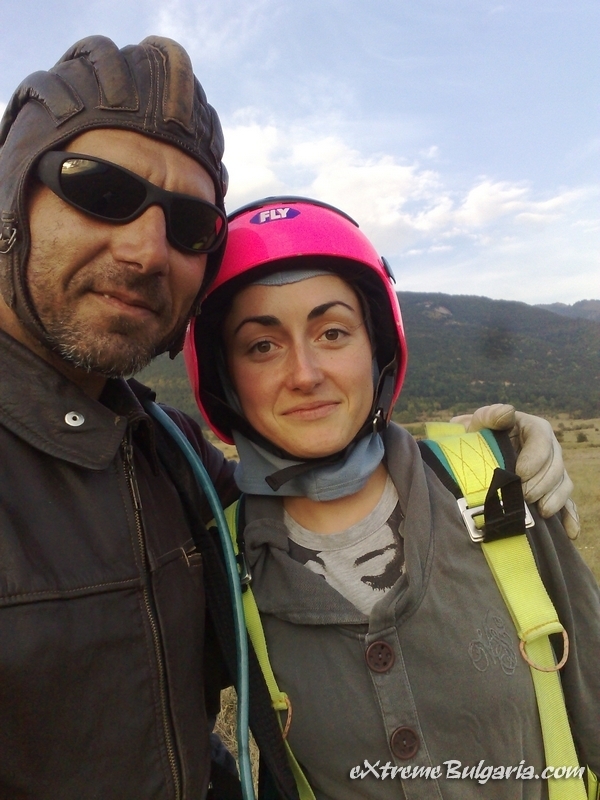 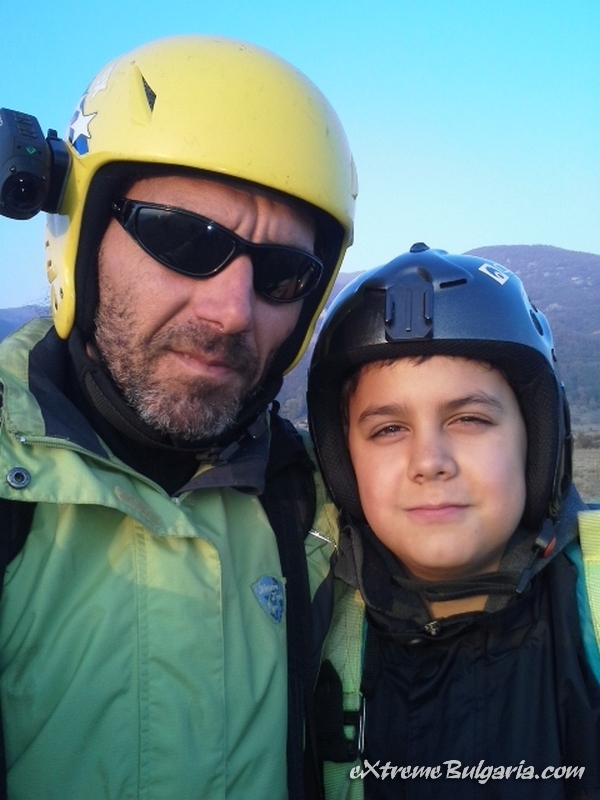 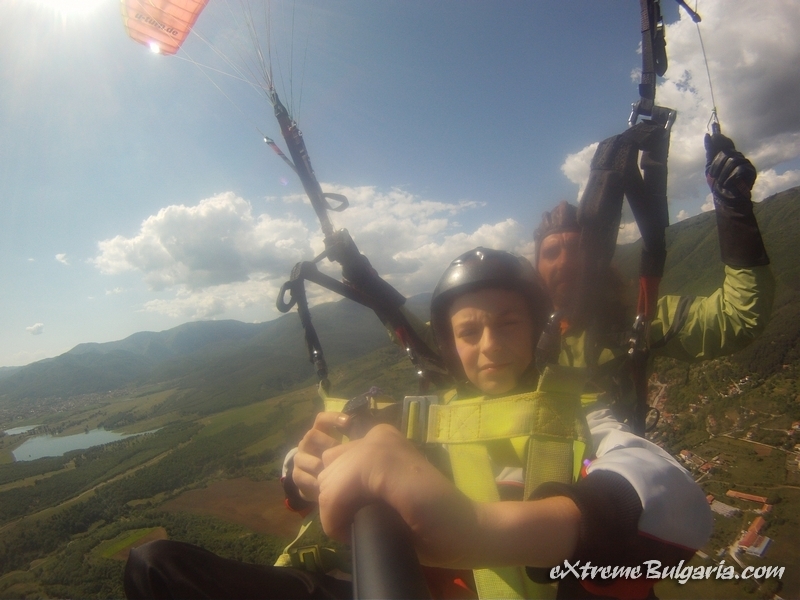 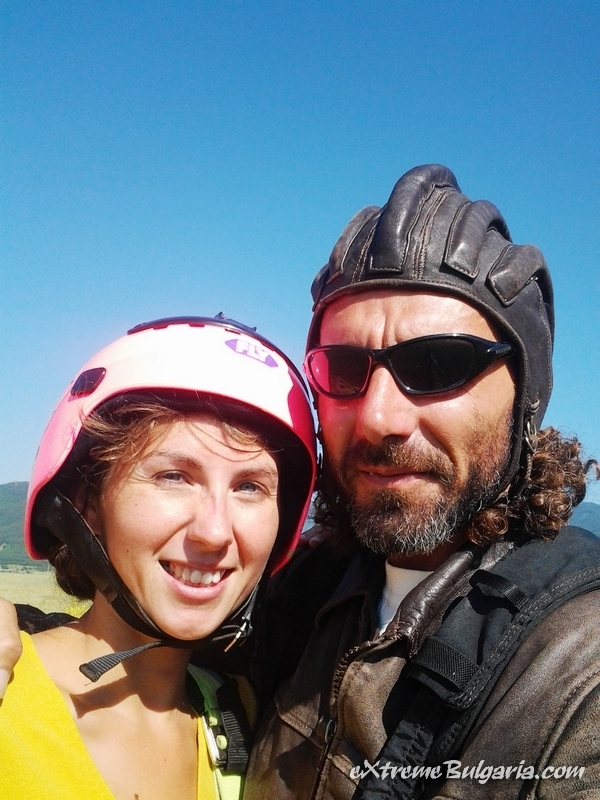 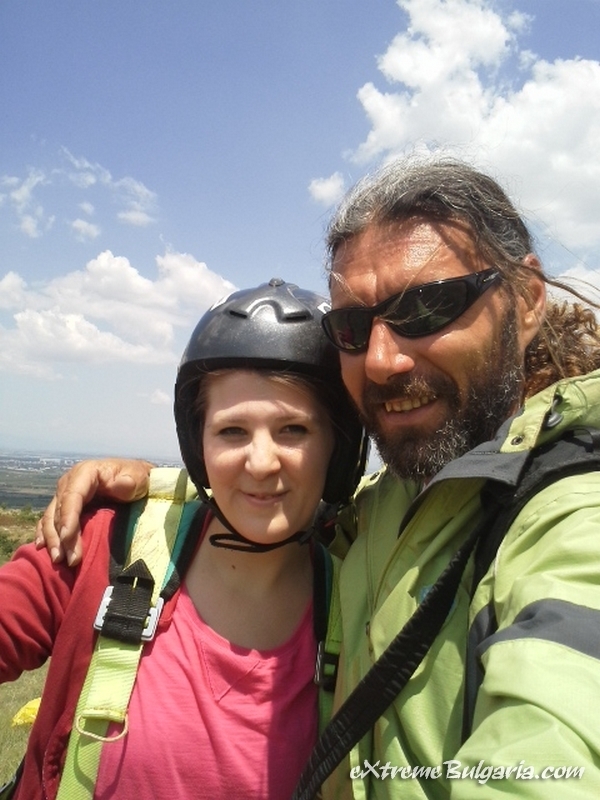 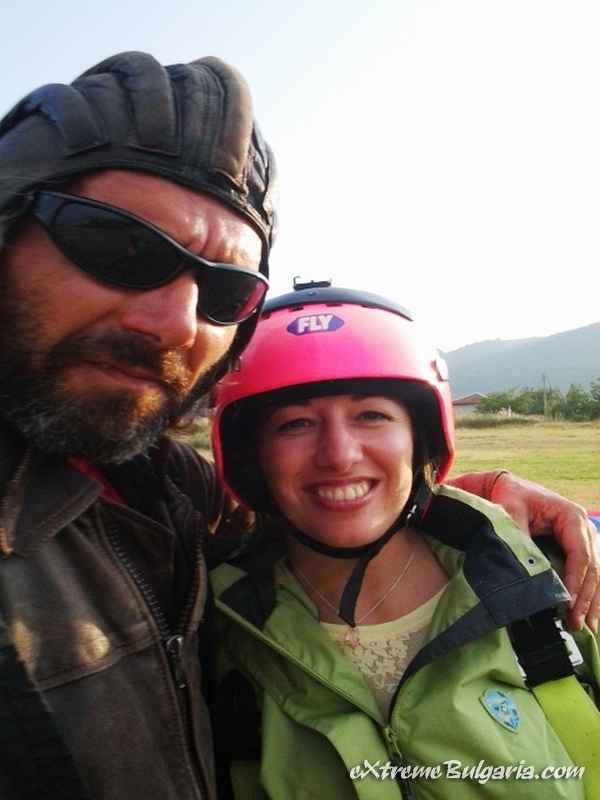 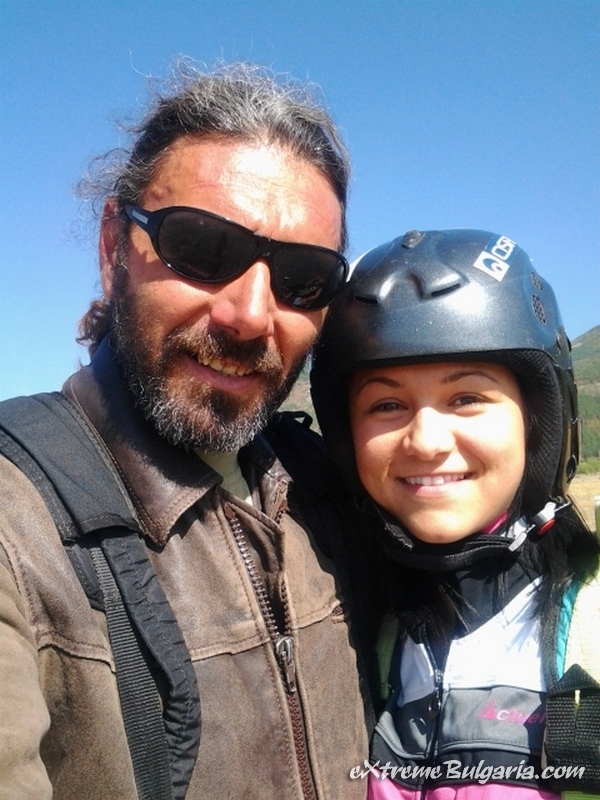 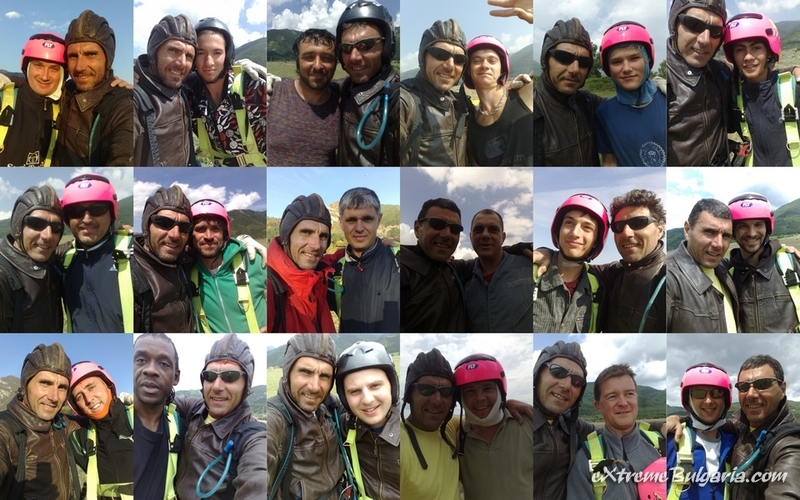 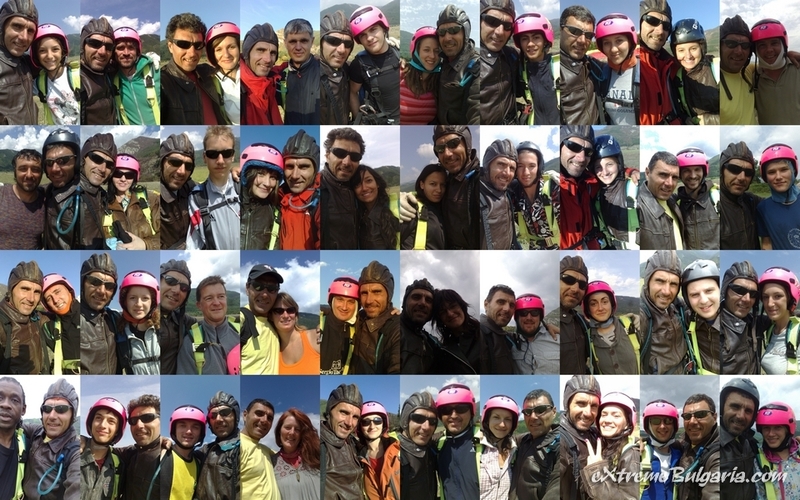 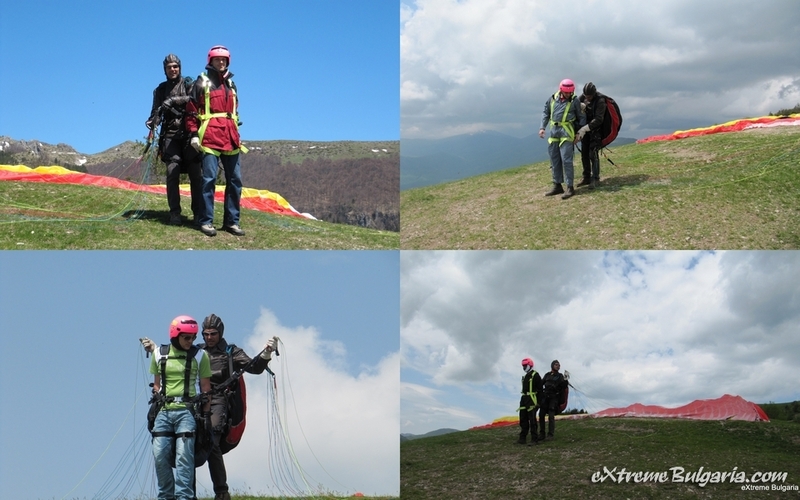 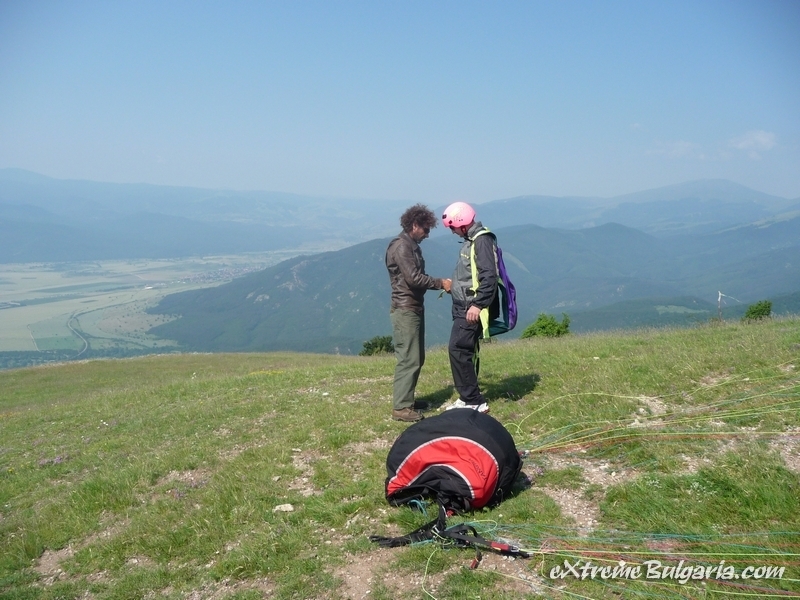 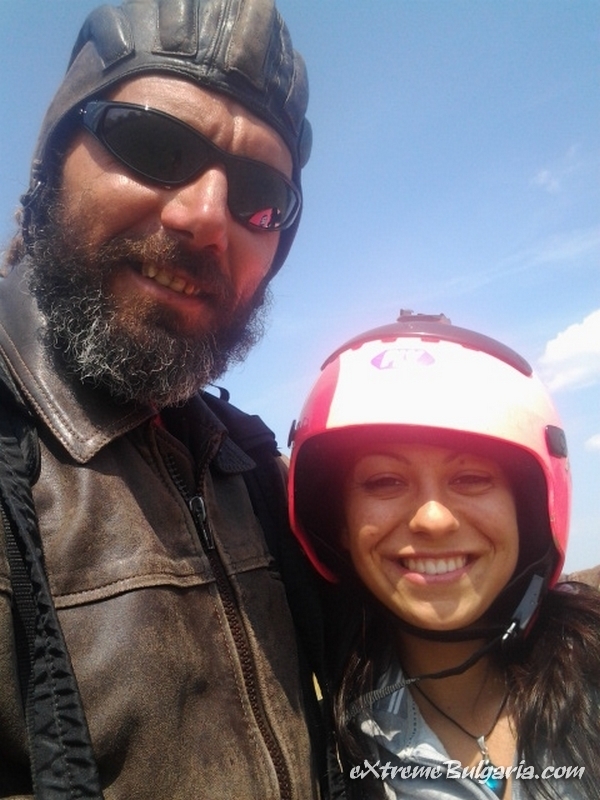 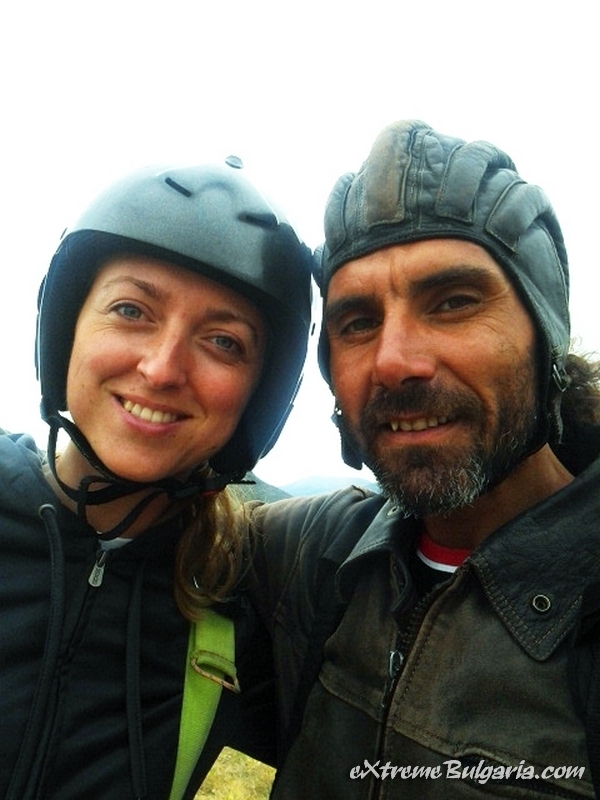 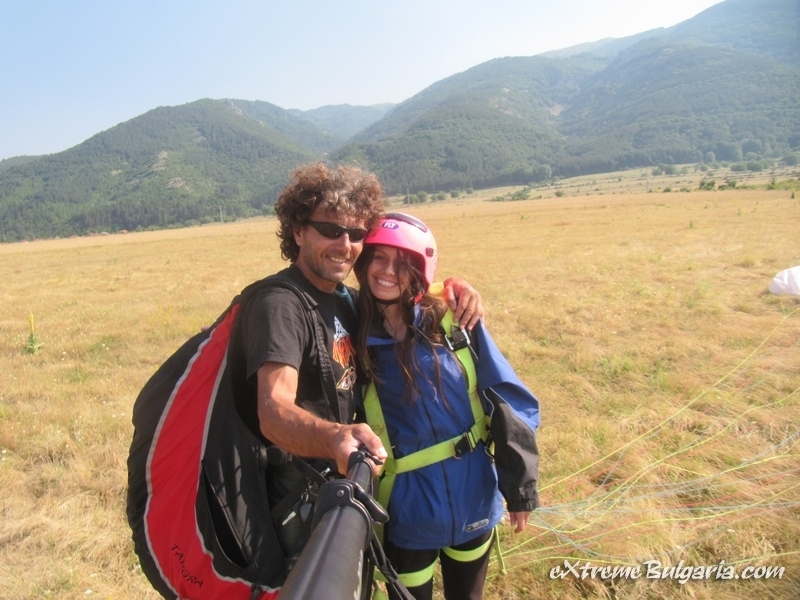 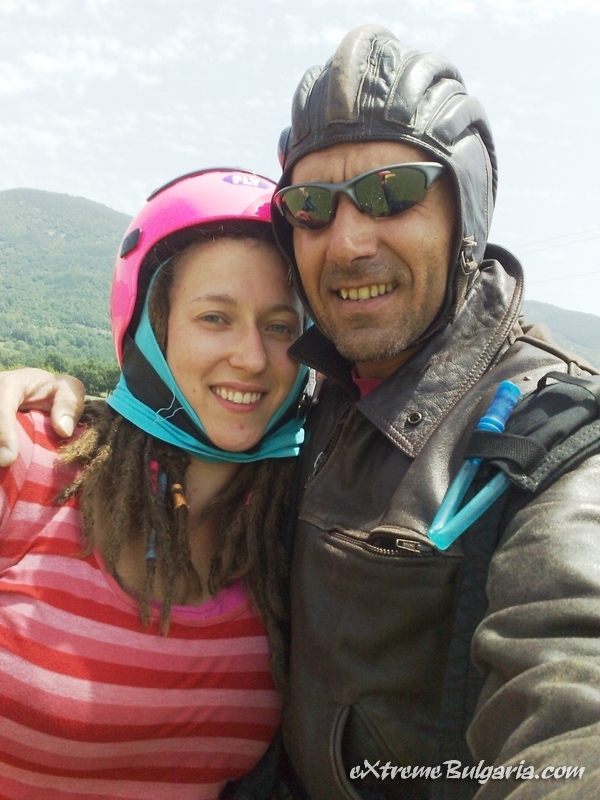 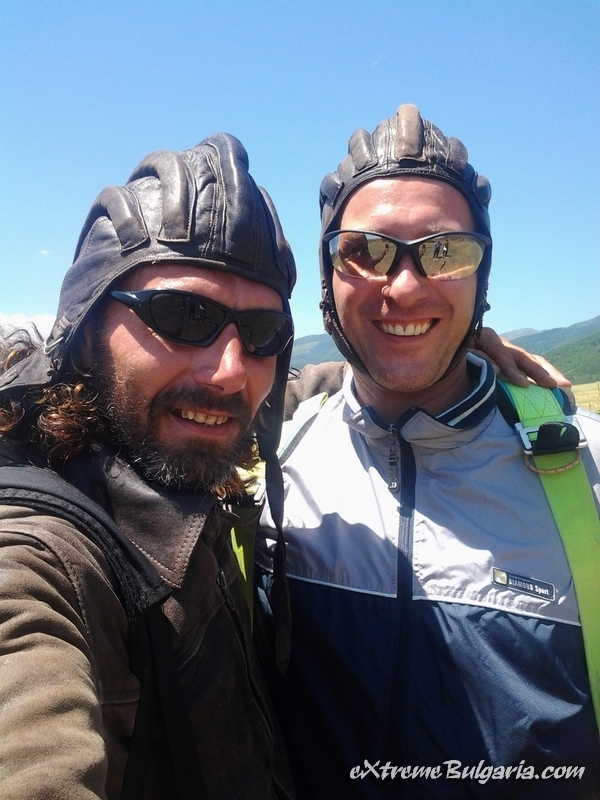 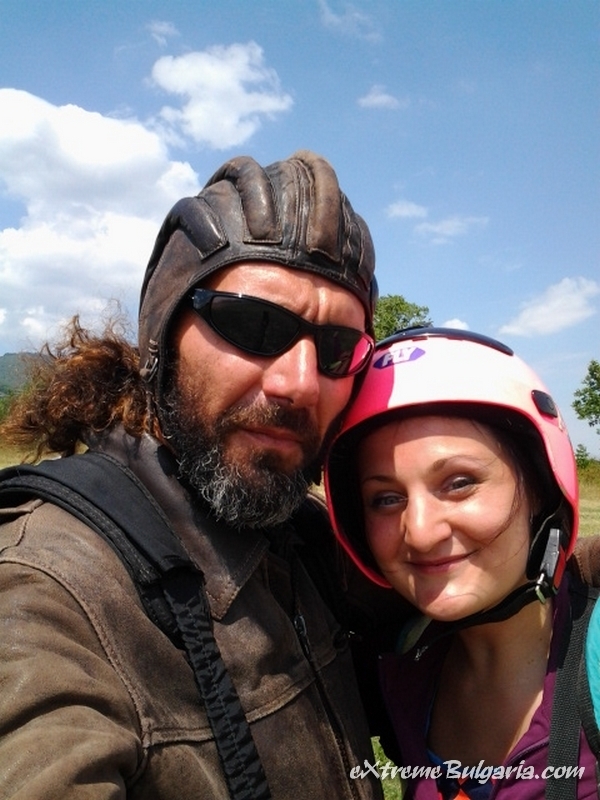 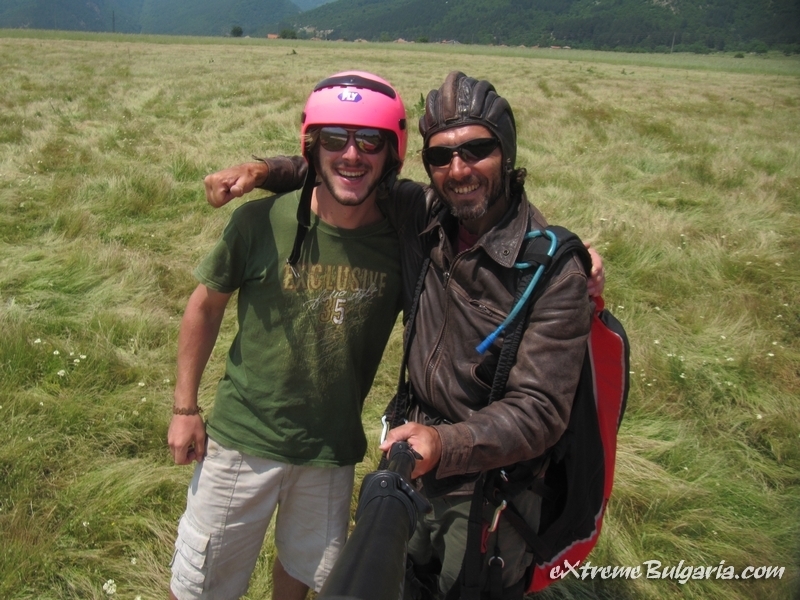 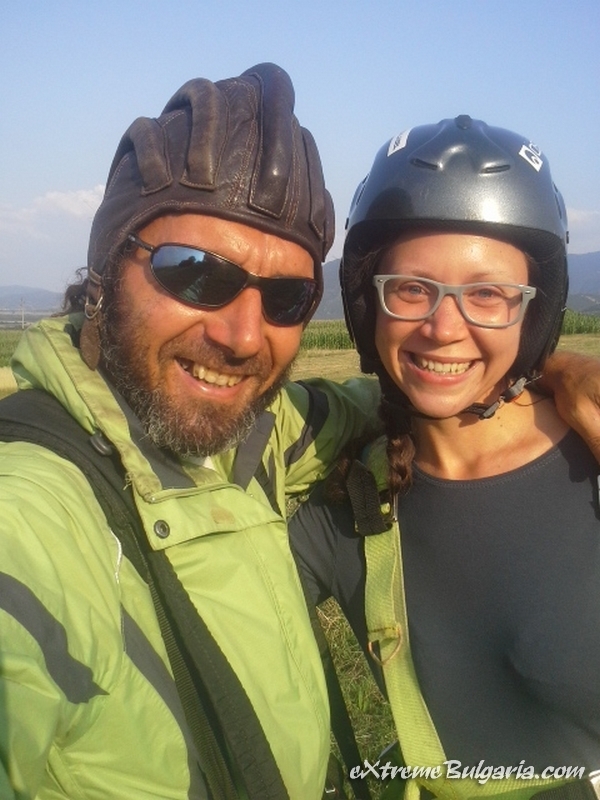 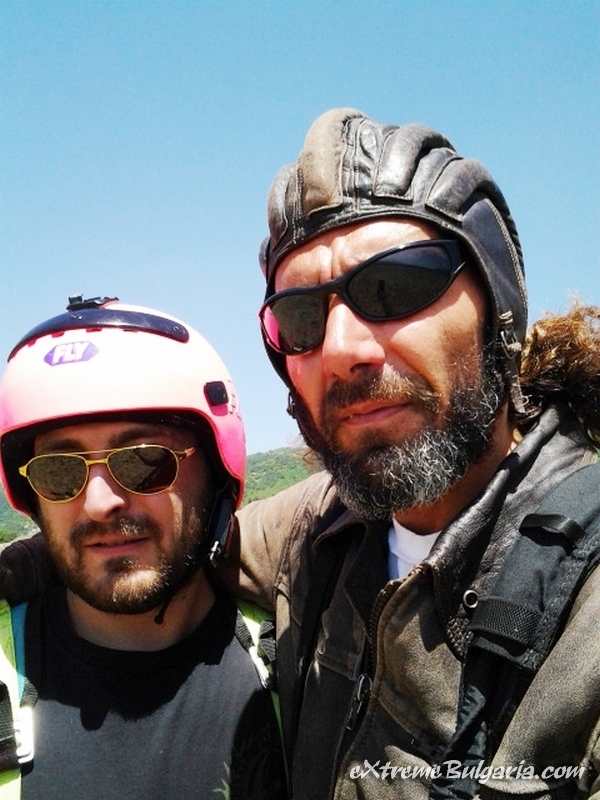 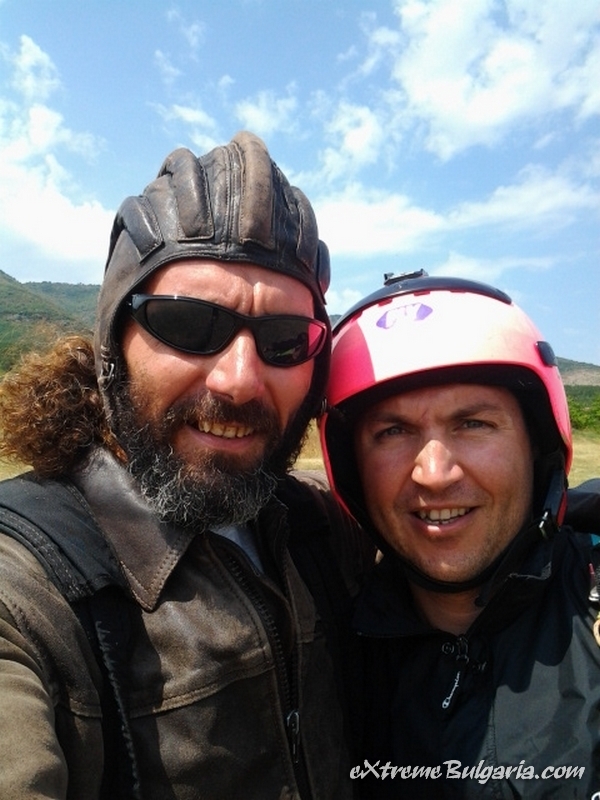 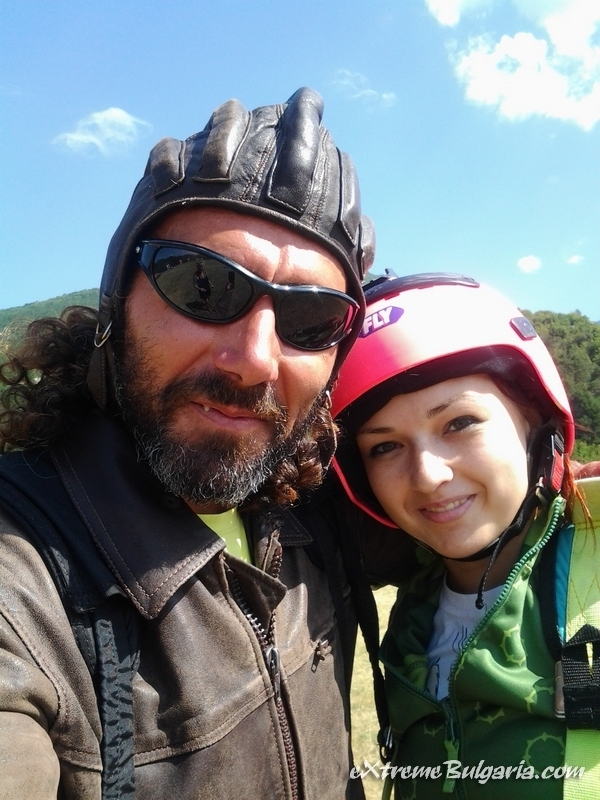 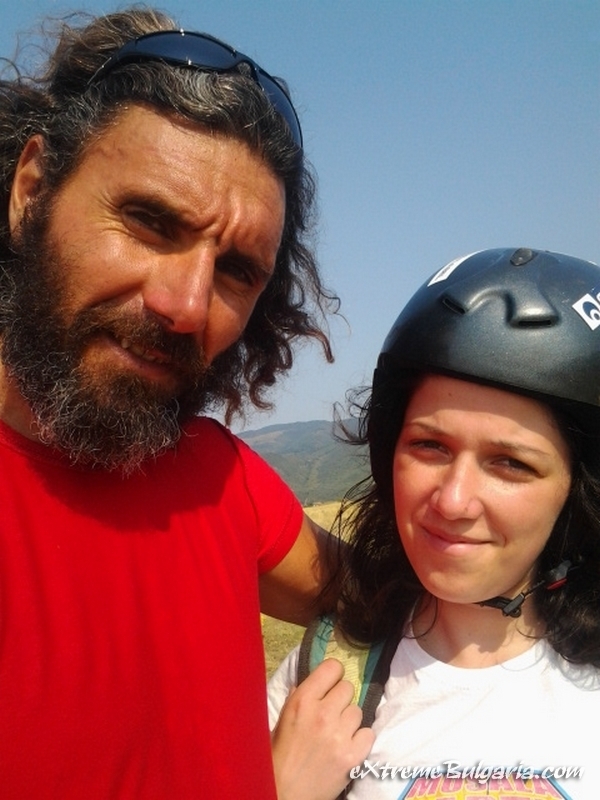 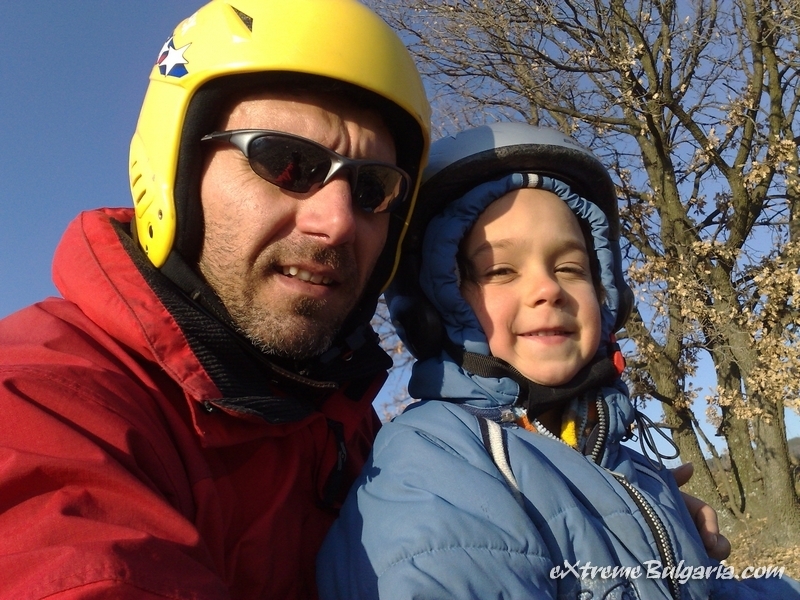 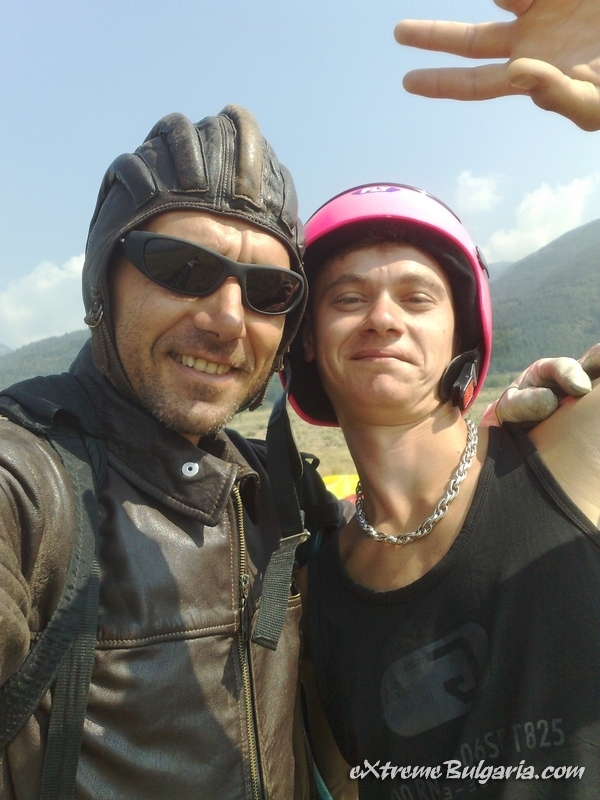 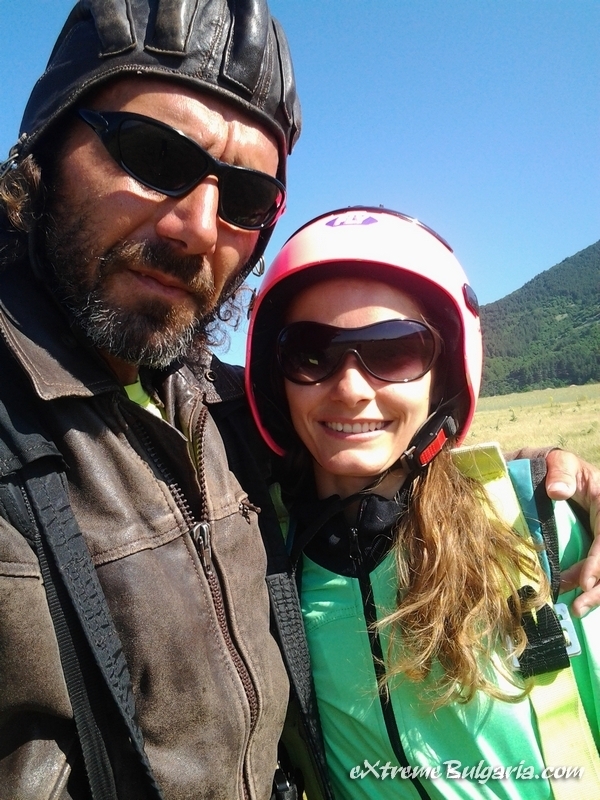 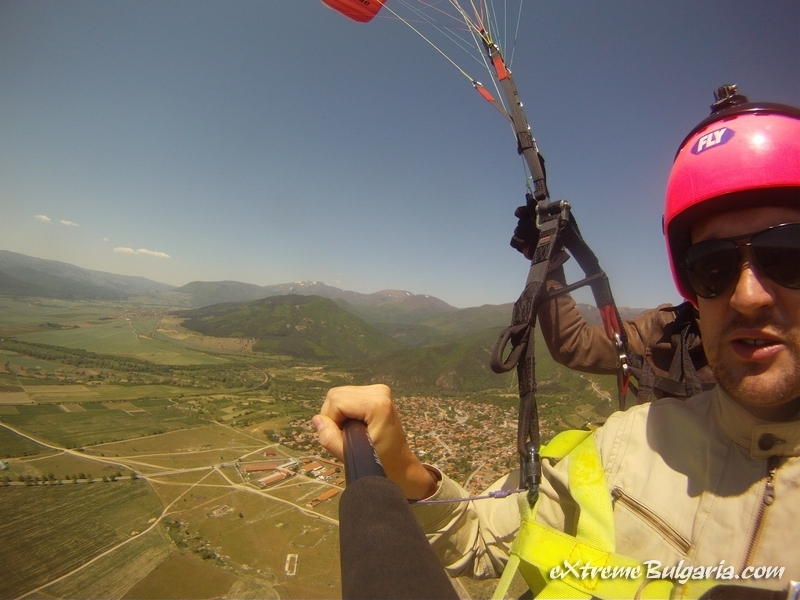 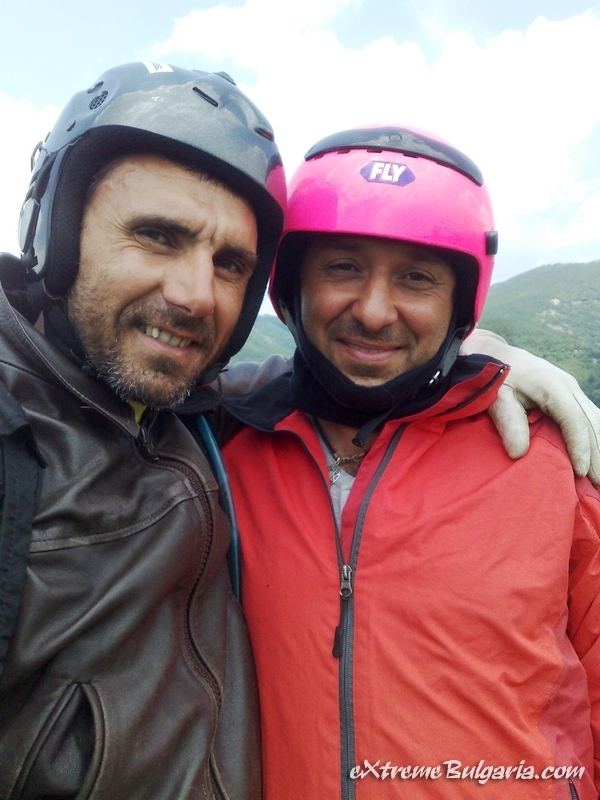 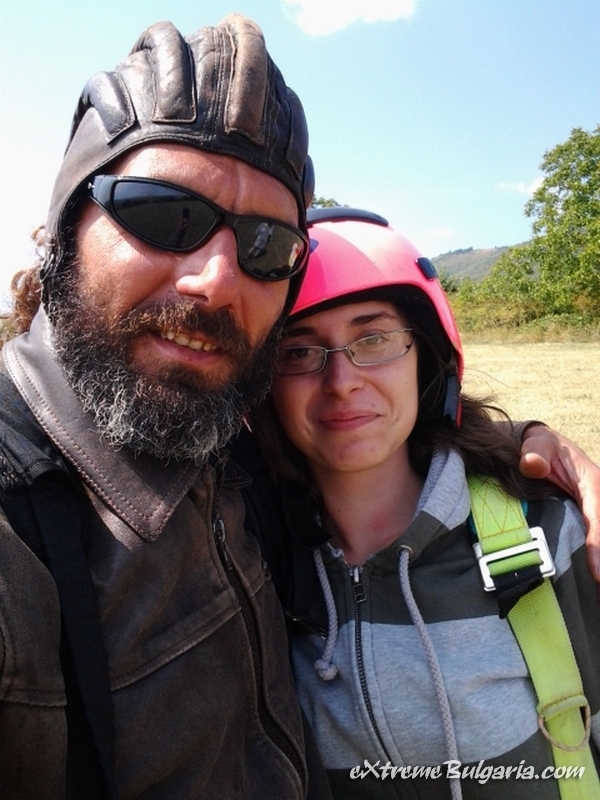 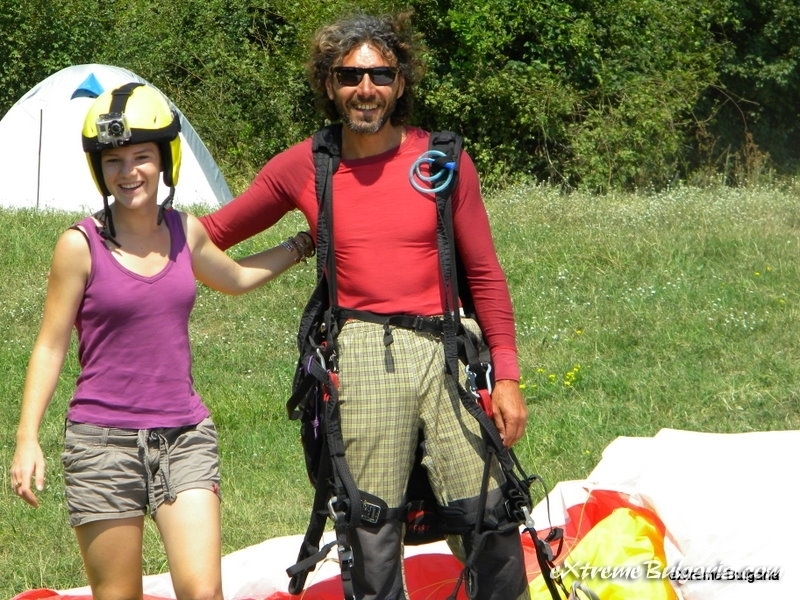 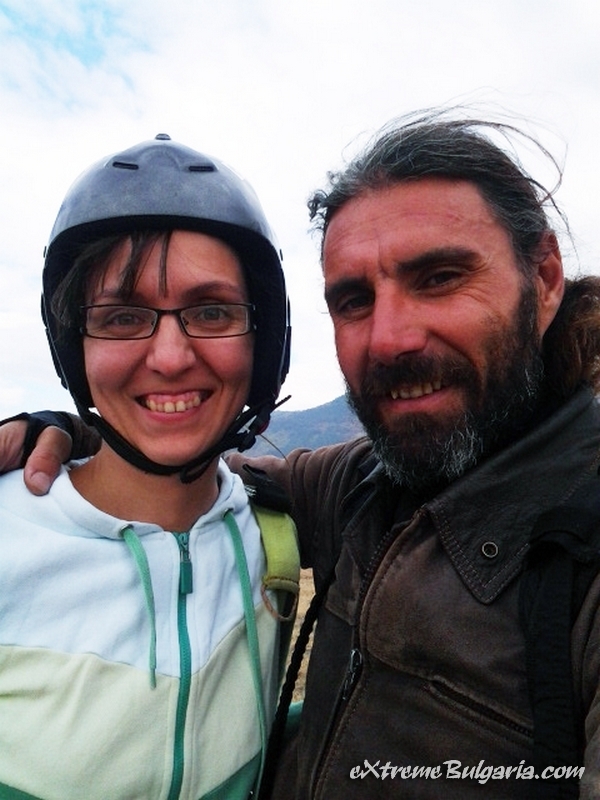 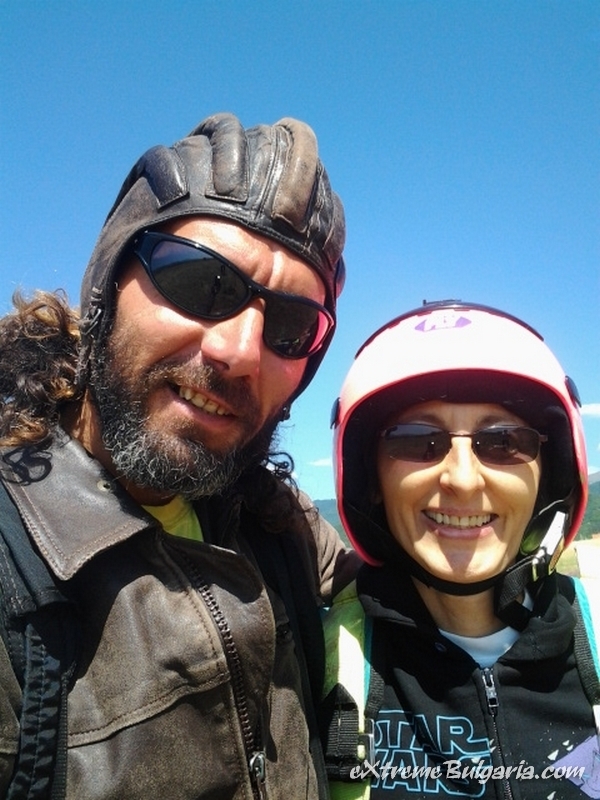 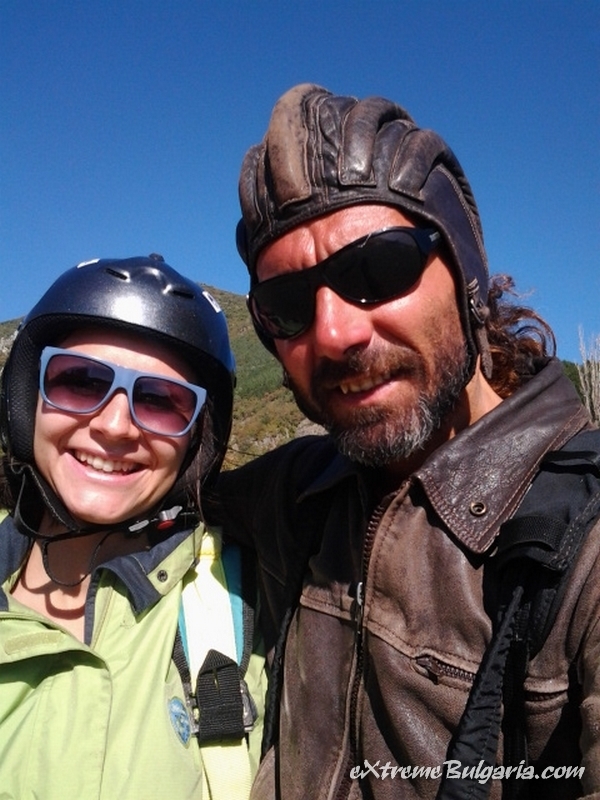 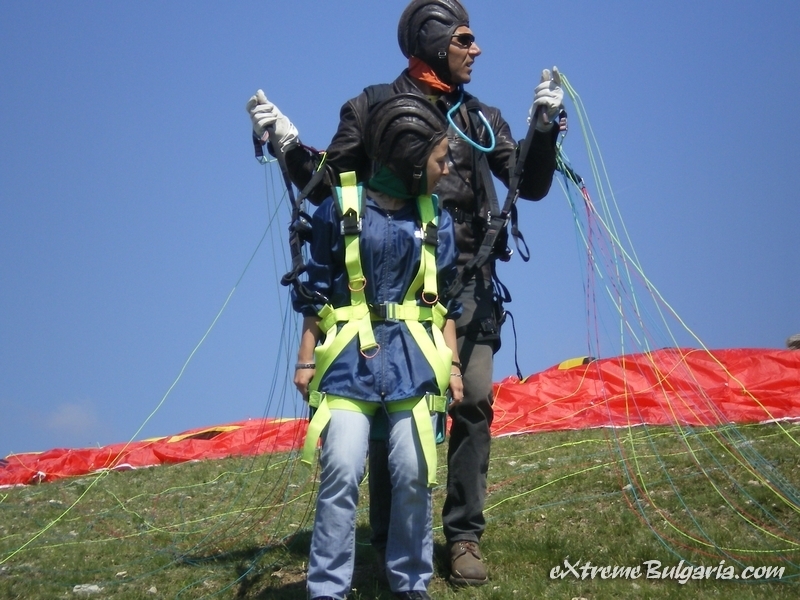 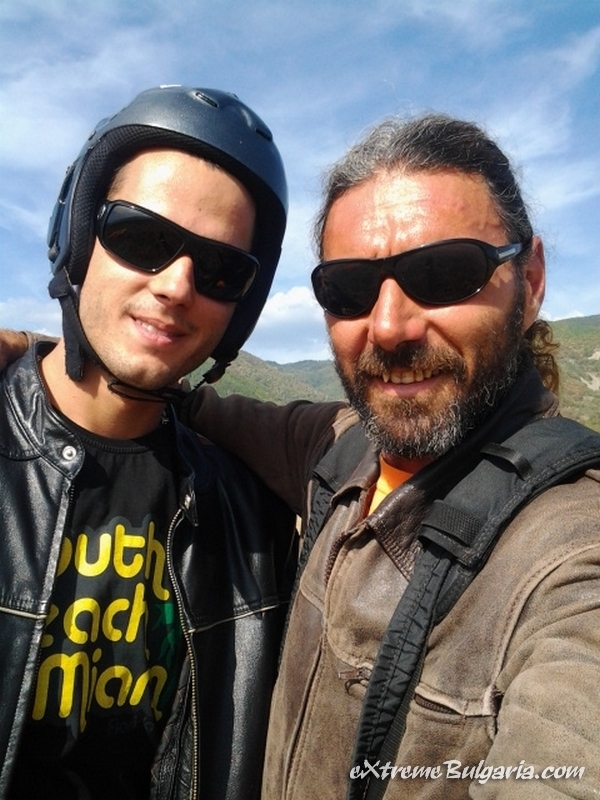 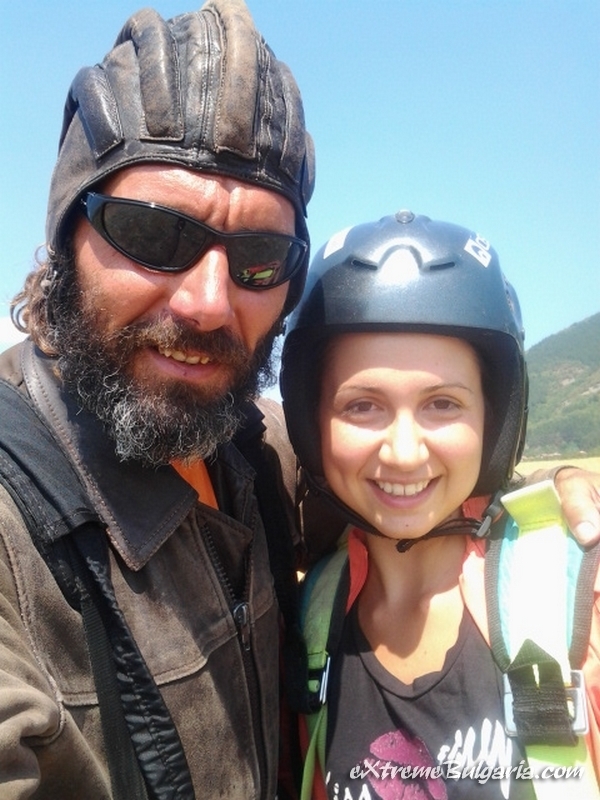 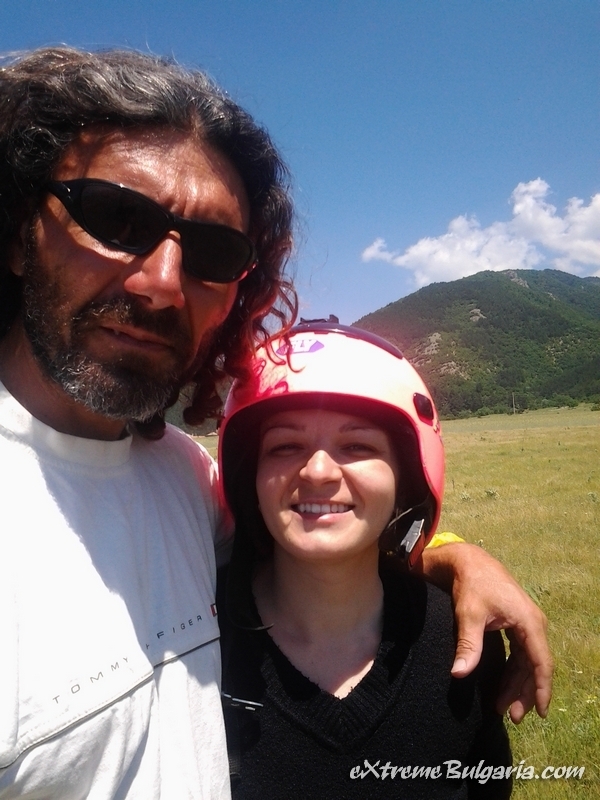 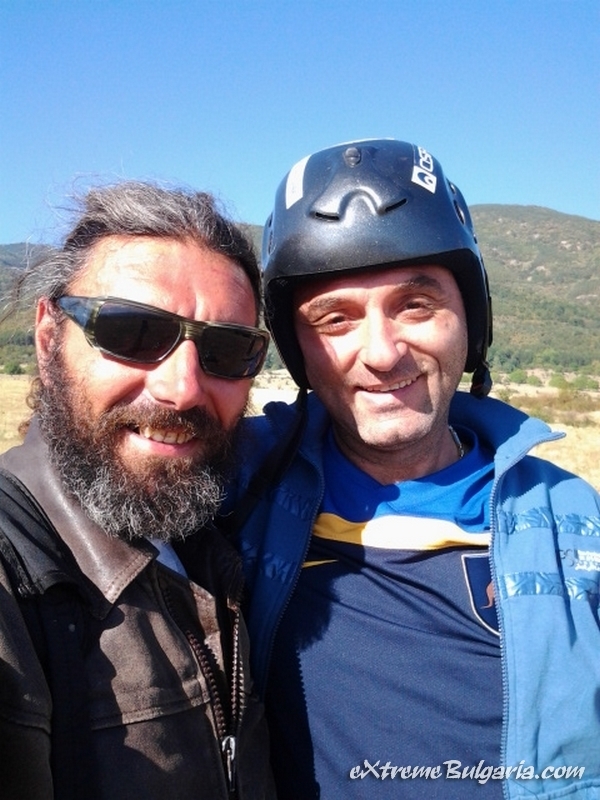 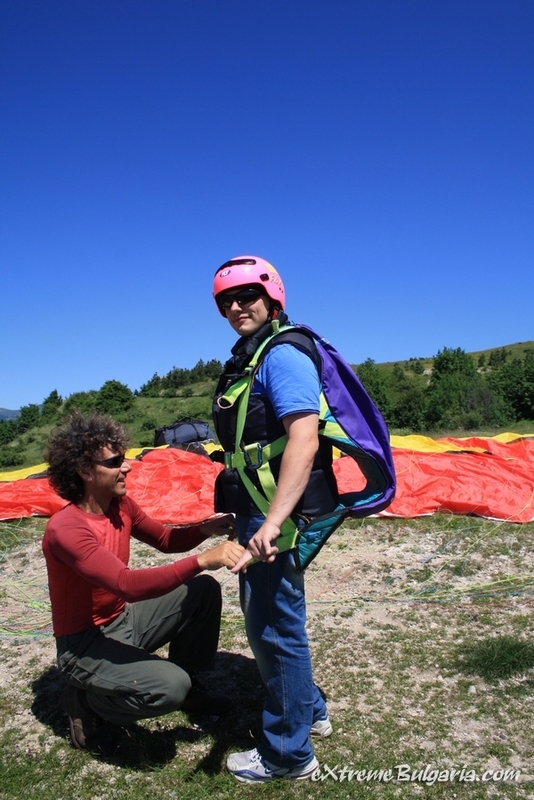 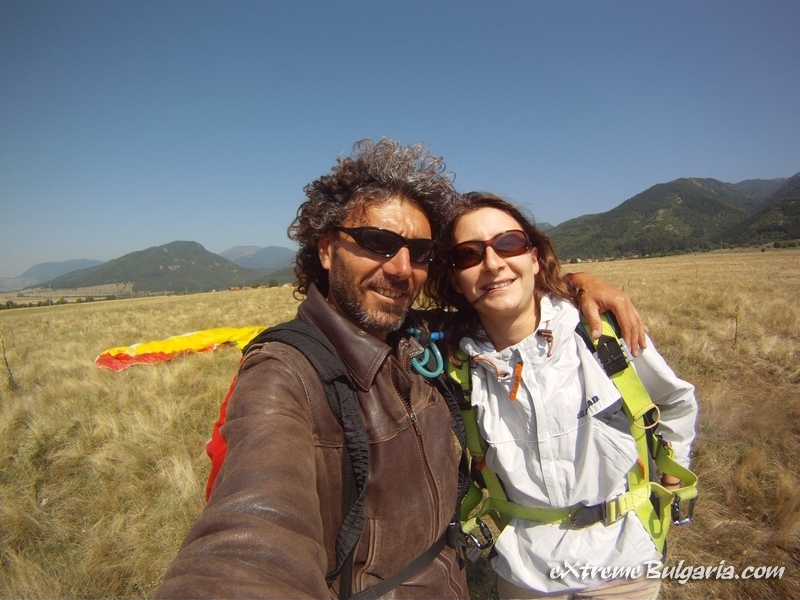 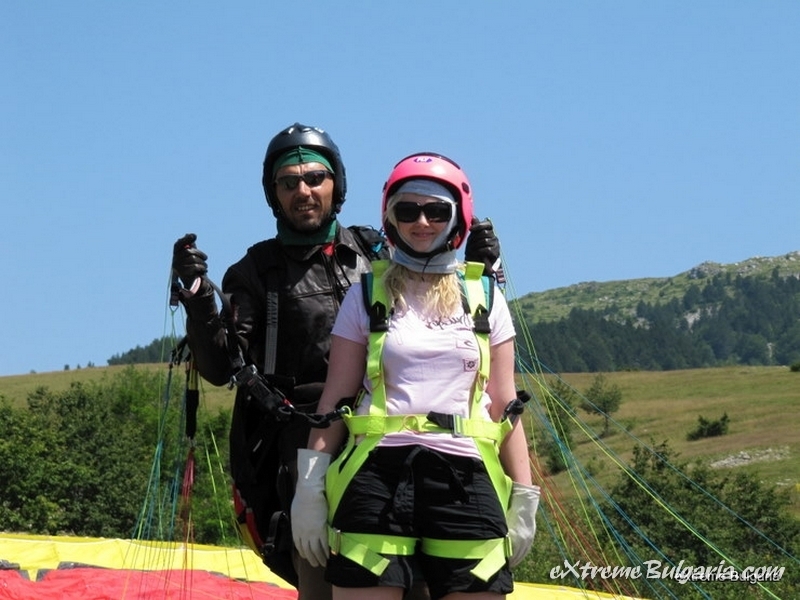 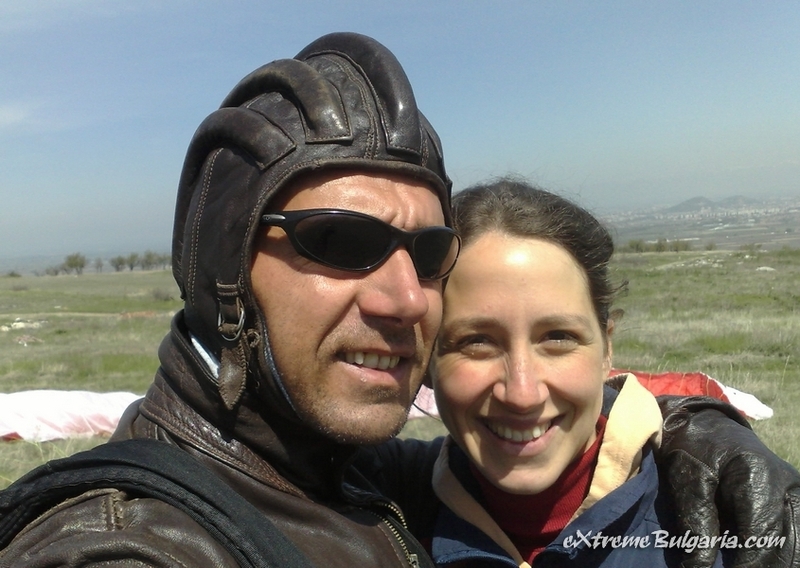 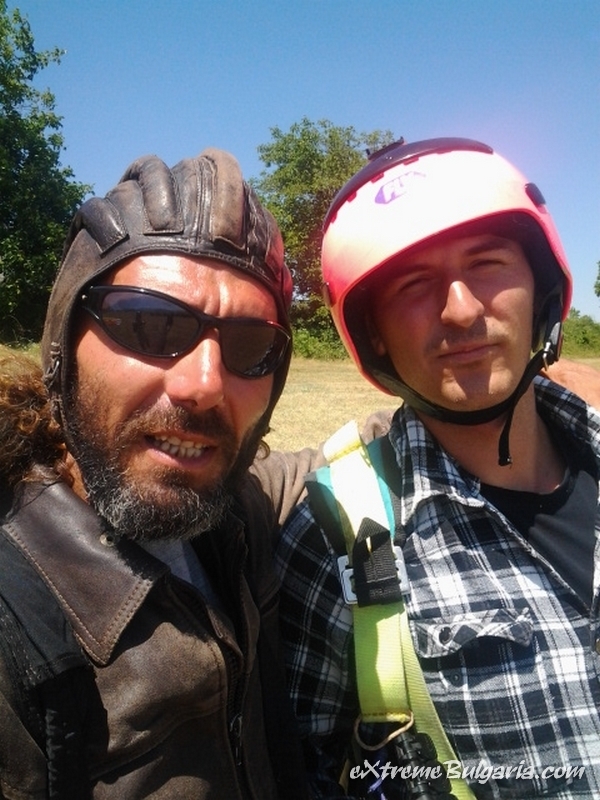 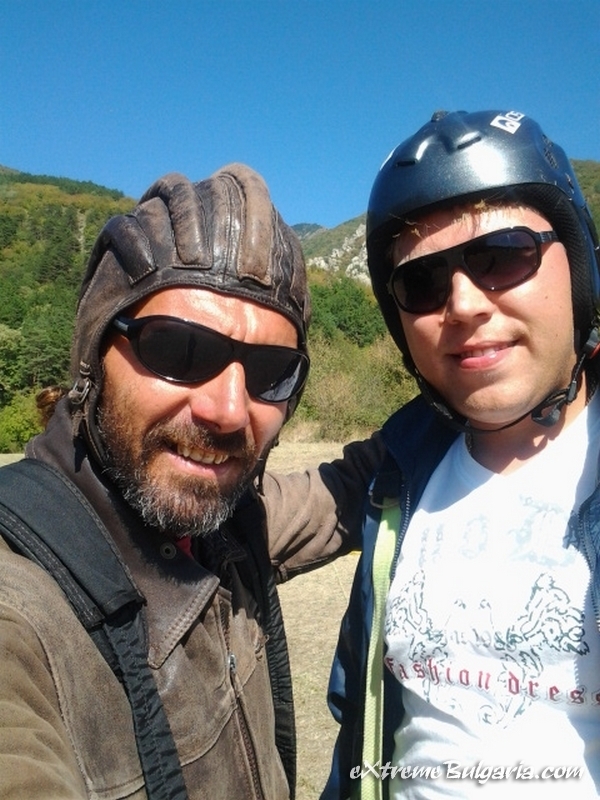 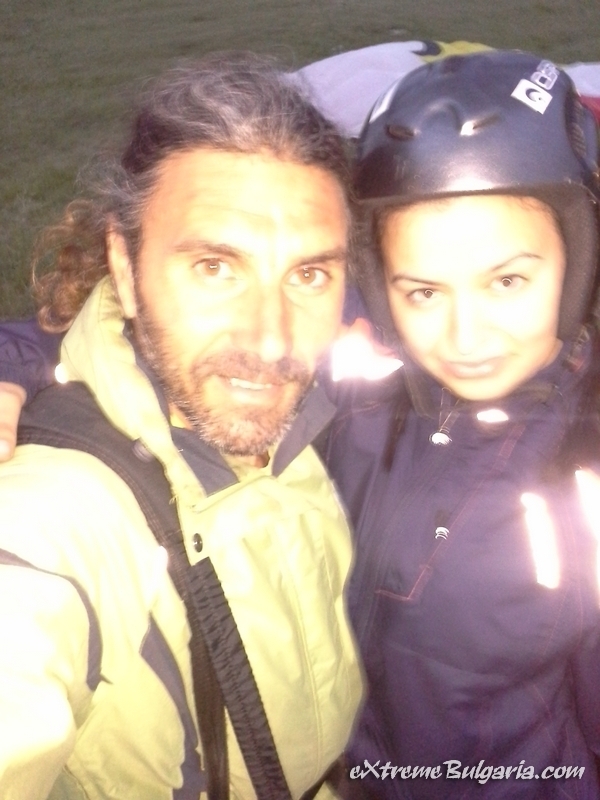 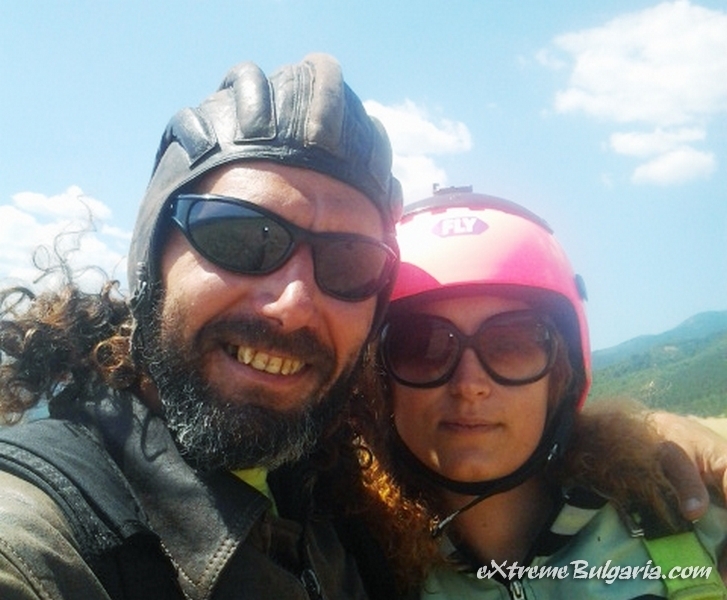 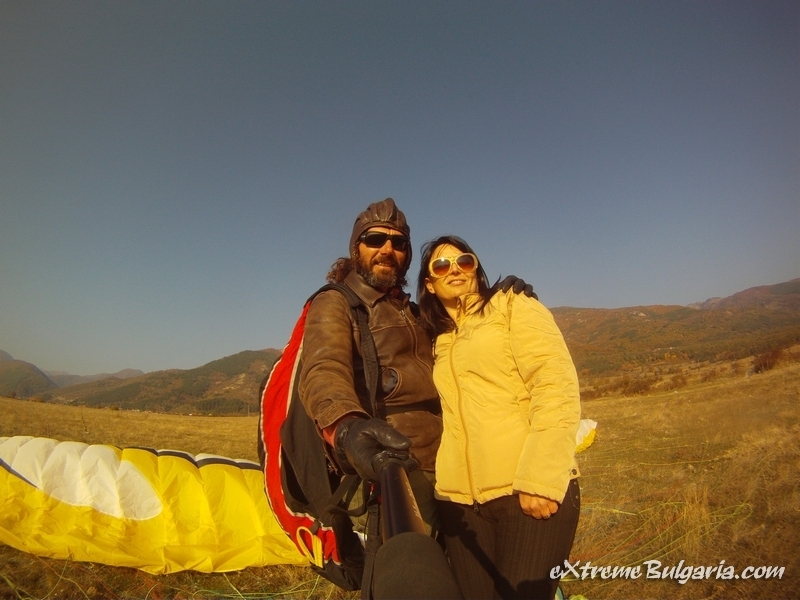 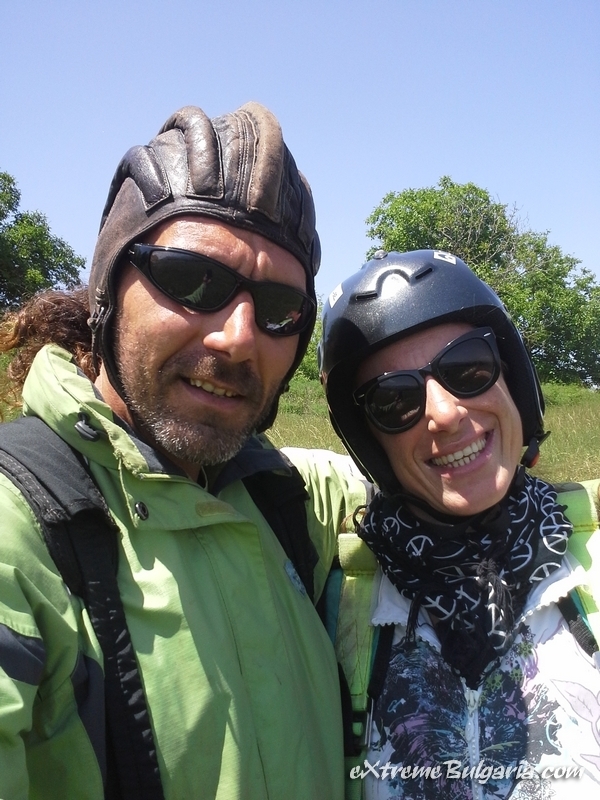 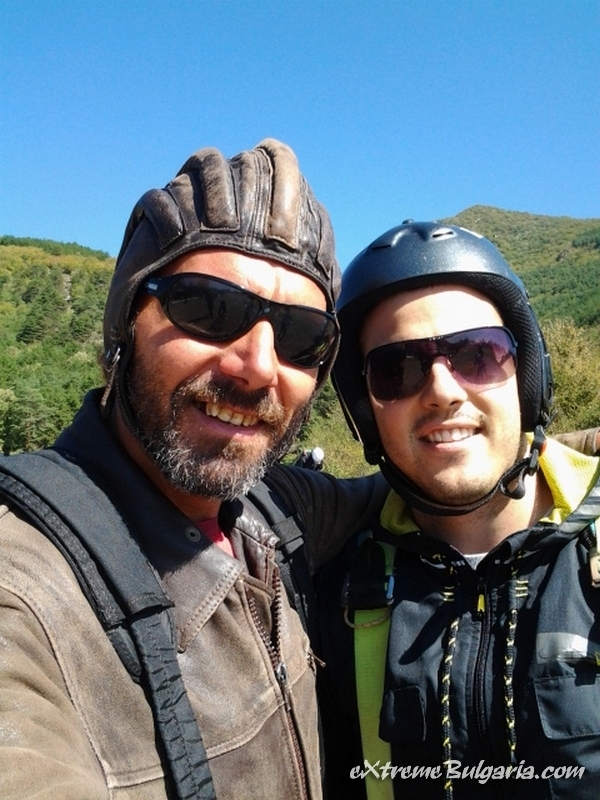 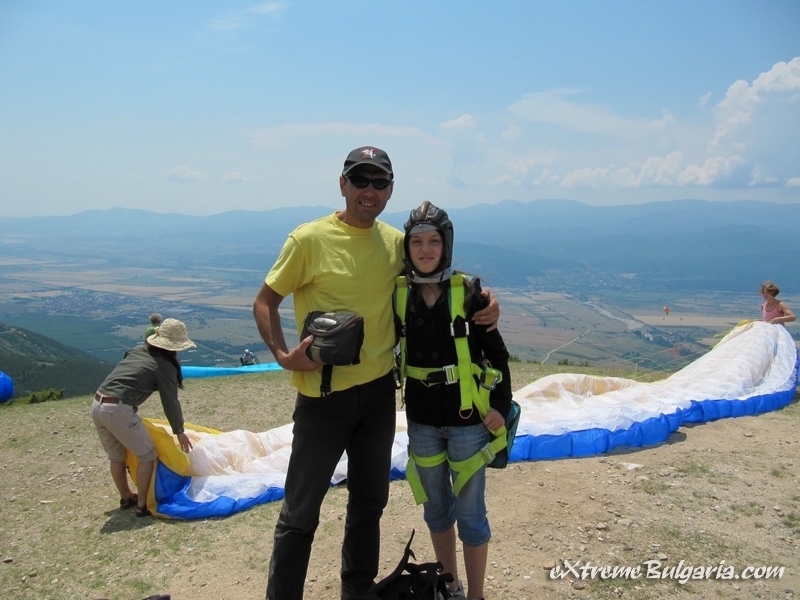 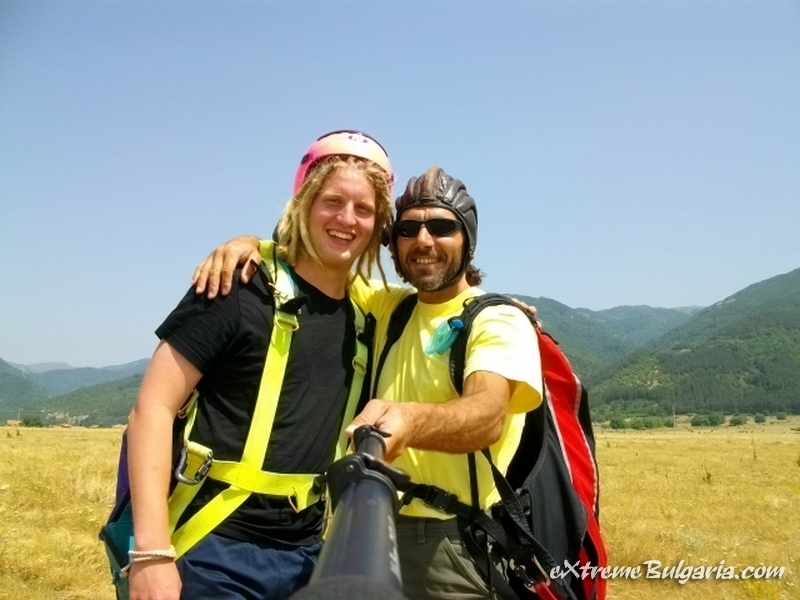 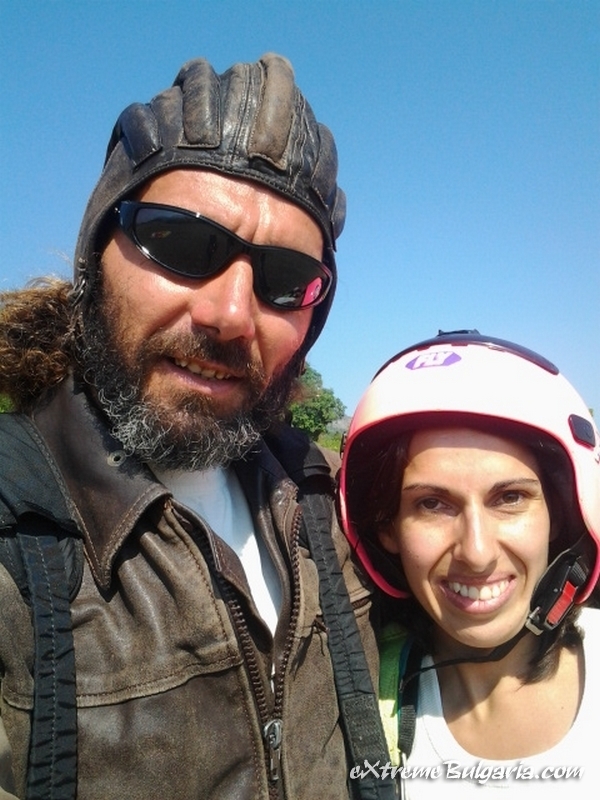 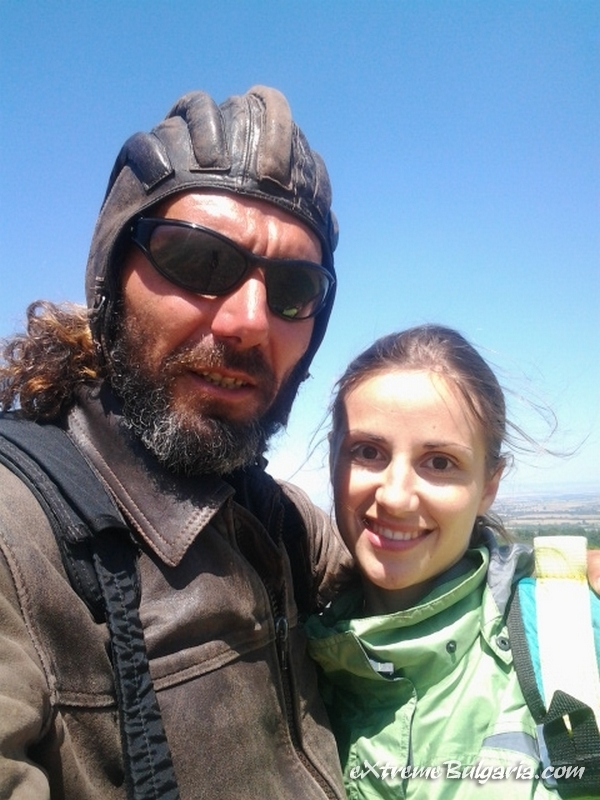 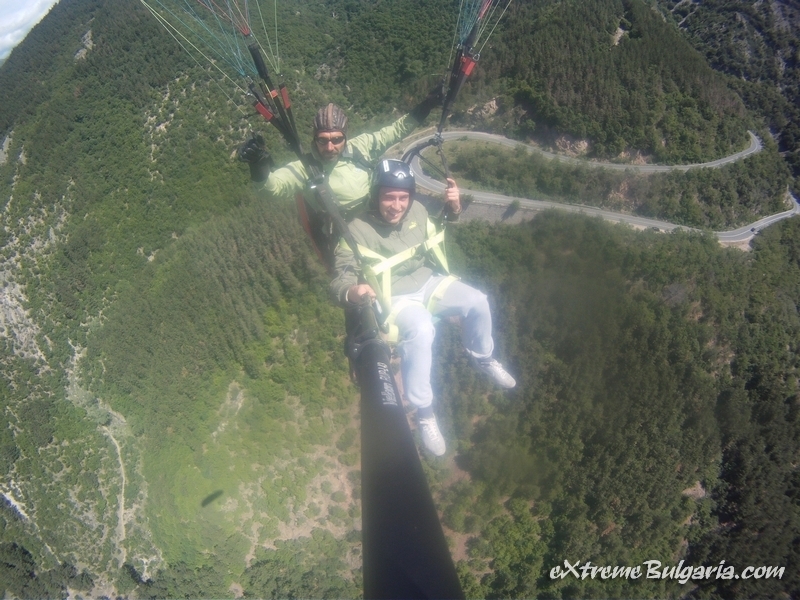 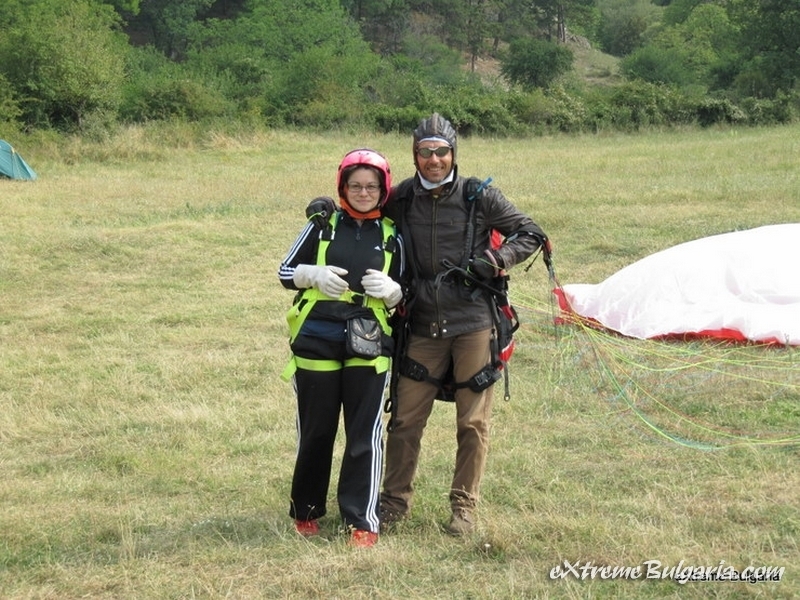 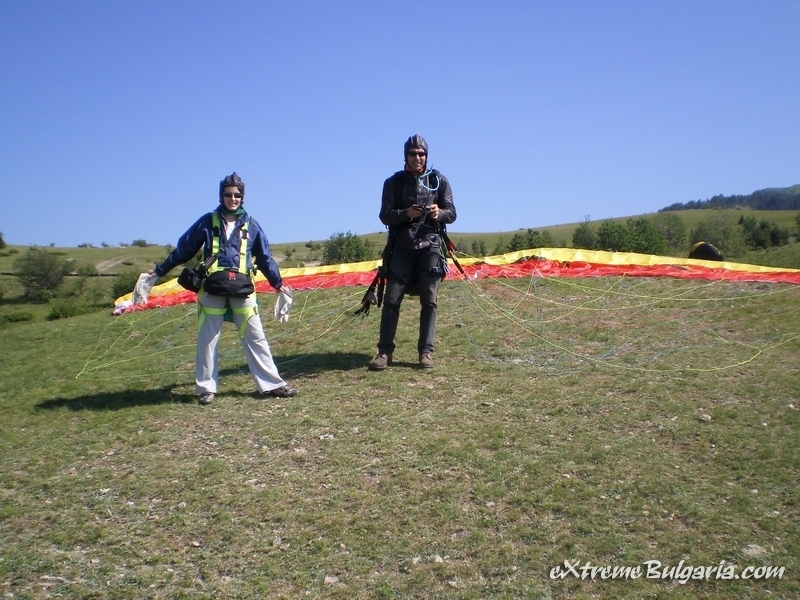 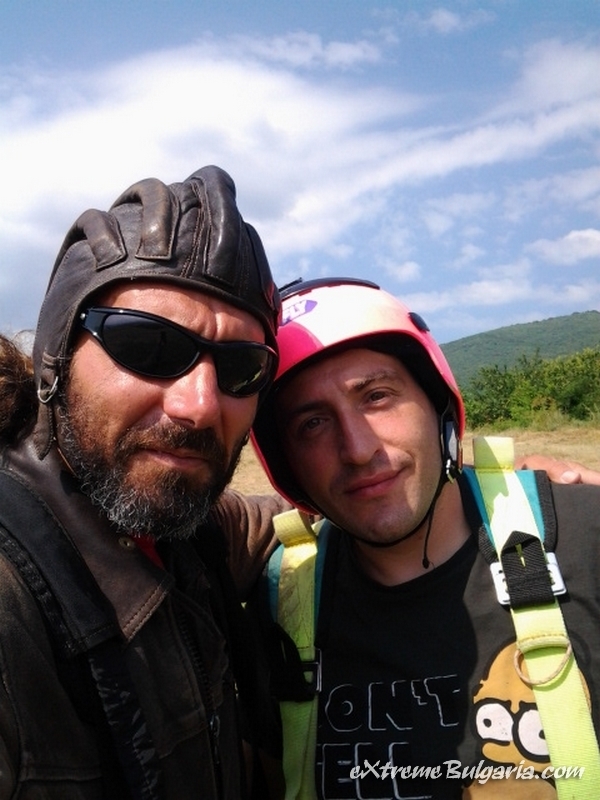 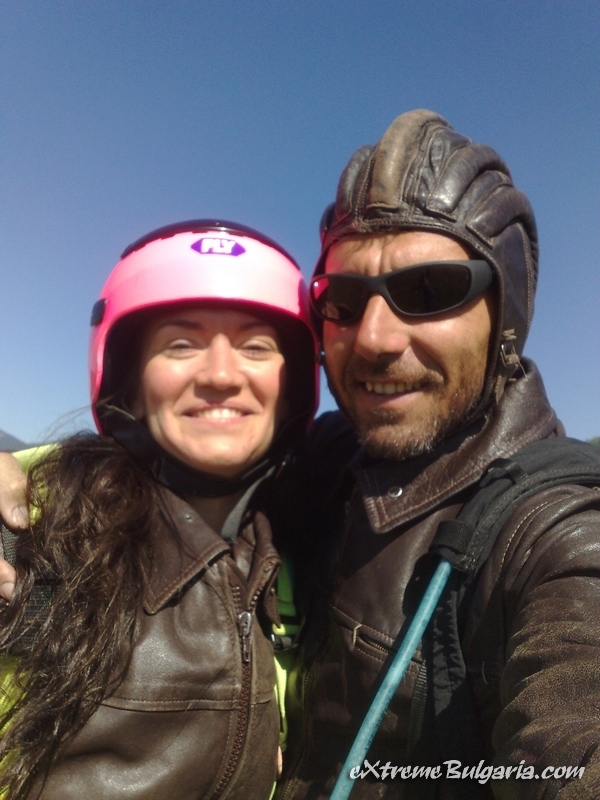 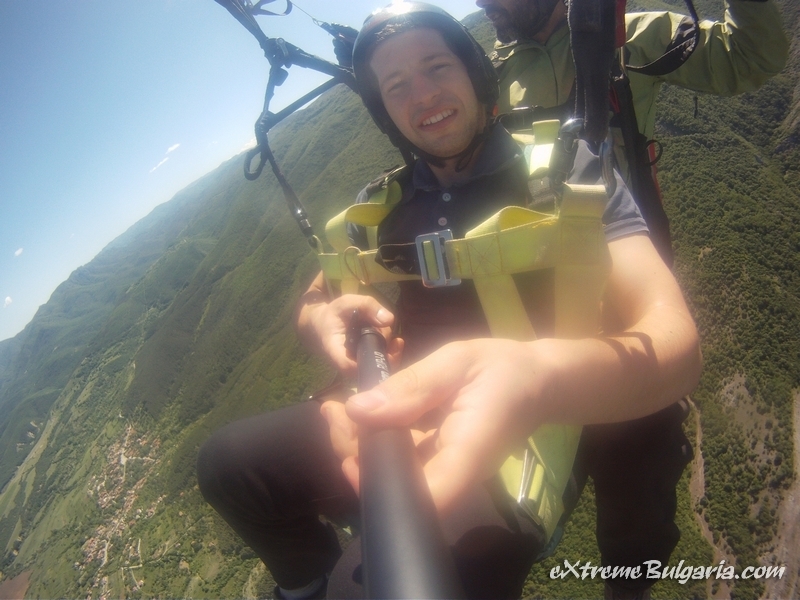 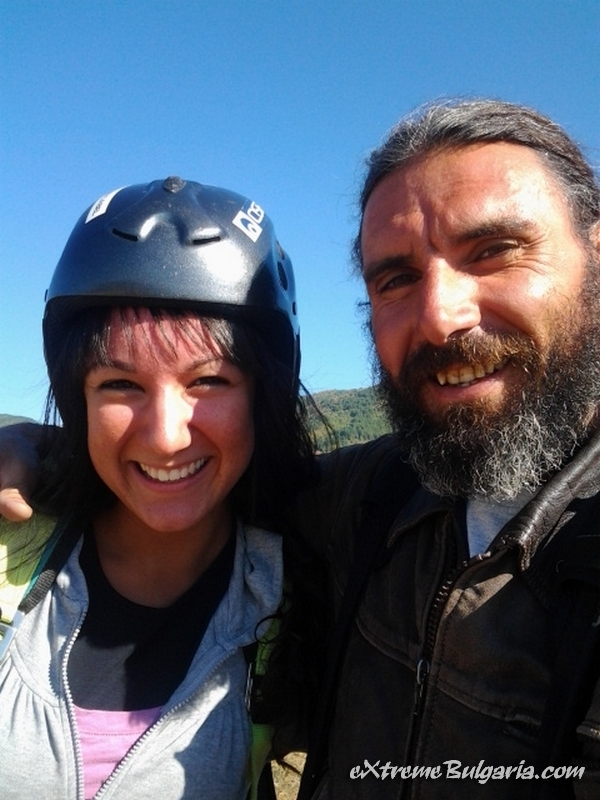 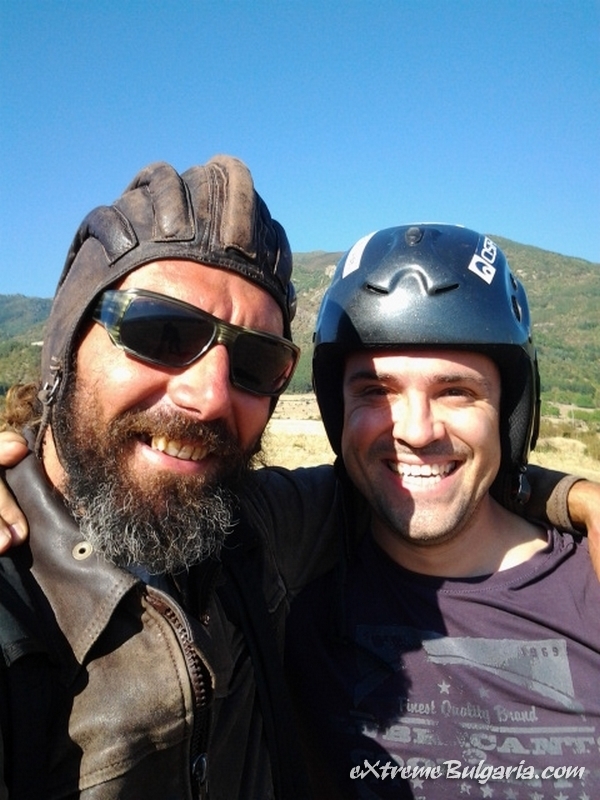 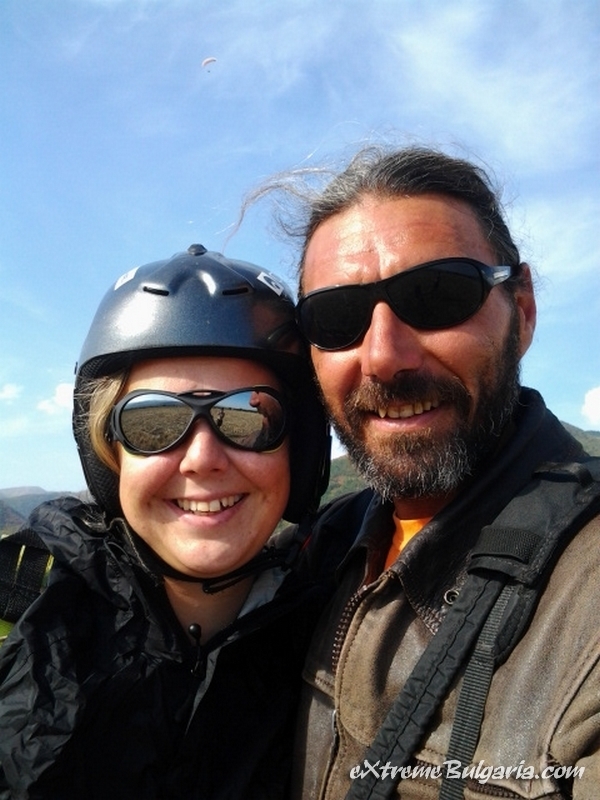 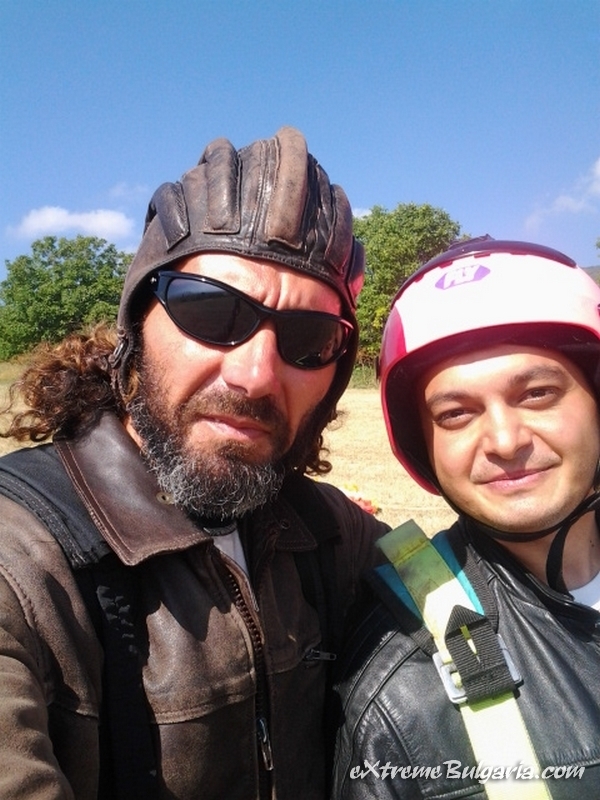 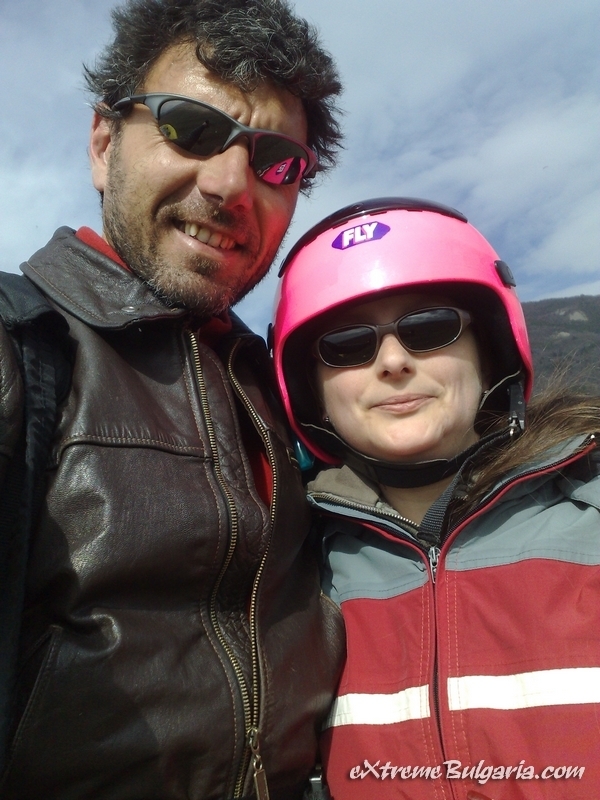 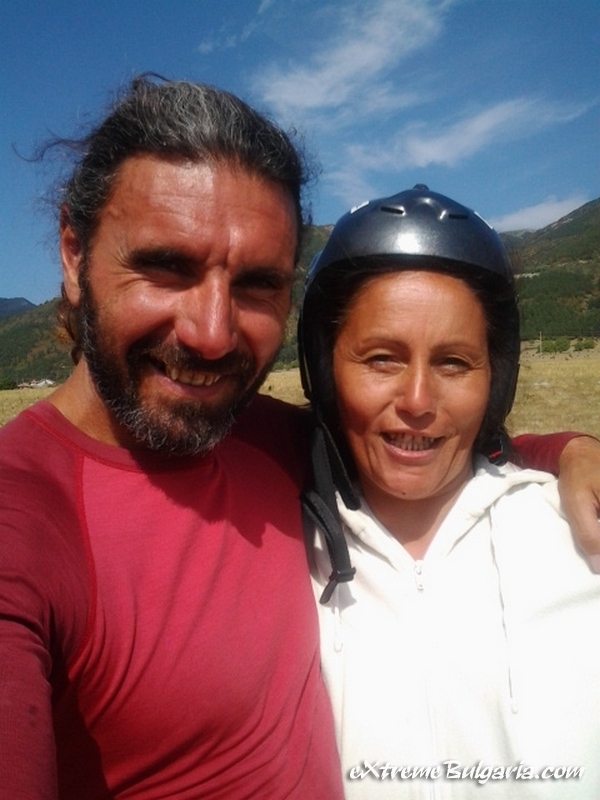 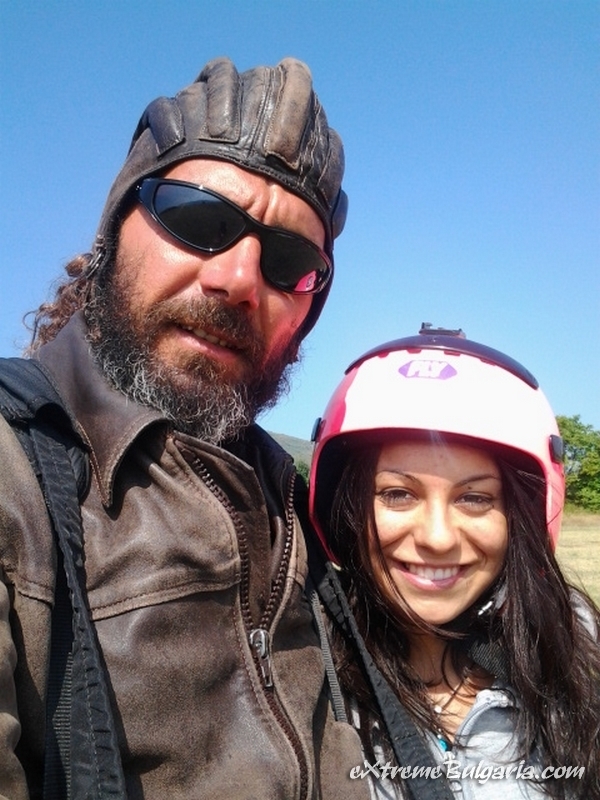 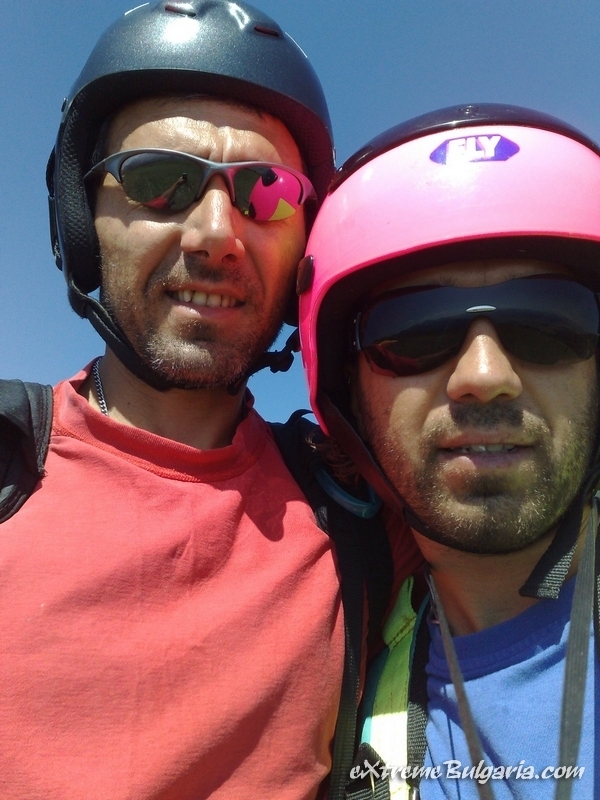 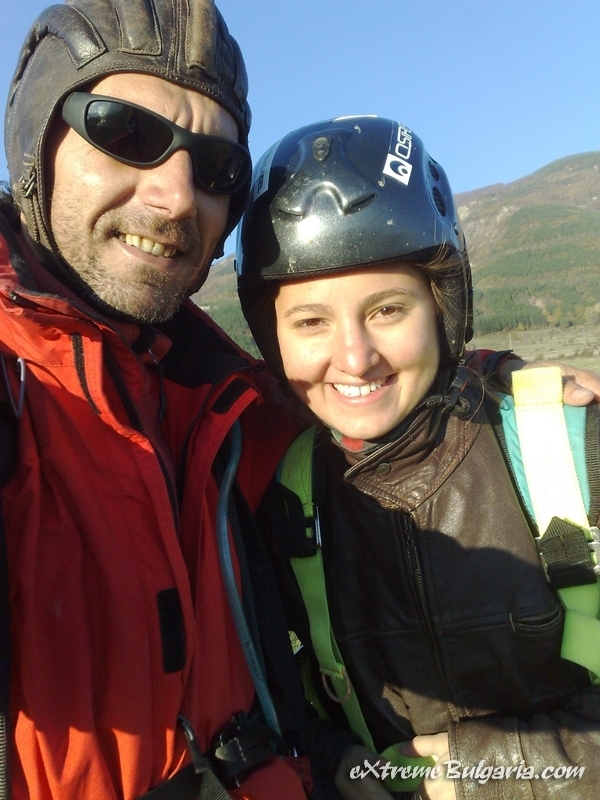 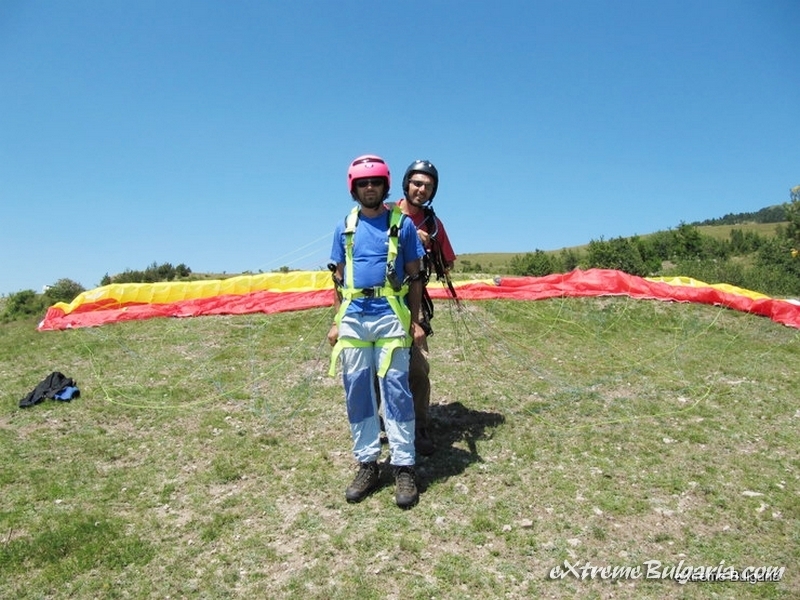 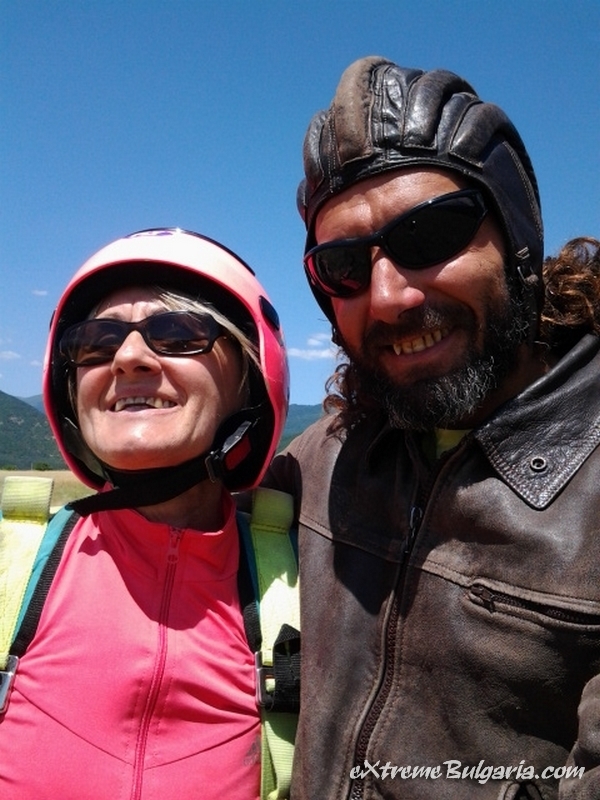 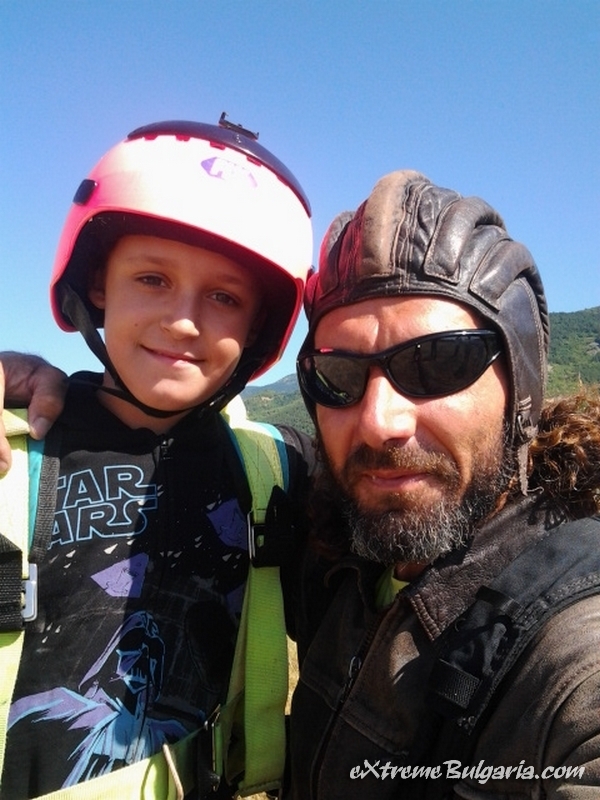 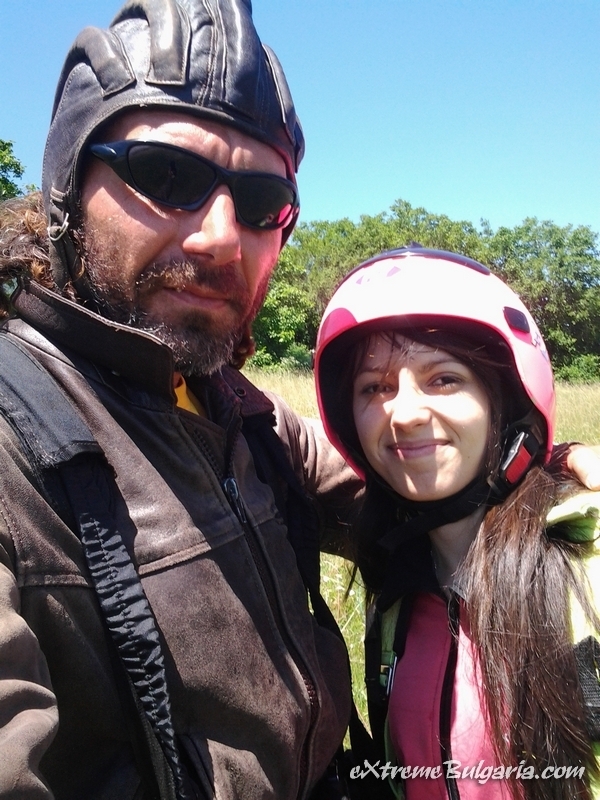 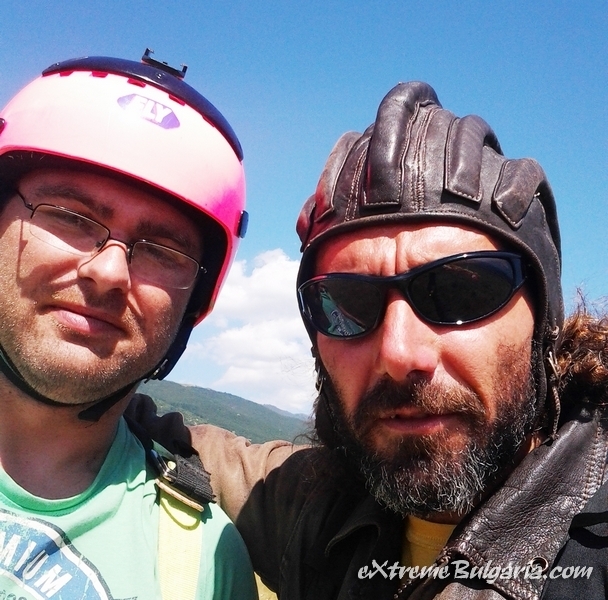 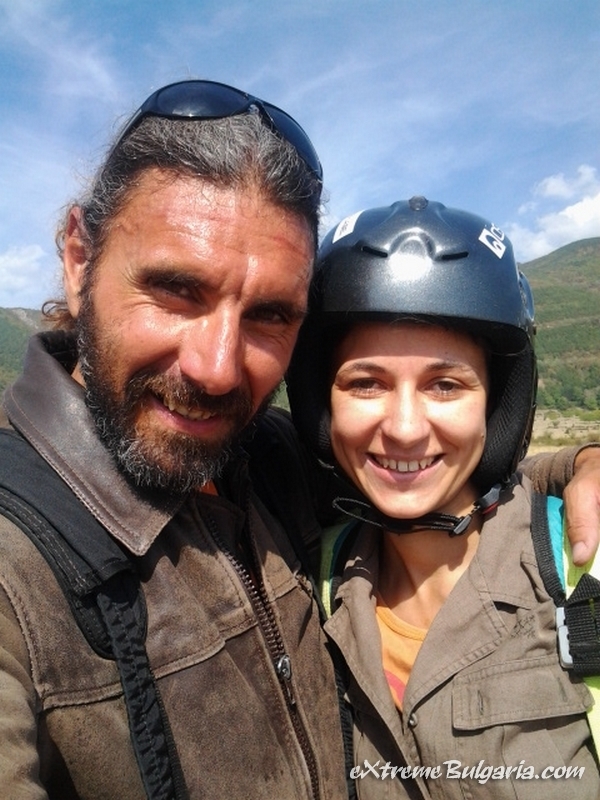 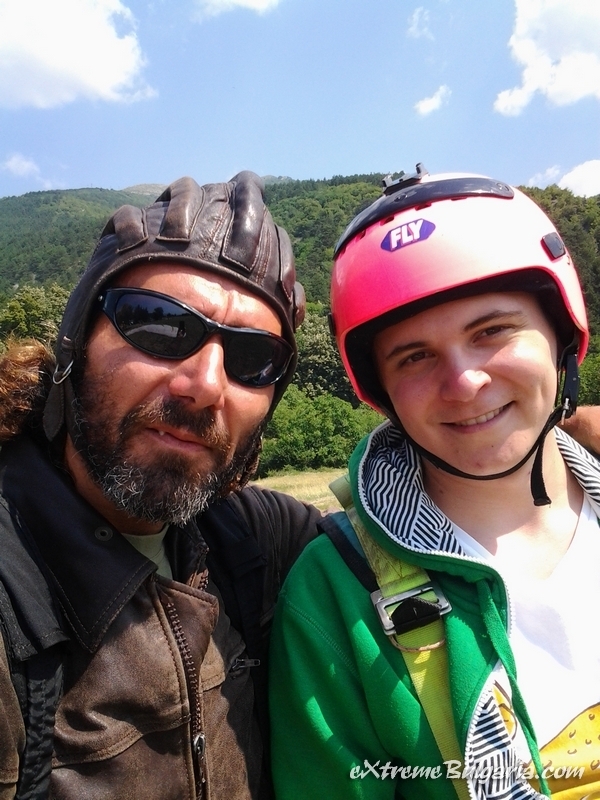 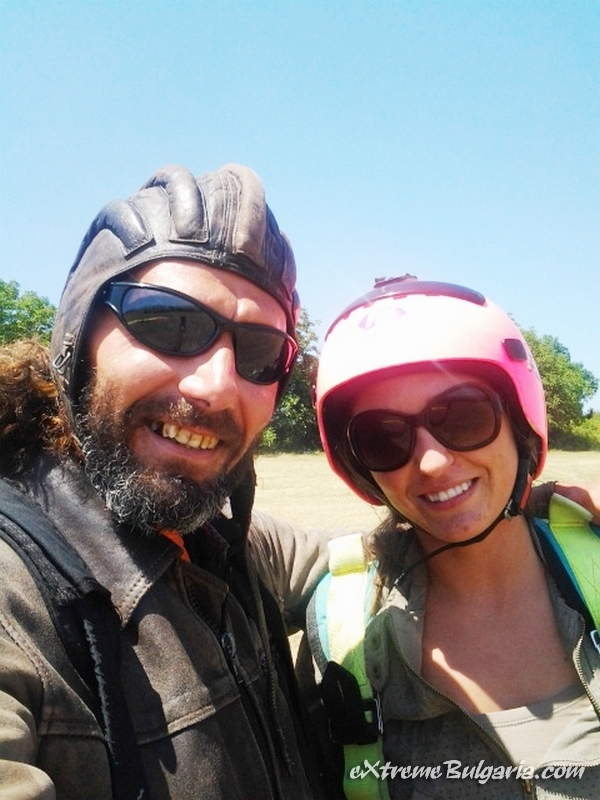 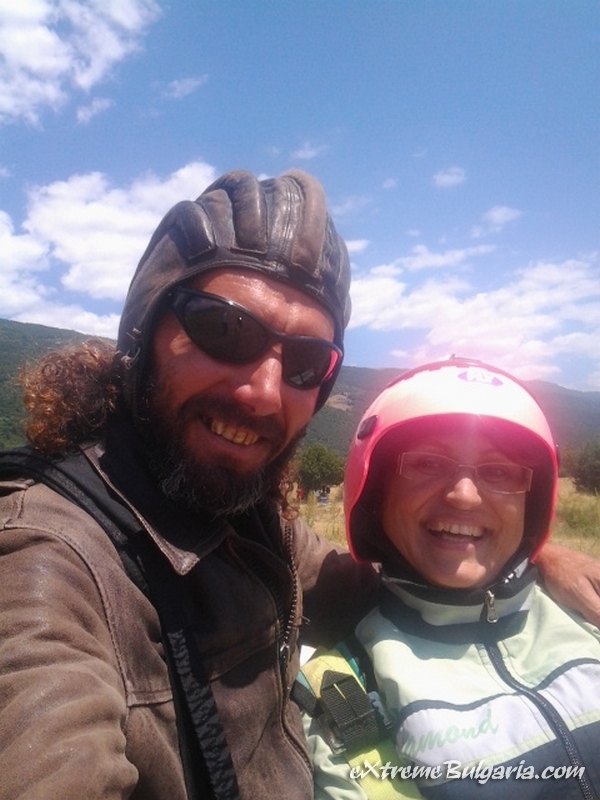 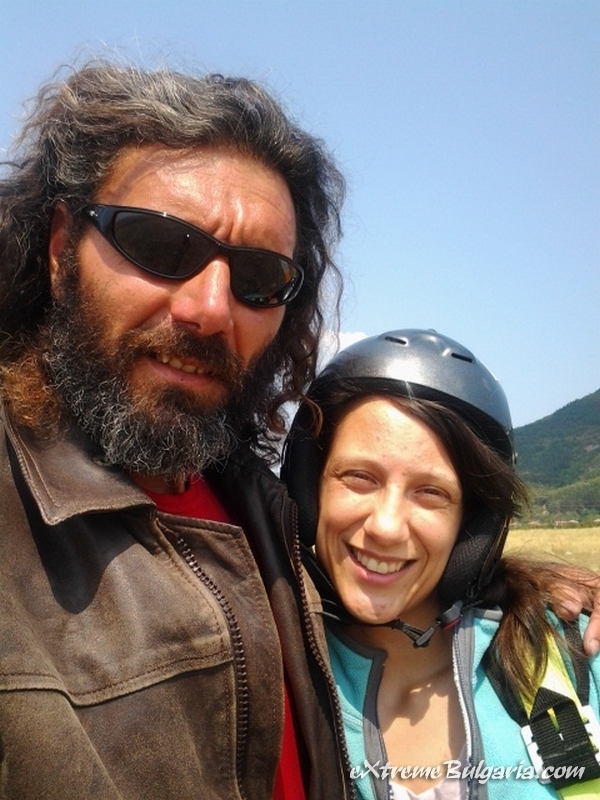 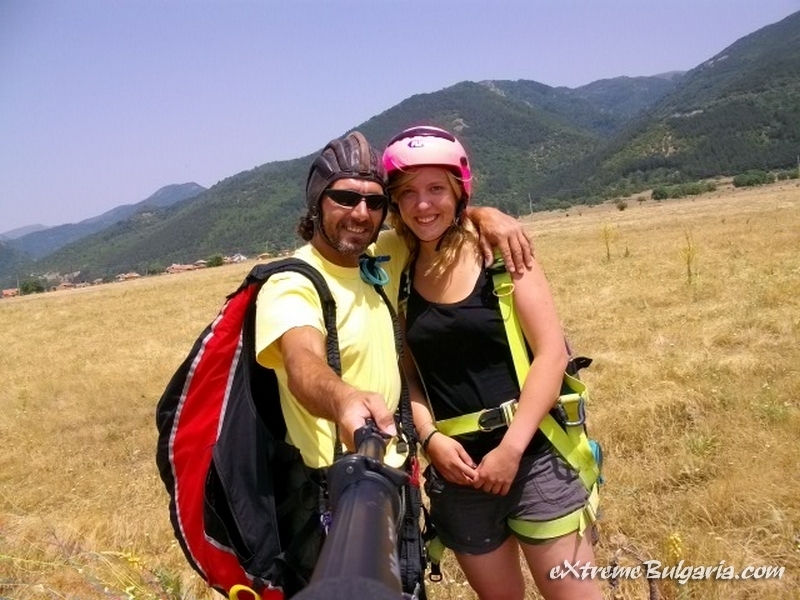 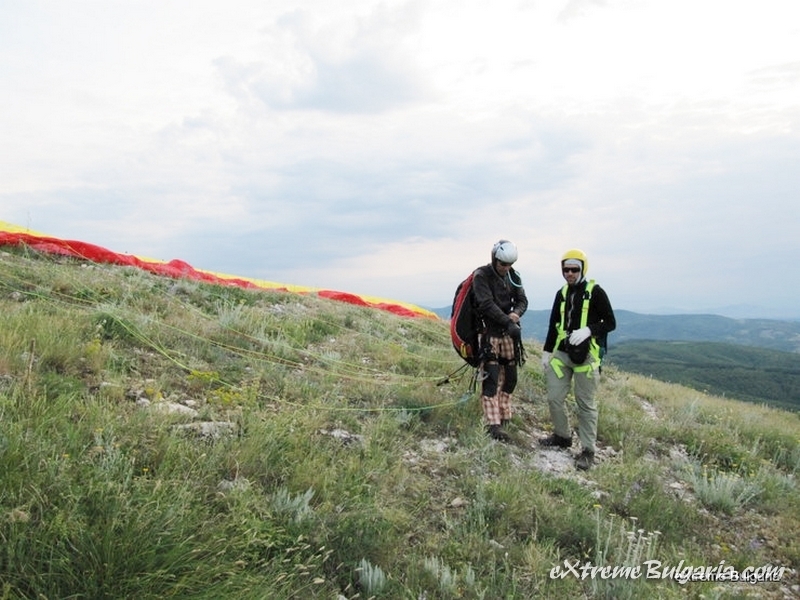 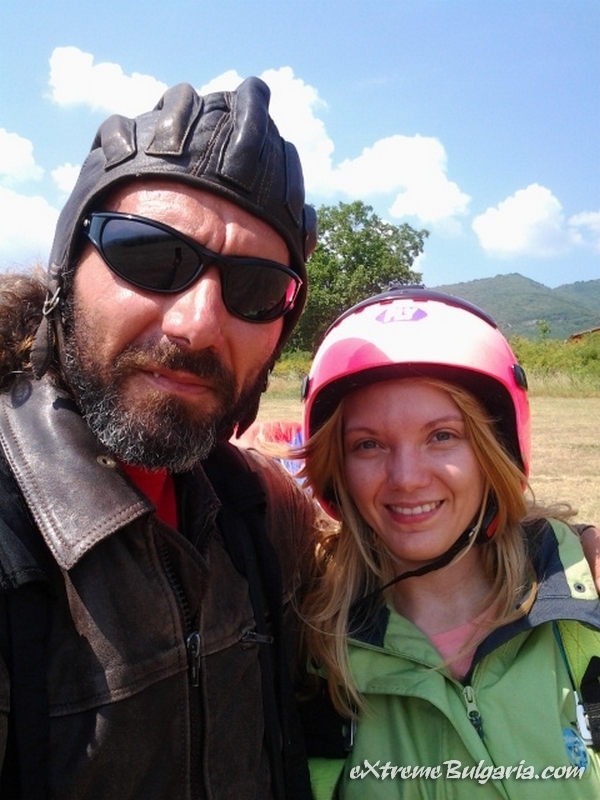 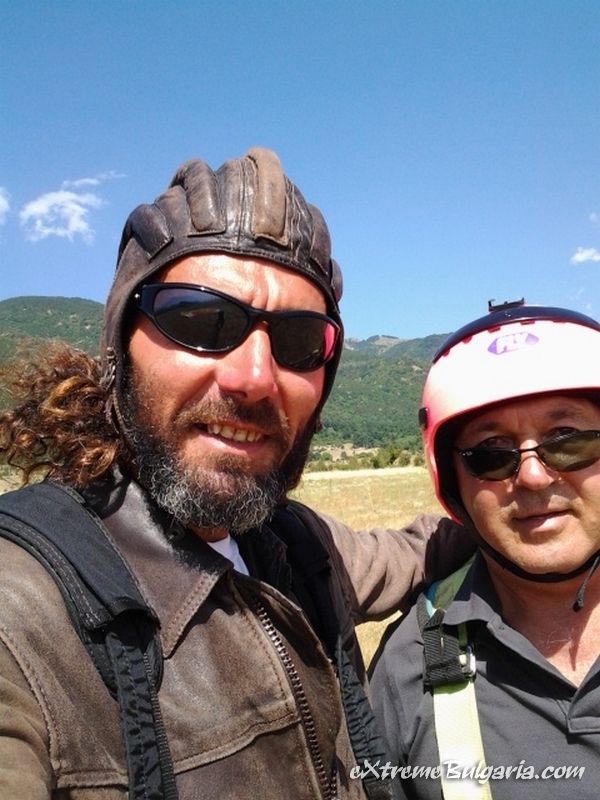 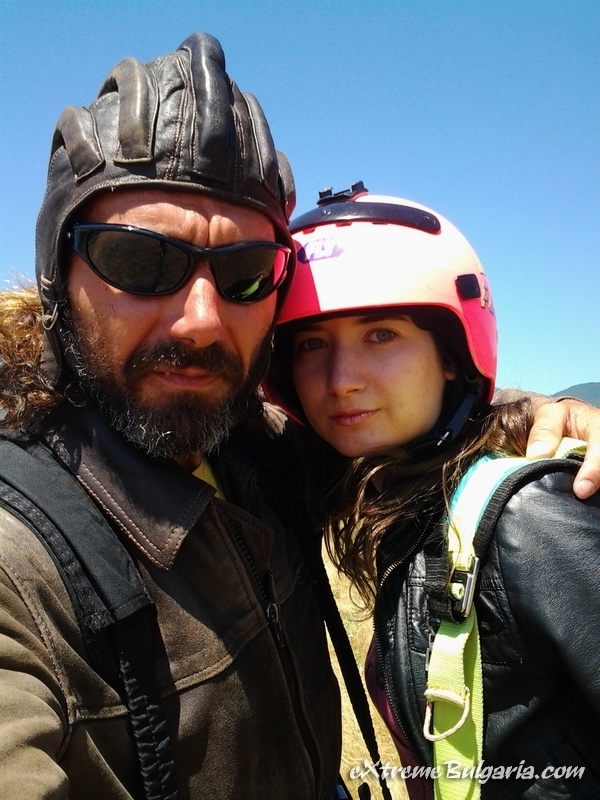 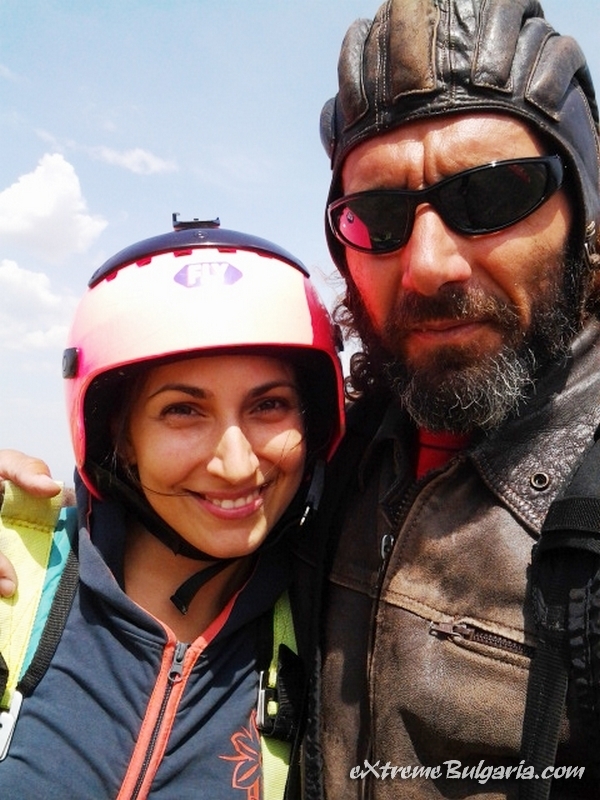 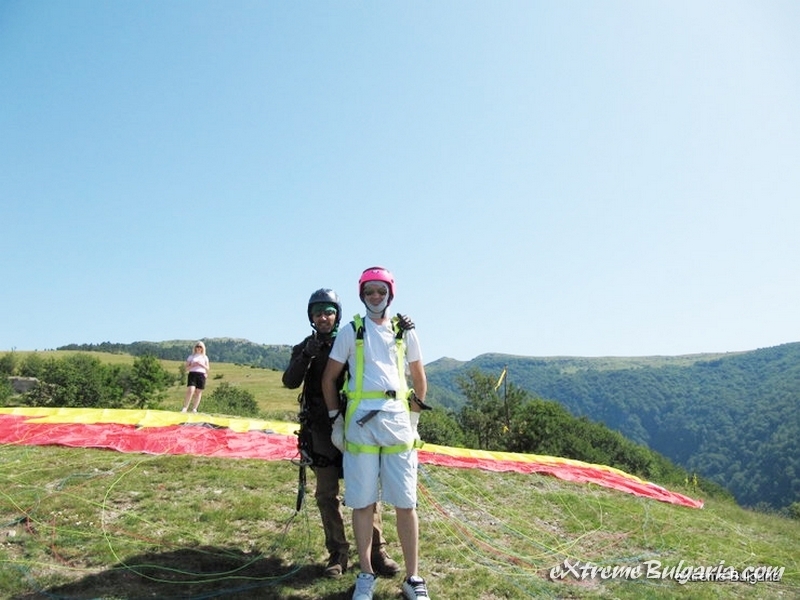 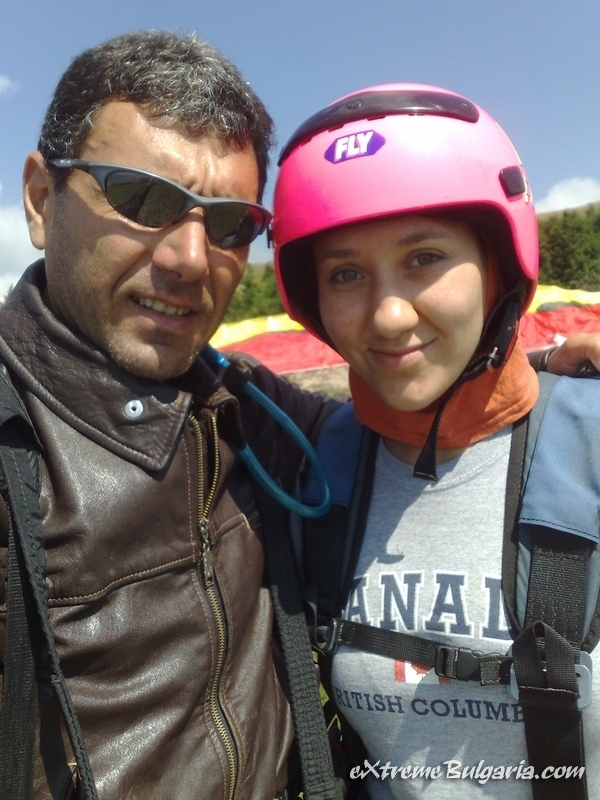 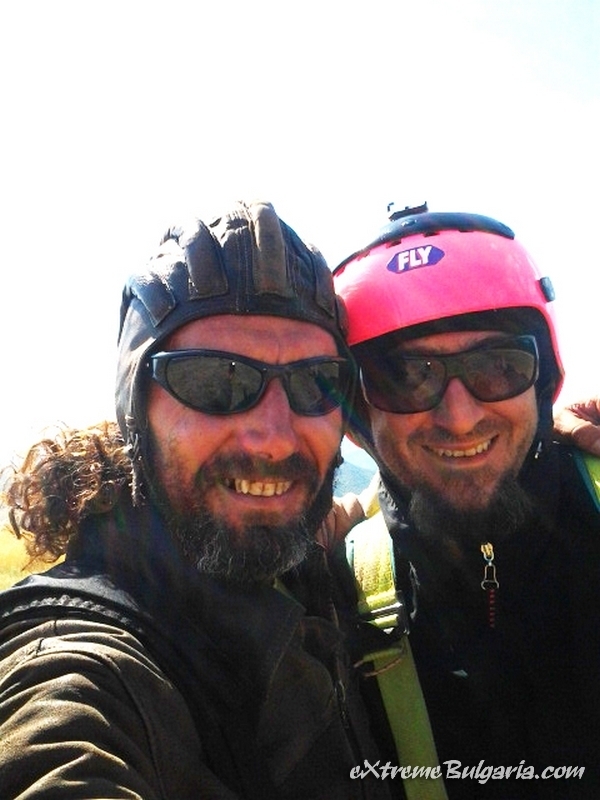 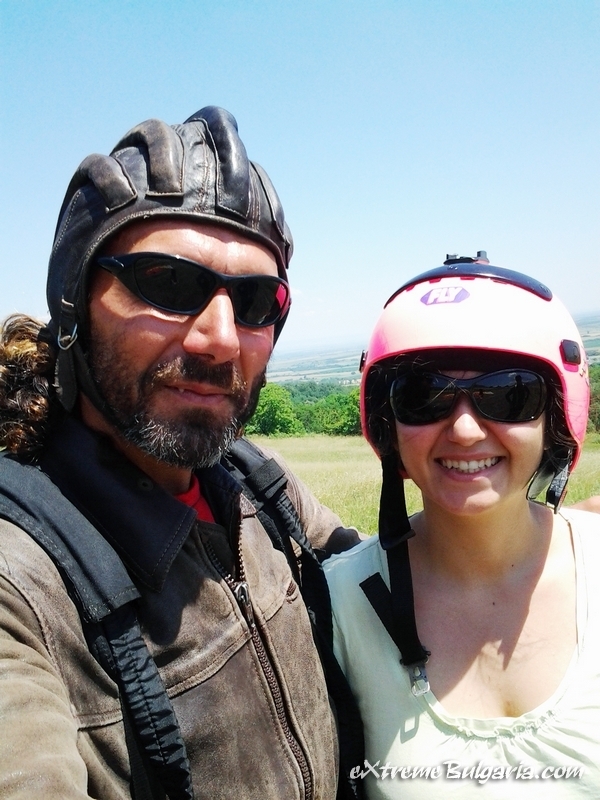 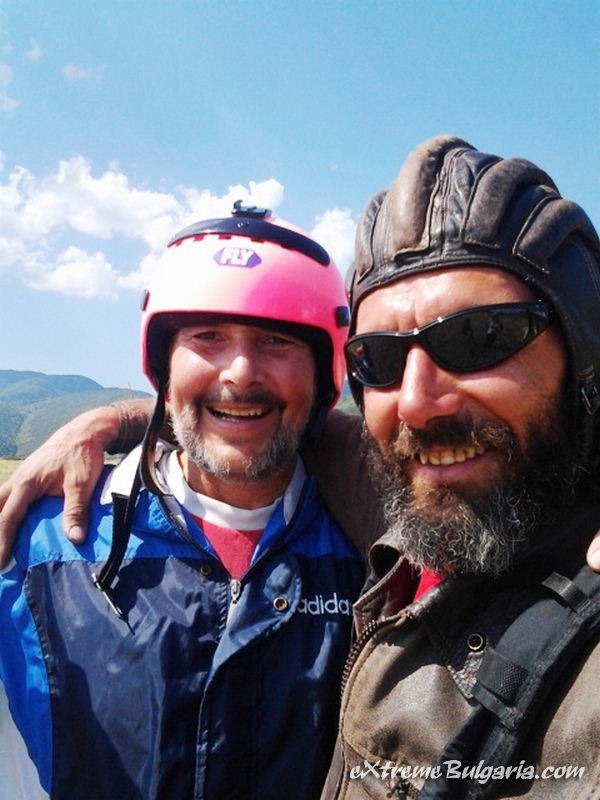 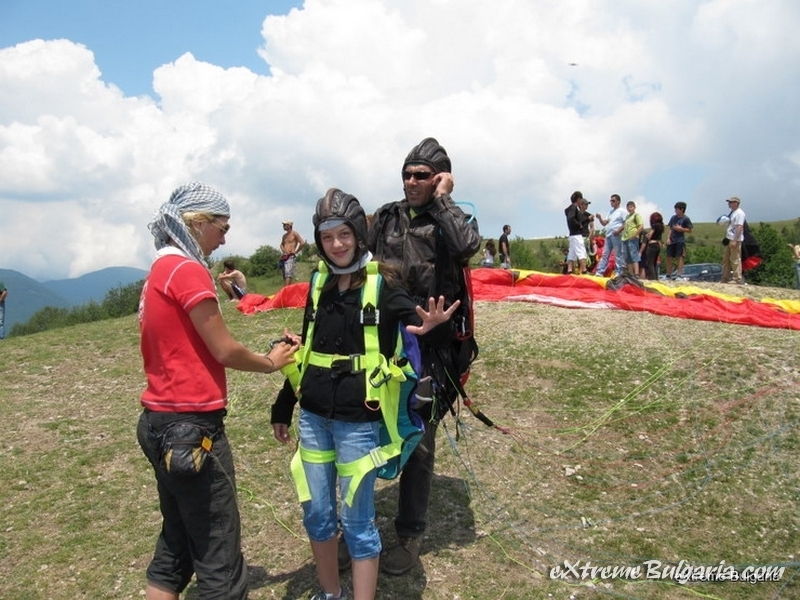 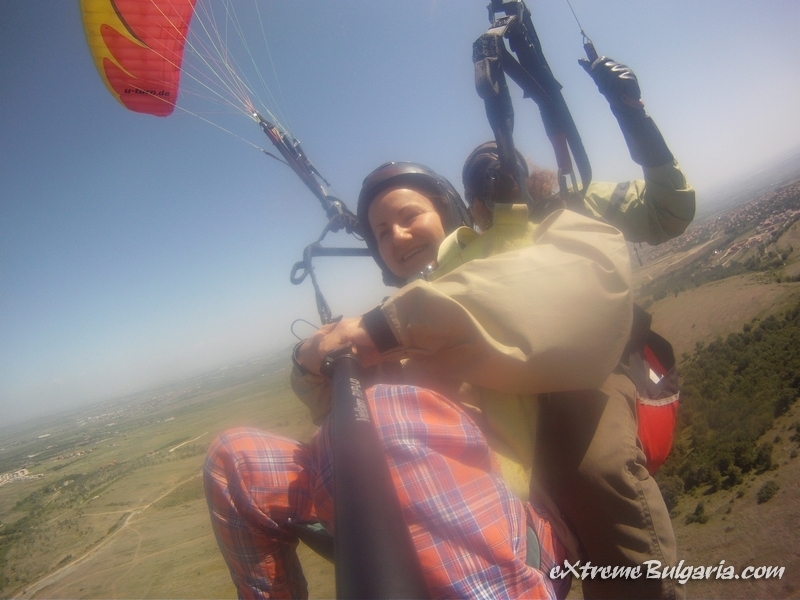 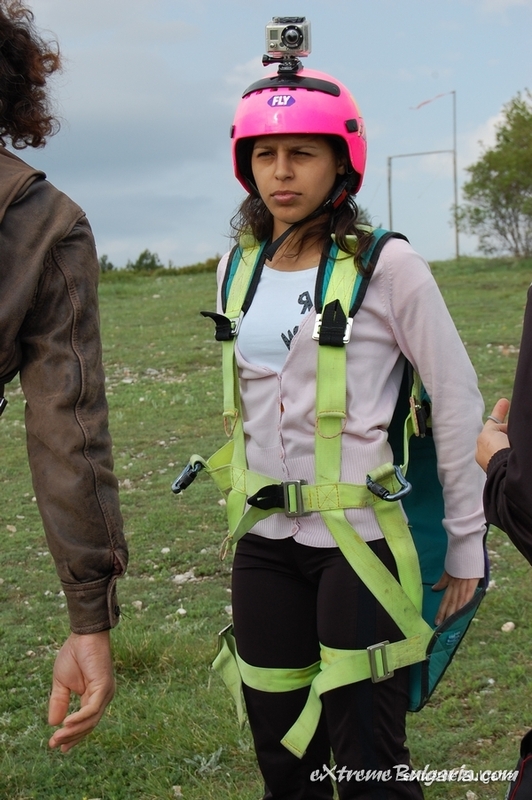 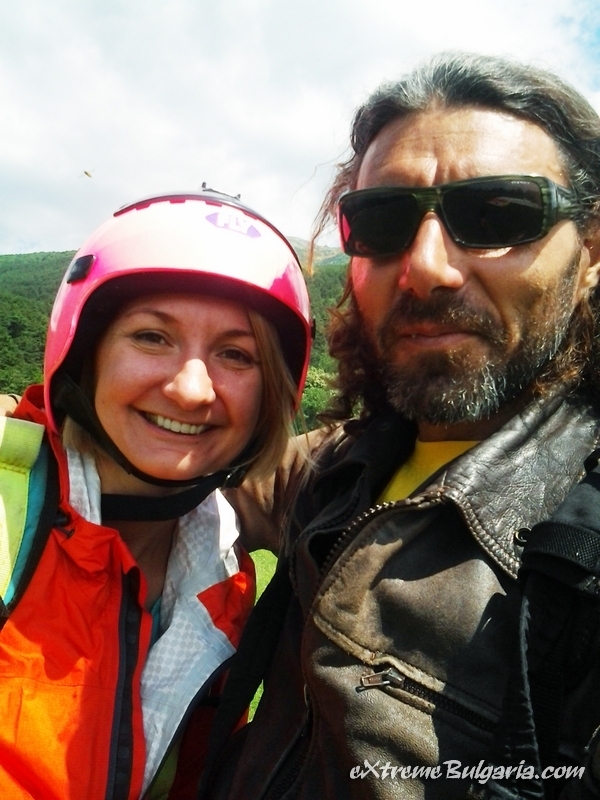 For all of you - that have a tandem paragliding flight with us last 8 years we have a new offer, eXtreme surprise - XDay with more than three activities- tandem paragliding flight, off road trip in Sredna gora Mountain with ATV HONDA TRX and finally - the gift! 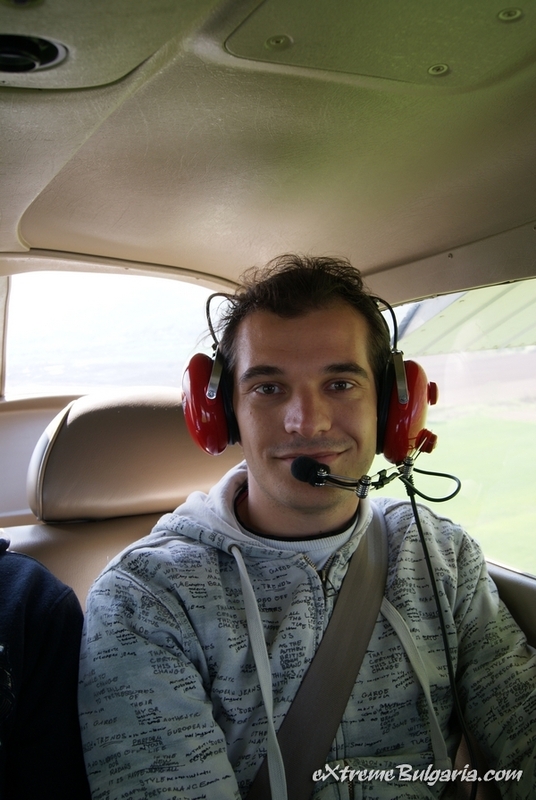 Plane flight! 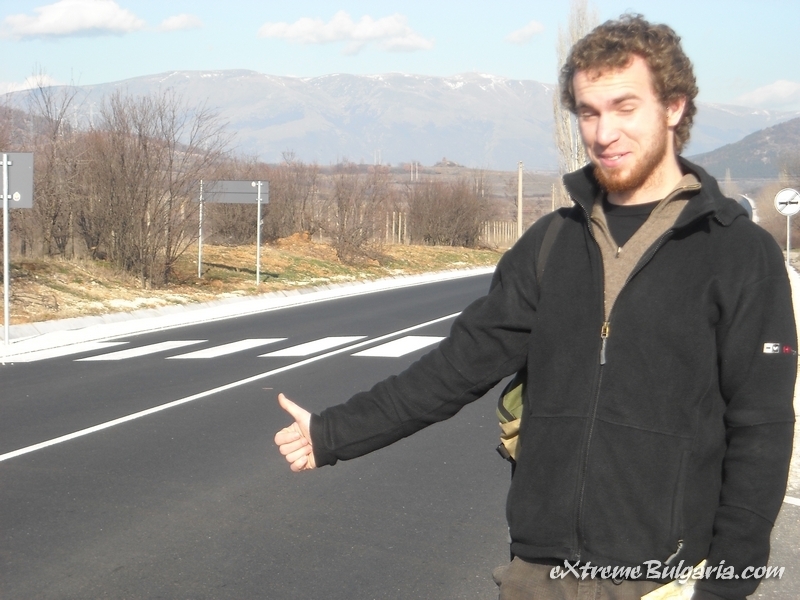 For more information, you need to send a request via e-mail! 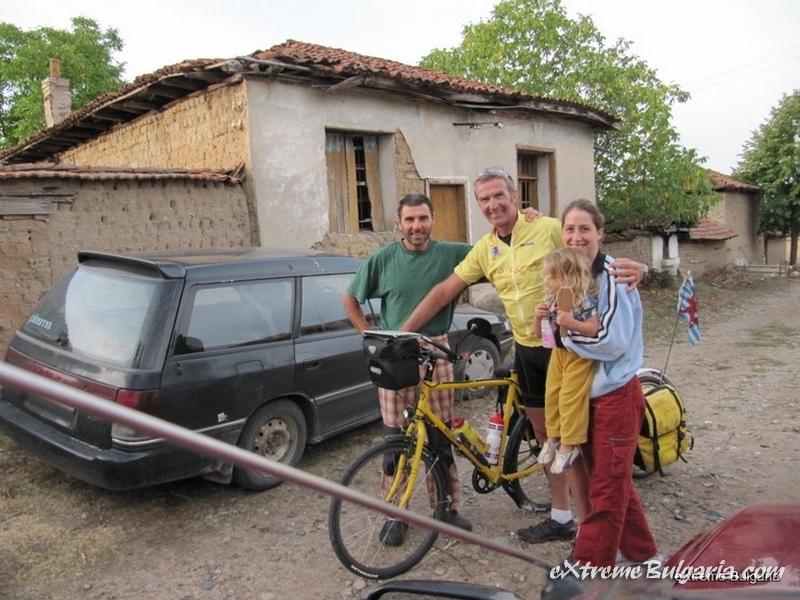 In Bulgaria, there are perfect circumstances for bike tourism. 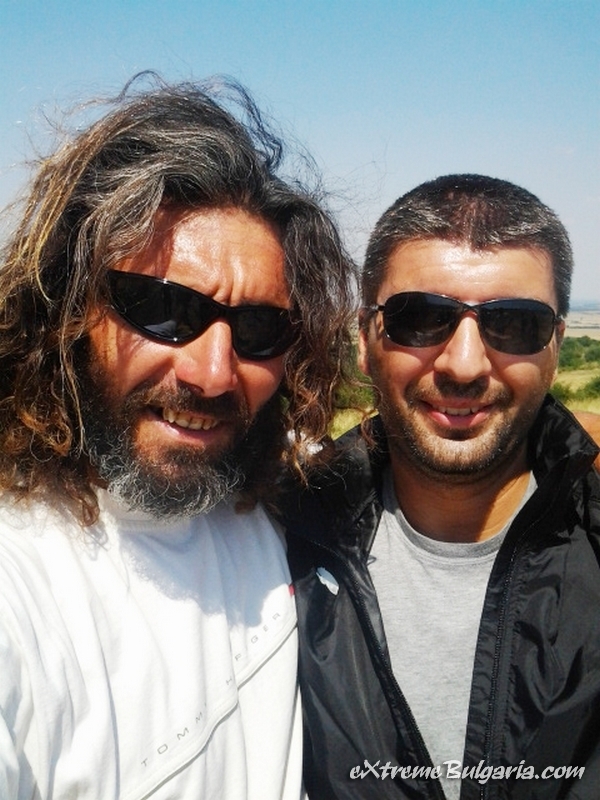 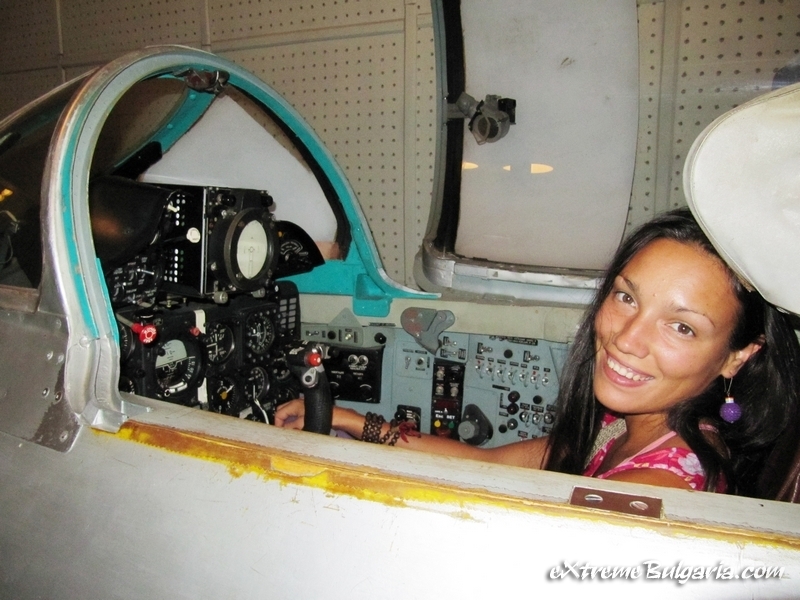 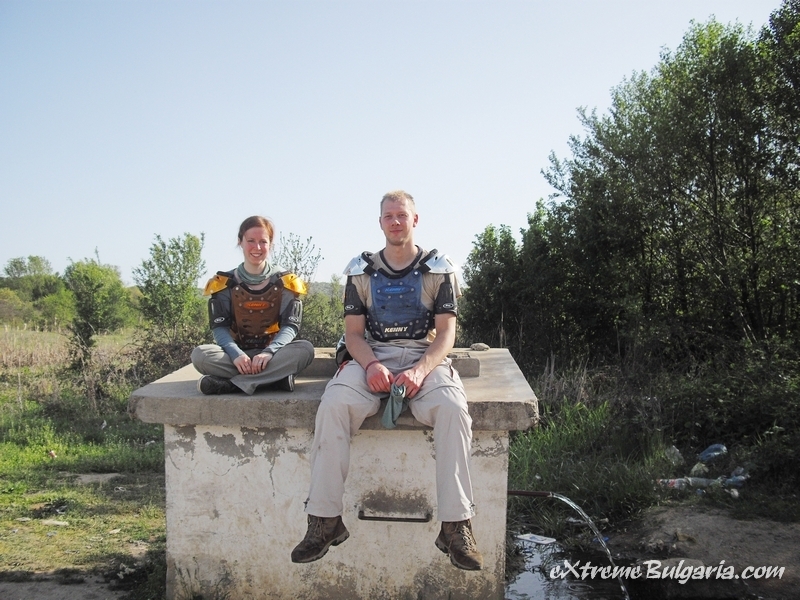 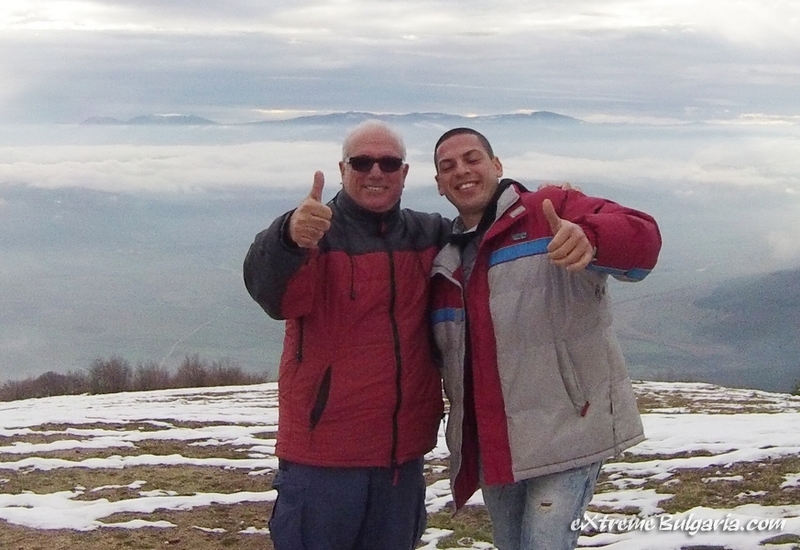 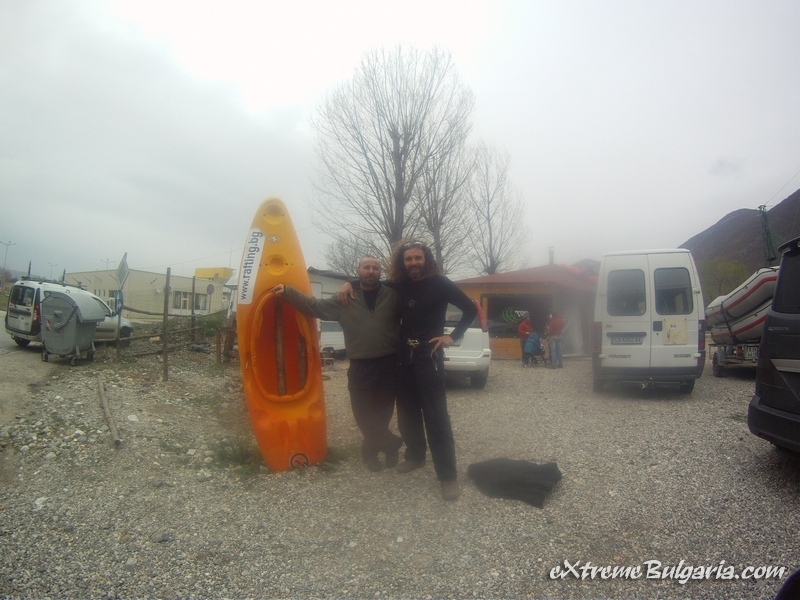 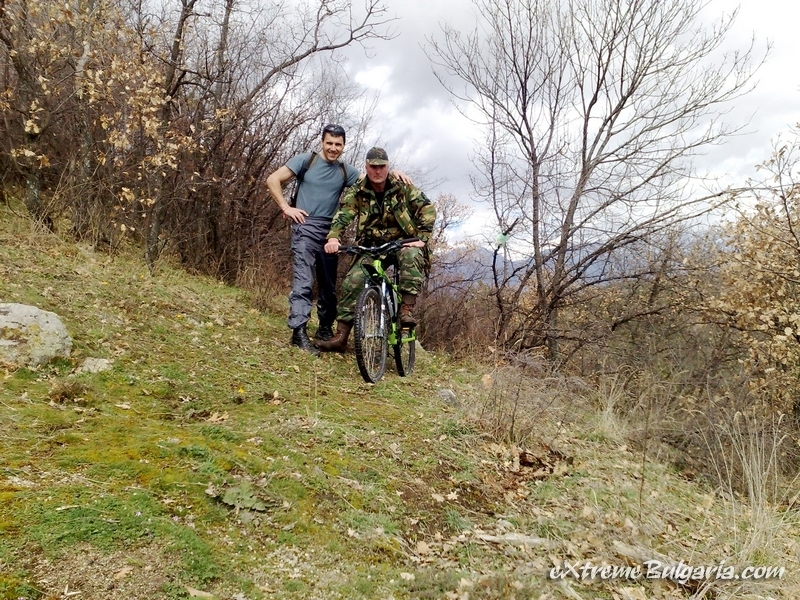 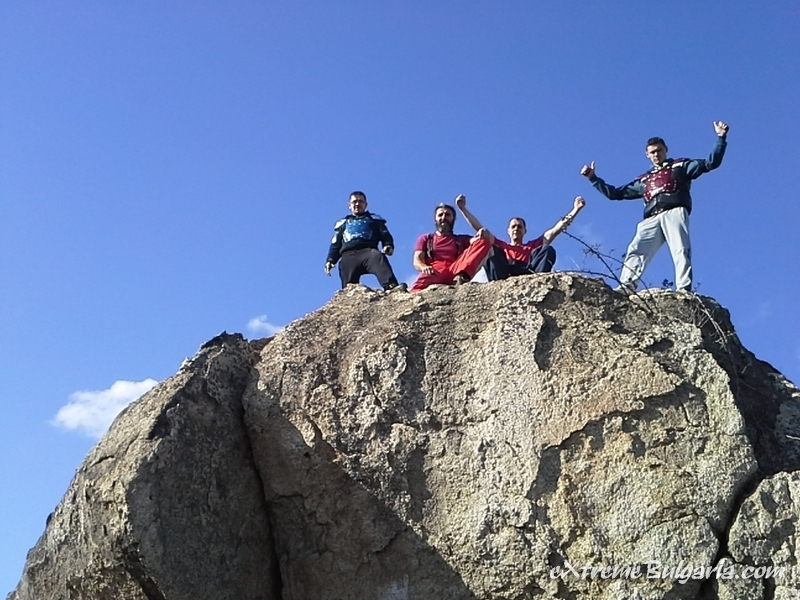 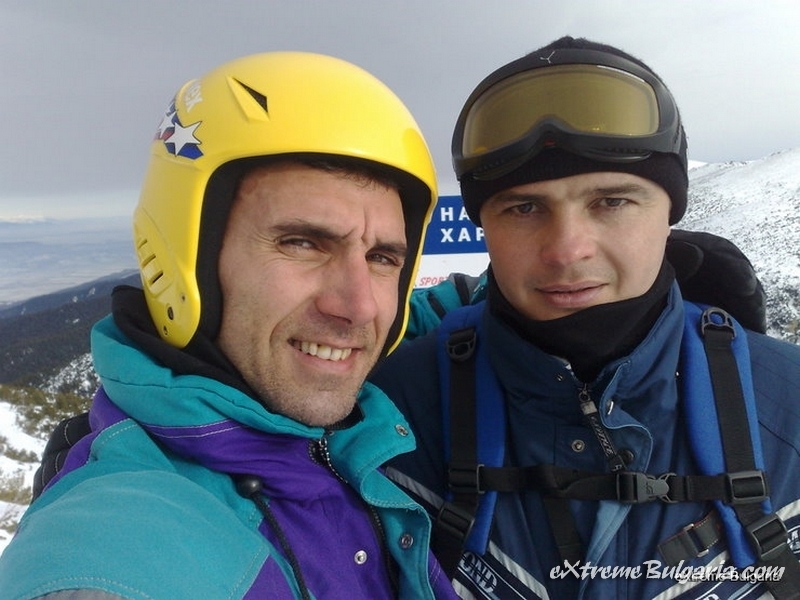 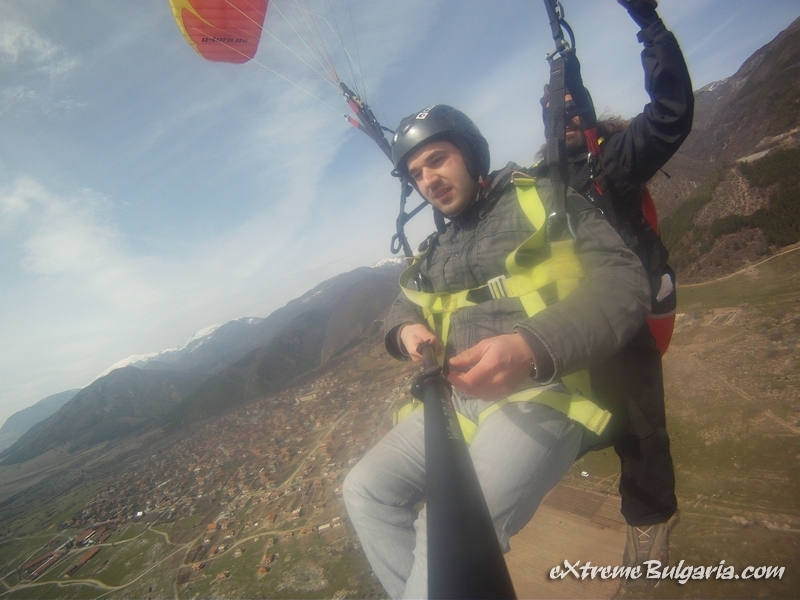 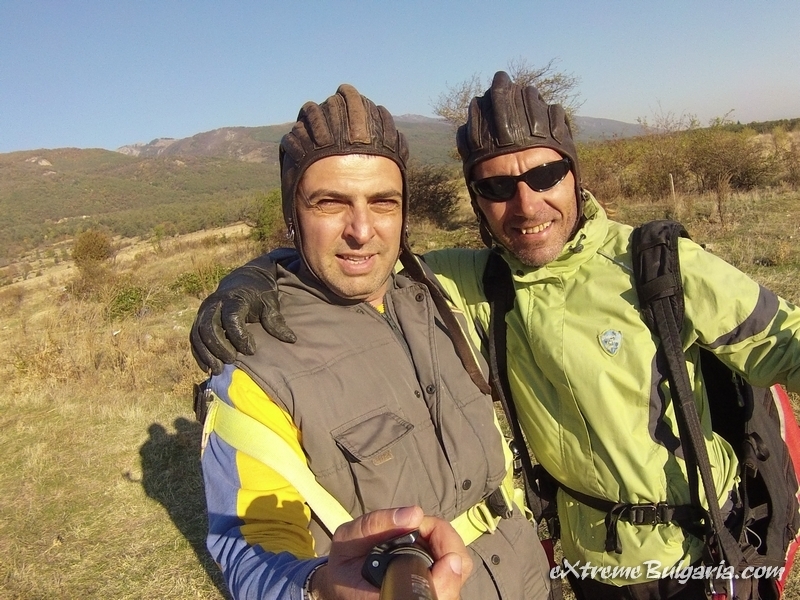 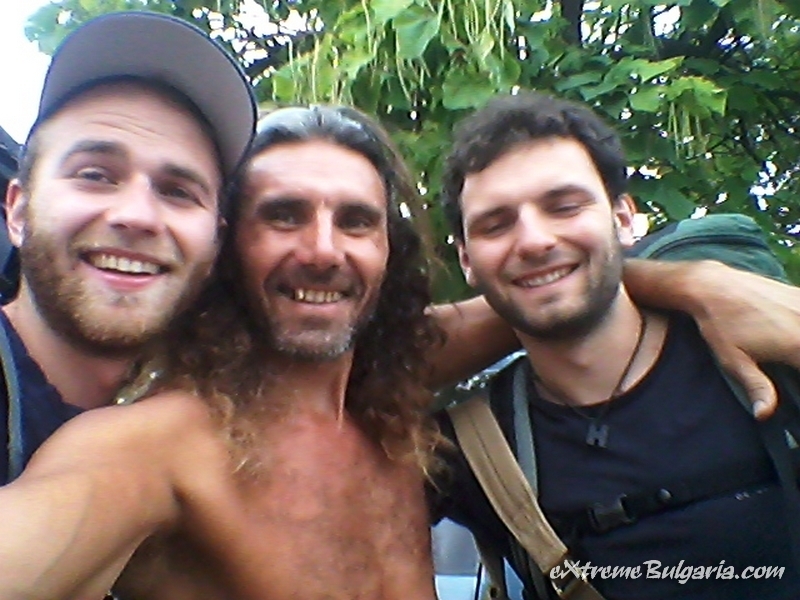 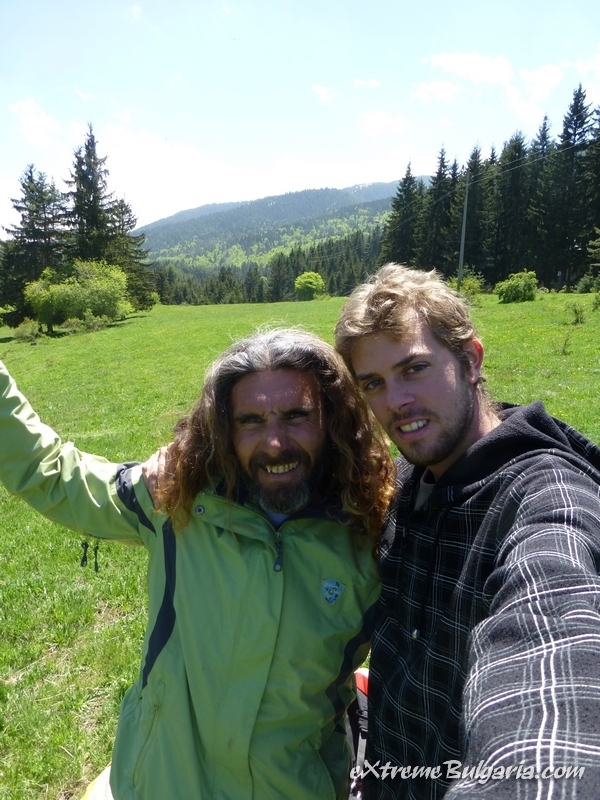 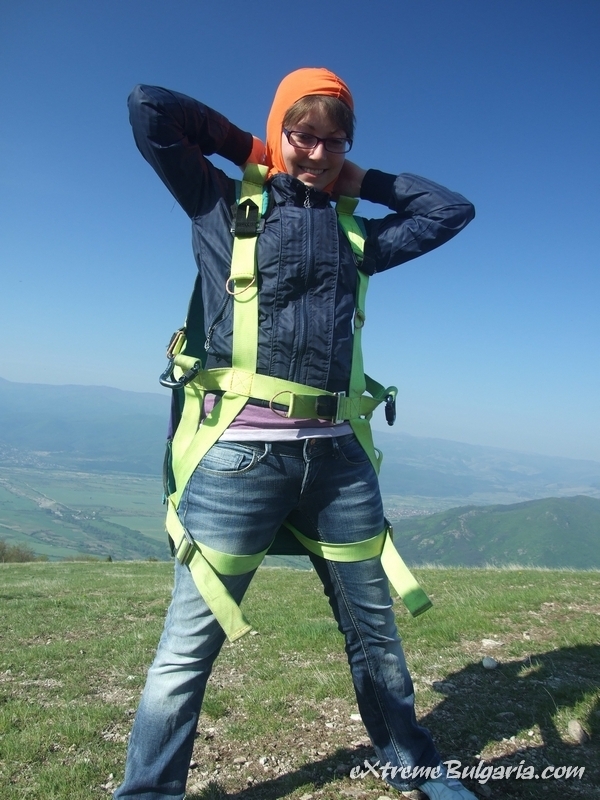 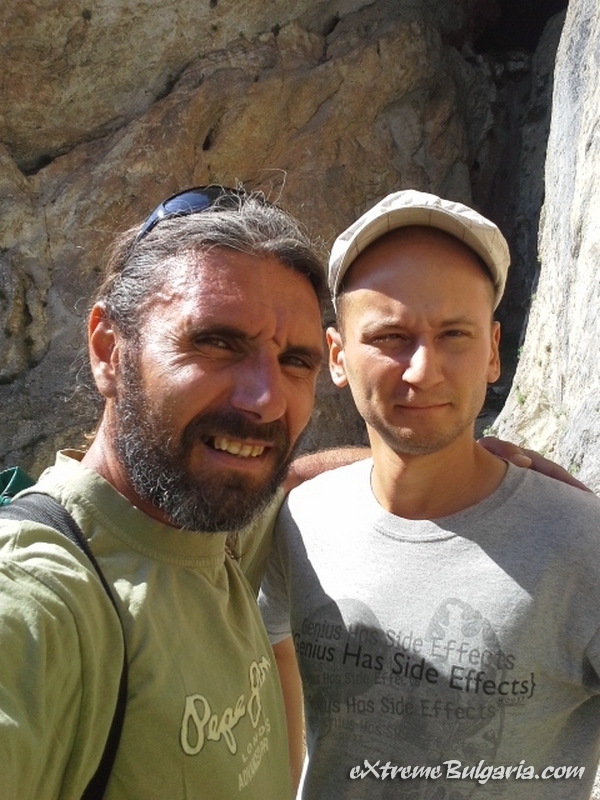 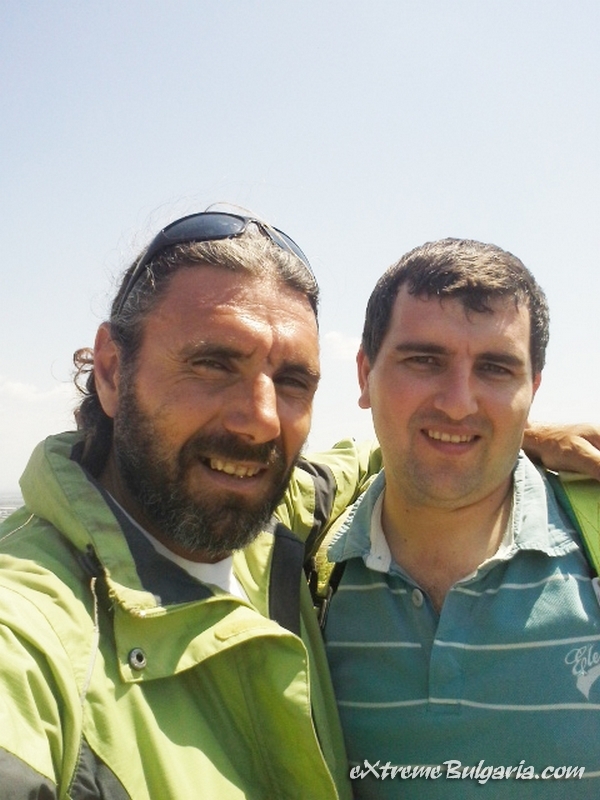 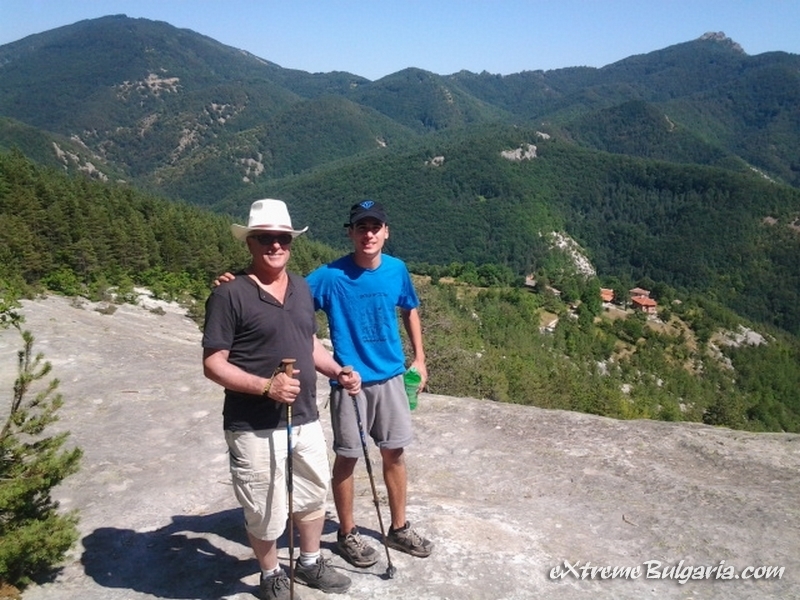 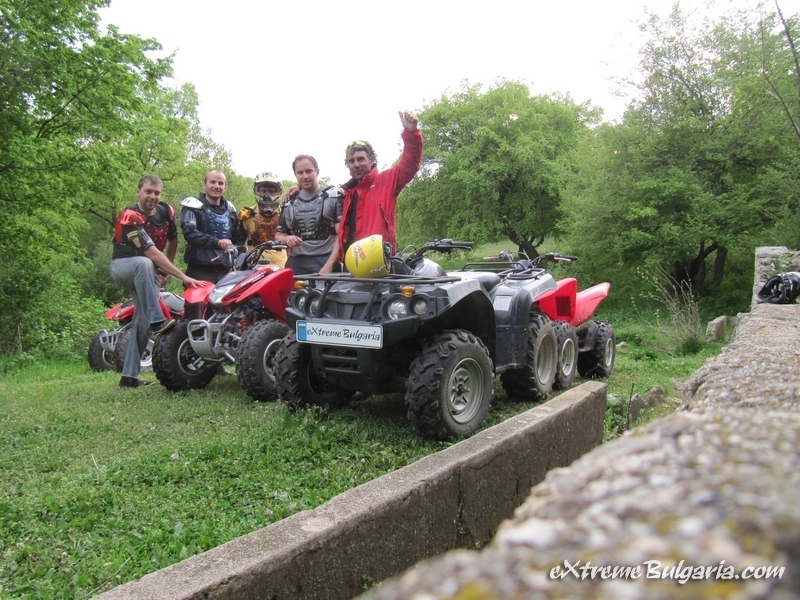 Post 24 April 2014	In About "CLUB EXTREME BULGARIA"
Spend an unforgettable extreme week in Bulgaria in the pleasant company of a truly extraordinary adventurer. 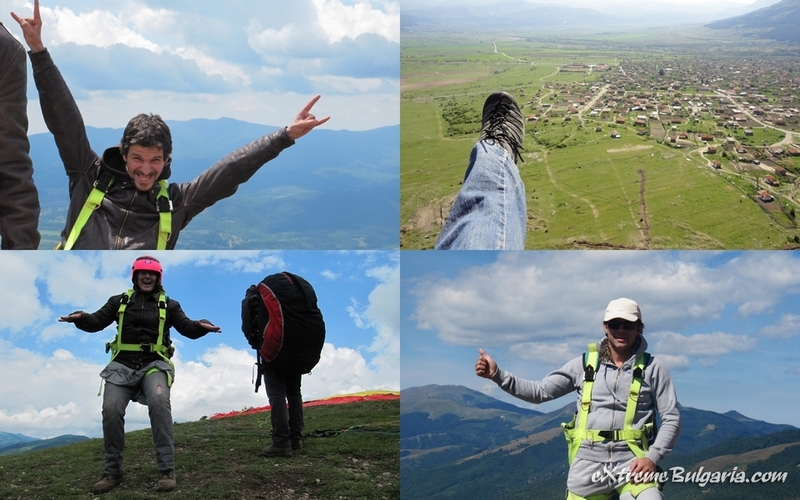 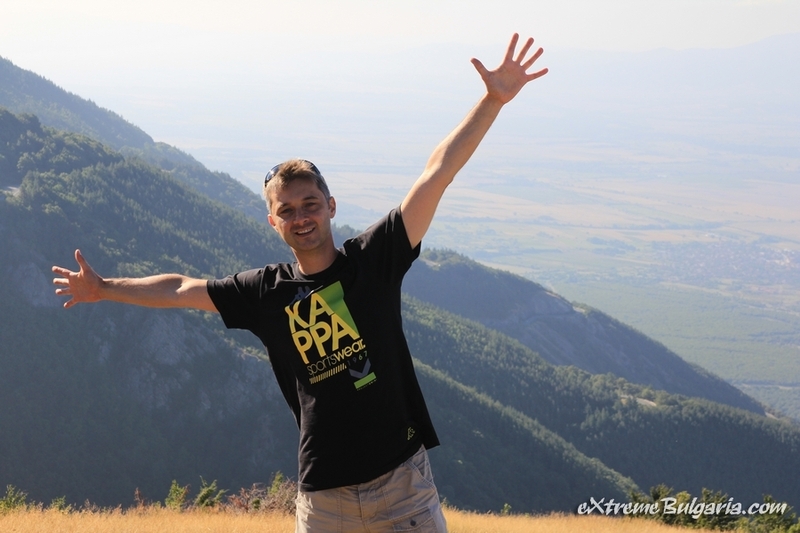 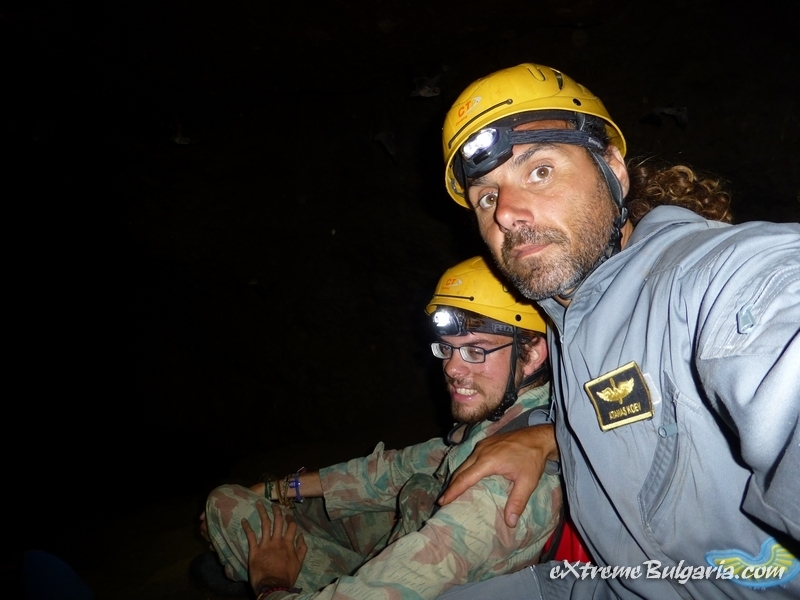 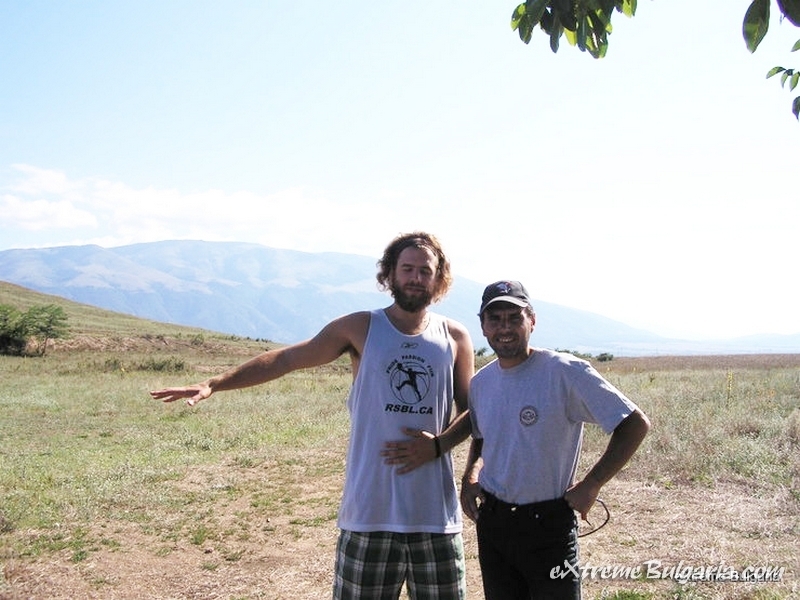 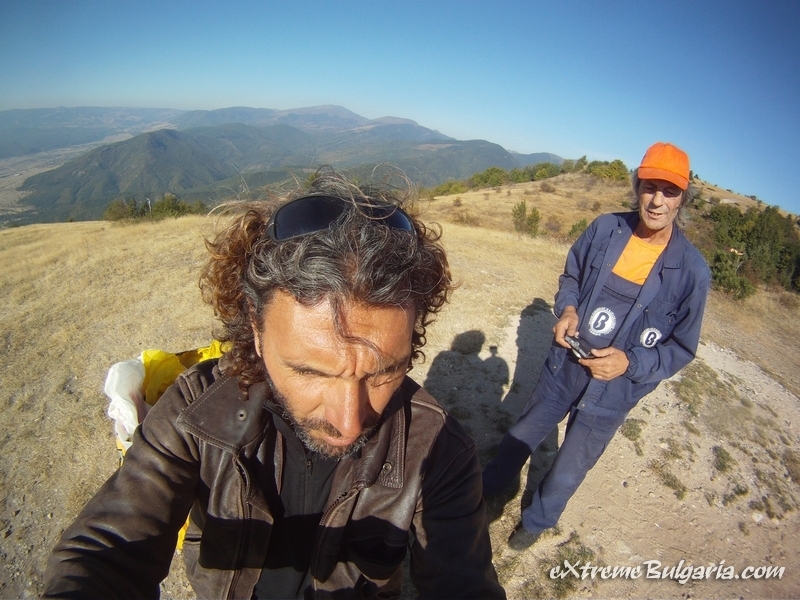 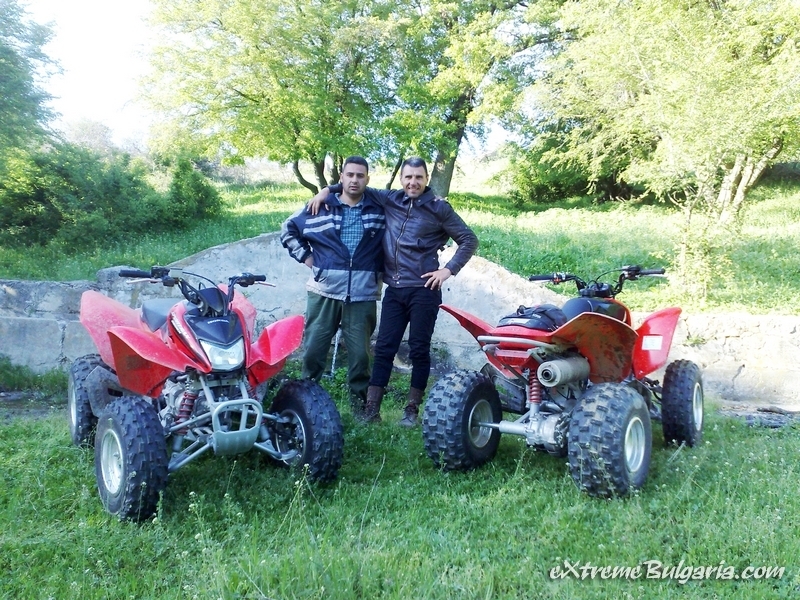 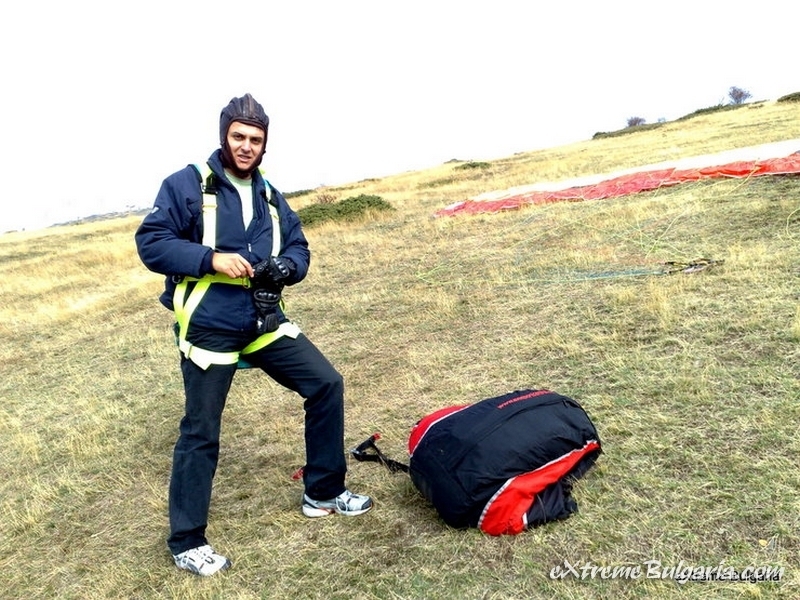 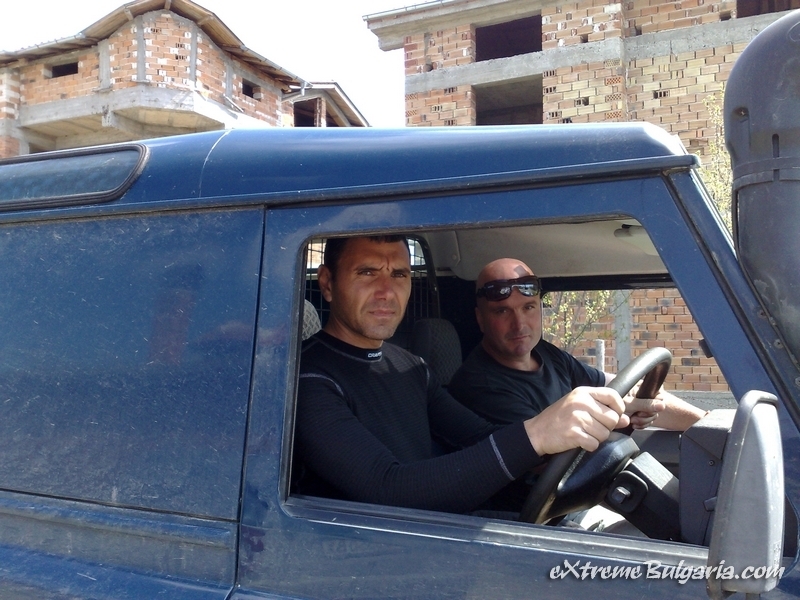 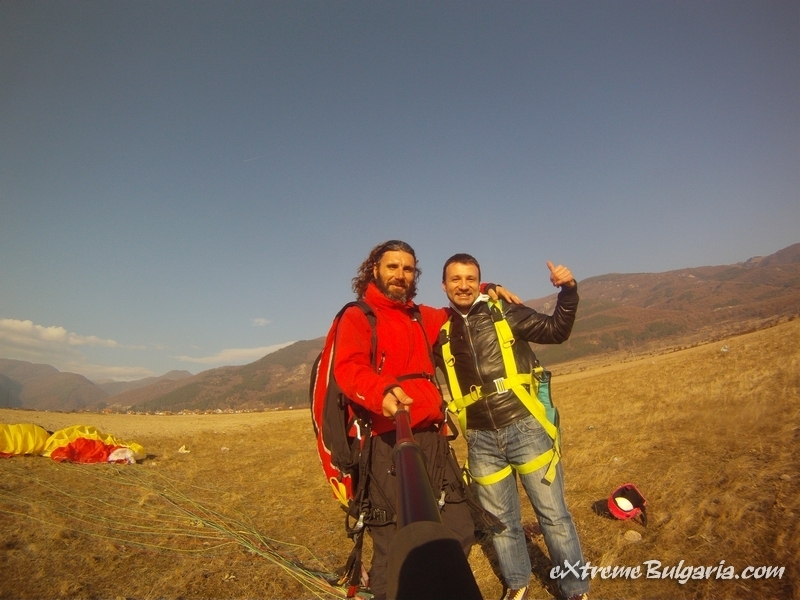 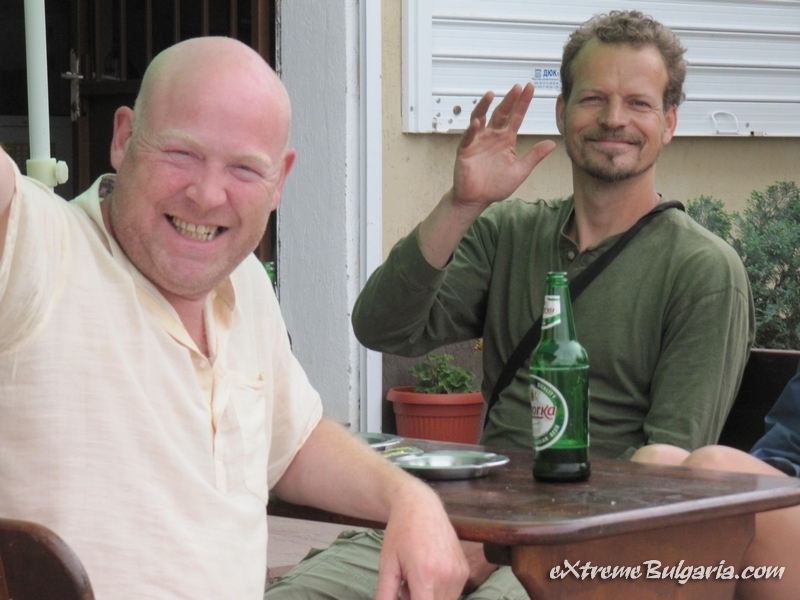 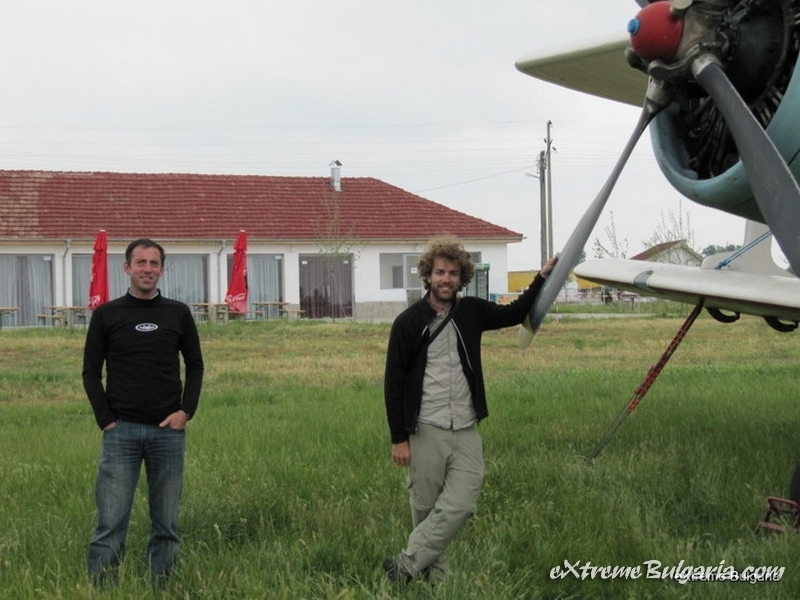 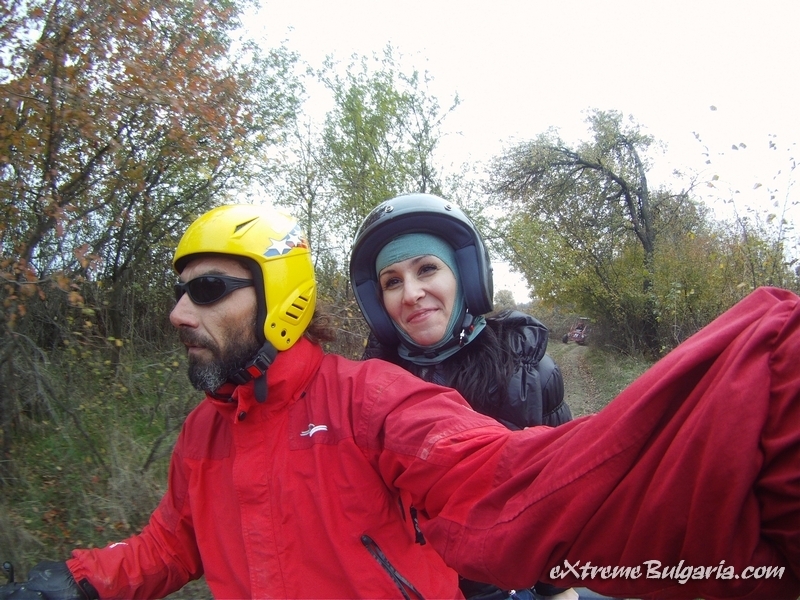 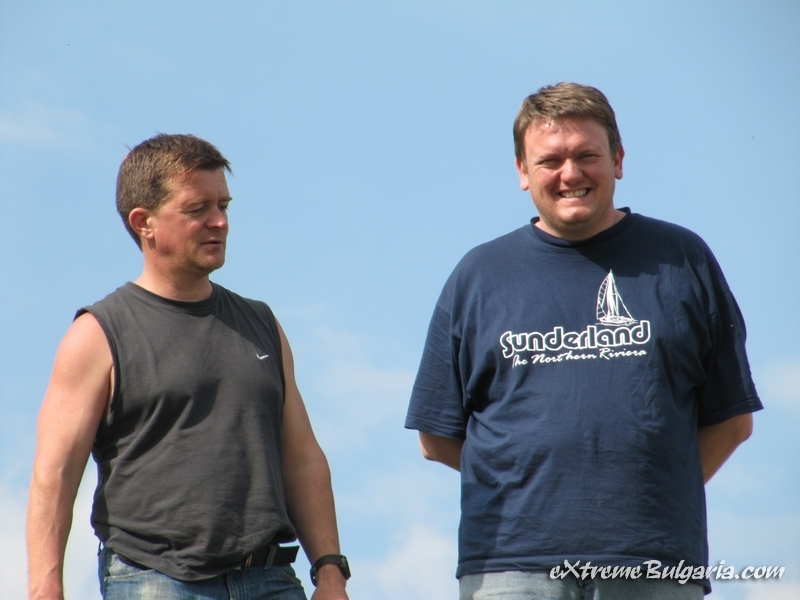 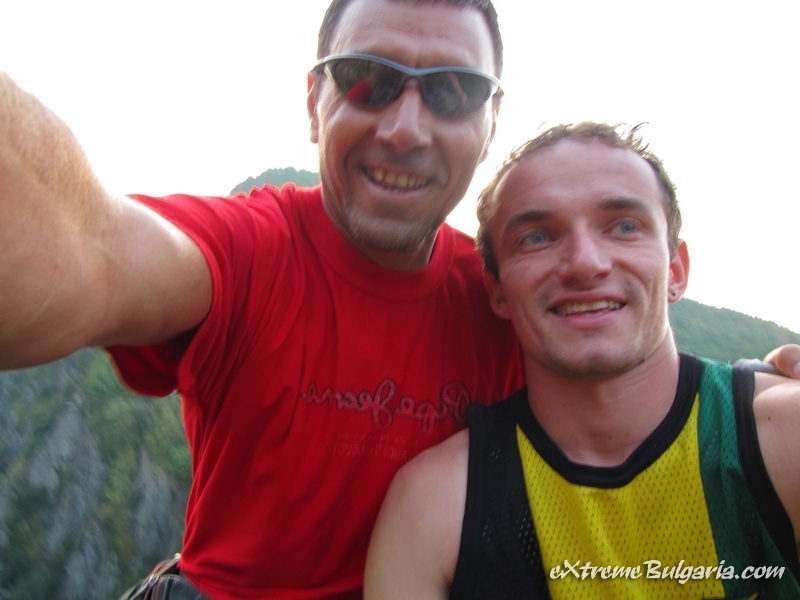 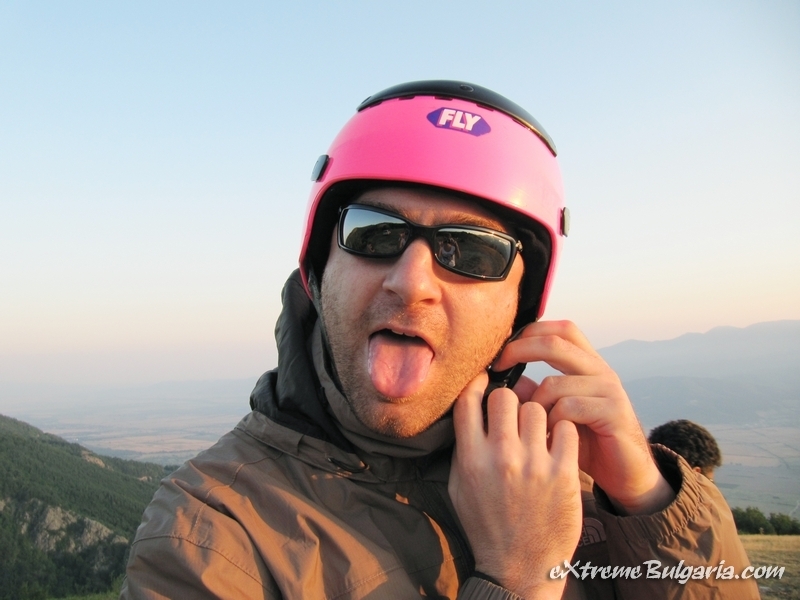 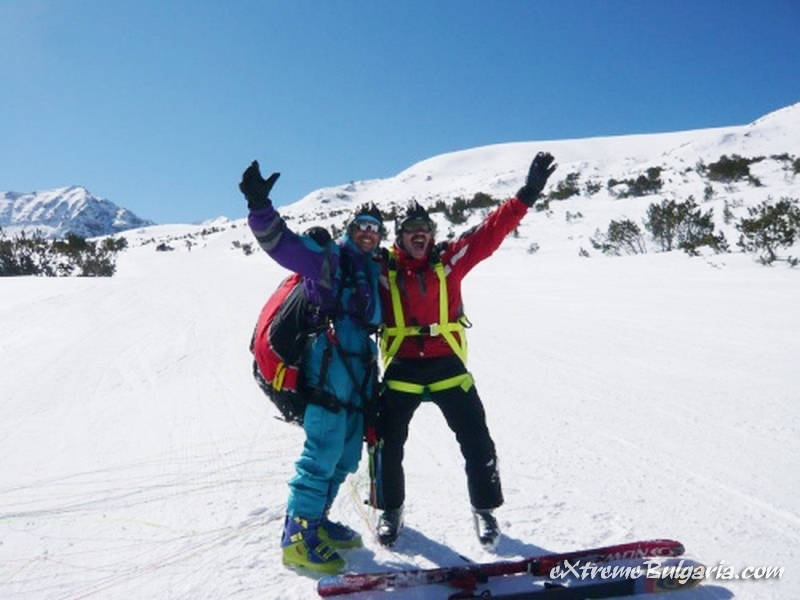 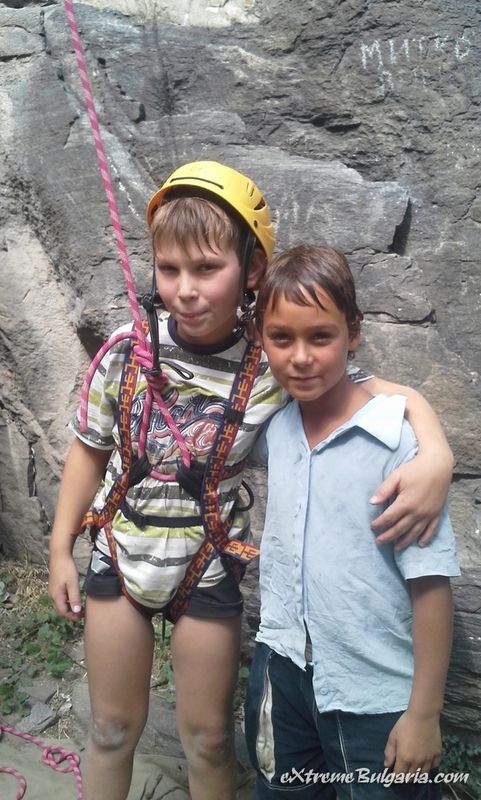 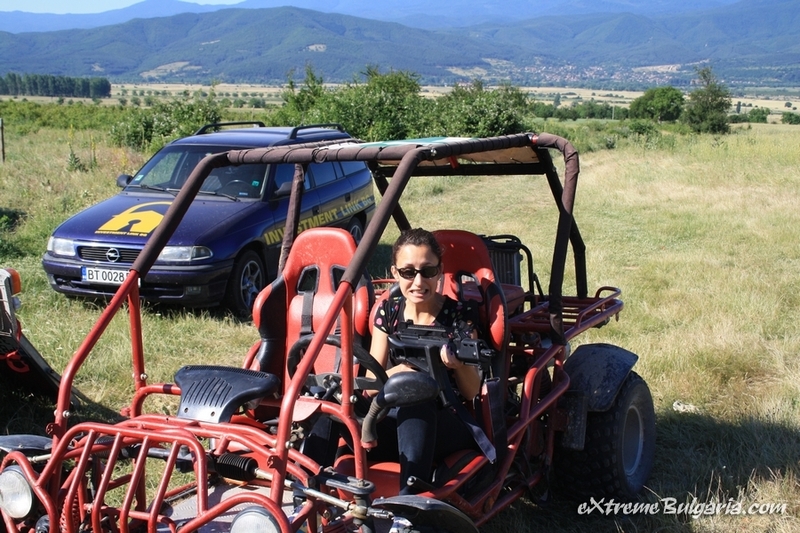 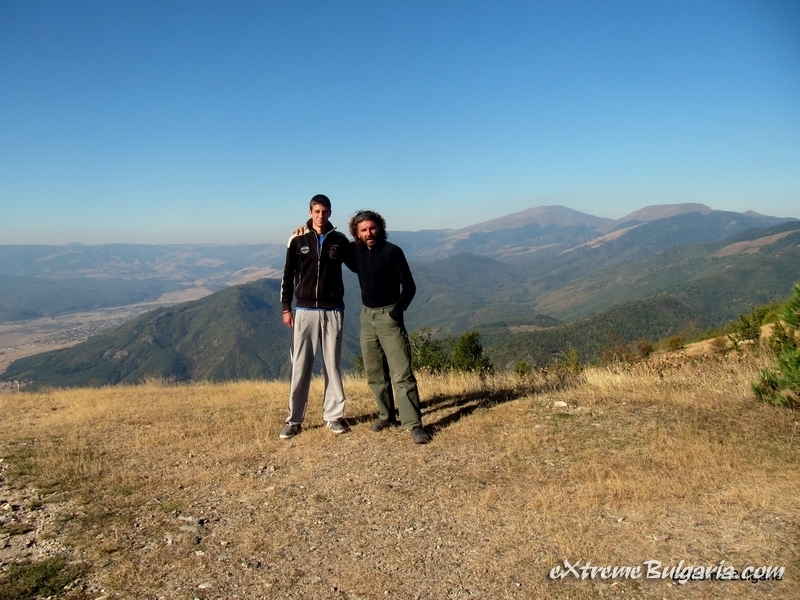 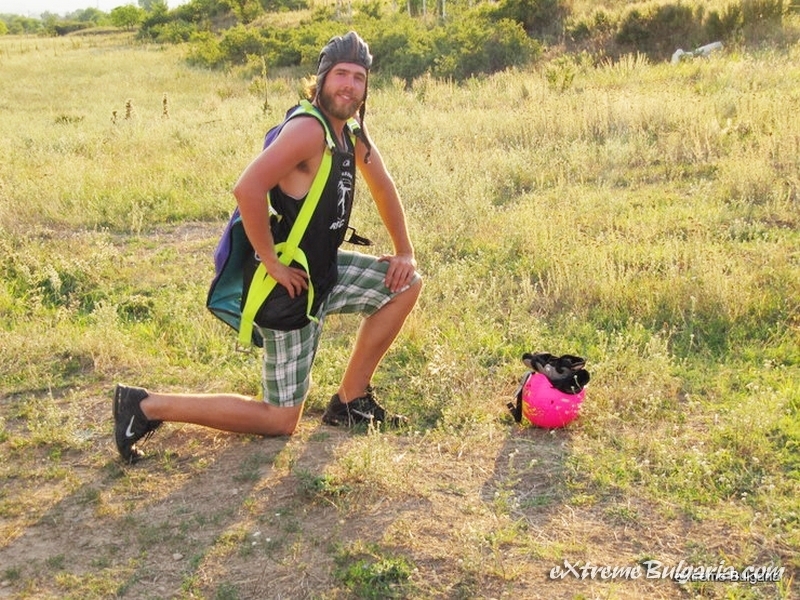 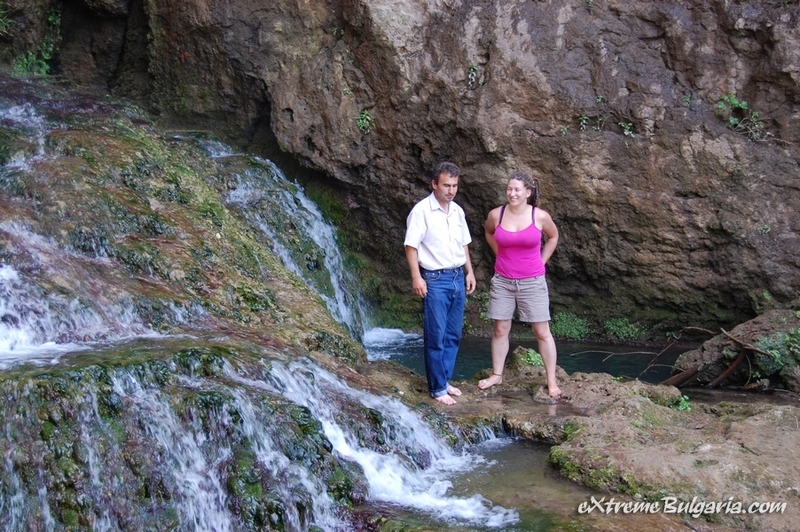 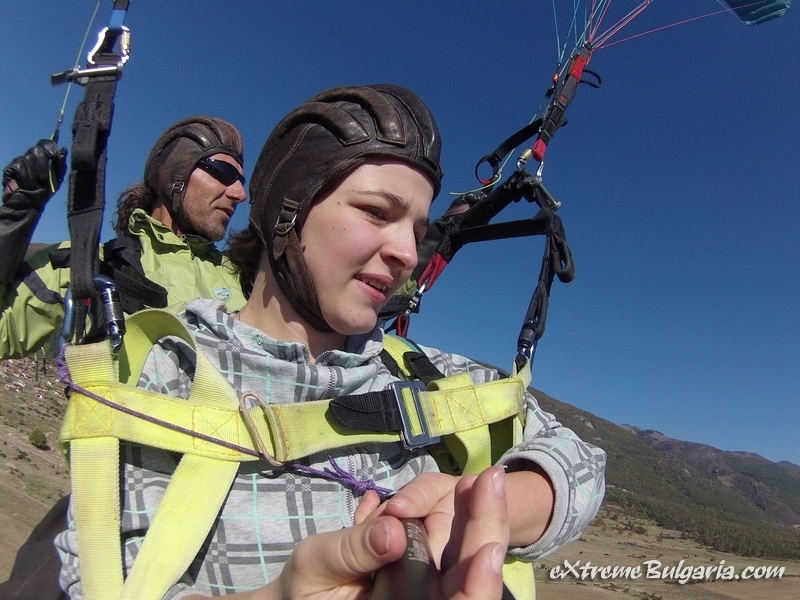 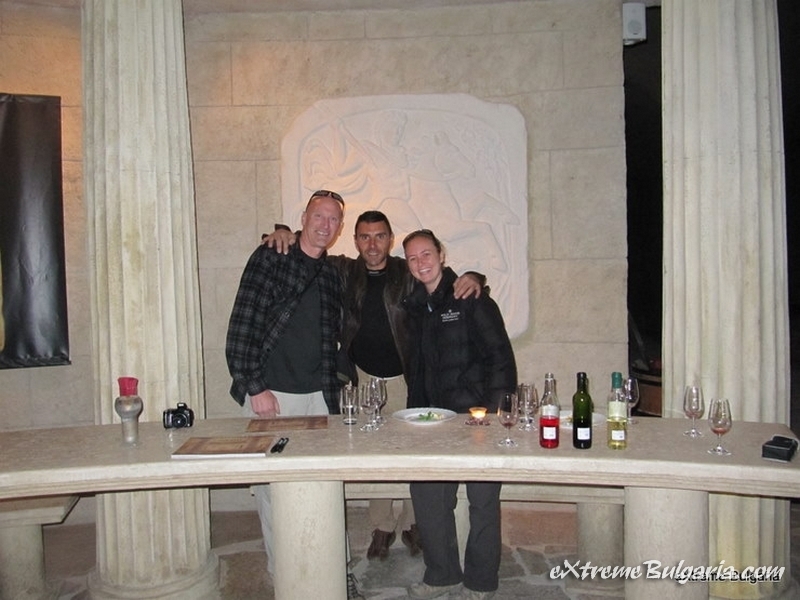 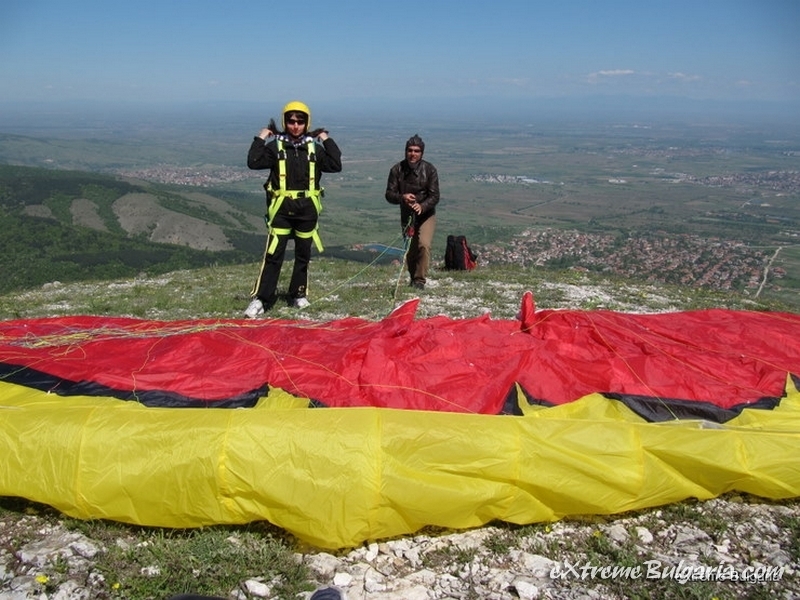 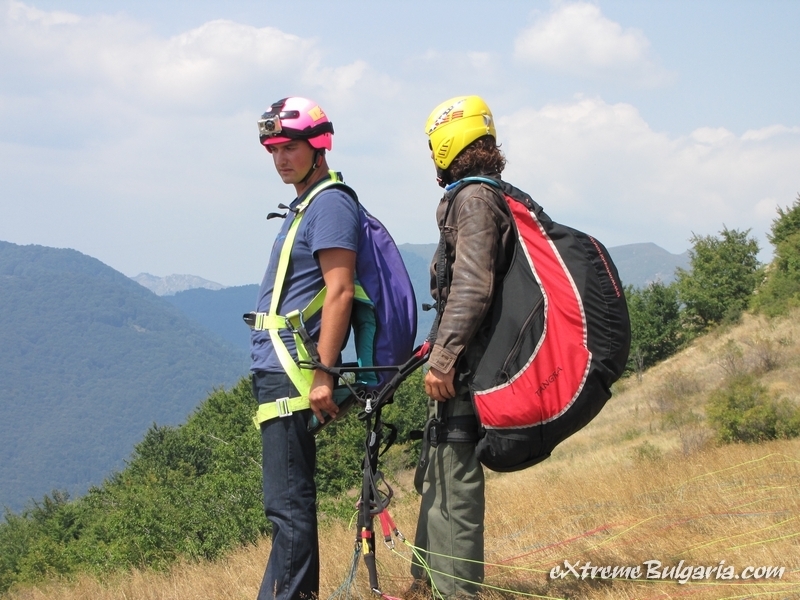 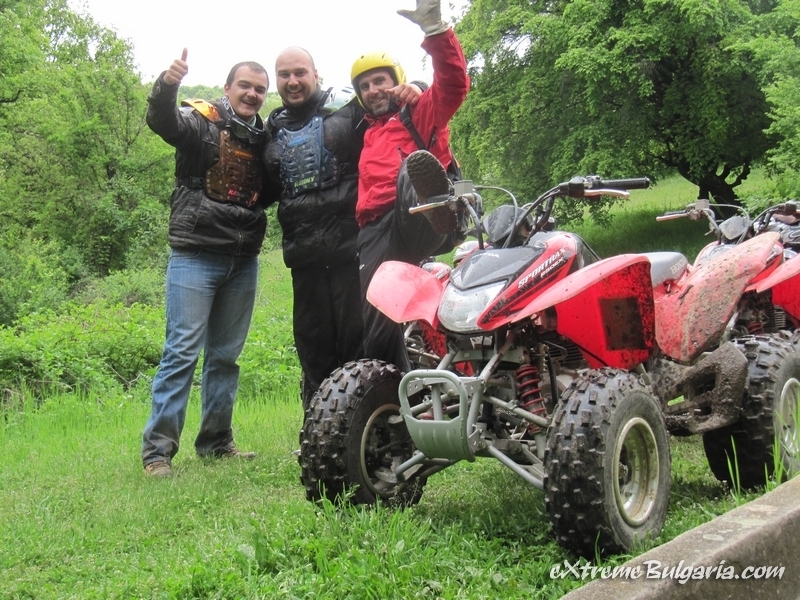 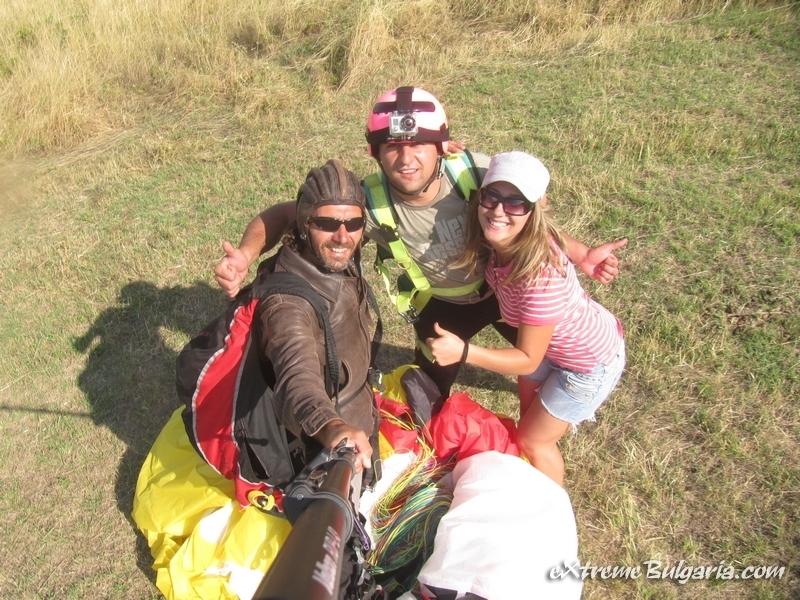 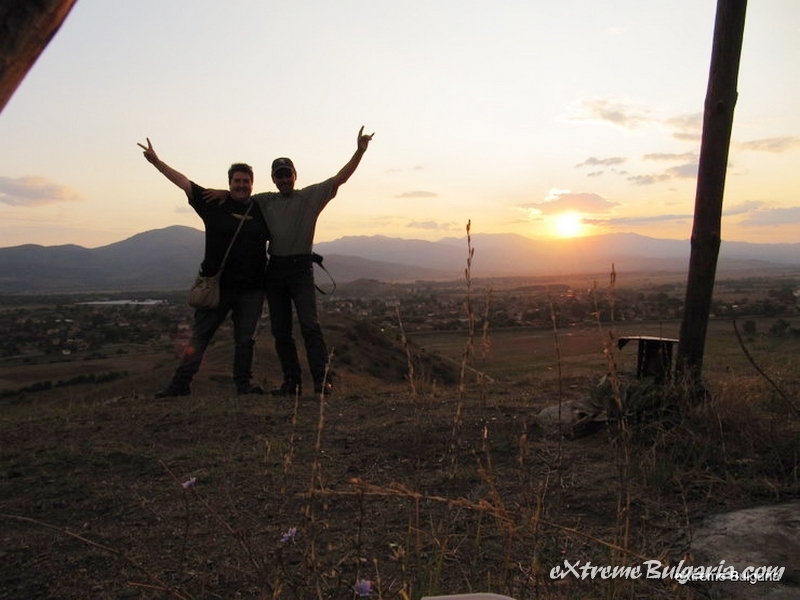 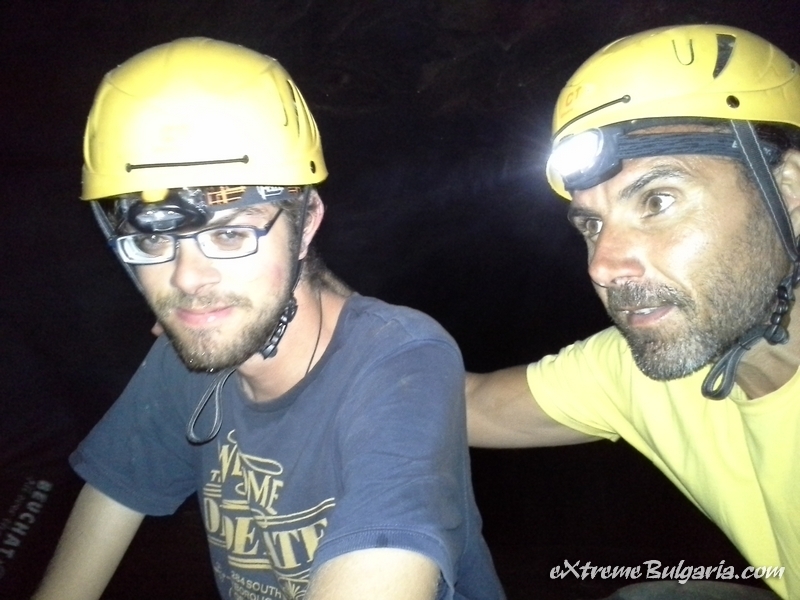 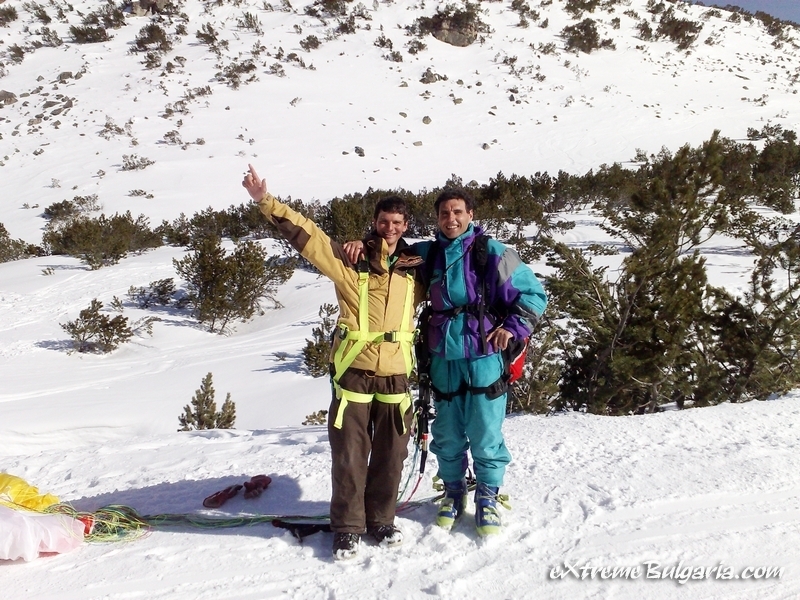 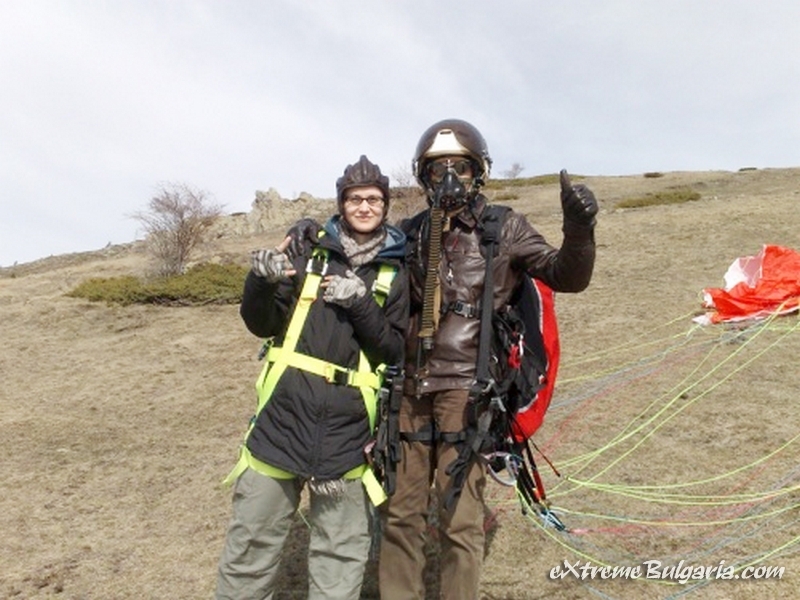 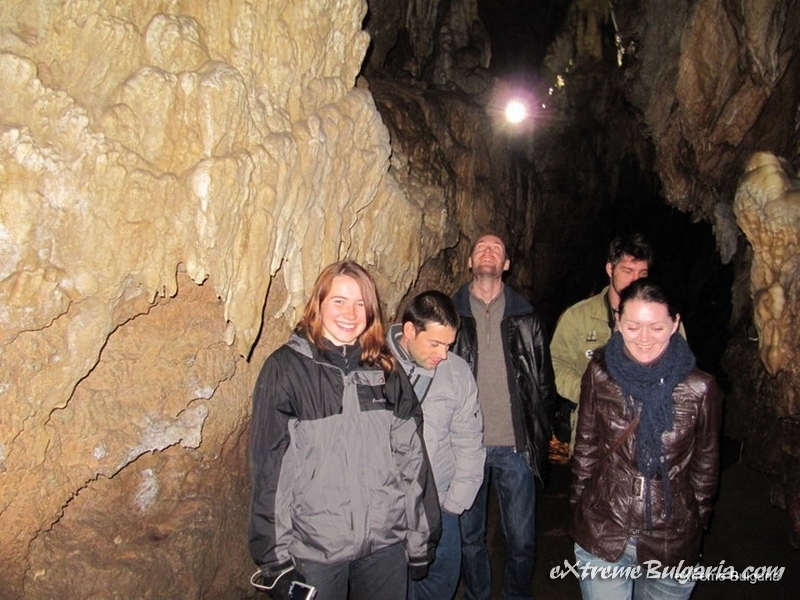 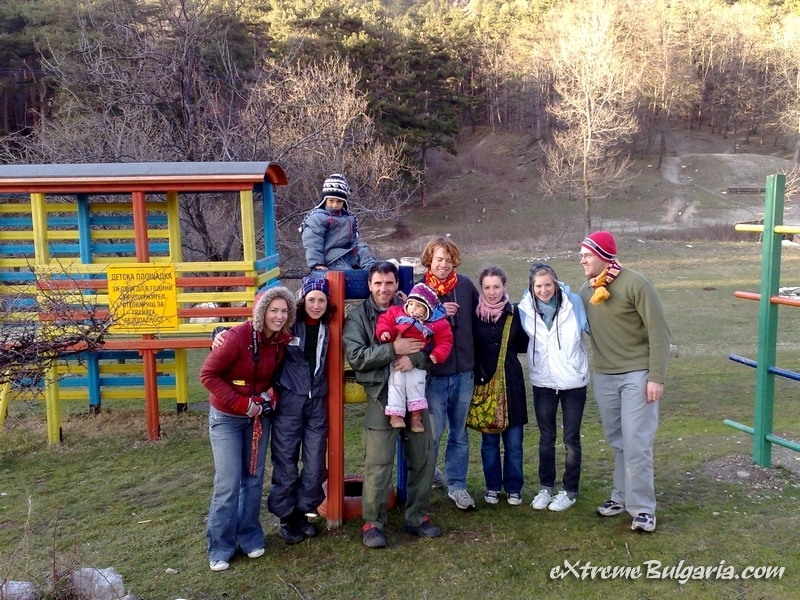 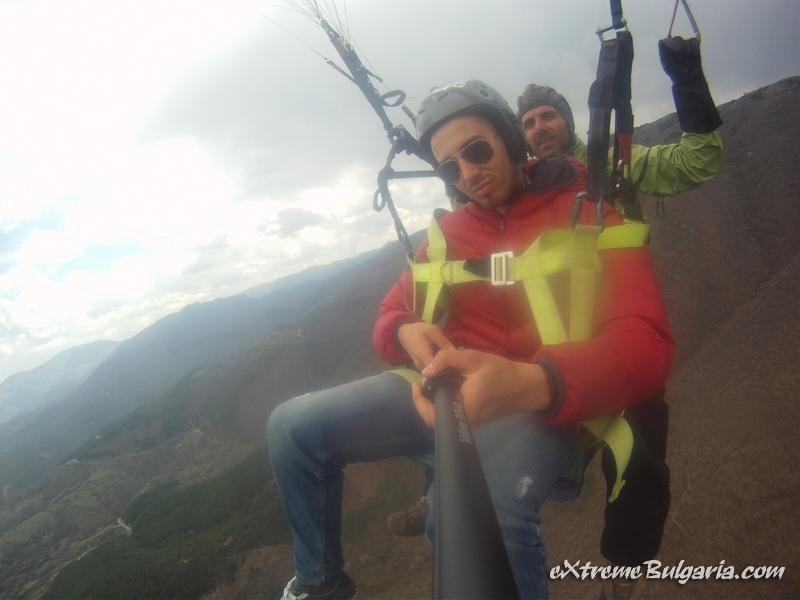 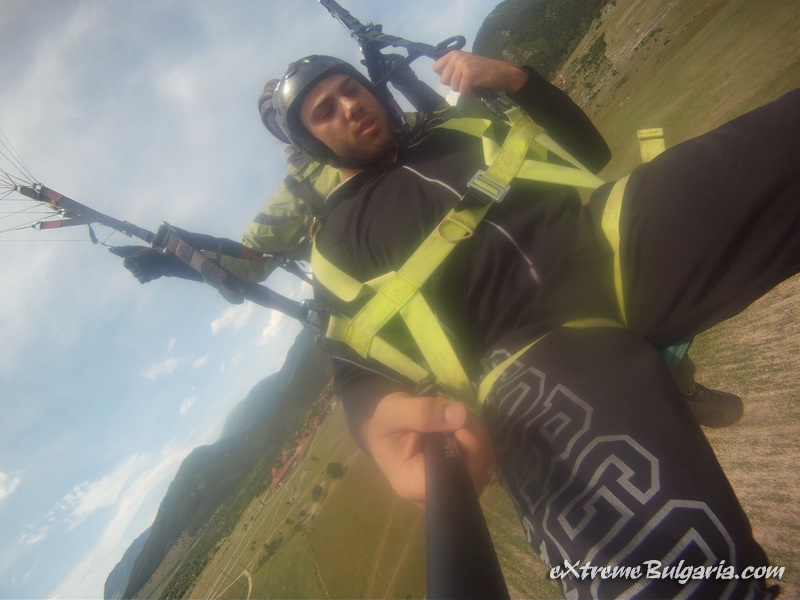 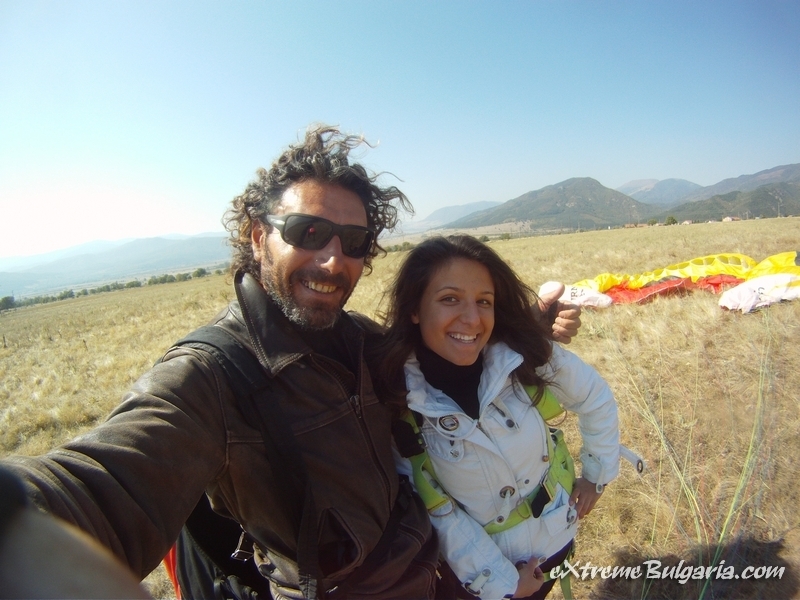 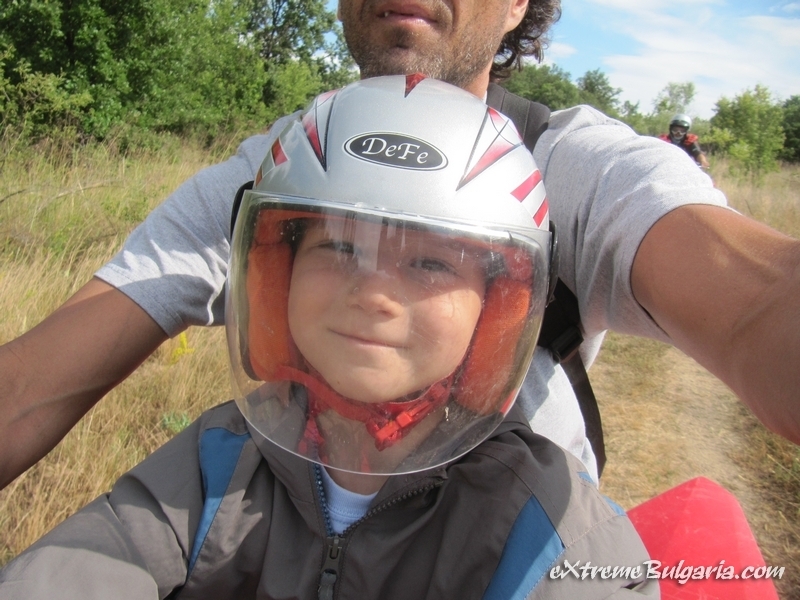 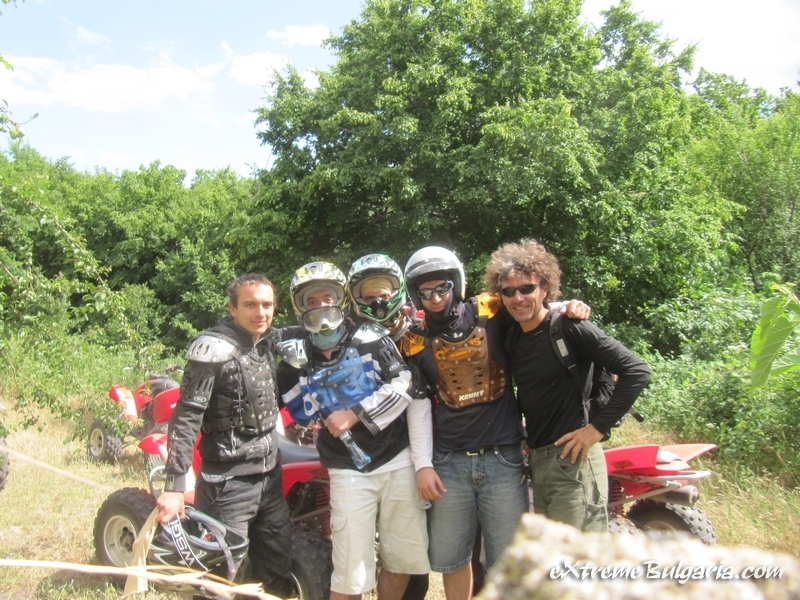 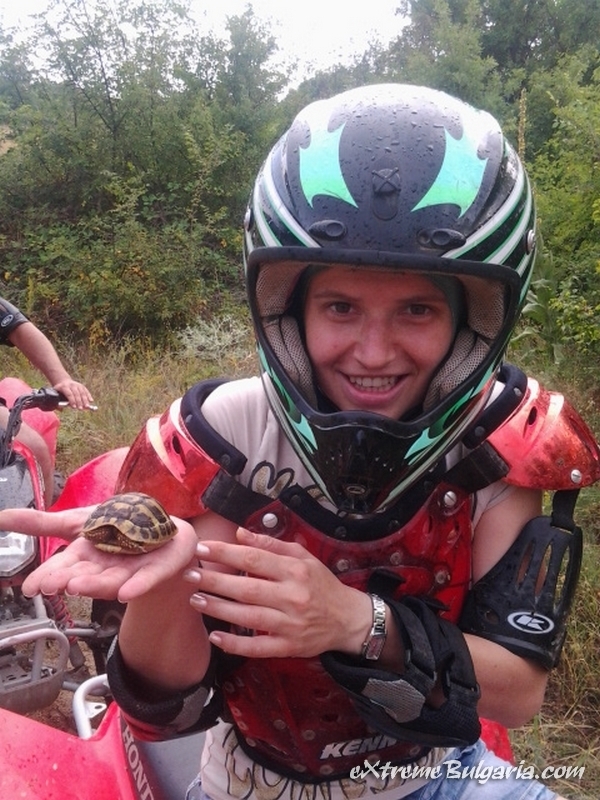 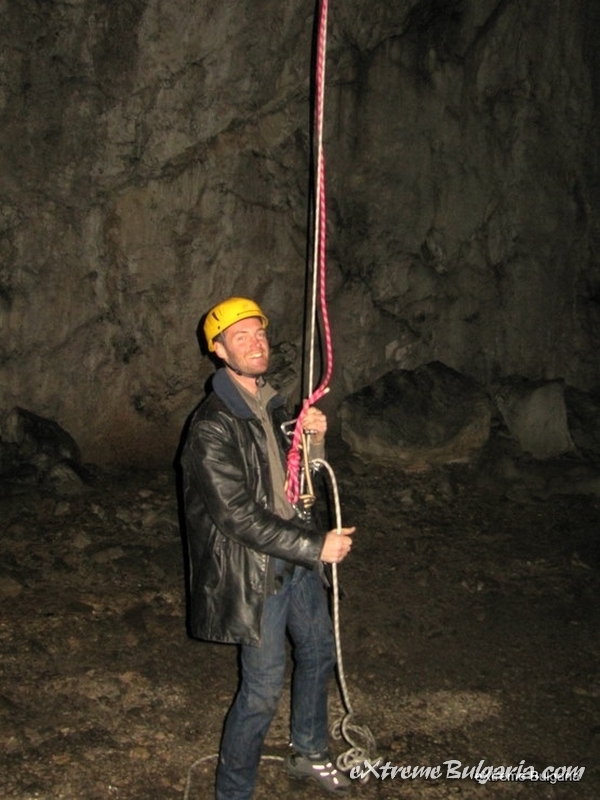 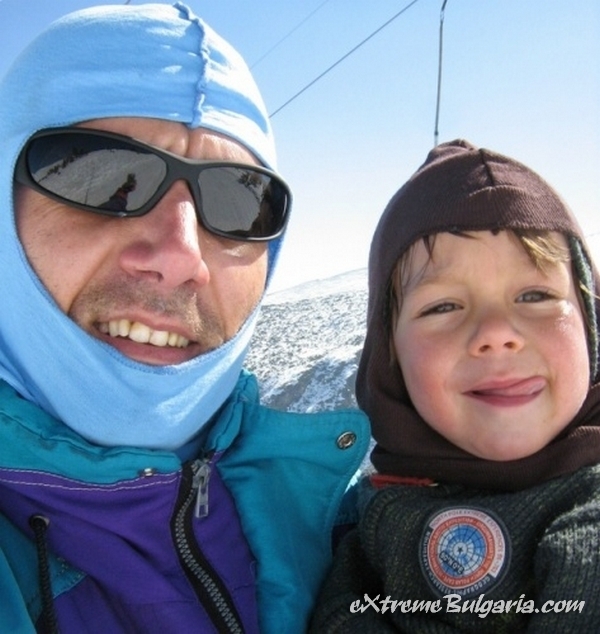 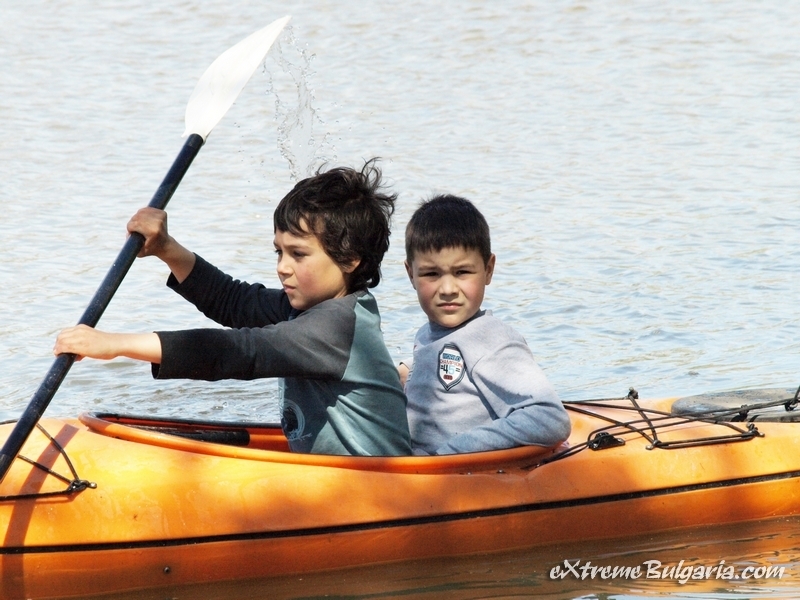 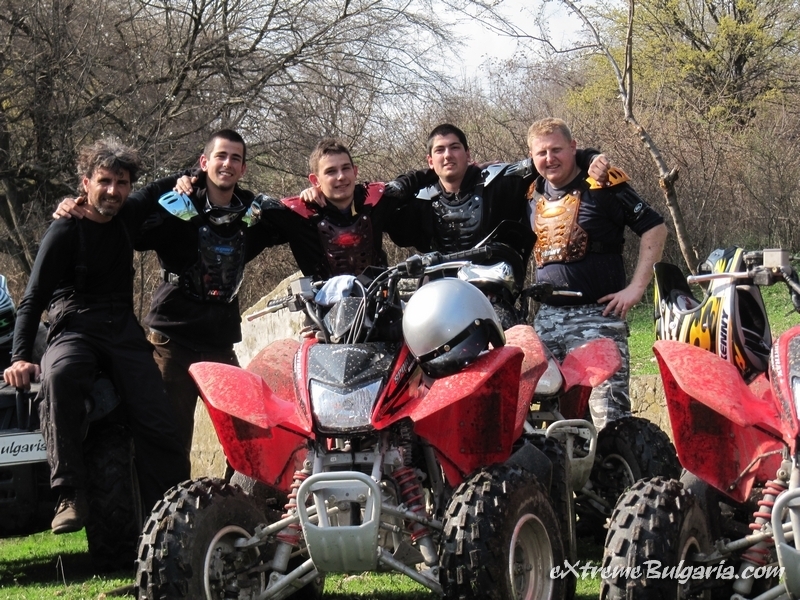 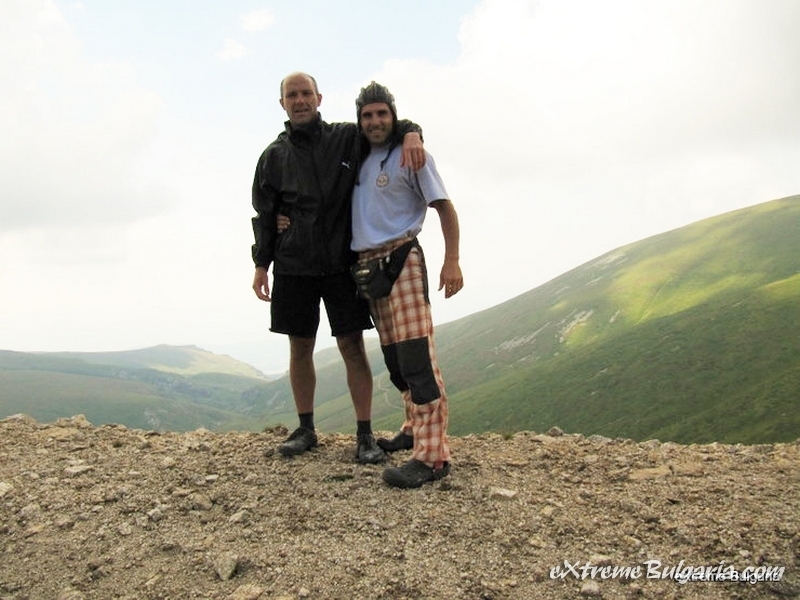 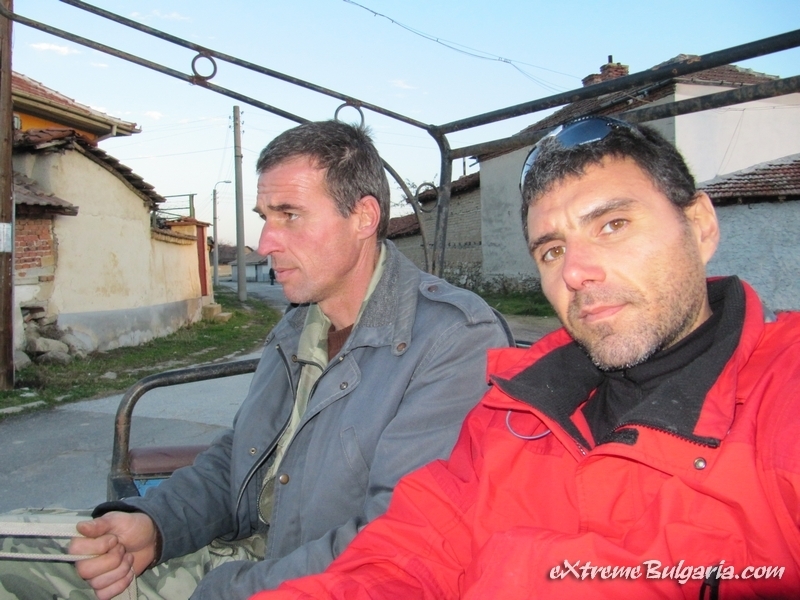 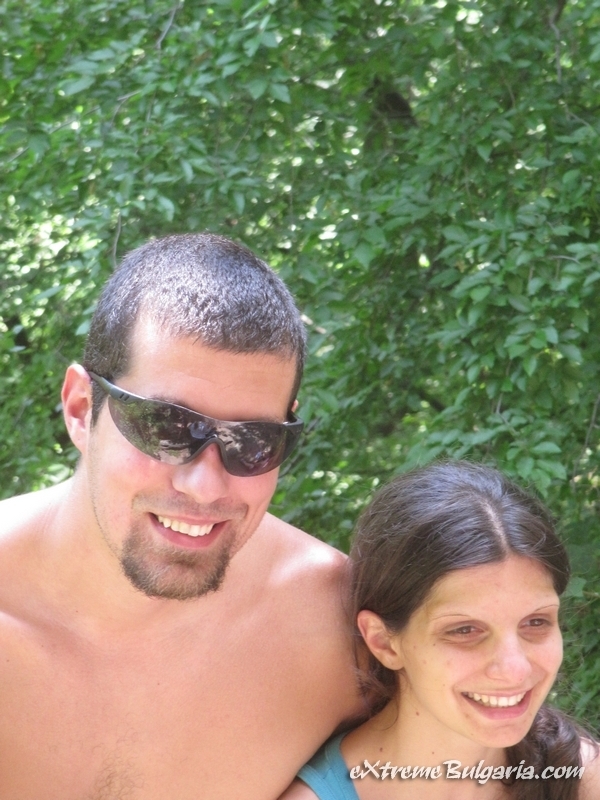 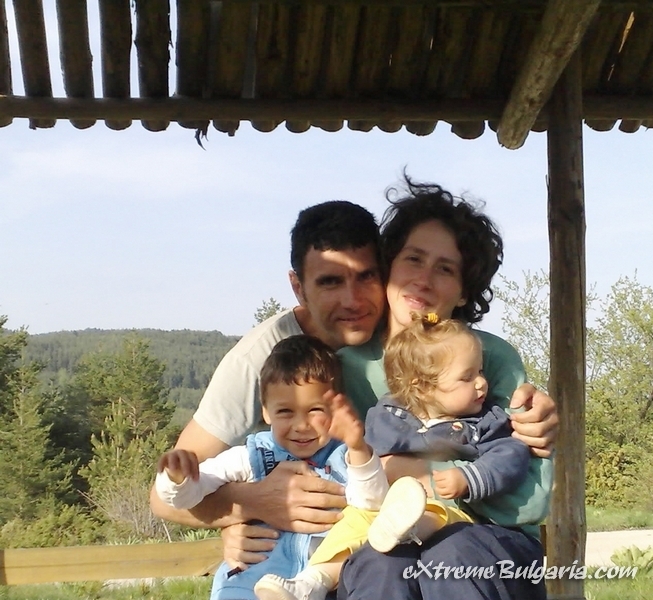 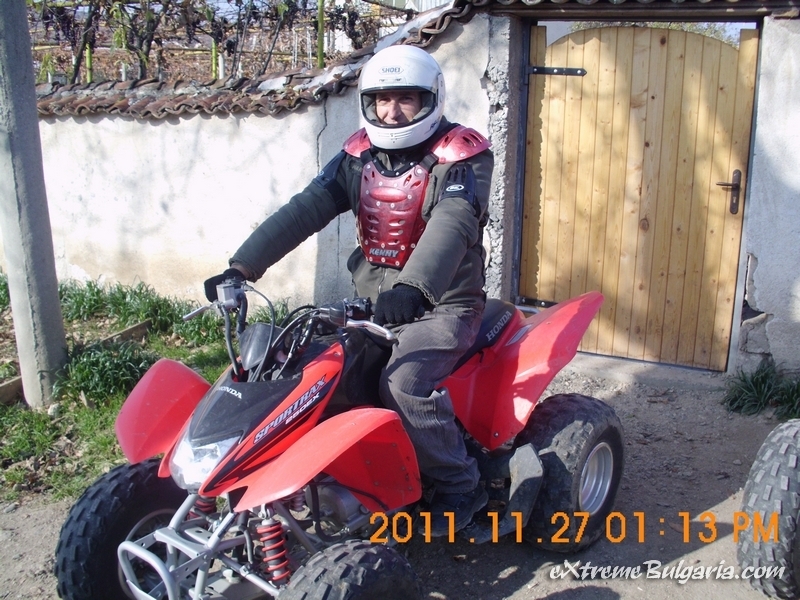 Extreme Bulgaria is a company that is all about the high-octane adventures. 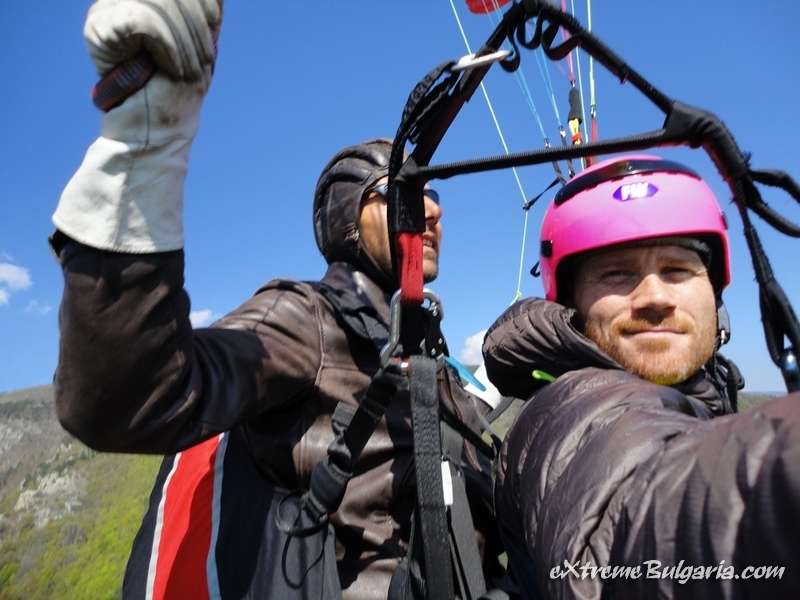 As you already read, its founder is an expert in every conceivable adrenaline-pumping sport there is (and a few additional ones, too), so you’ve got a pretty long list of activities to pick from. 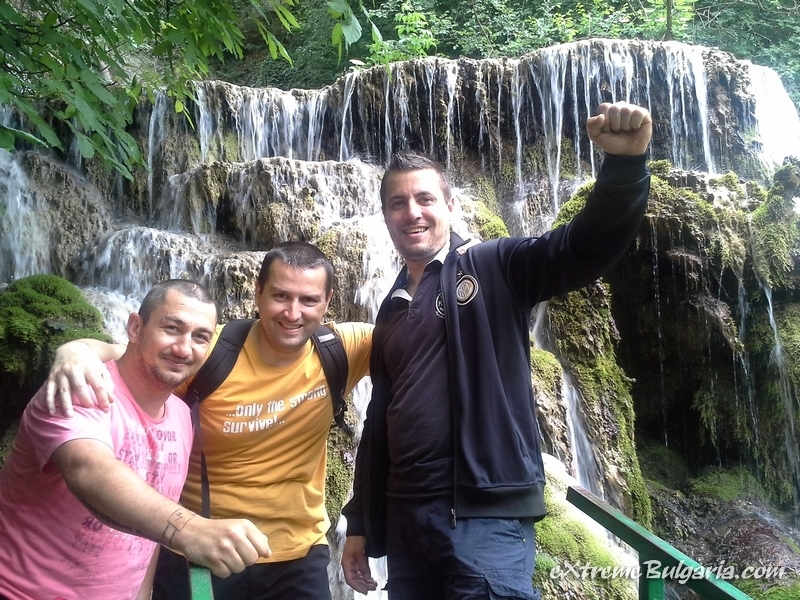 Naturally, you can combine them in whatever way you want and you can even customise entire itineraries. 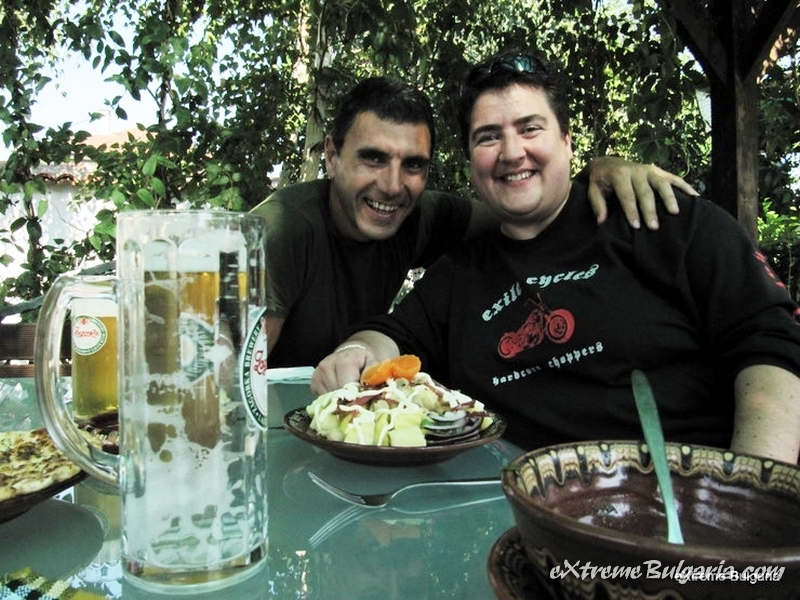 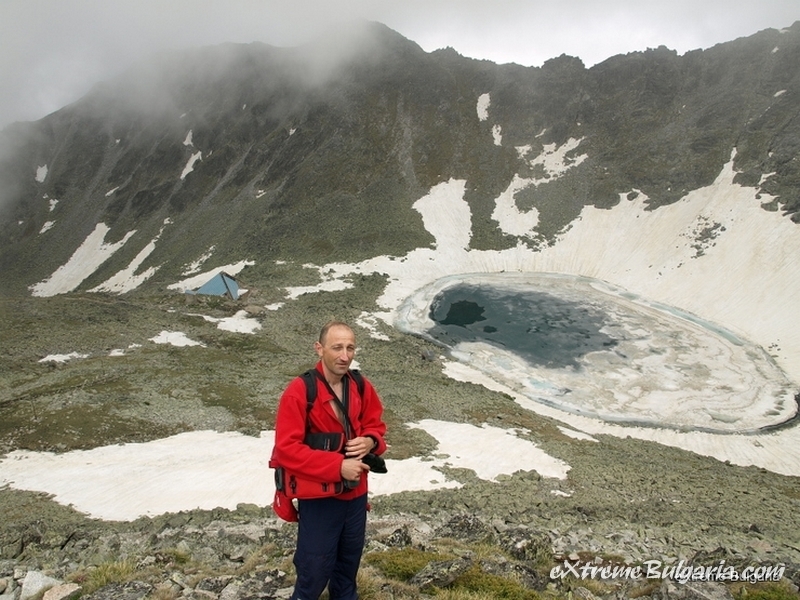 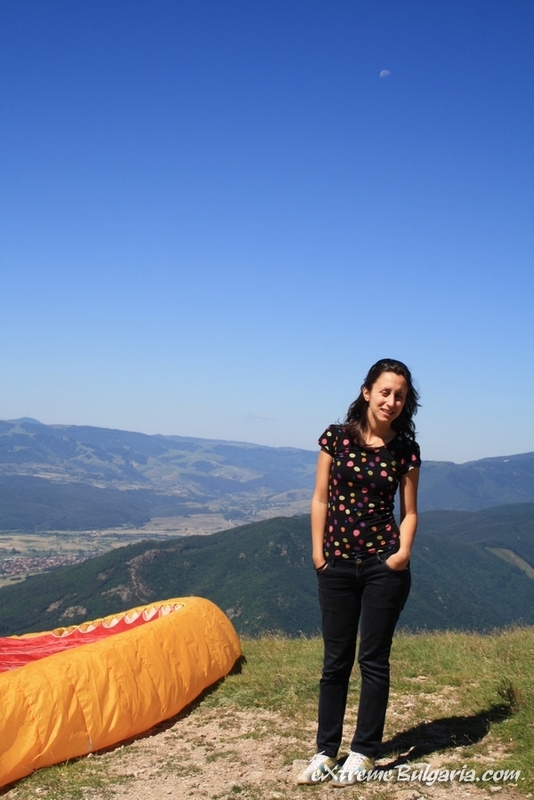 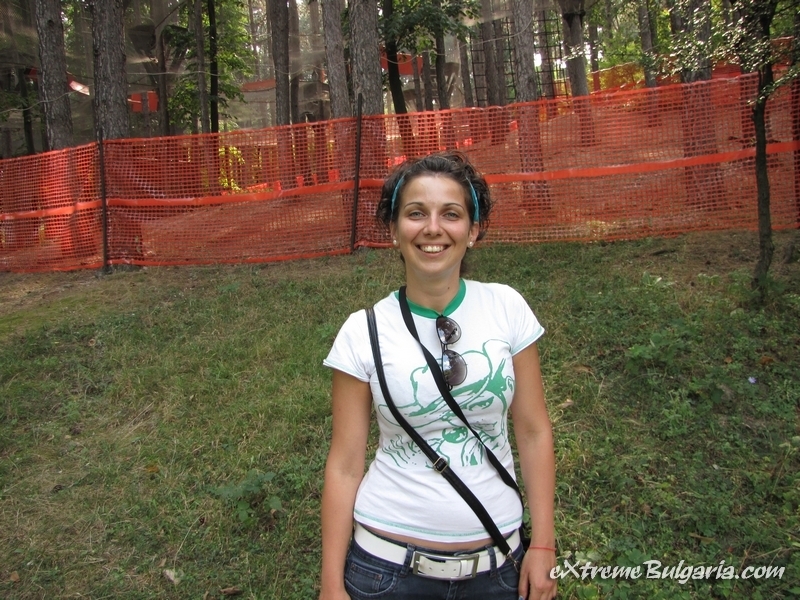 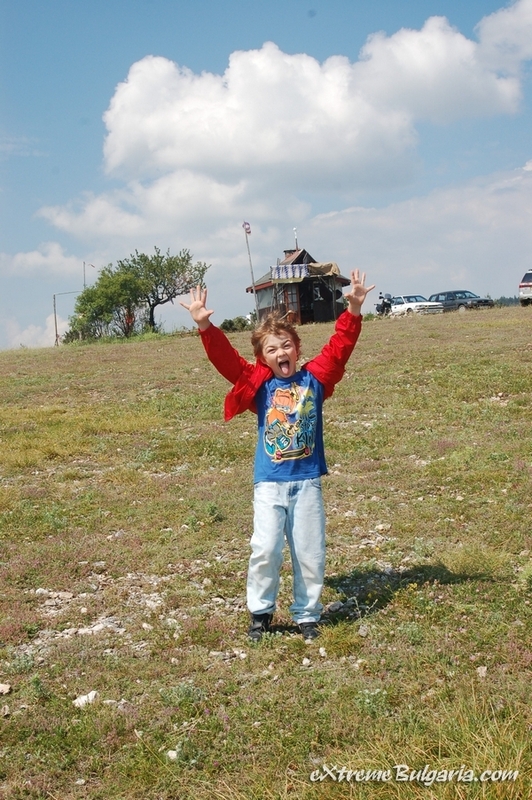 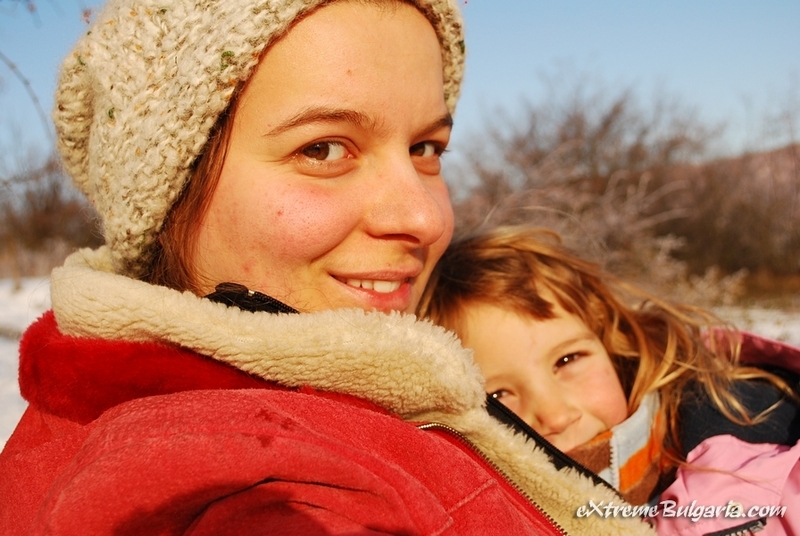 The one-week packages offered at Extreme Bulgaria deserve a special mention here. 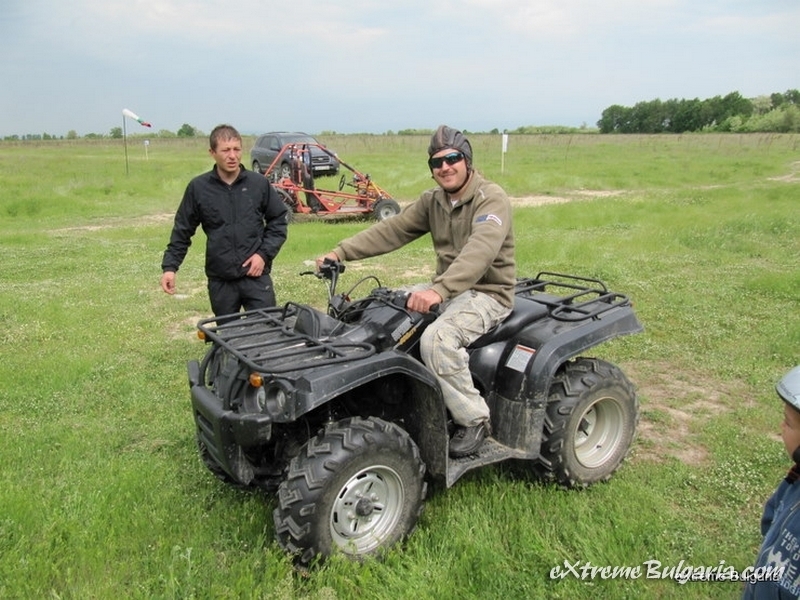 They are prepared individually for different clients and take into consideration several subjective factors, including the clients’ preferences and capabilities and the weather conditions in the country, for example. 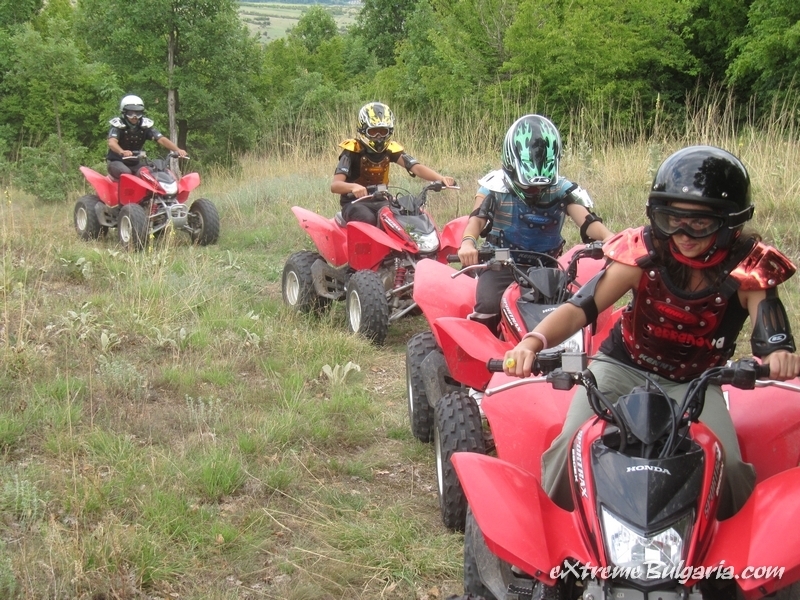 The best thing about those one-week tours, however, is that they allow people to immerse themselves completely in the magic realms of Bulgarian nature and culture and spend a nice varied, adventure-filled holiday. 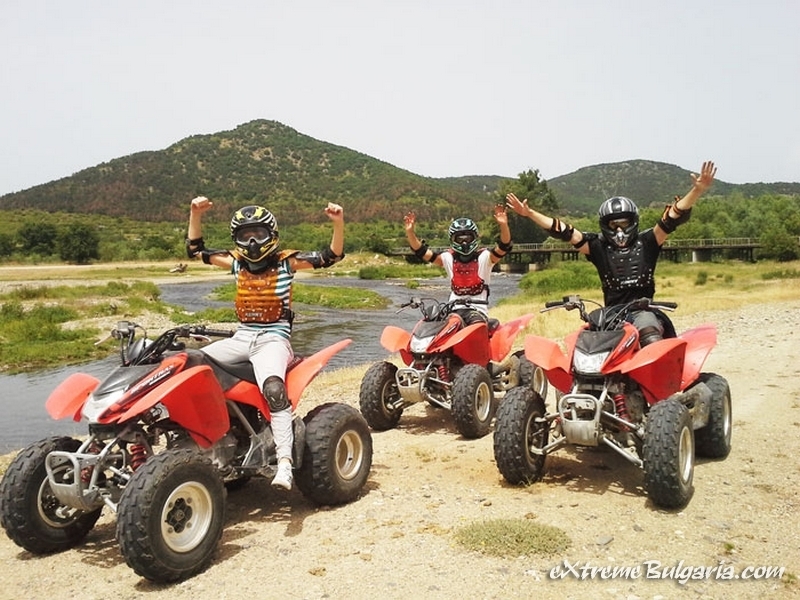 Balance is the key to their success: the fast-paced wild activities are perfectly mixed with relaxing episodes in cool spas and traditional taverns and informative walking tours around some of the country’s most famous landmarks. 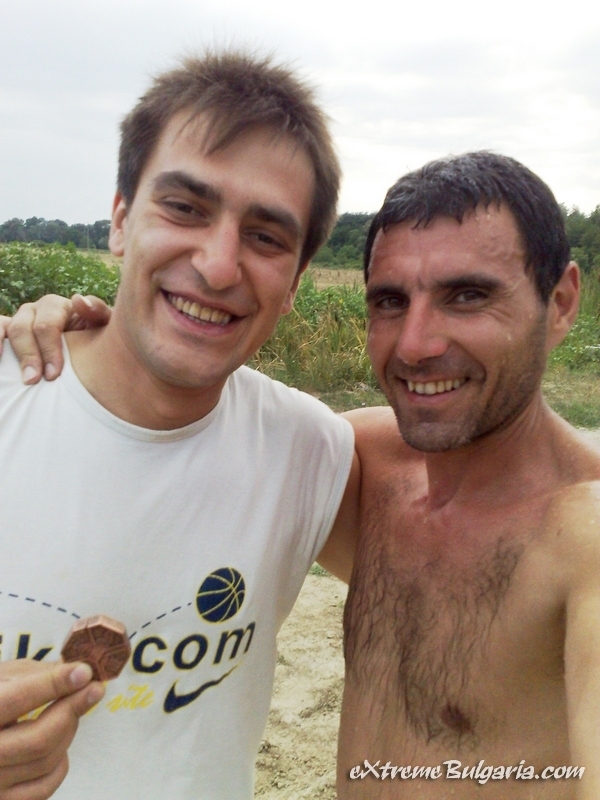 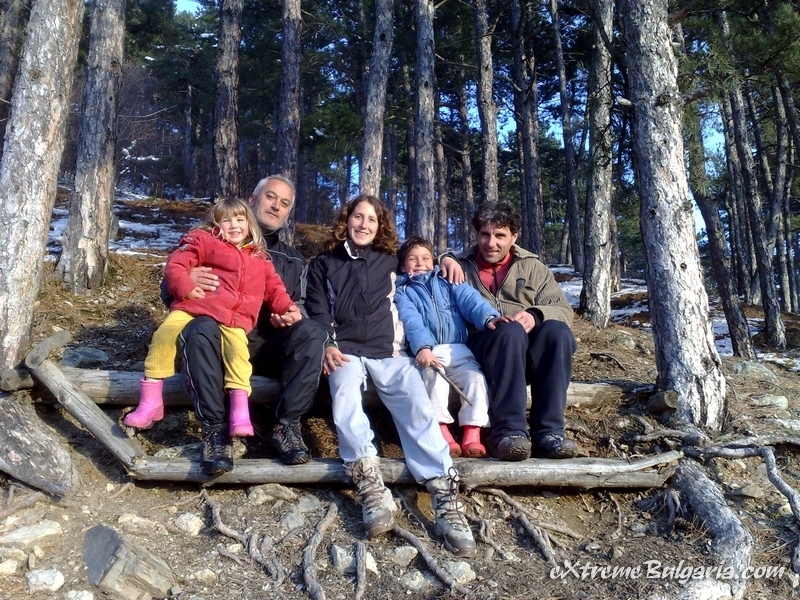 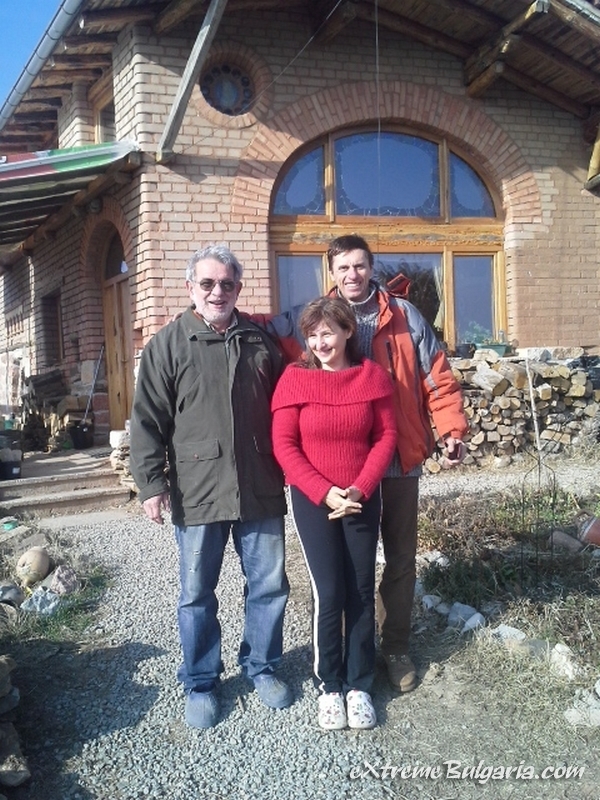 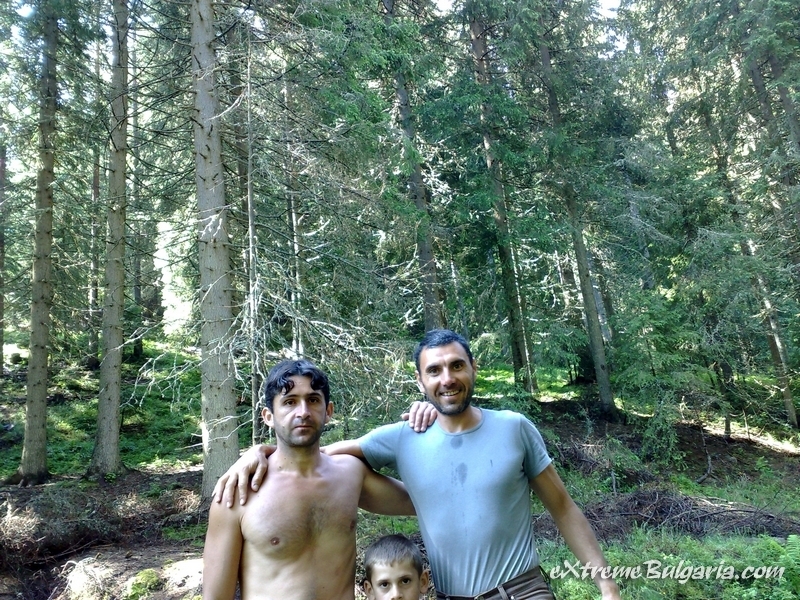 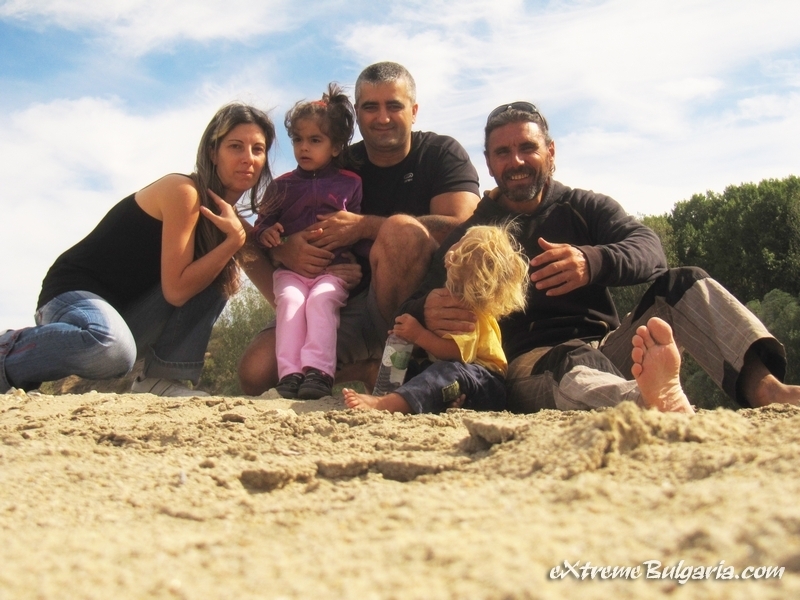 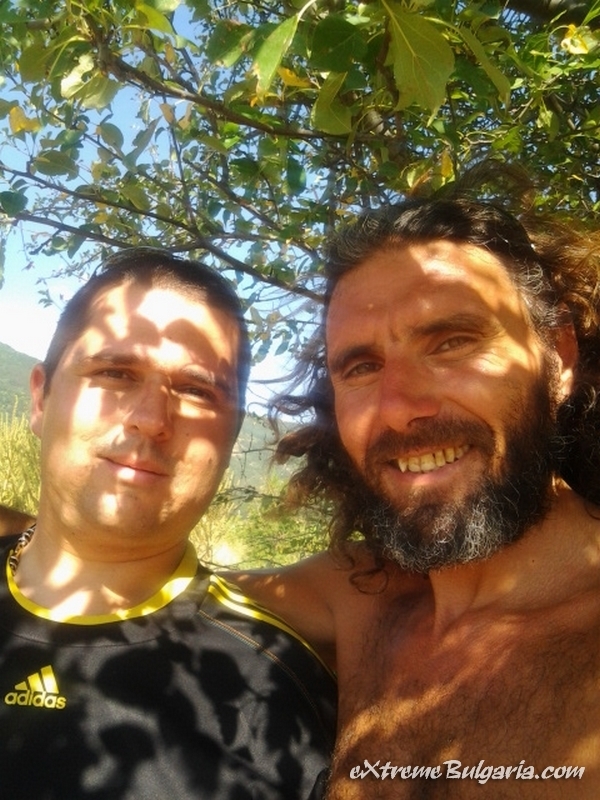 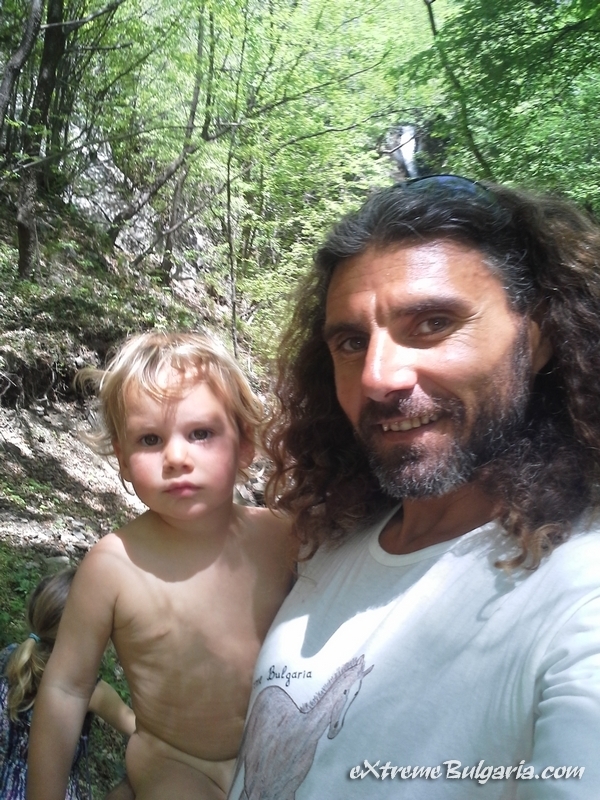 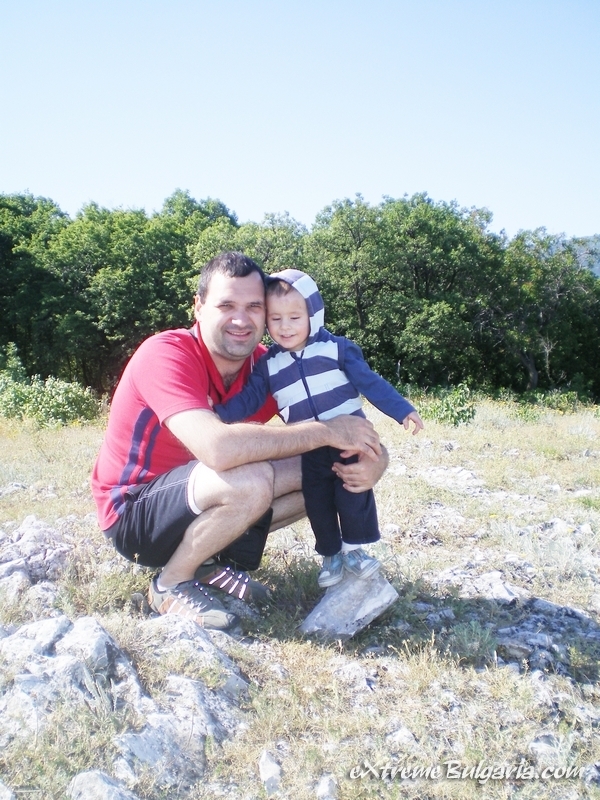 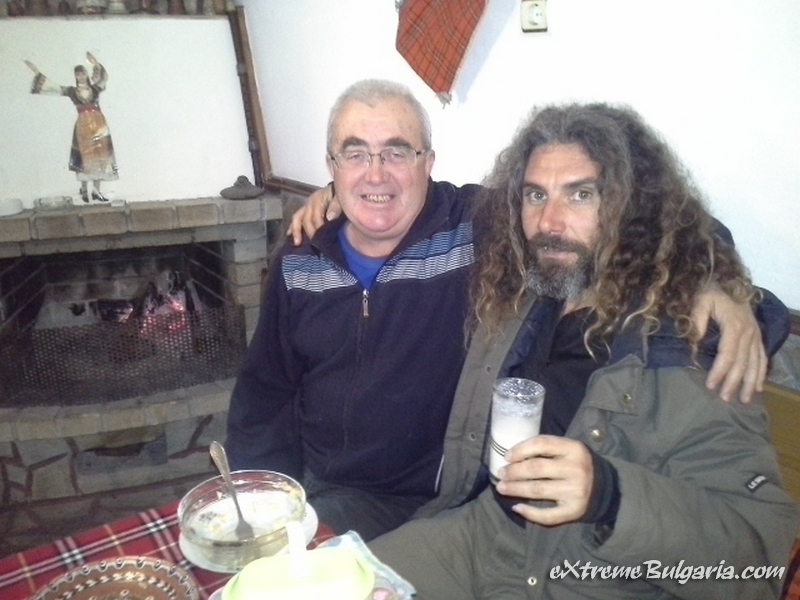 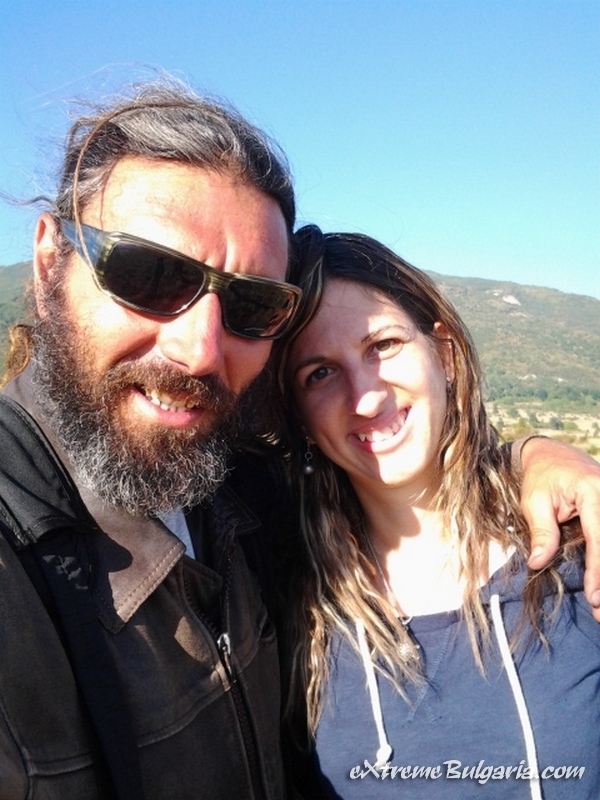 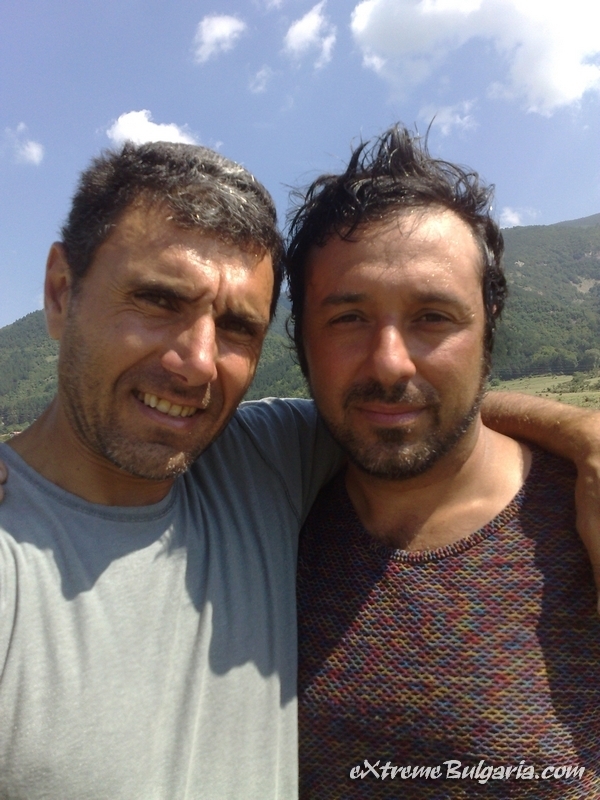 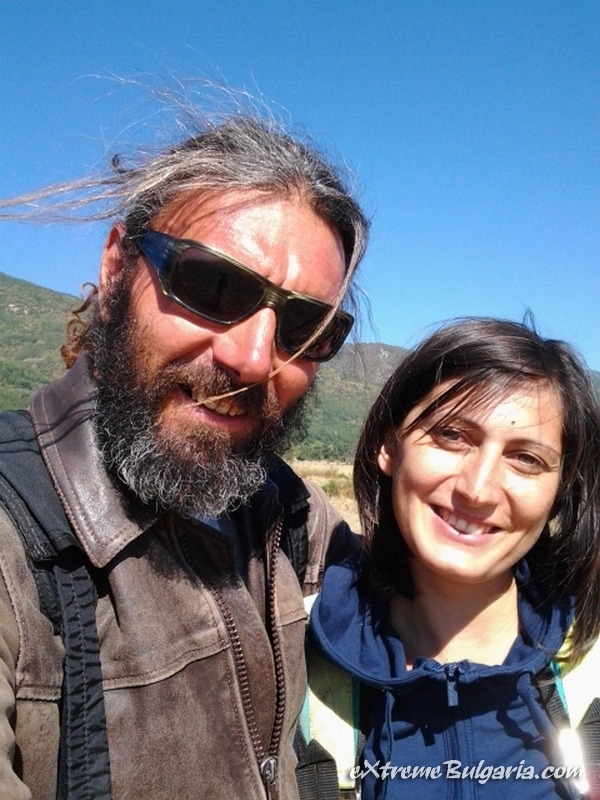 The dedicated fans of the countryside are also more than welcome to visit Atanas in Ivan Vazovo Village near Plovdiv where he lives together with his family. 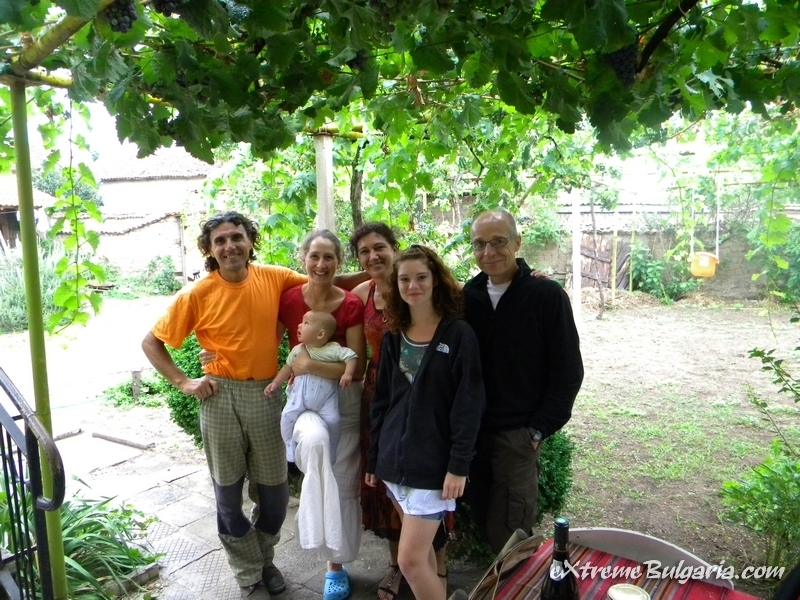 There they can learn a lot about rural traditions and habits and the perks of living far away from the large crowded urban centres. 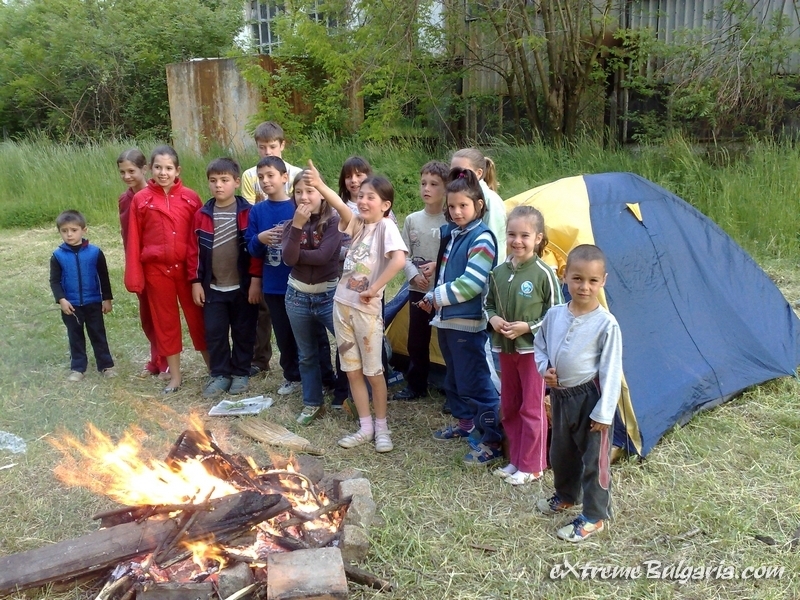 Of course, they can engage in several fun activities such as horseback riding and beekeeping as well. 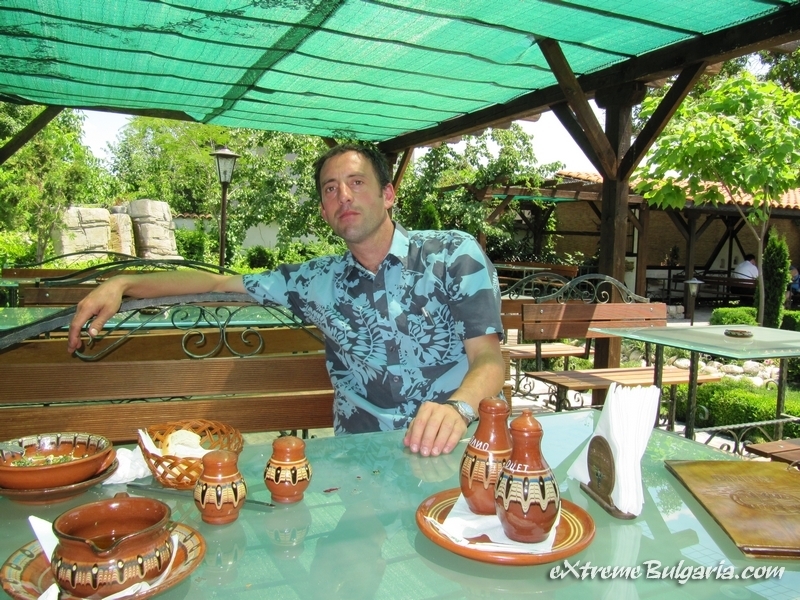 The last important point that has to be made here is that Extreme Bulgaria is not exactly a one-man show. 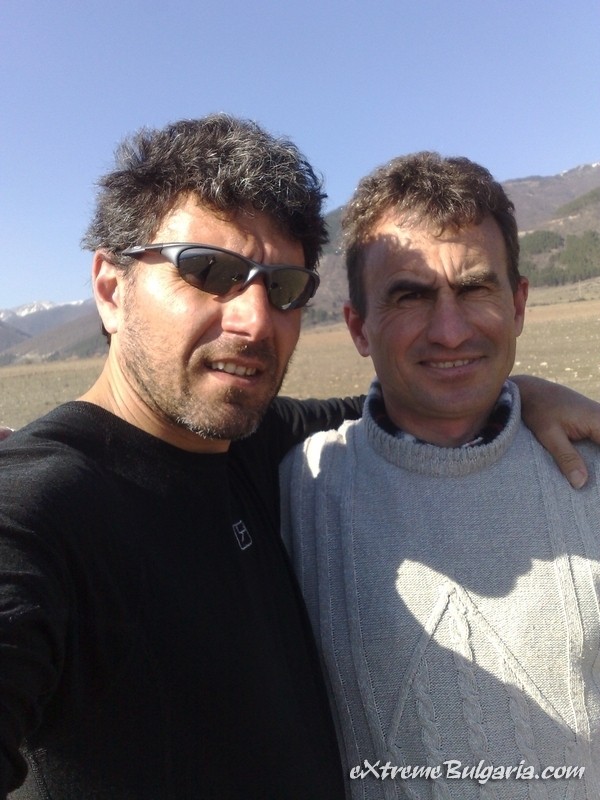 Atanas Koev has managed to put together a great squad of professionals who help him with all his endeavours. 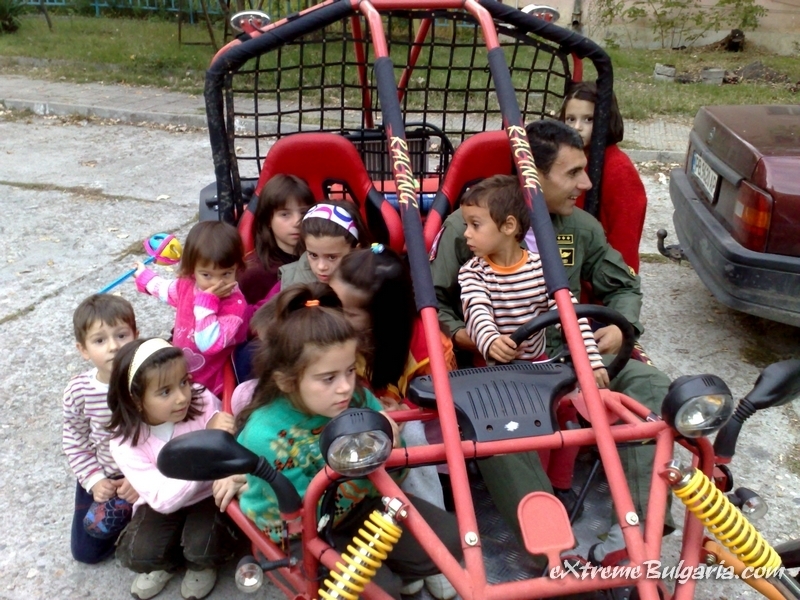 They are well trained, disciplined, and have a nice sense of humor. 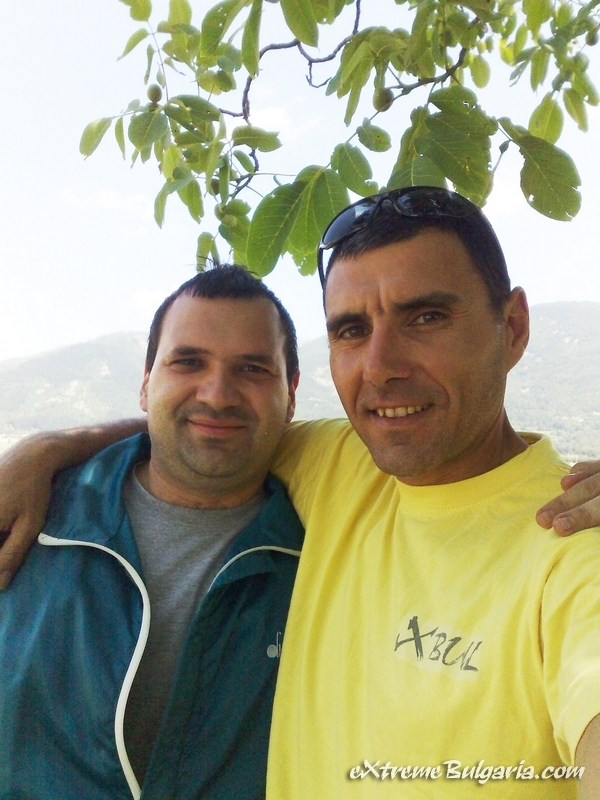 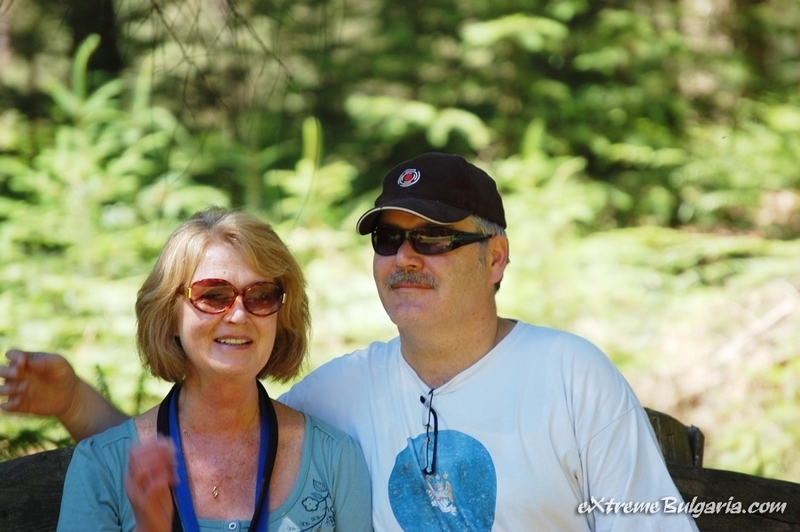 Their devotion is outstanding and their approach to clients is always personal. 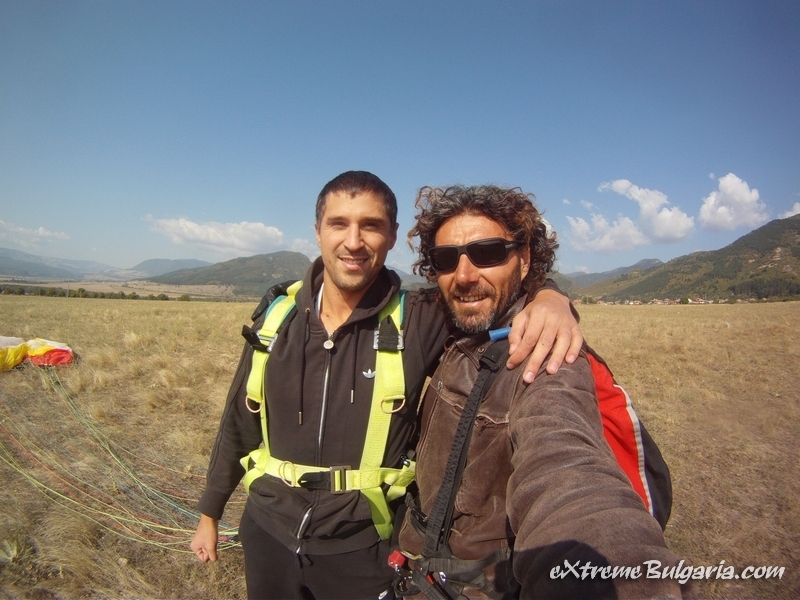 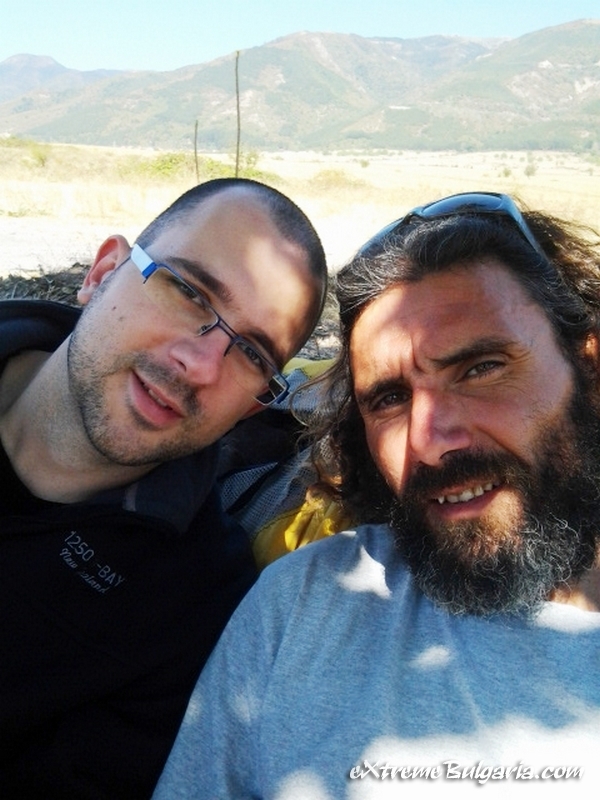 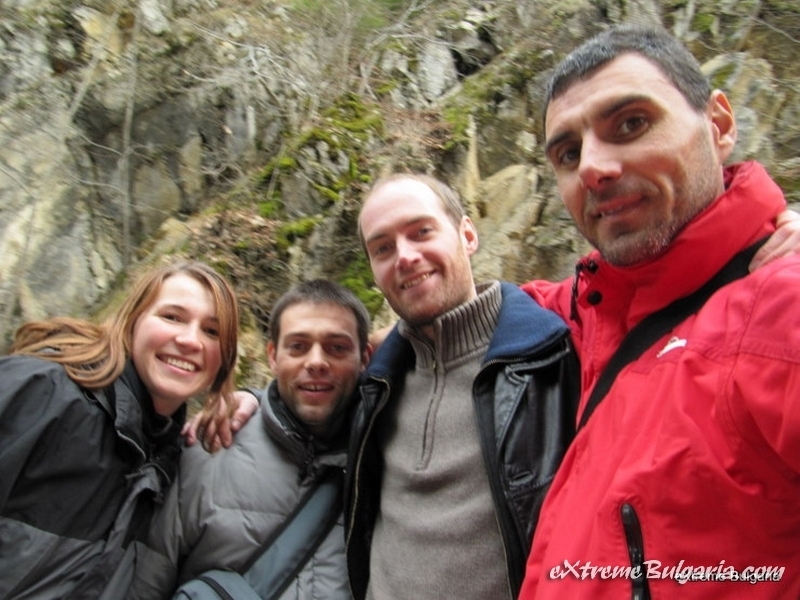 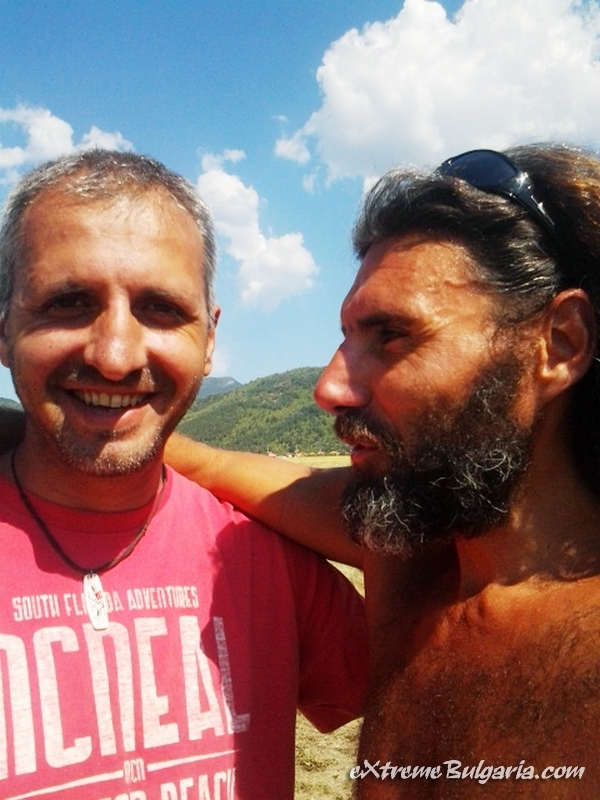 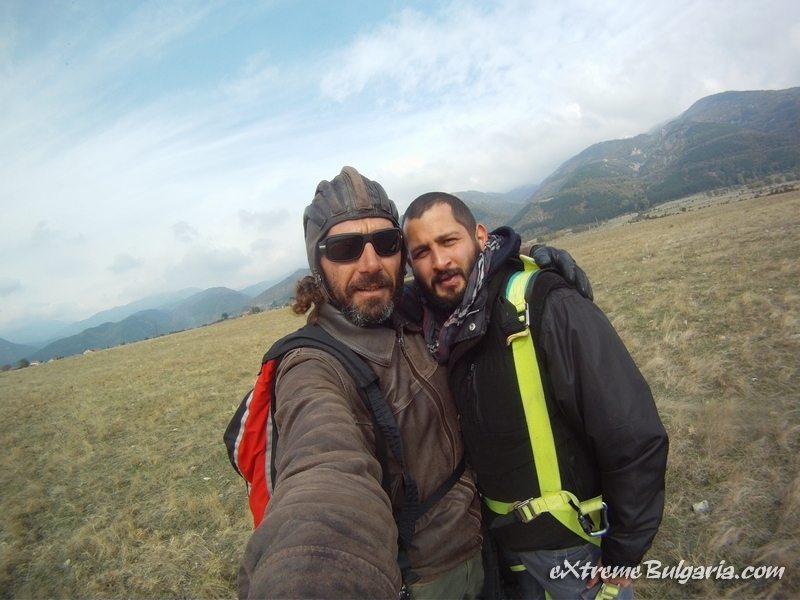 Now there is just one last thing you have to remember: Extreme Bulgaria means not only world-class services and amazing adventures but true friendship as well. 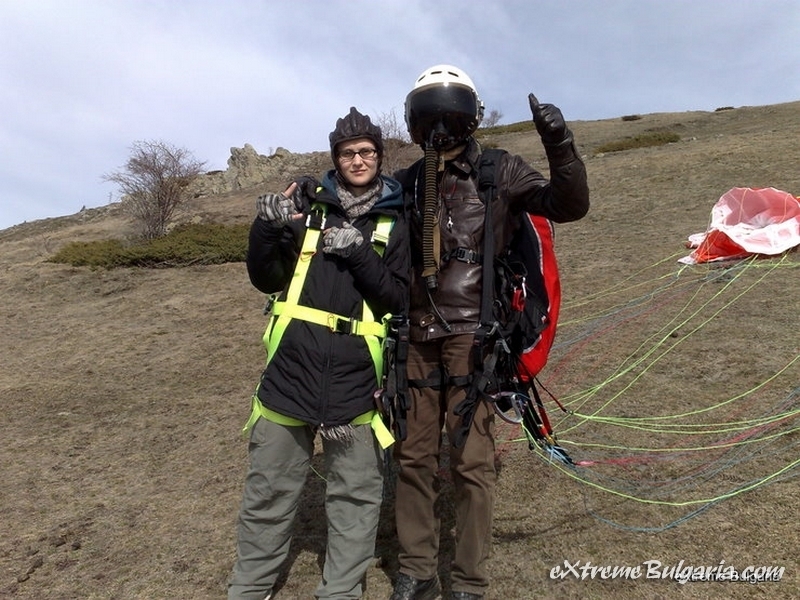 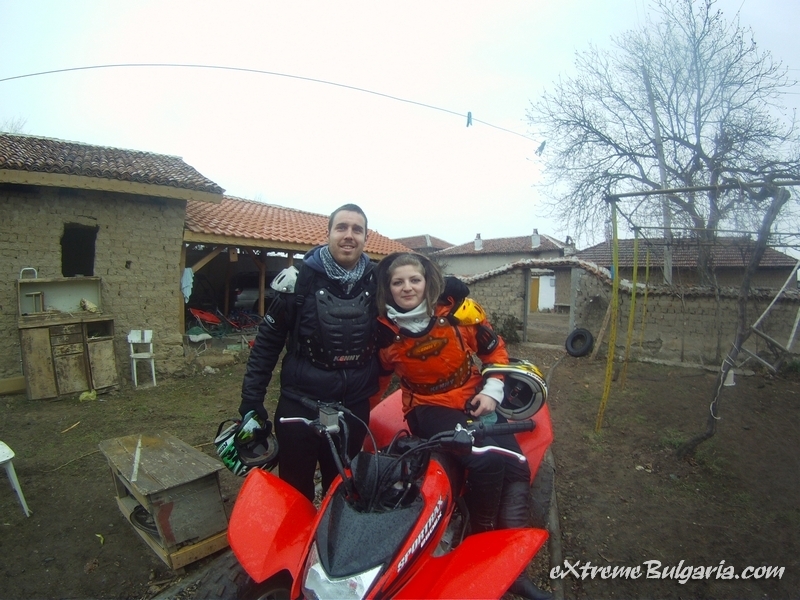 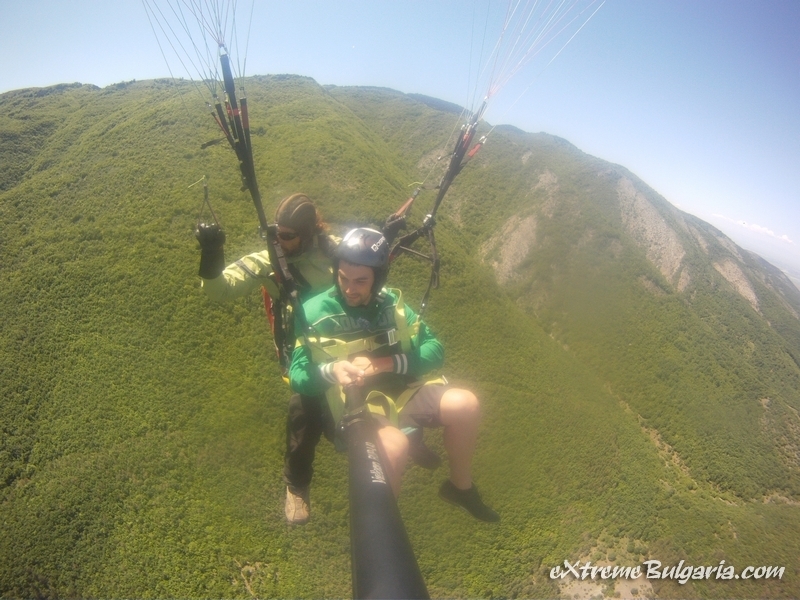 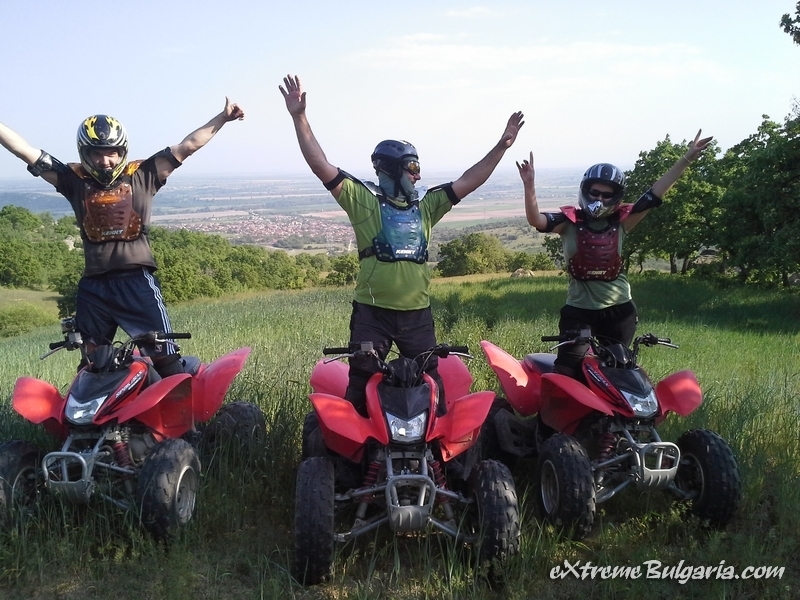 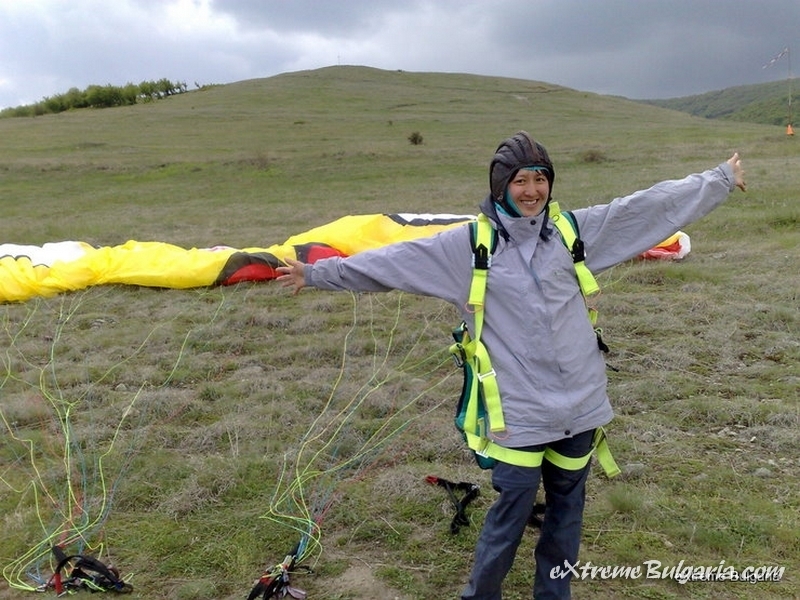 More ABOUT "CLUB EXTREME BULGARIA"
Welcome to Bulgaria season 2019! 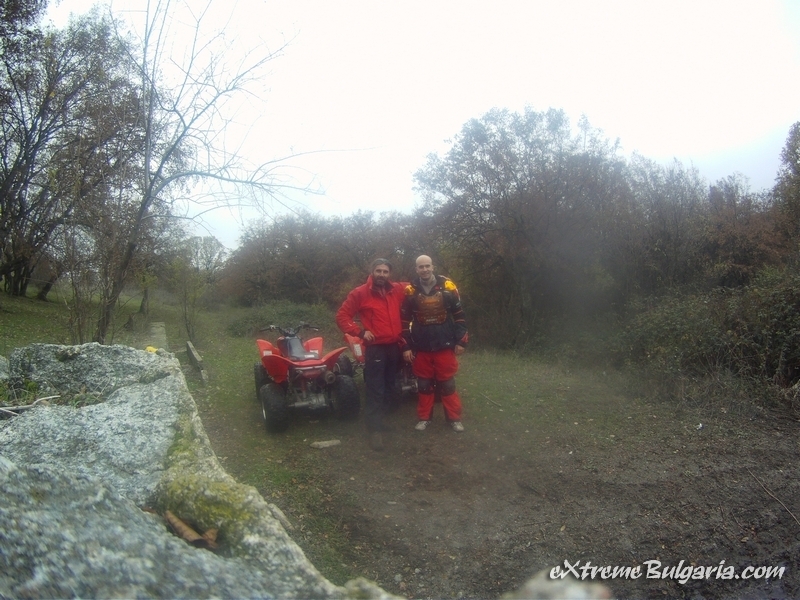 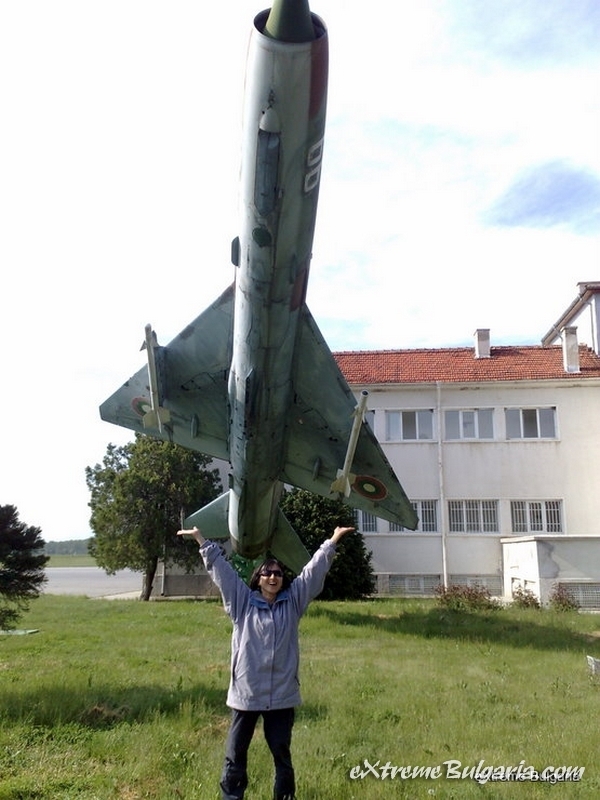 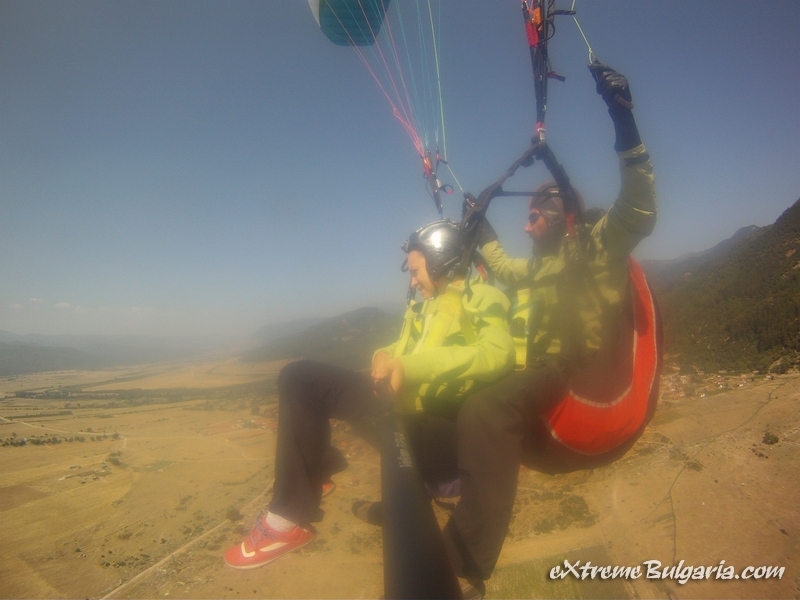 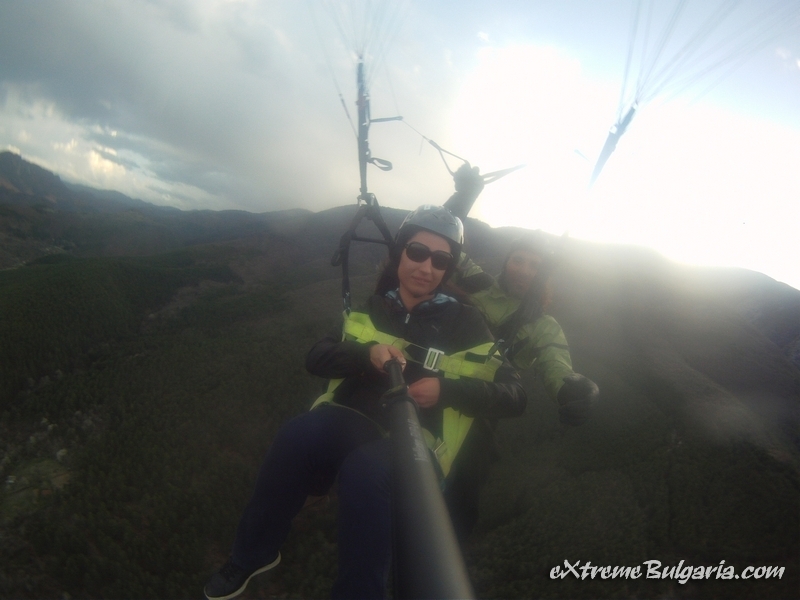 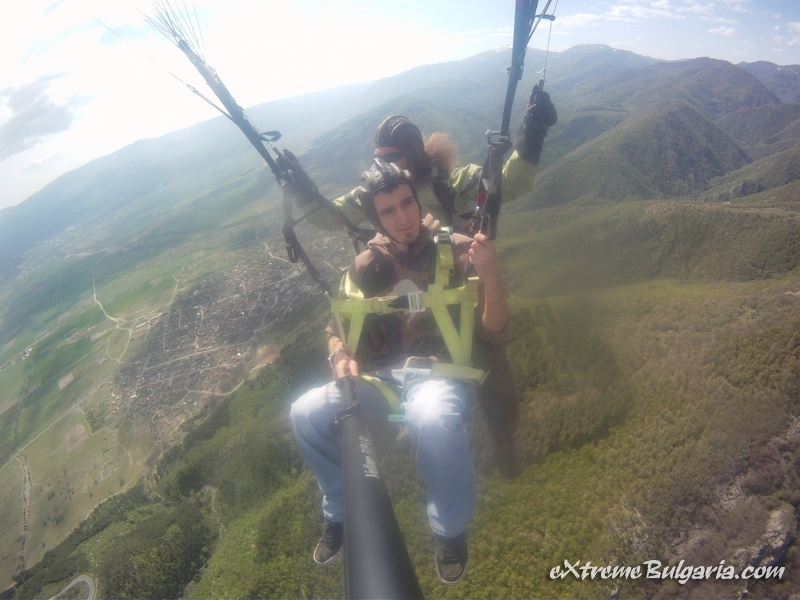 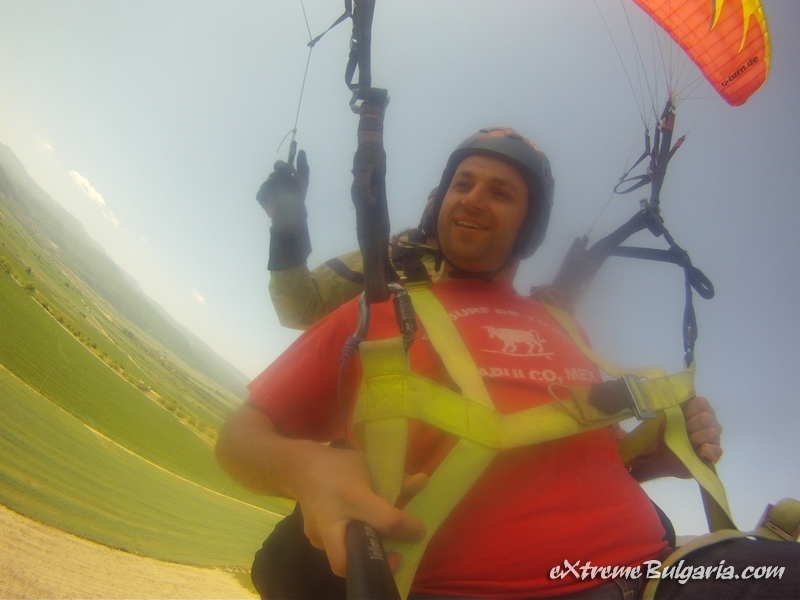 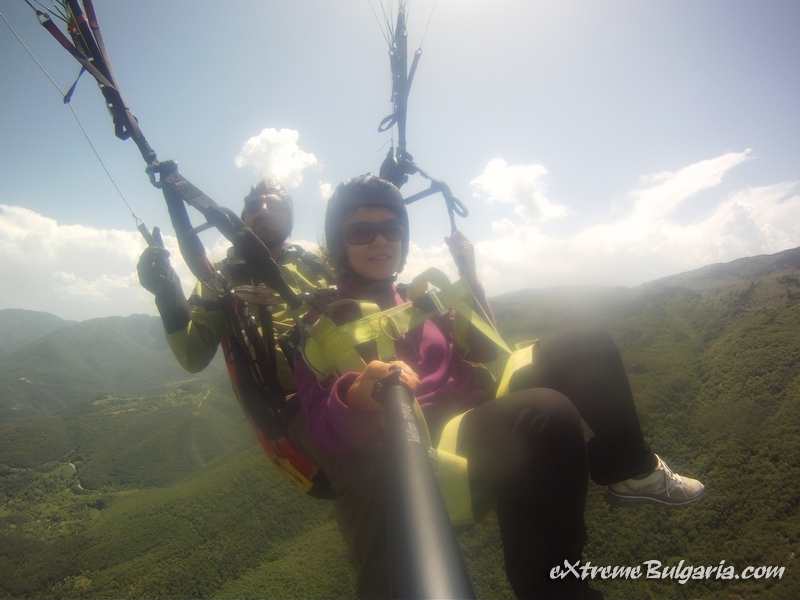 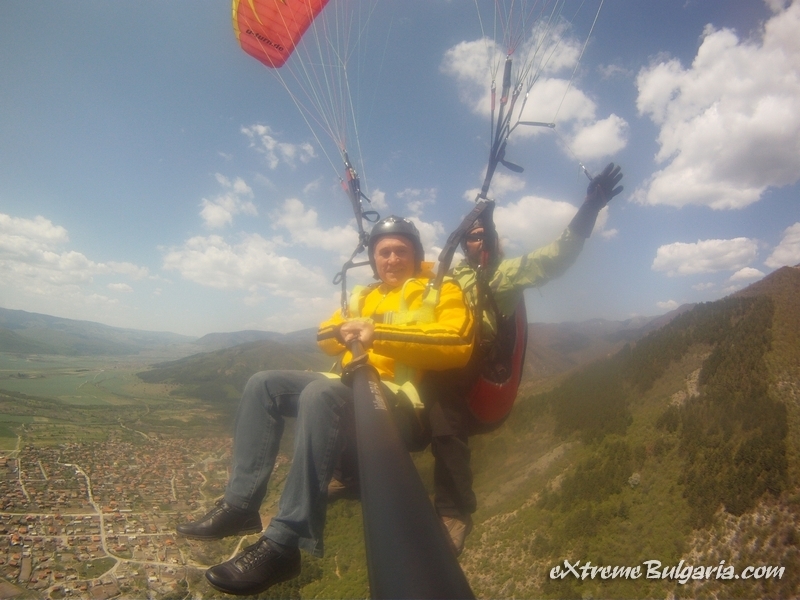 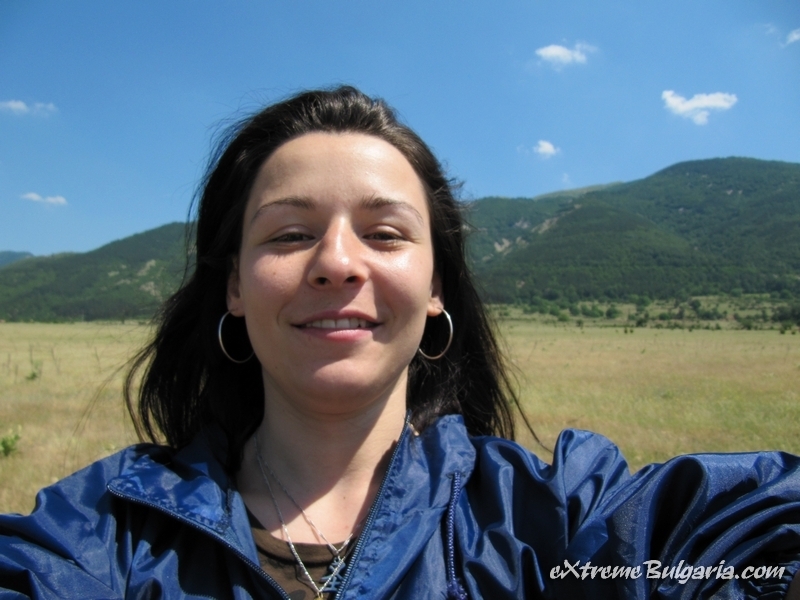 eXtreme Bulgaria present - XDay! 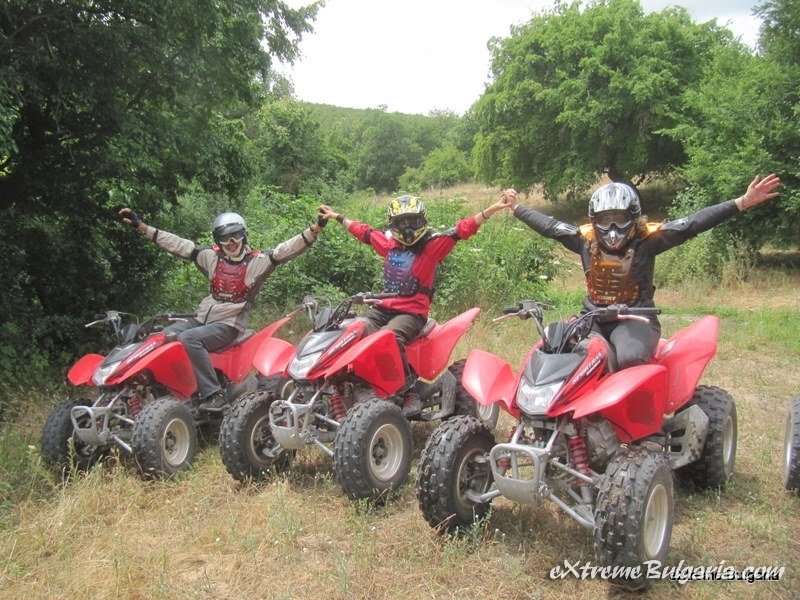 Extreme Bulgaria Club offers a number of custom-tailored holidays. 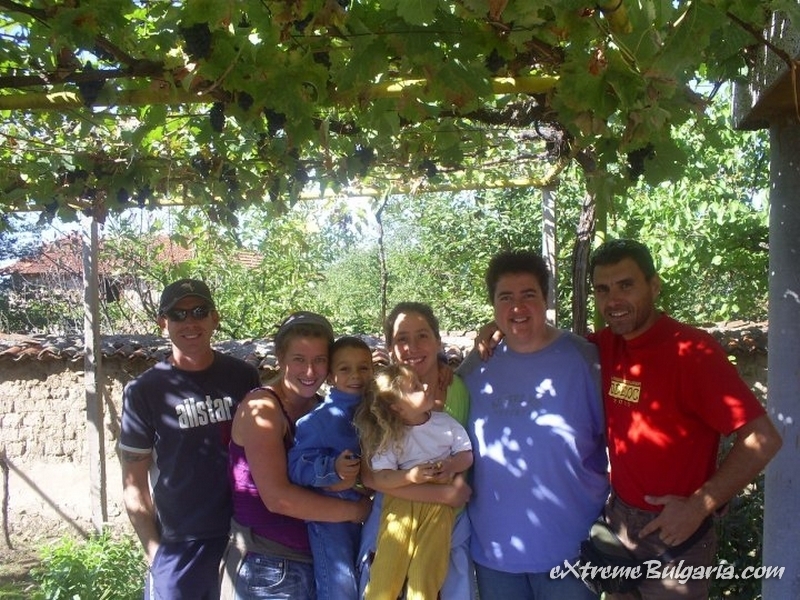 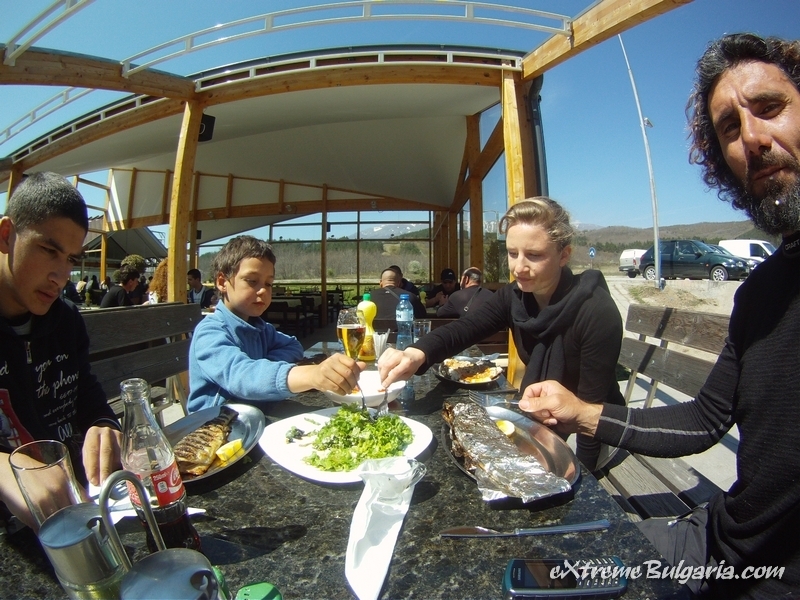 Within our eXtreme-Week or eXtreme-Day you can build an unforgettable week according to your own preferences, and with the exclusive ability to enjoy Bulgarian cuisine and hospitality. 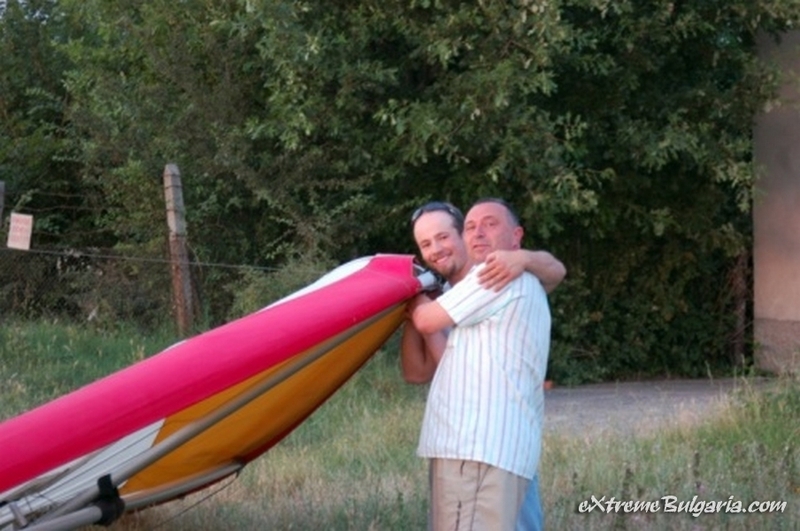 Our company is always ready to help you! 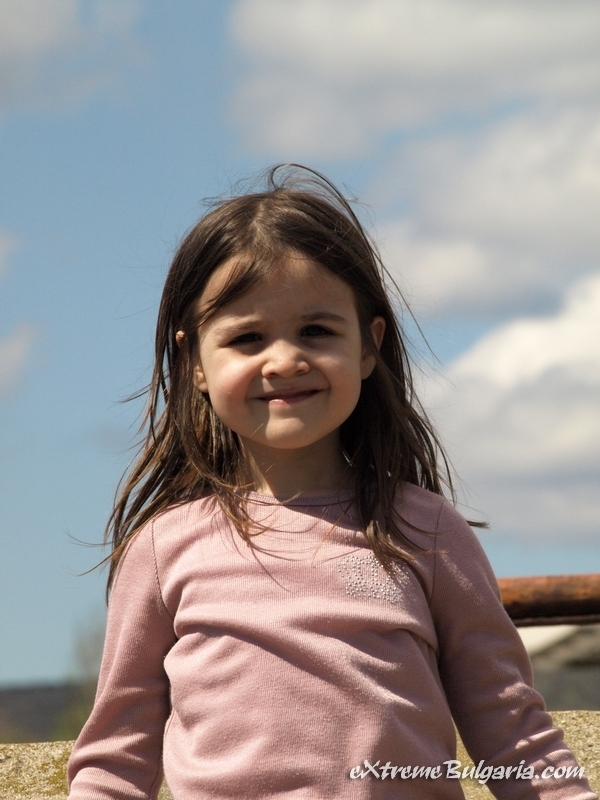 CONTACT FORM. 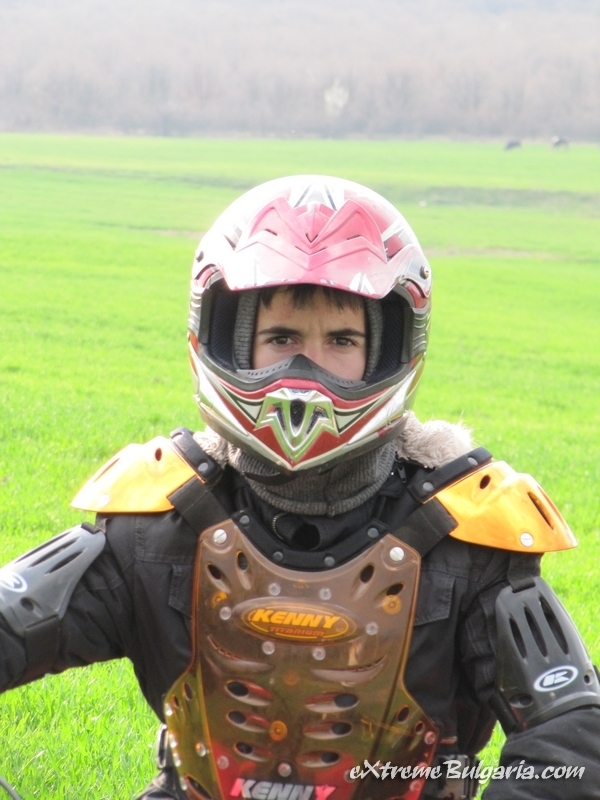 Send an email.